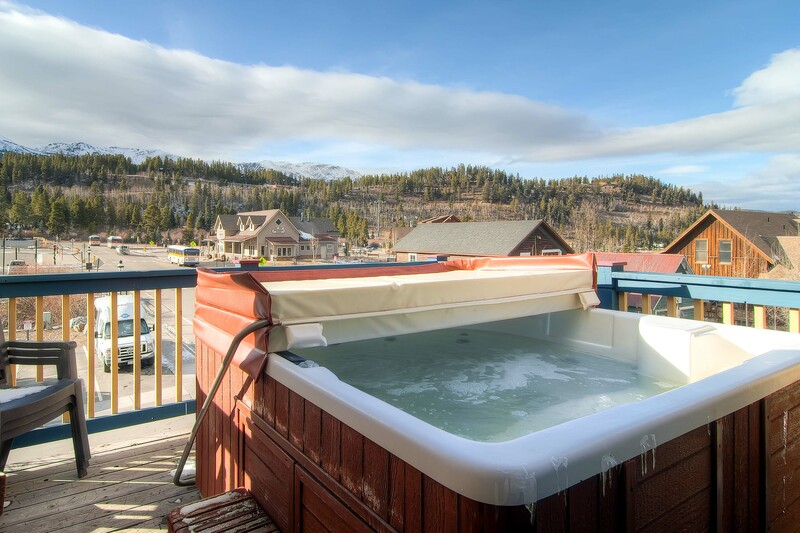 Private Hot Tub & Sauna! 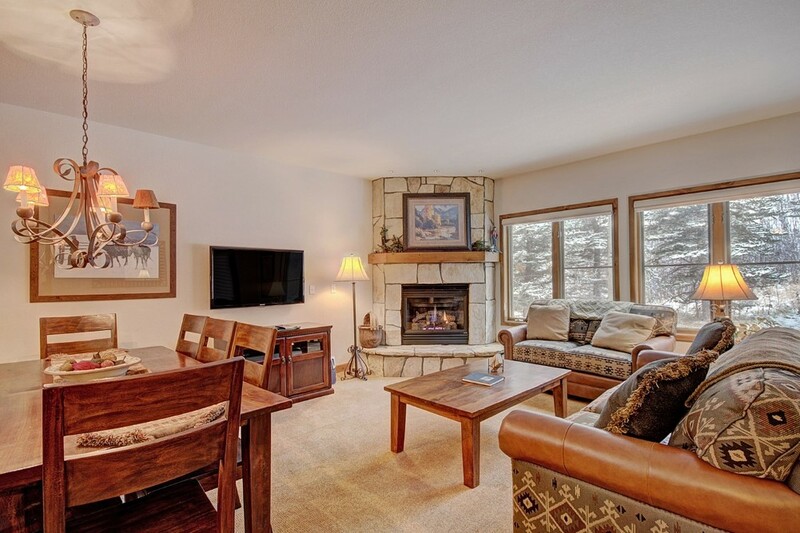 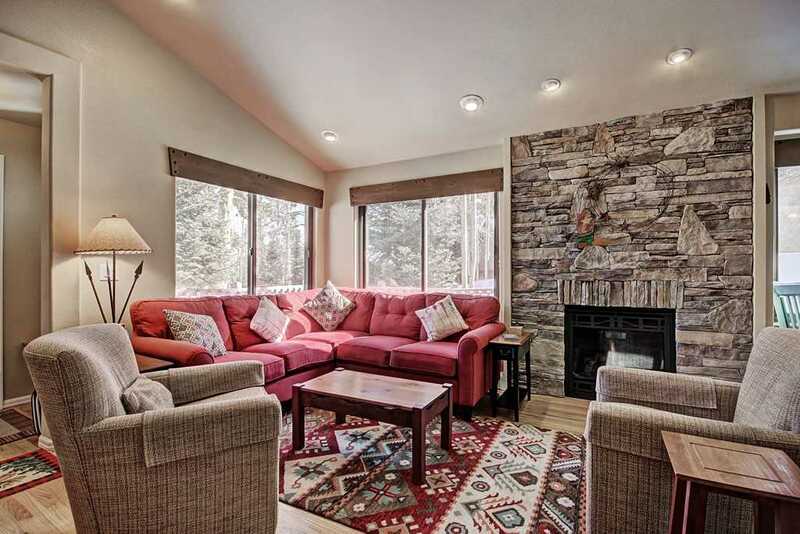 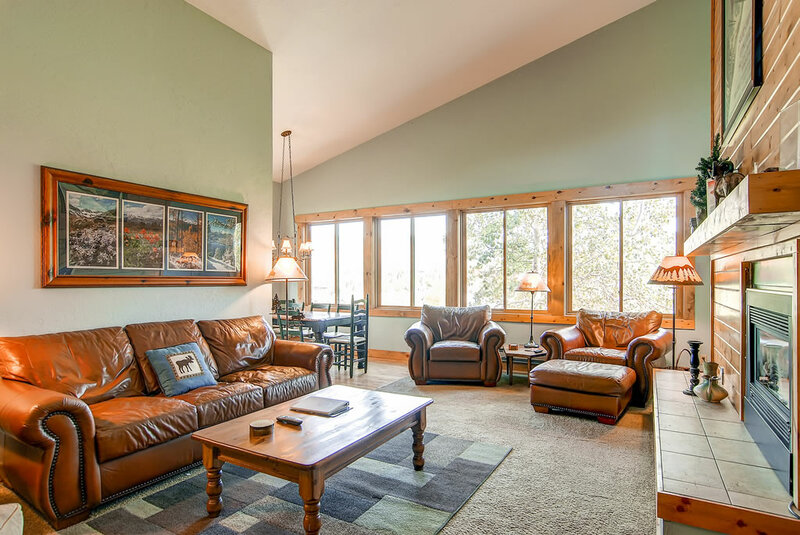 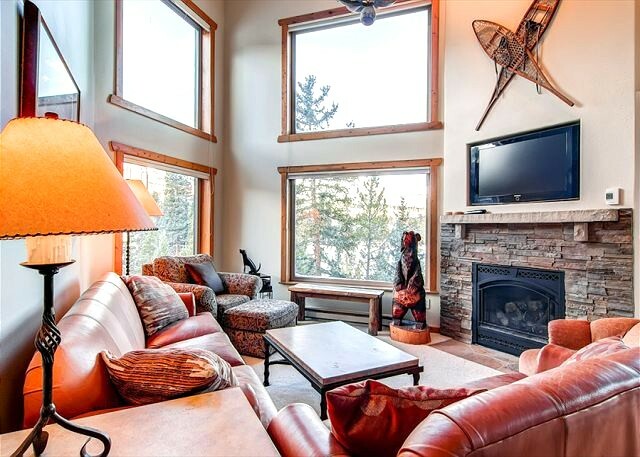 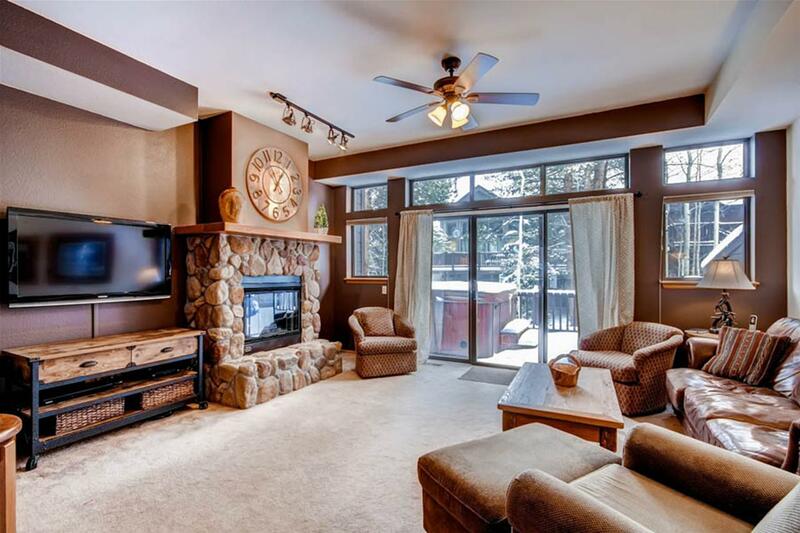 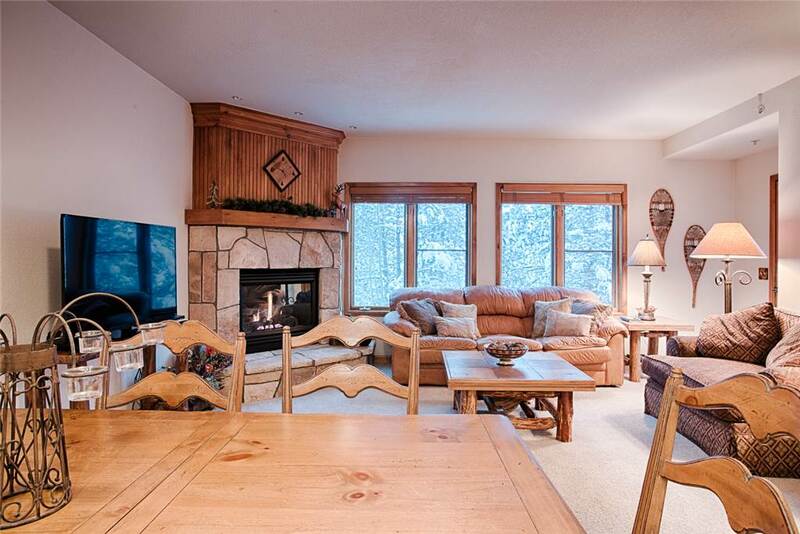 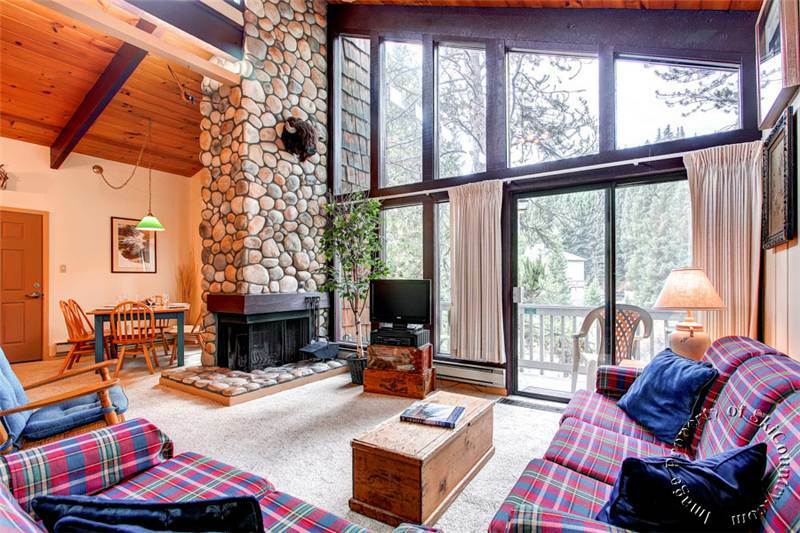 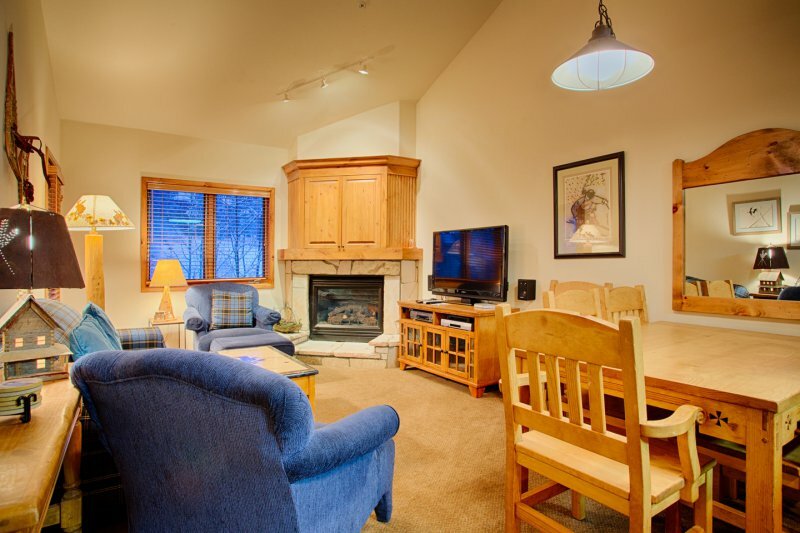 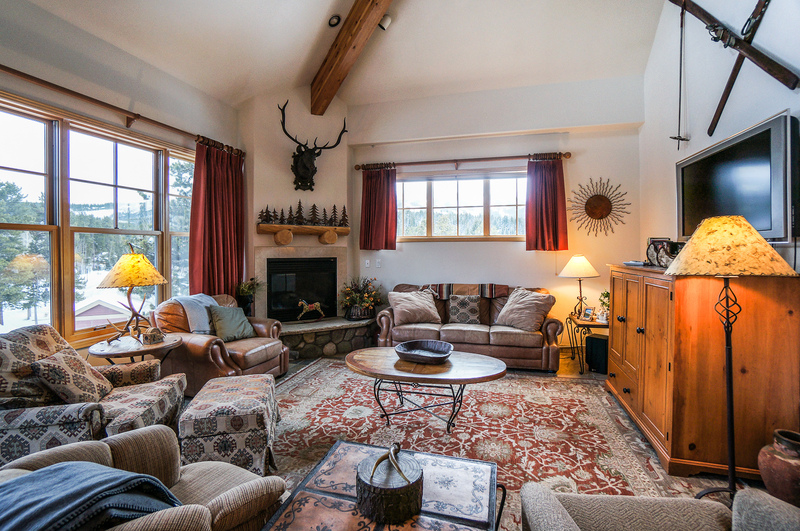 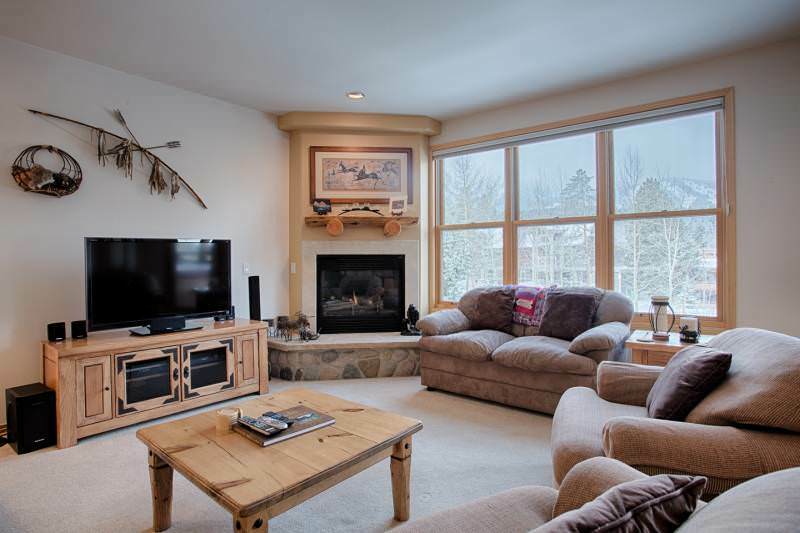 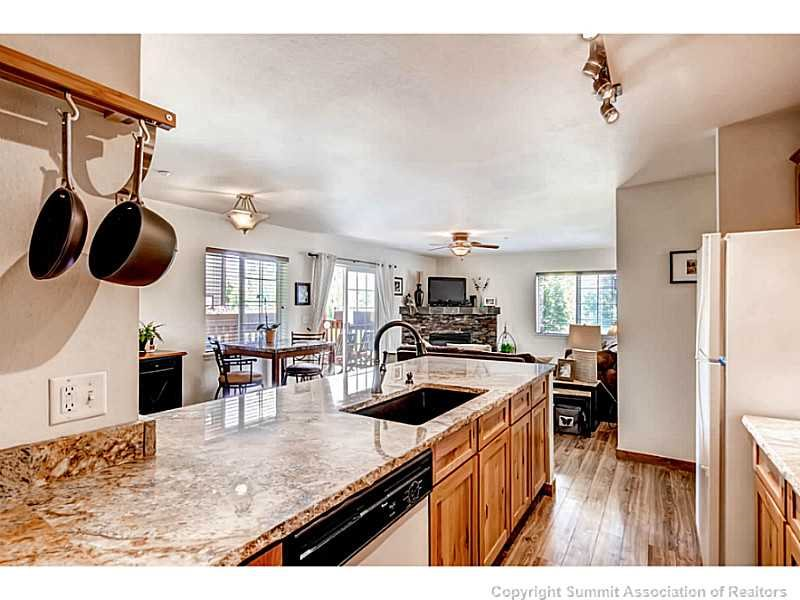 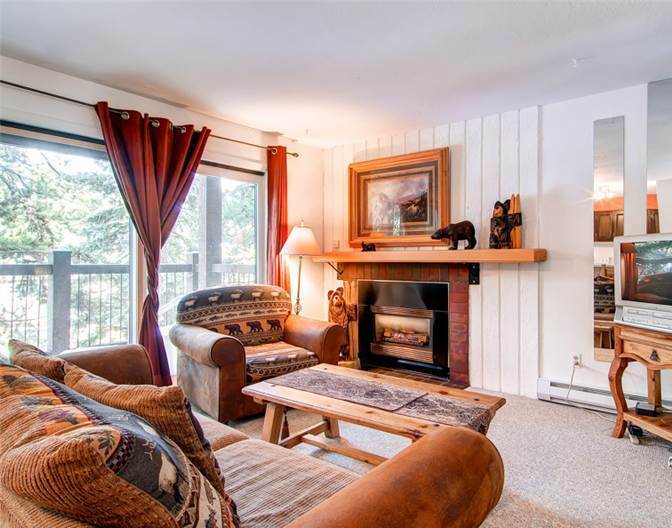 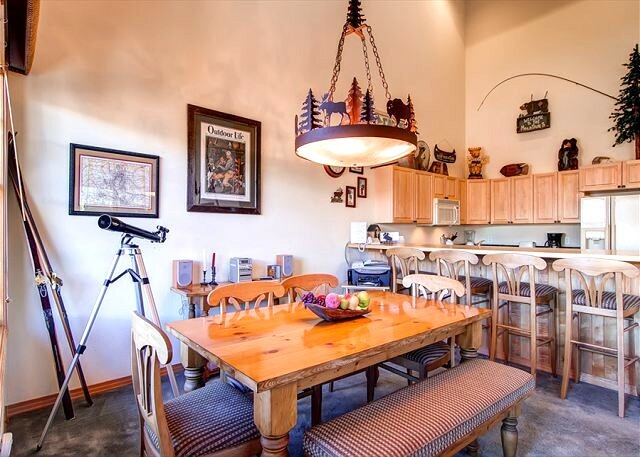 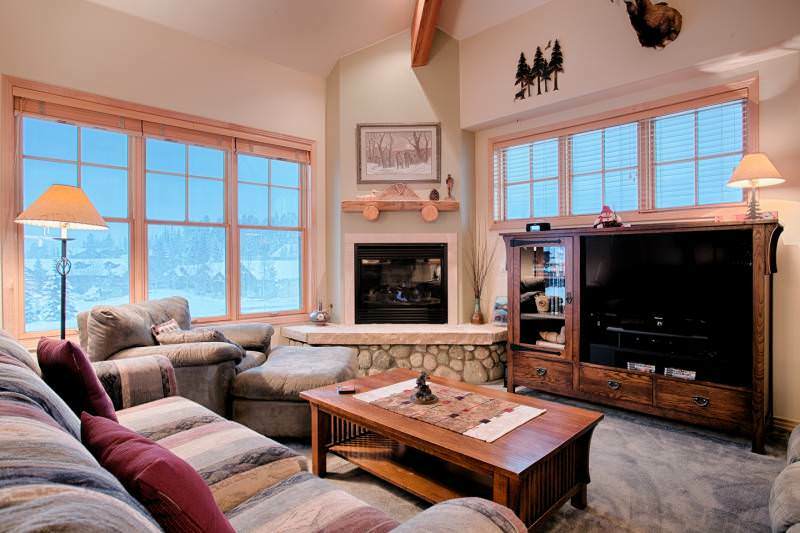 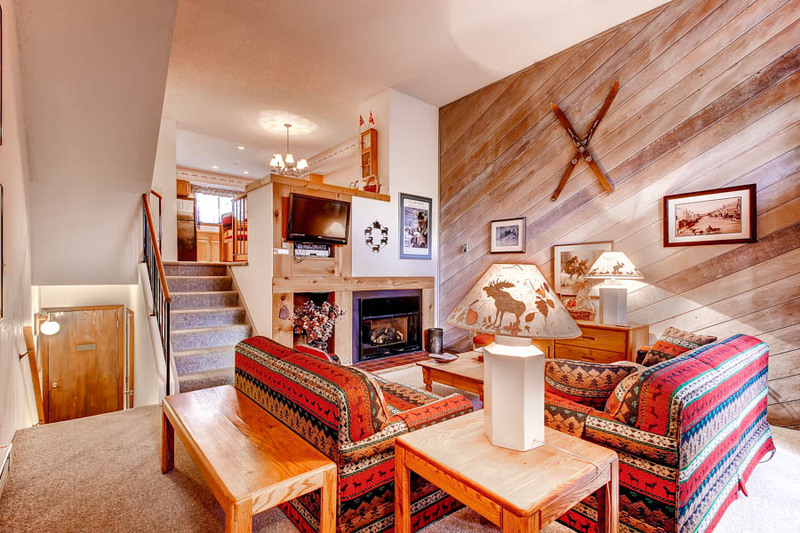 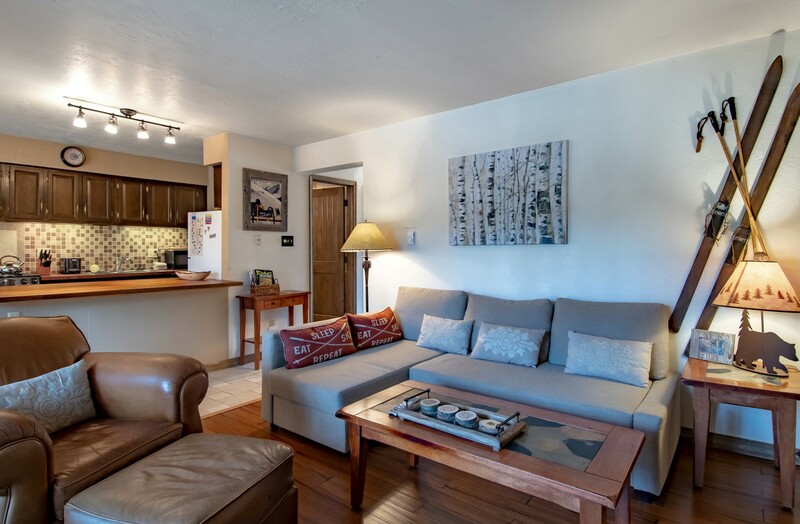 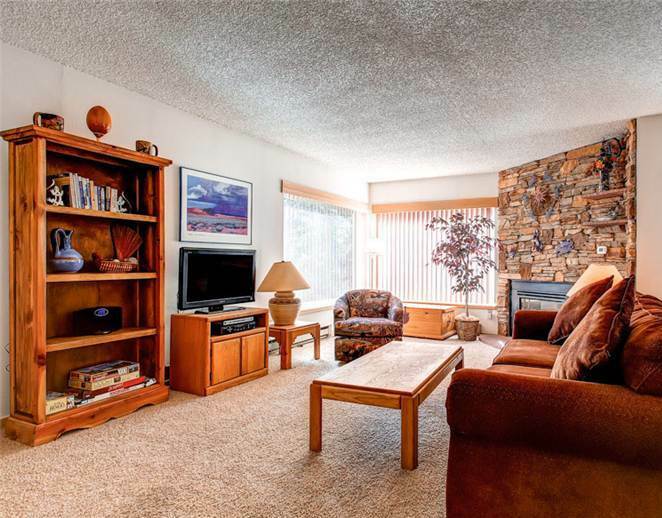 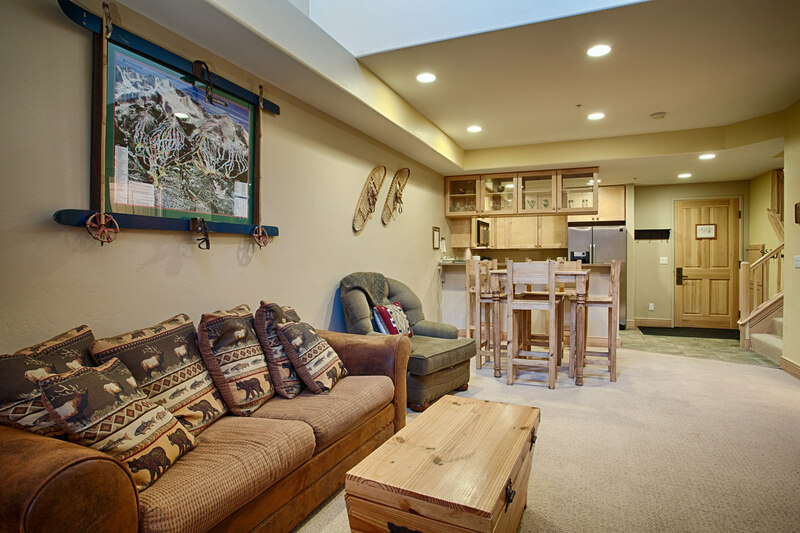 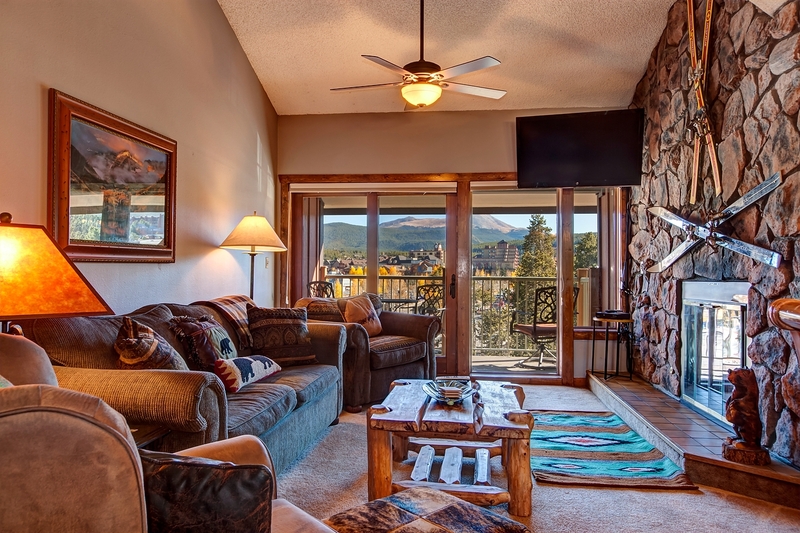 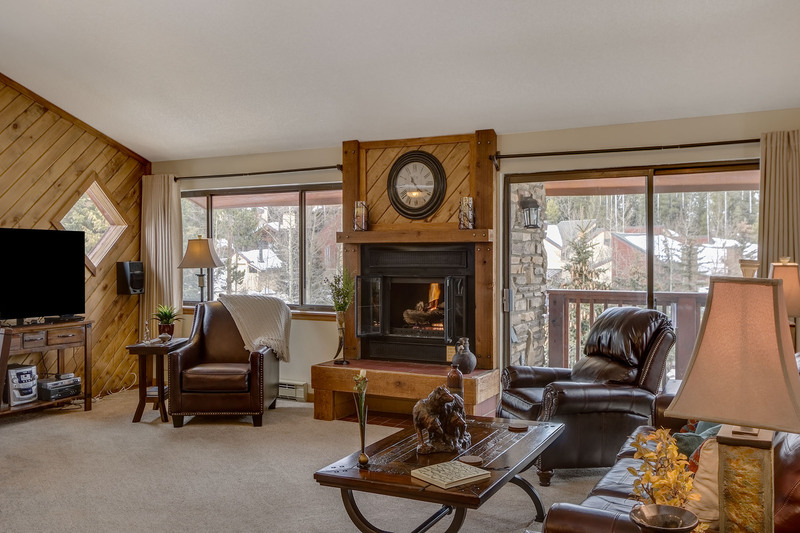 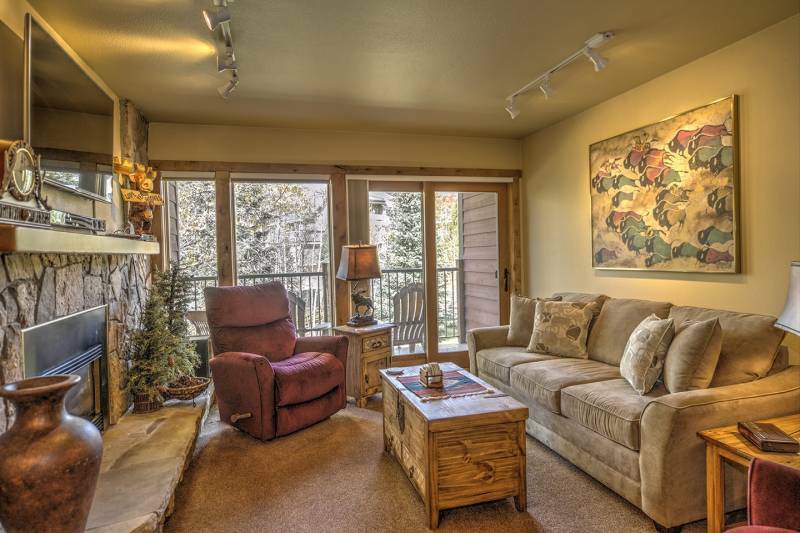 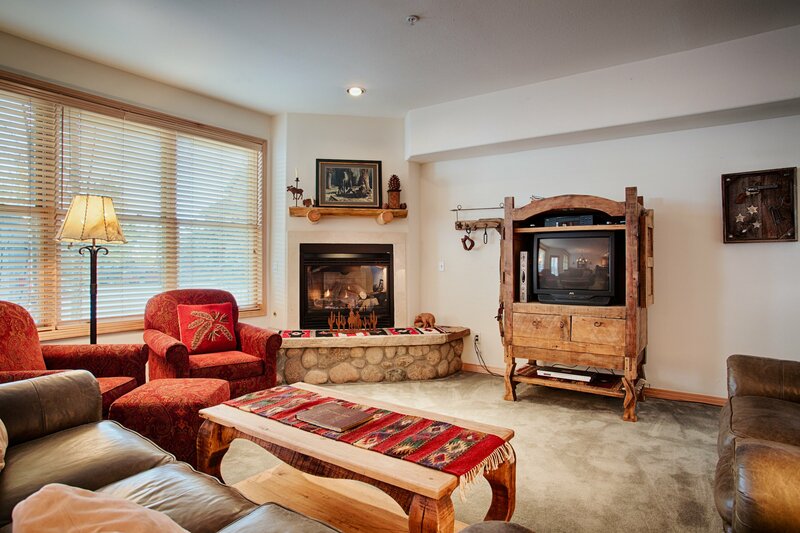 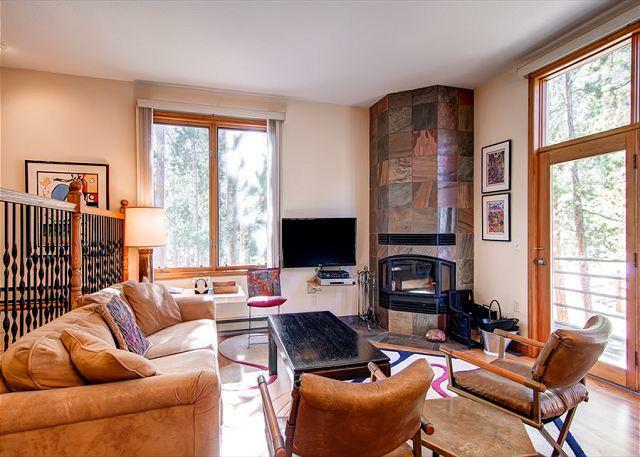 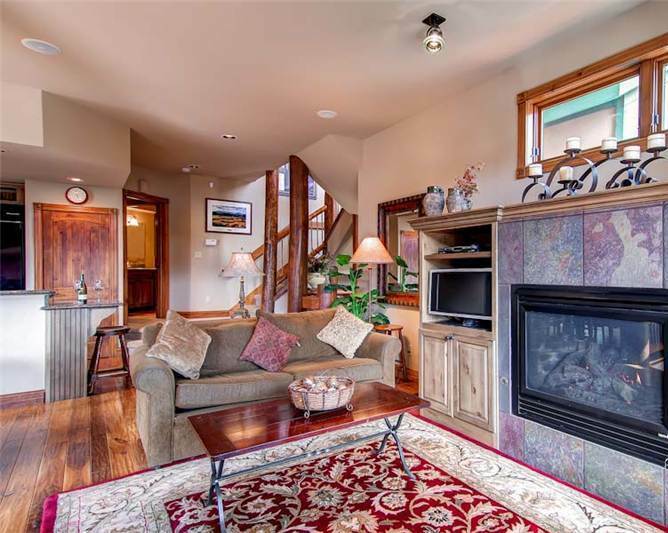 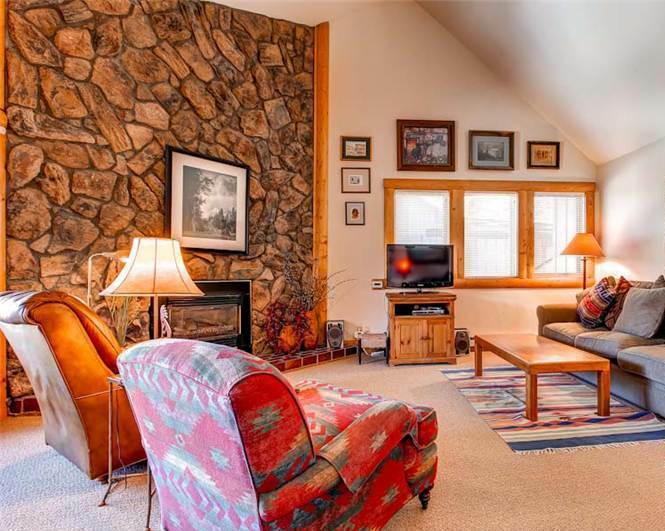 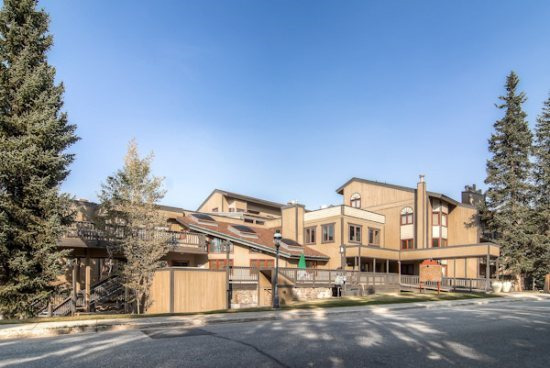 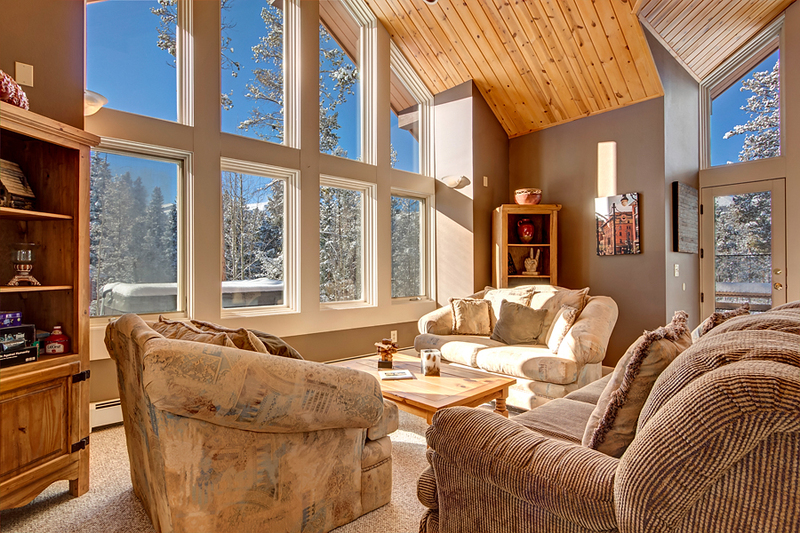 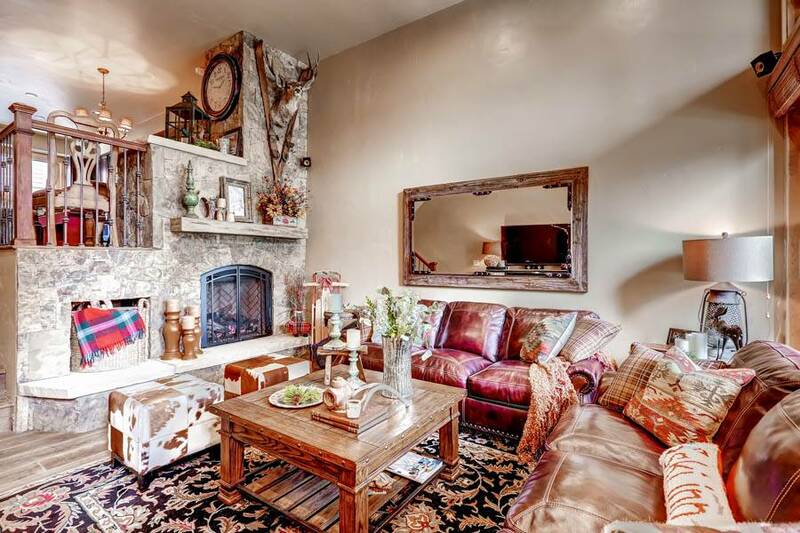 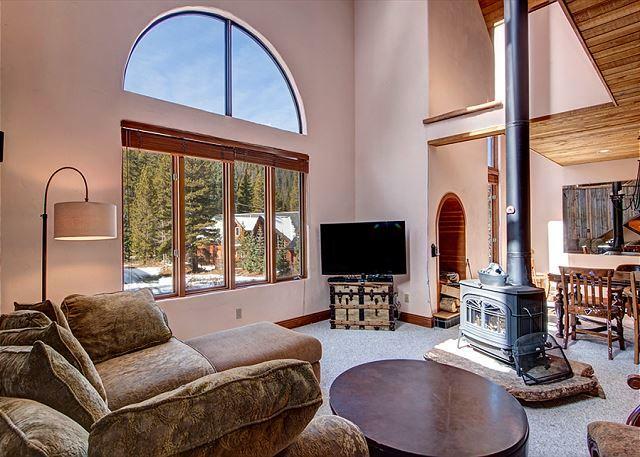 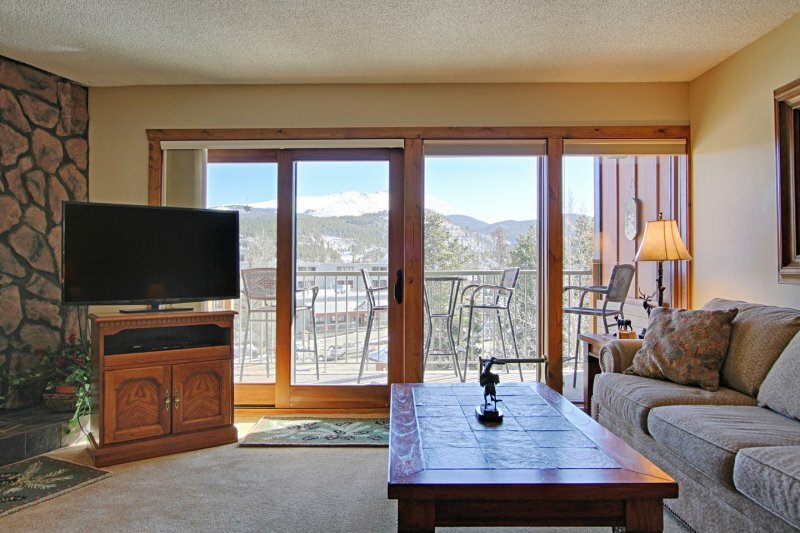 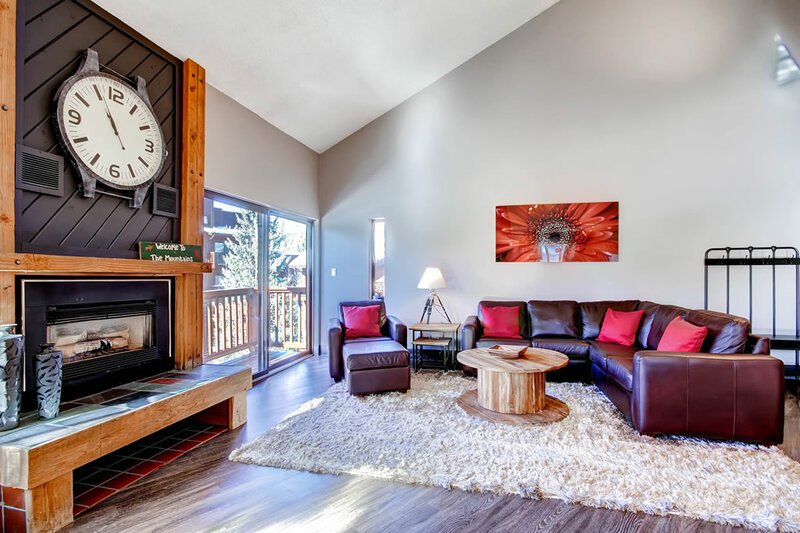 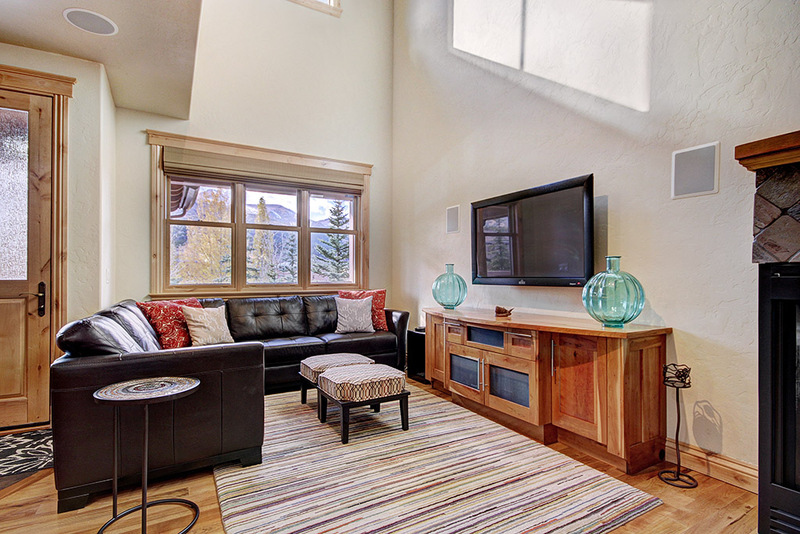 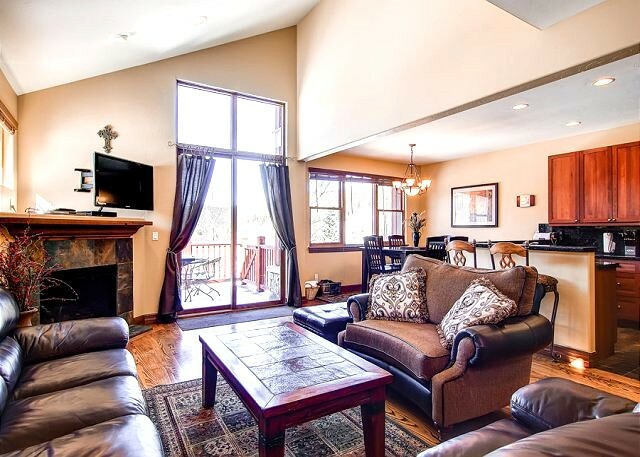 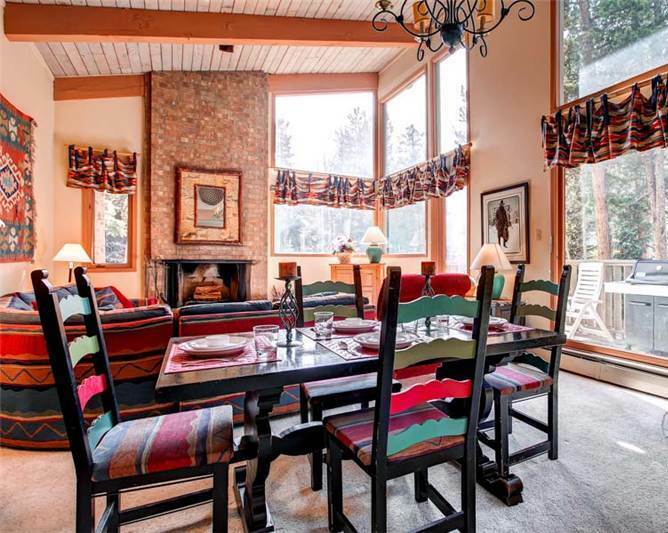 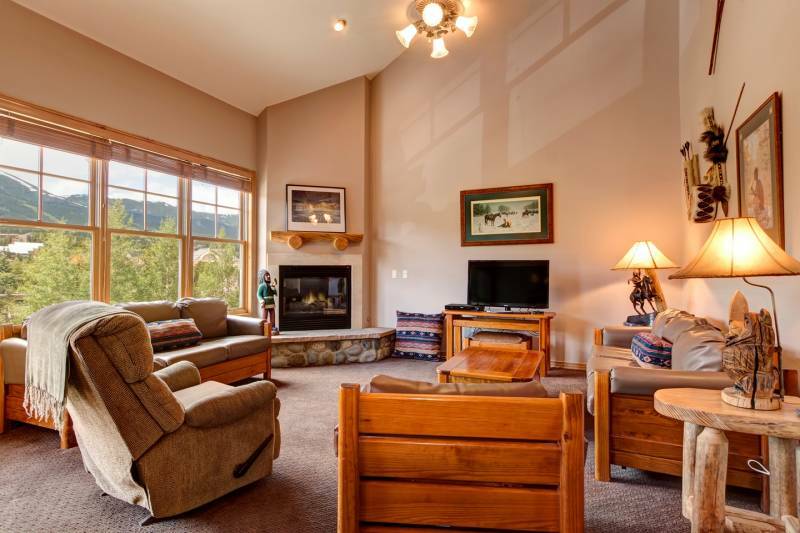 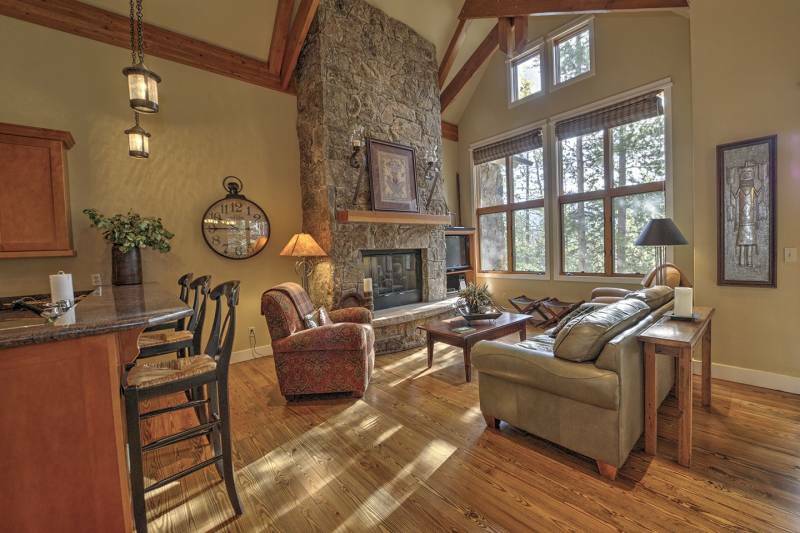 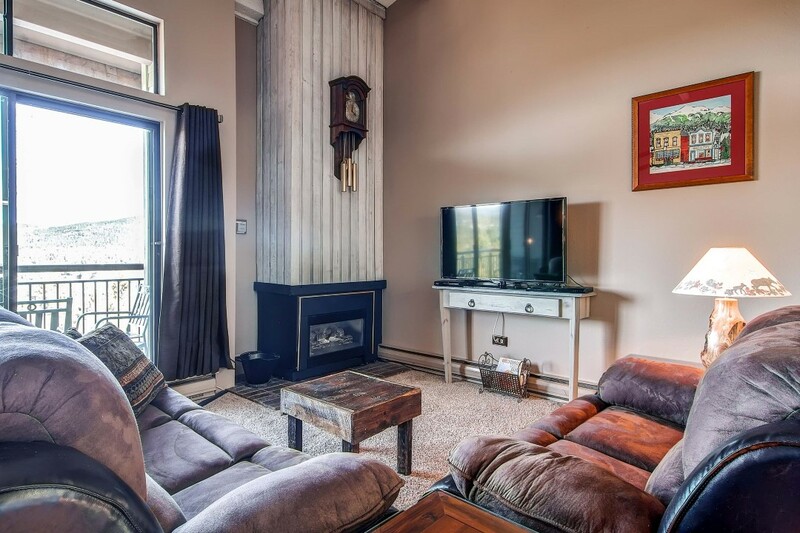 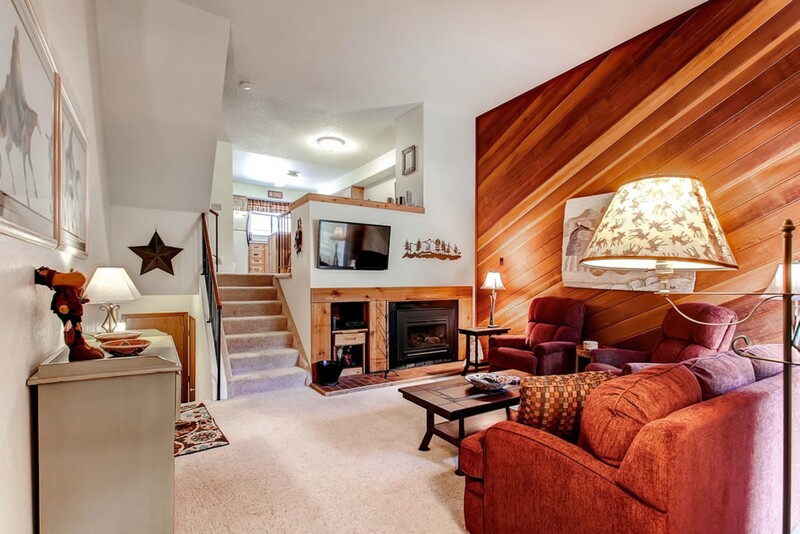 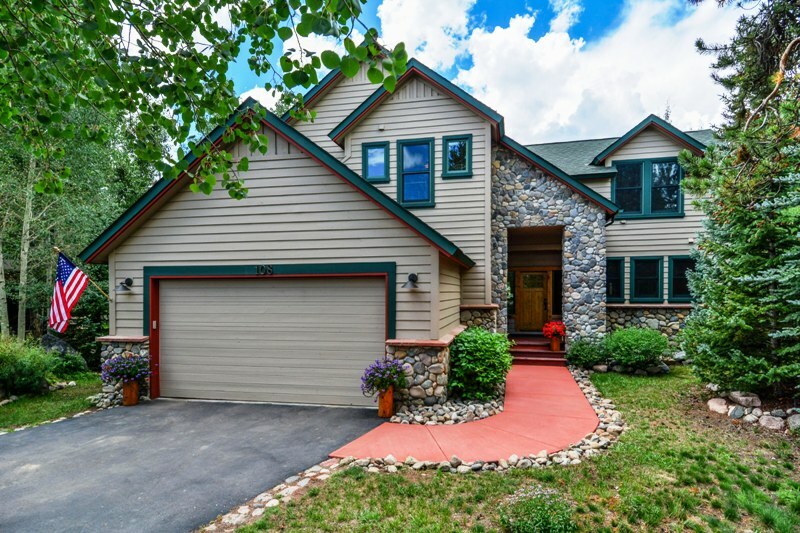 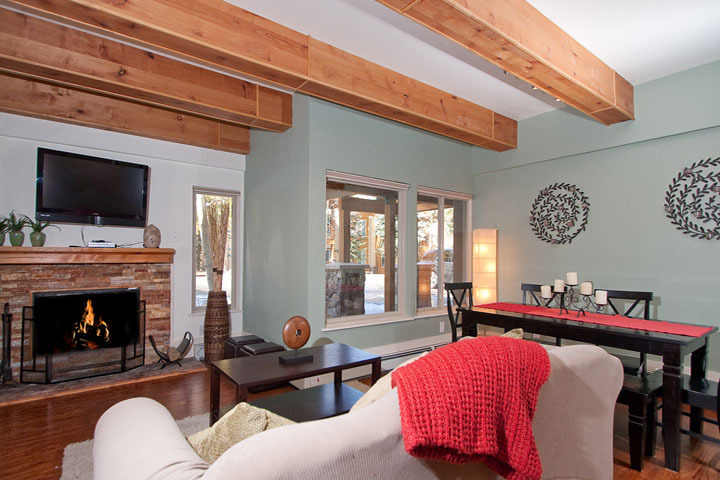 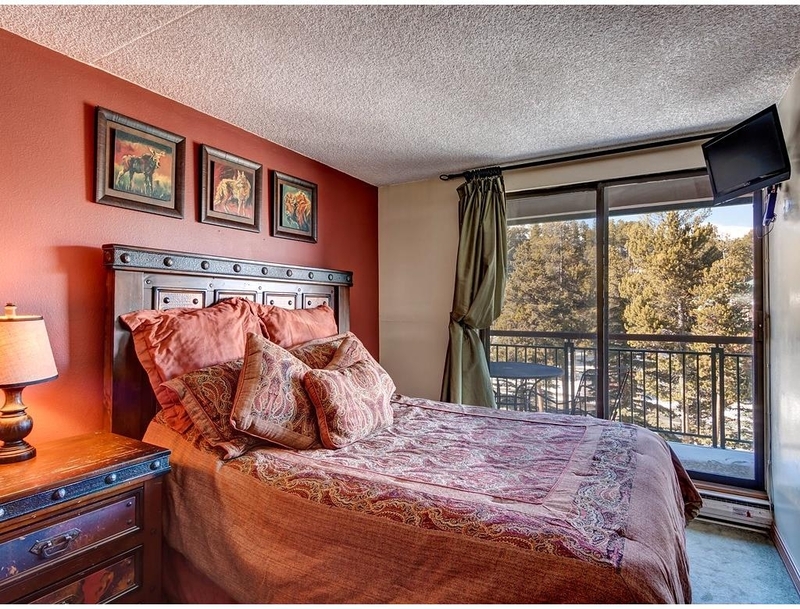 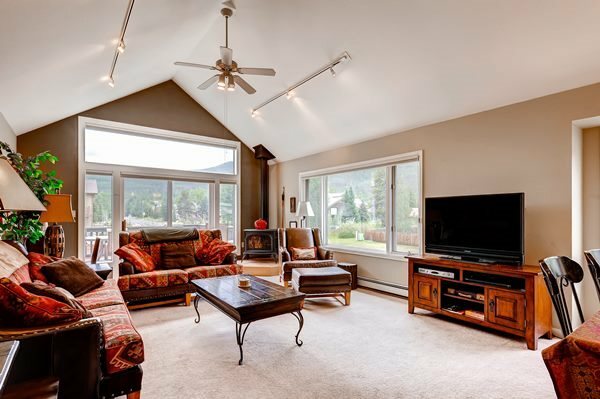 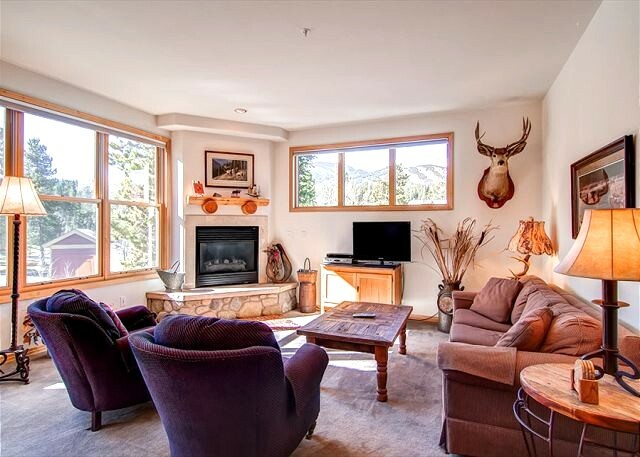 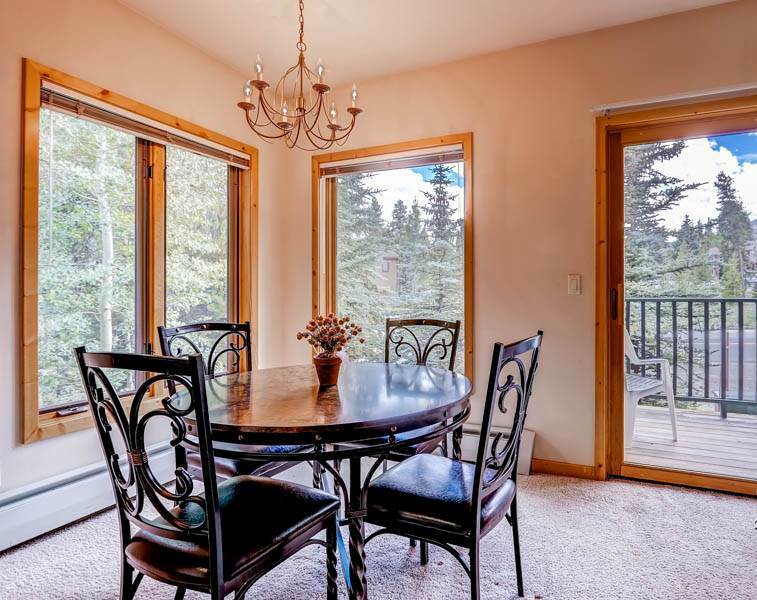 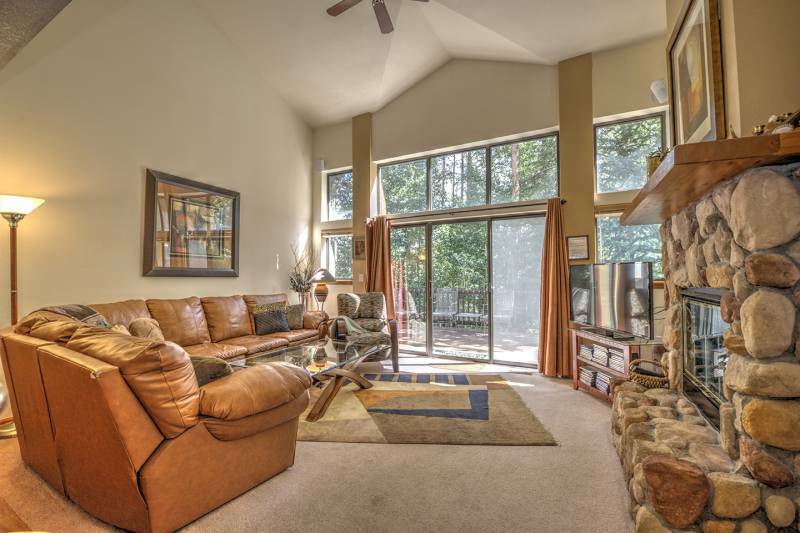 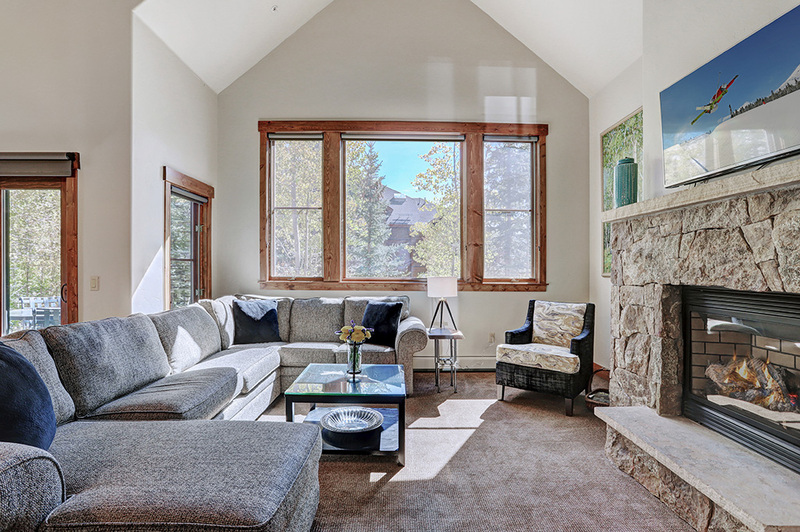 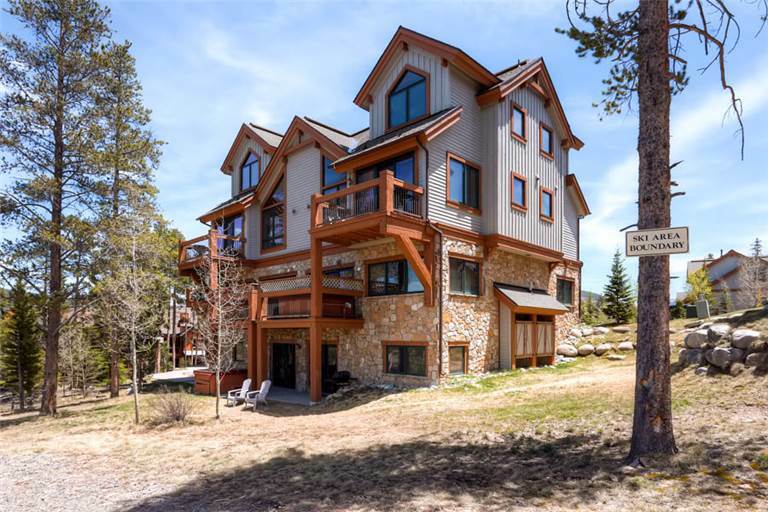 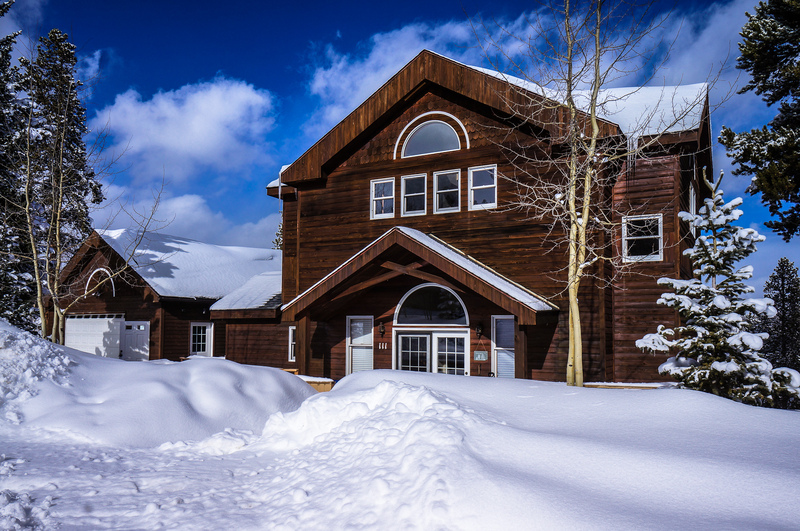 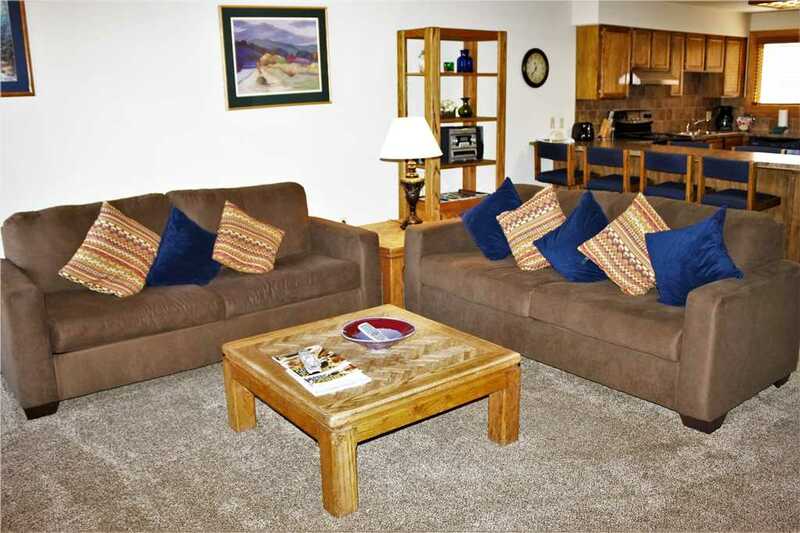 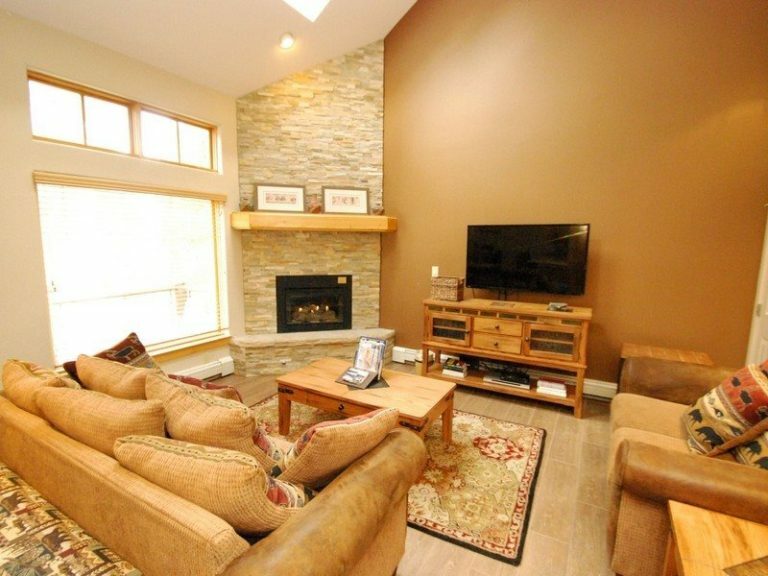 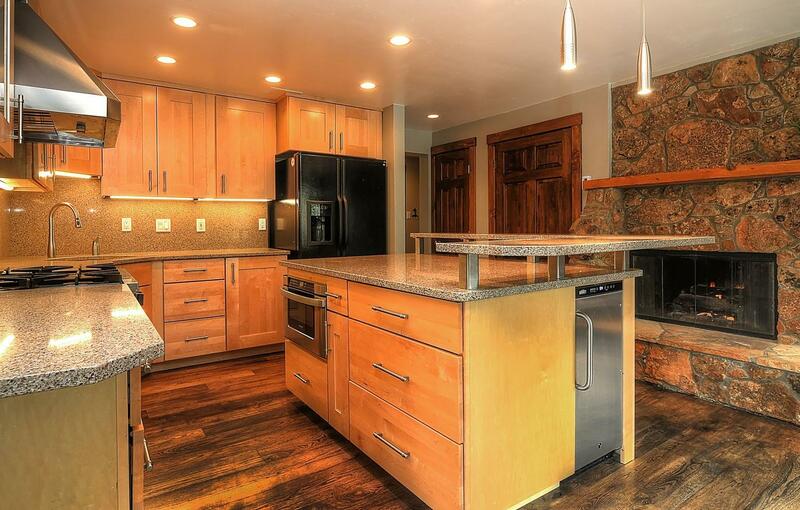 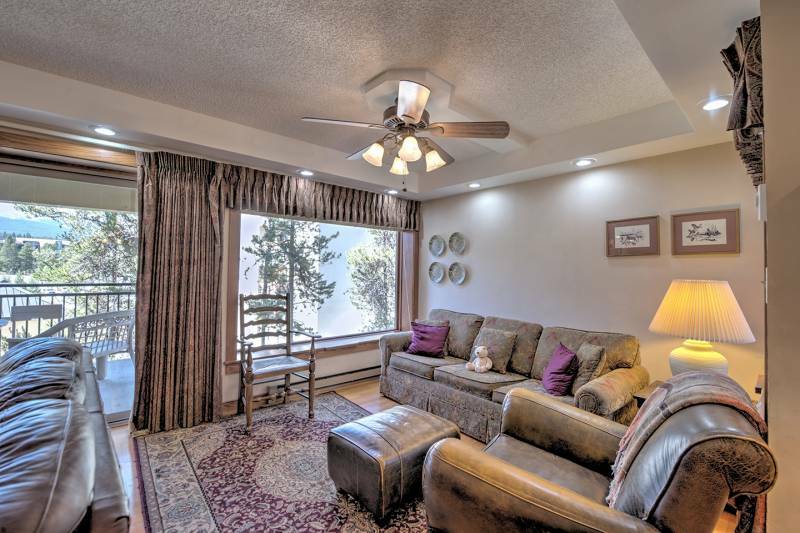 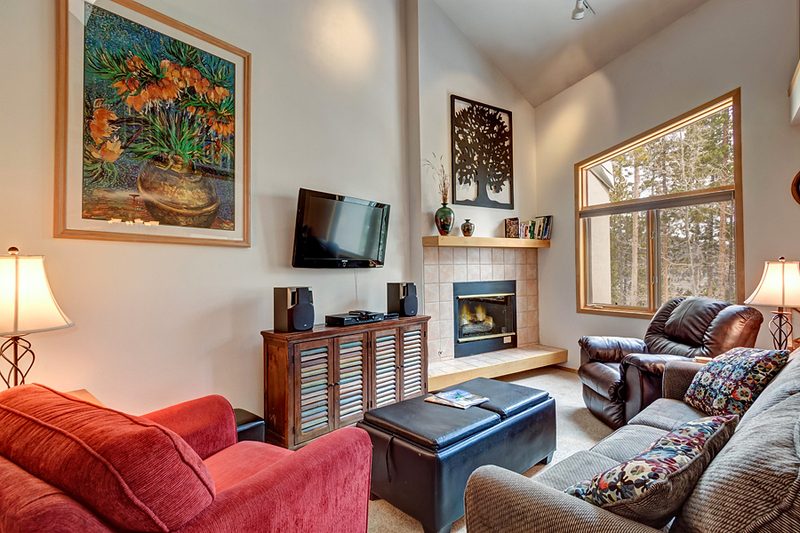 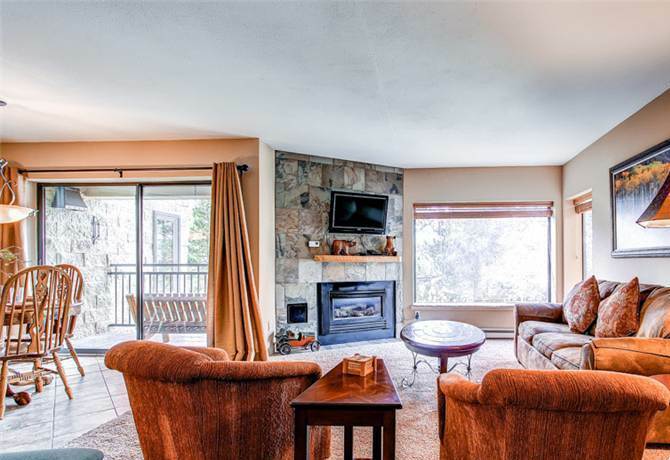 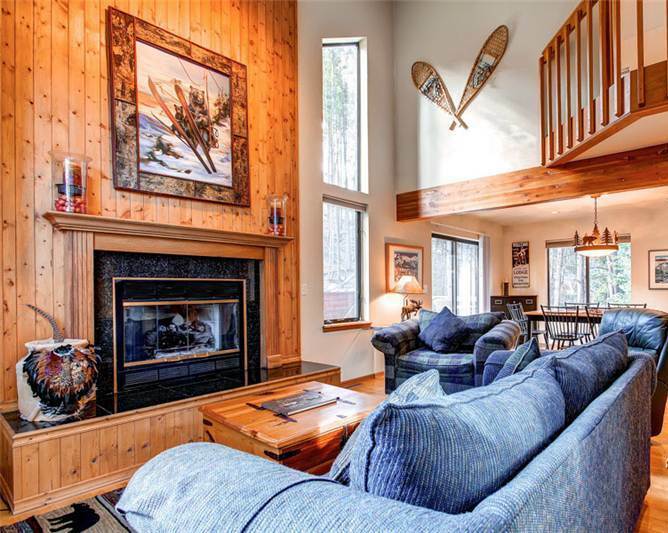 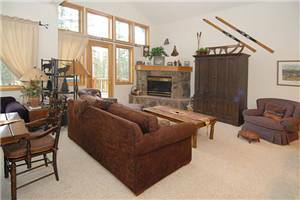 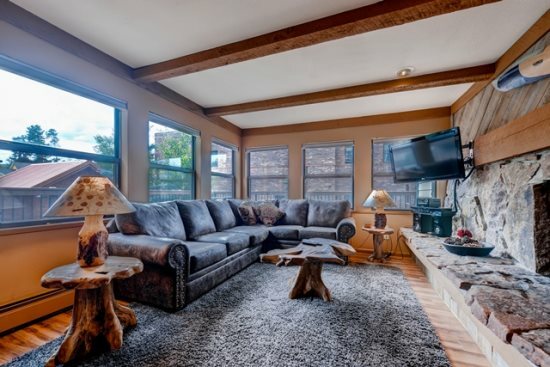 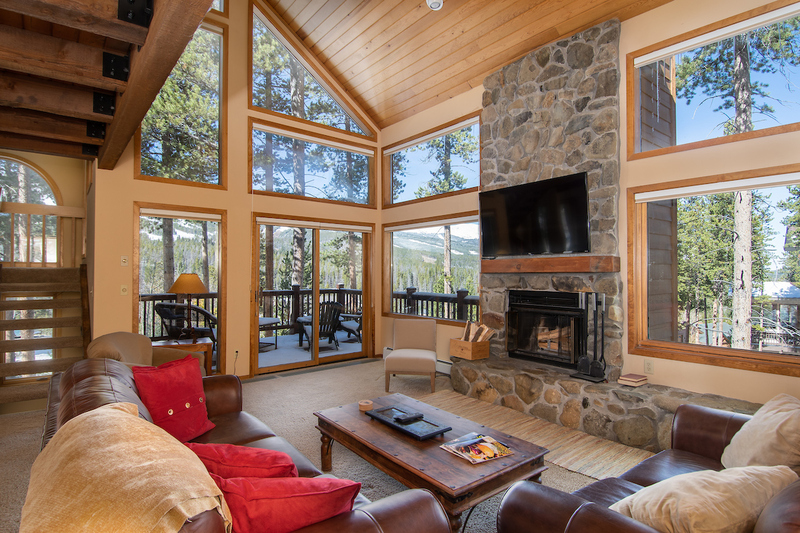 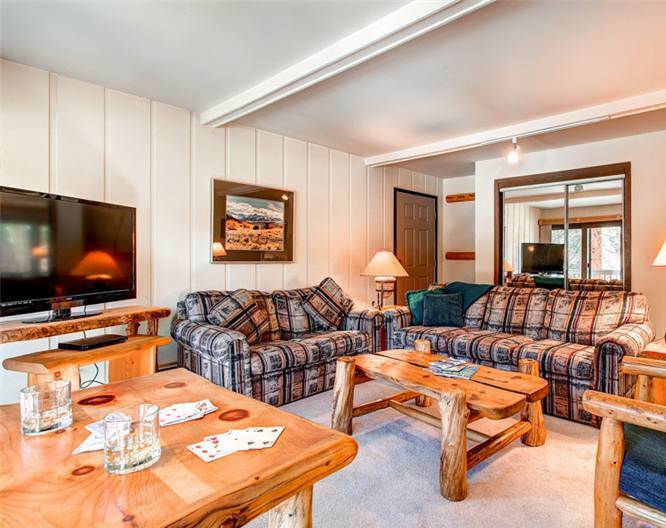 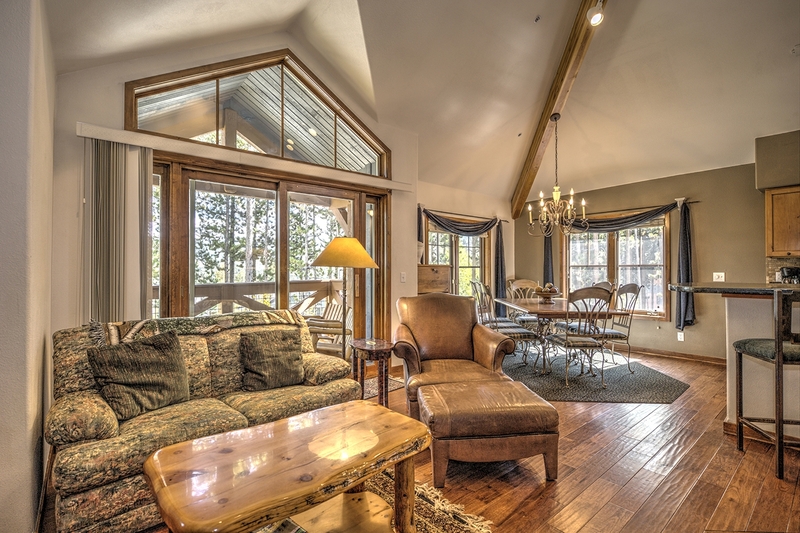 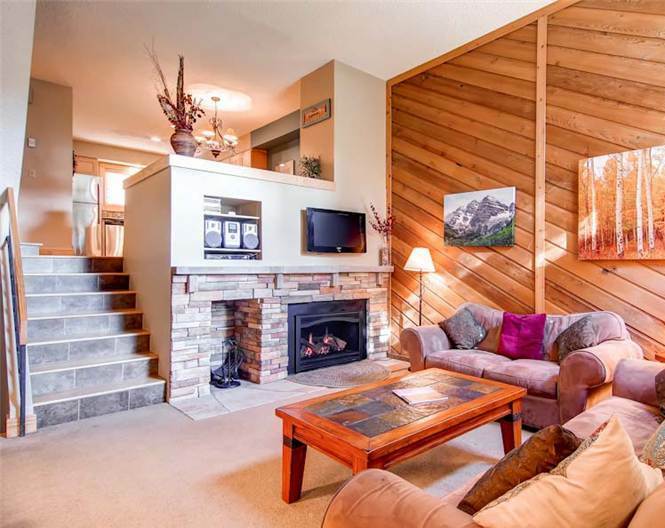 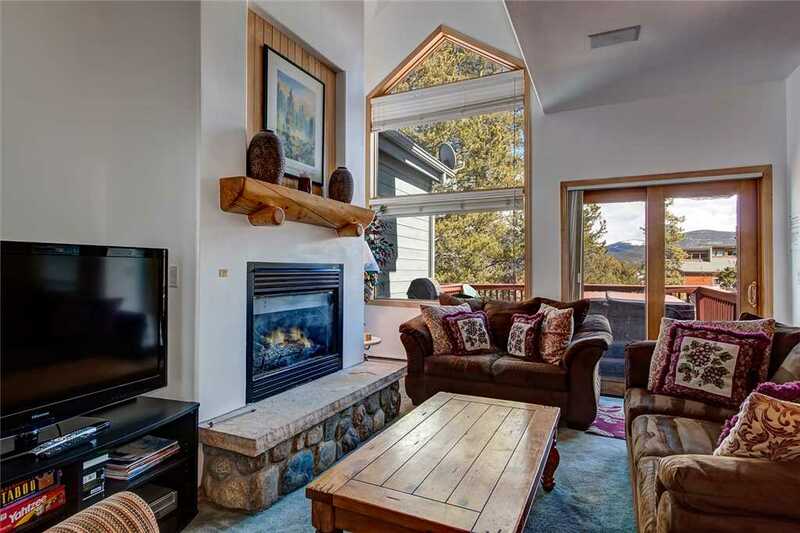 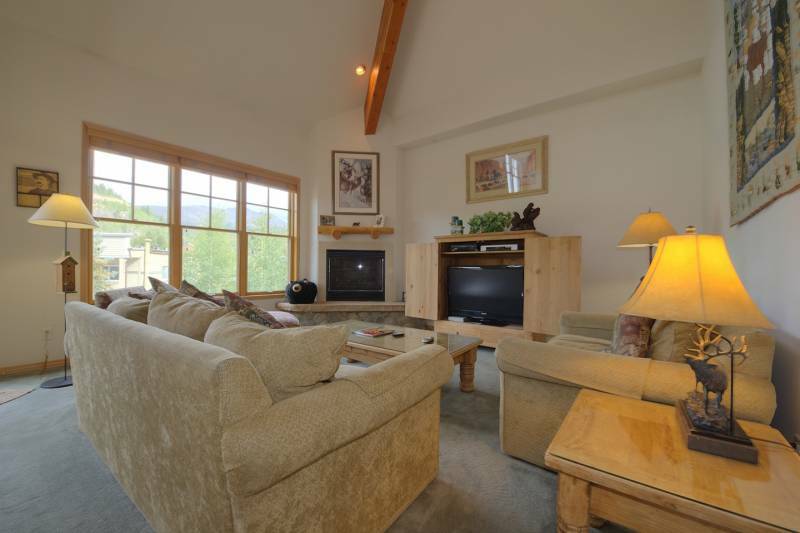 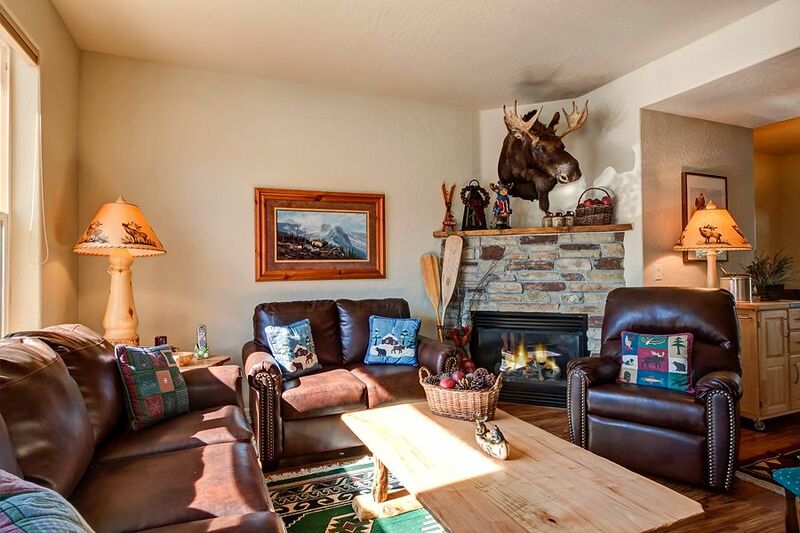 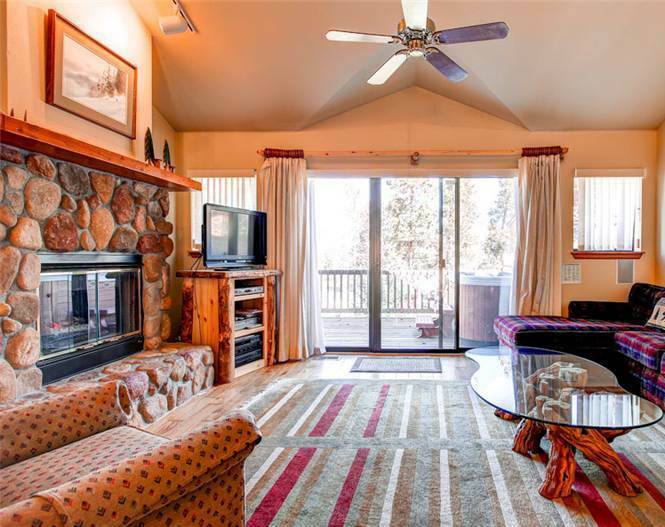 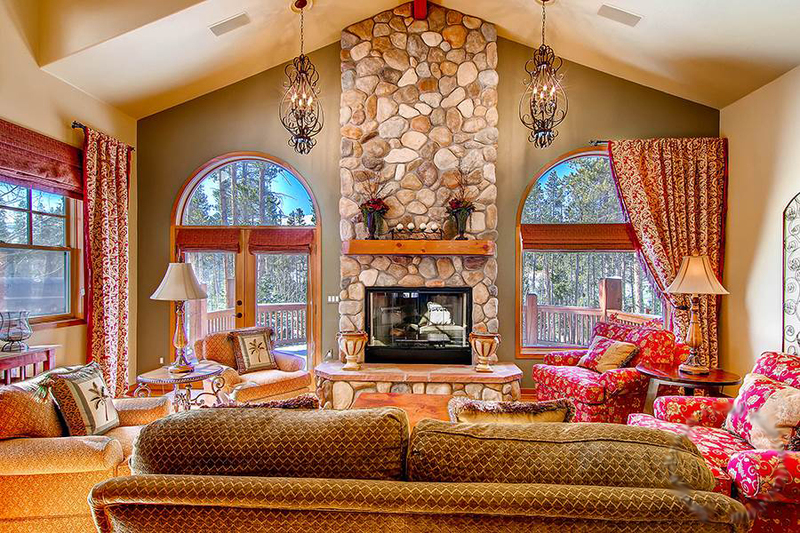 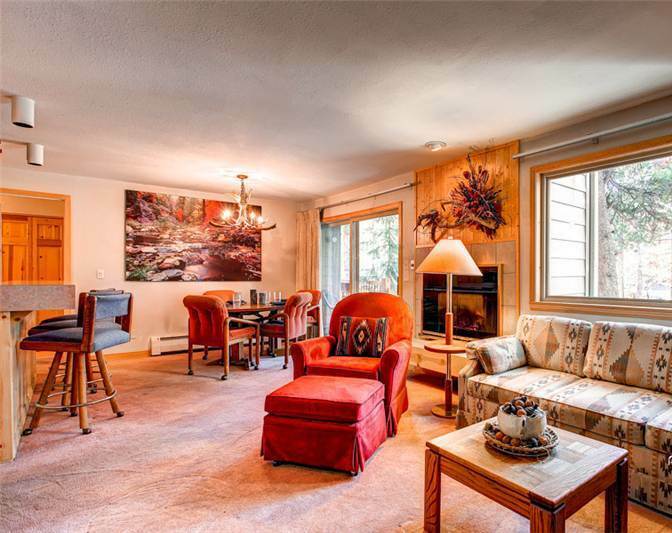 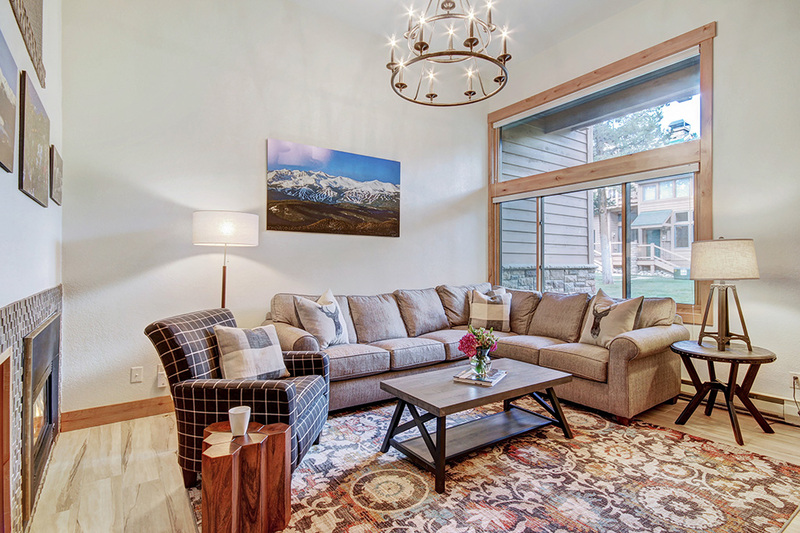 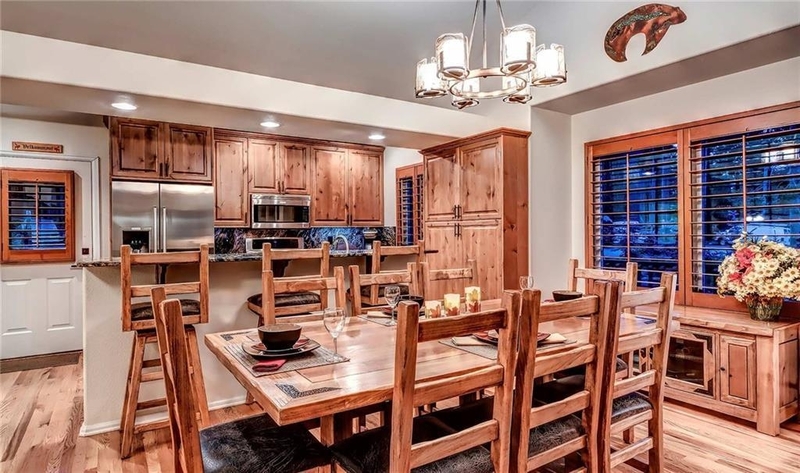 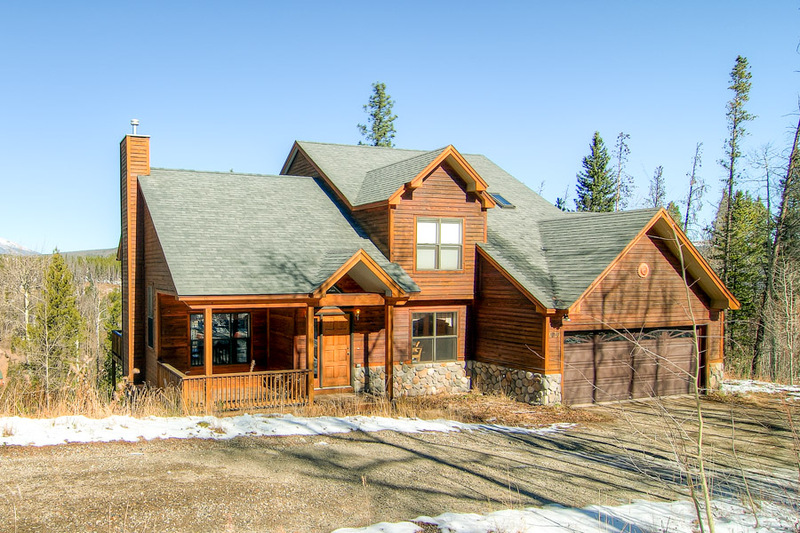 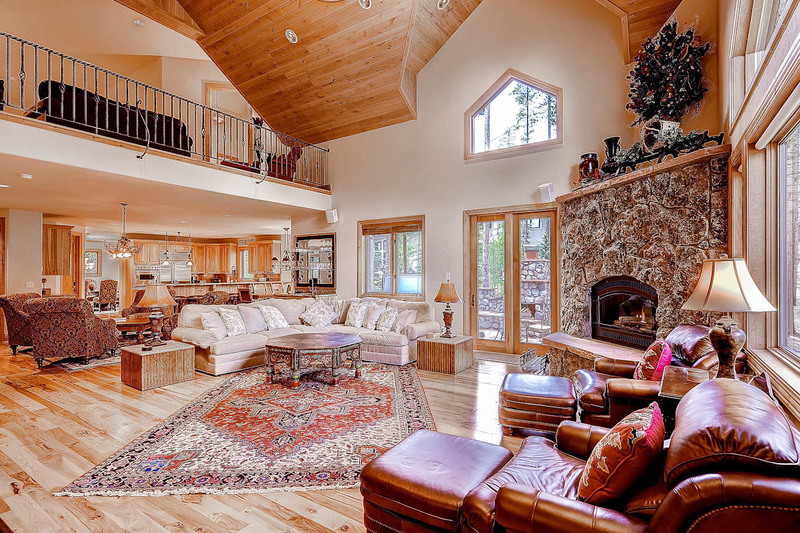 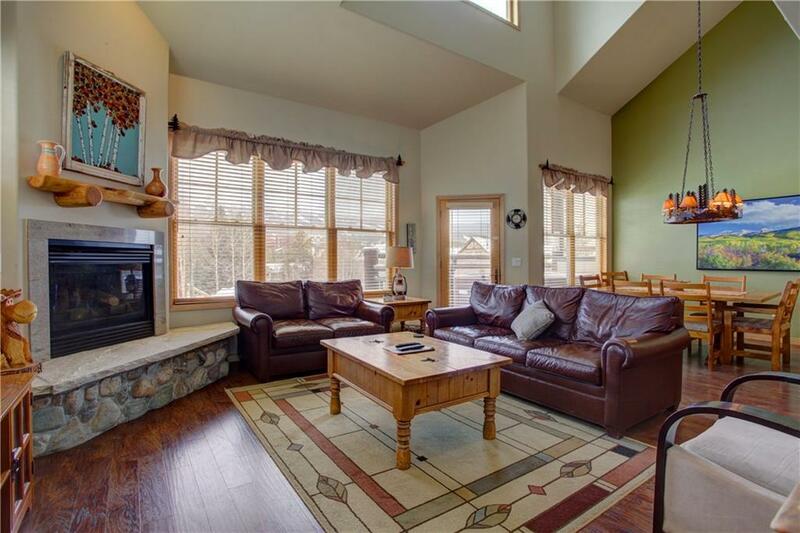 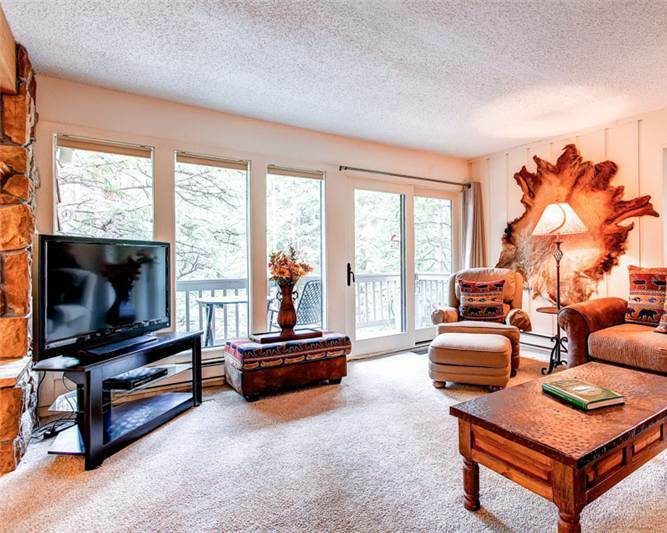 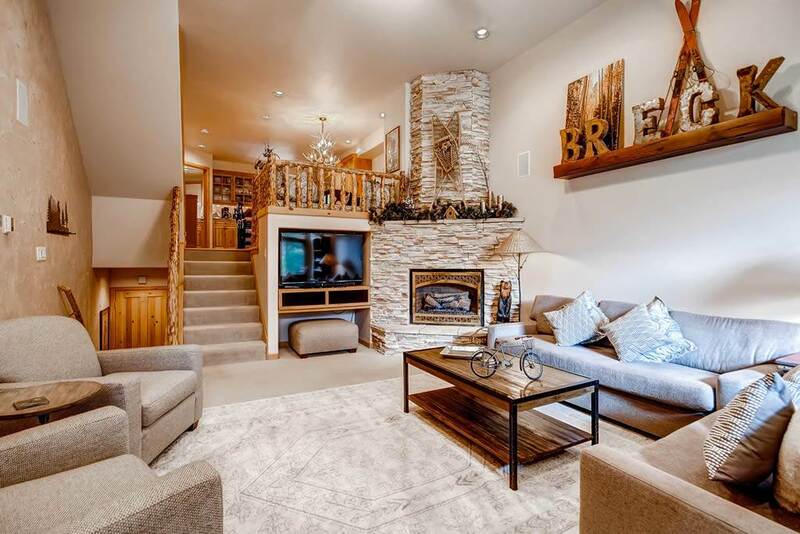 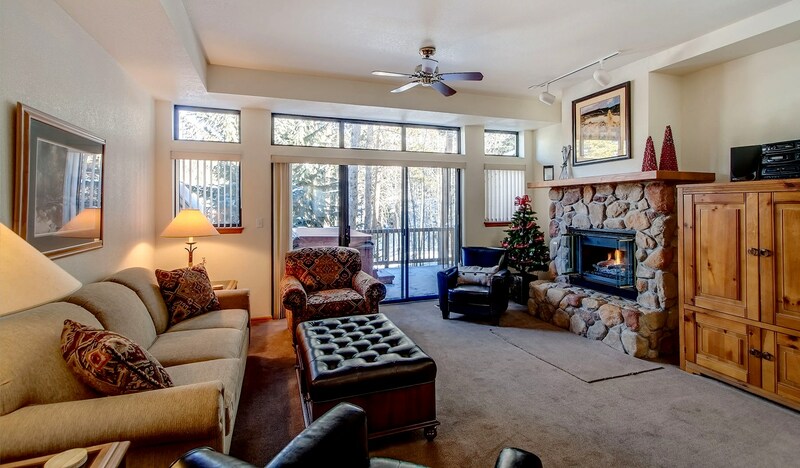 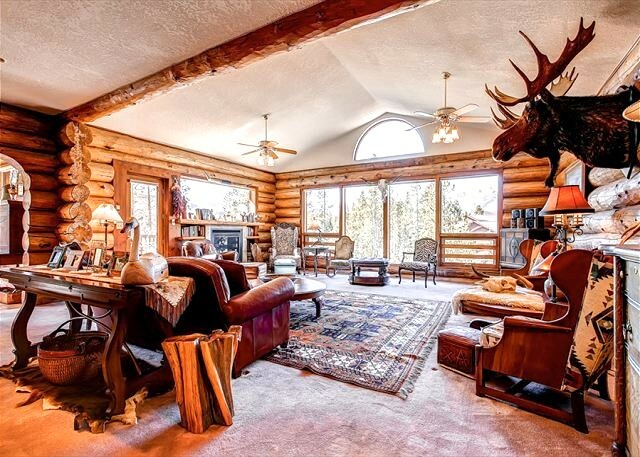 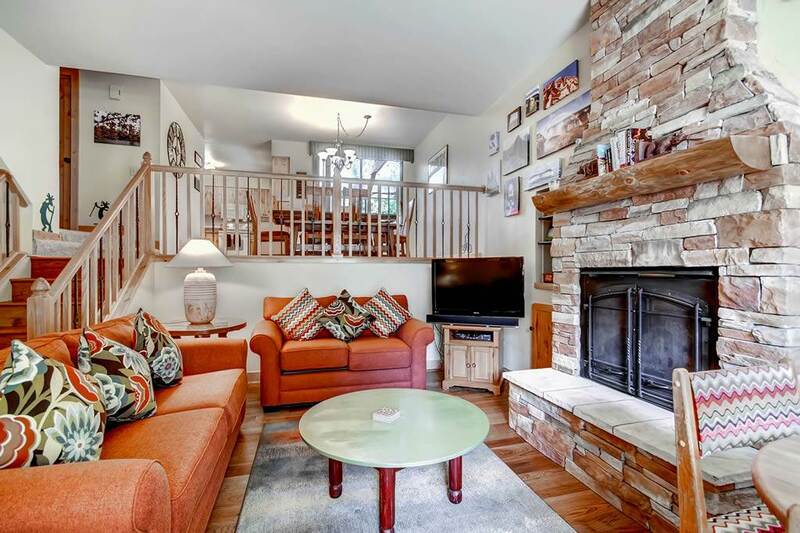 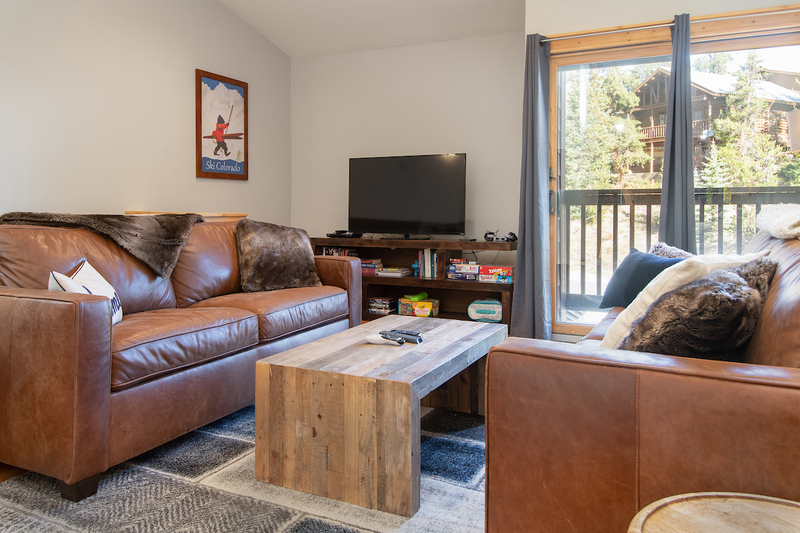 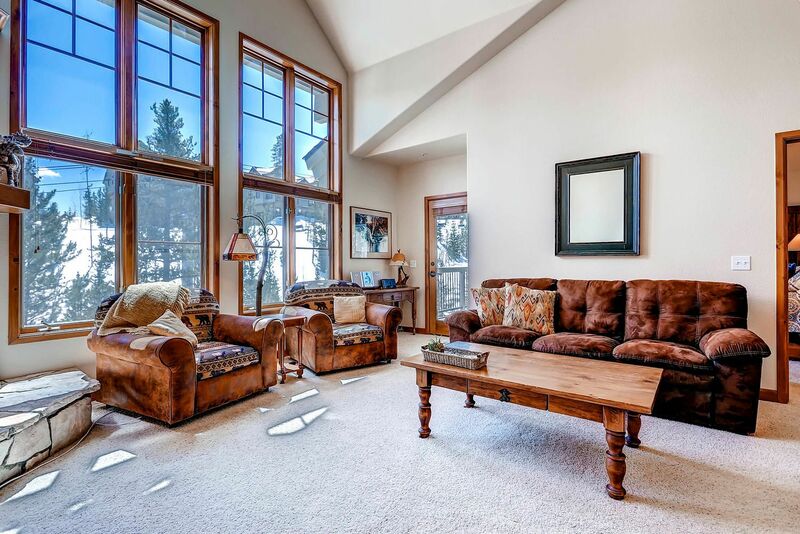 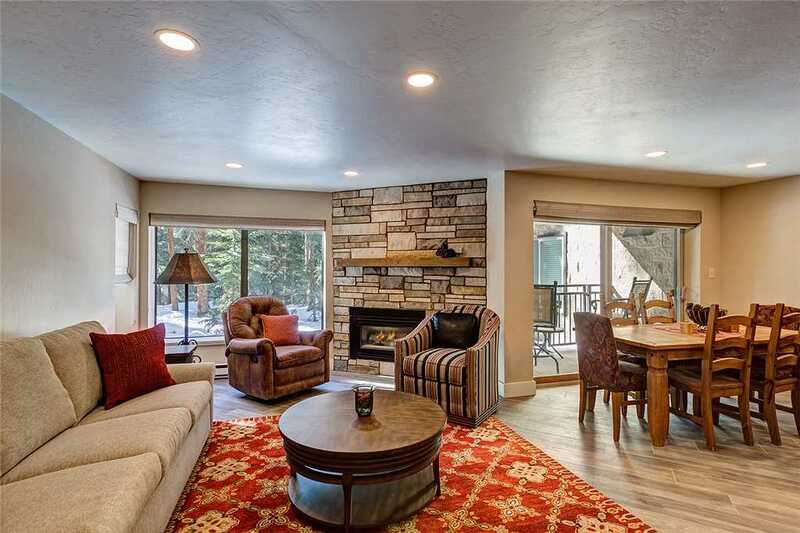 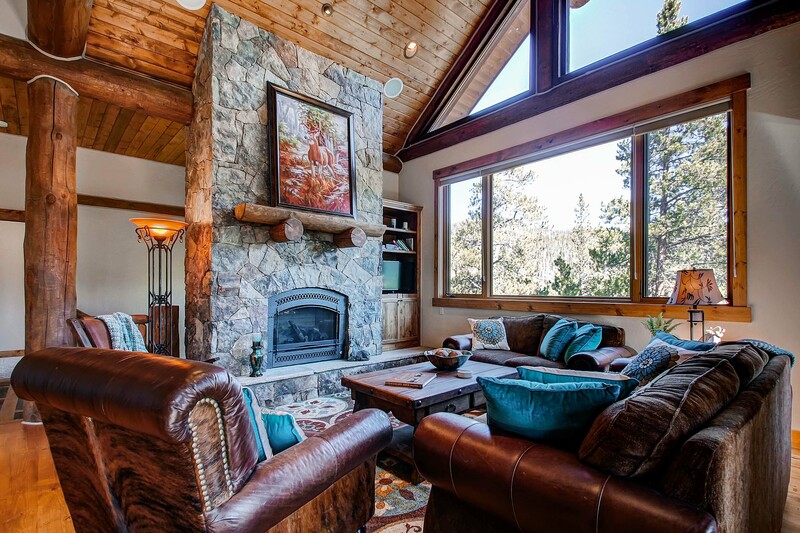 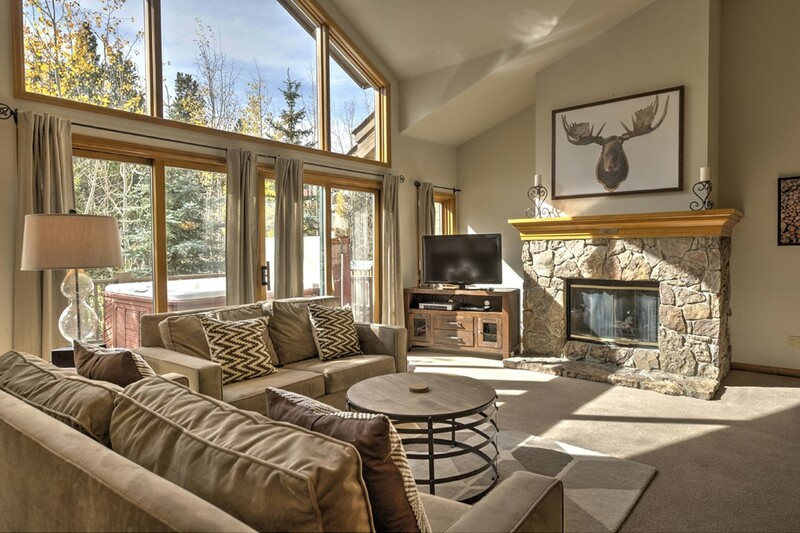 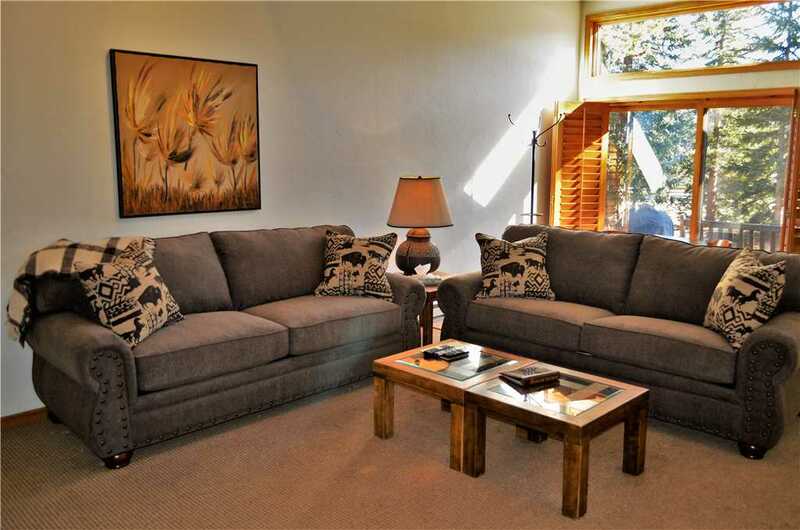 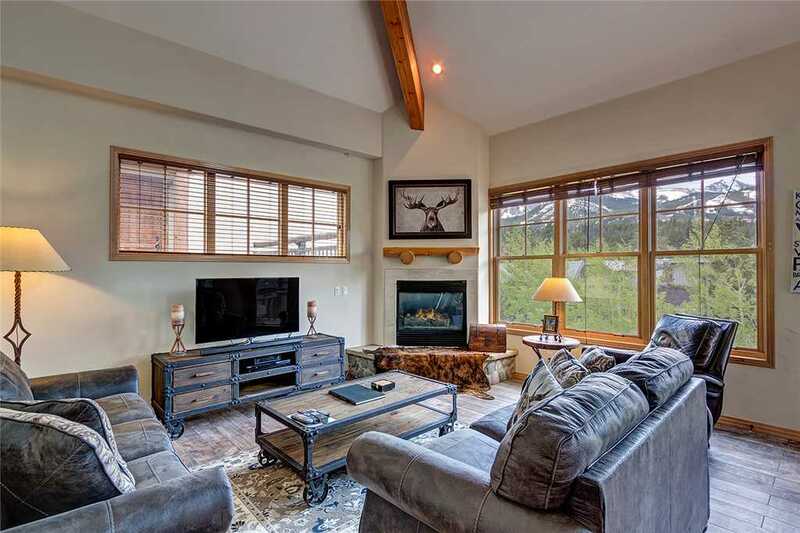 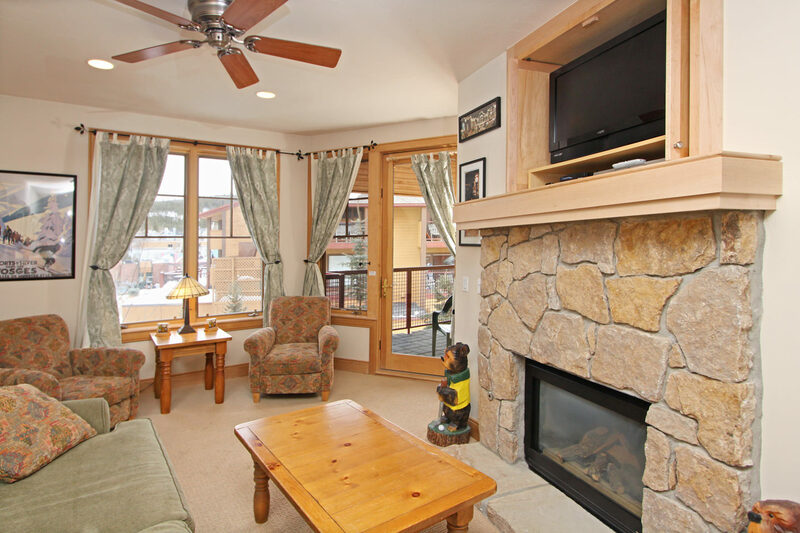 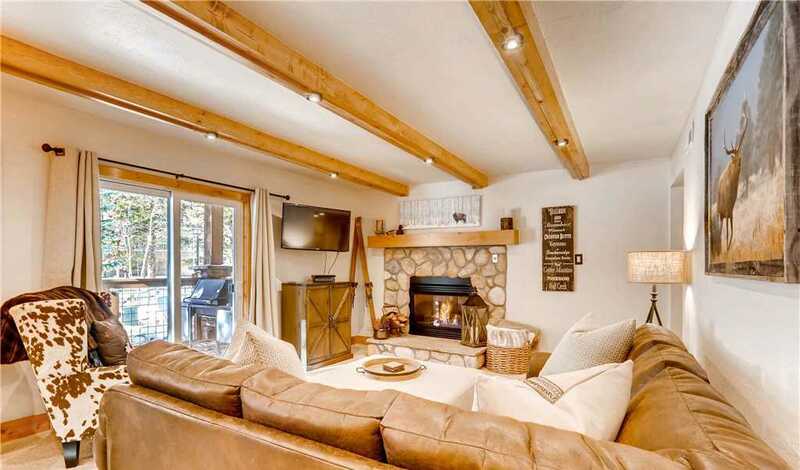 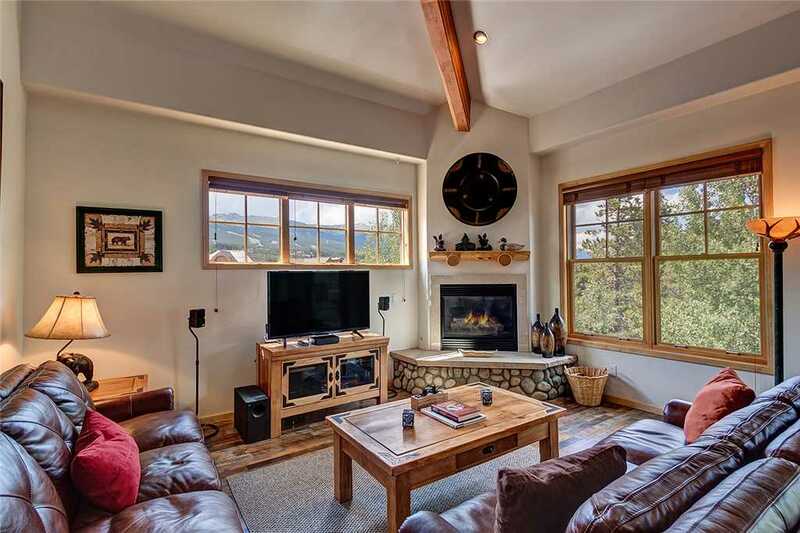 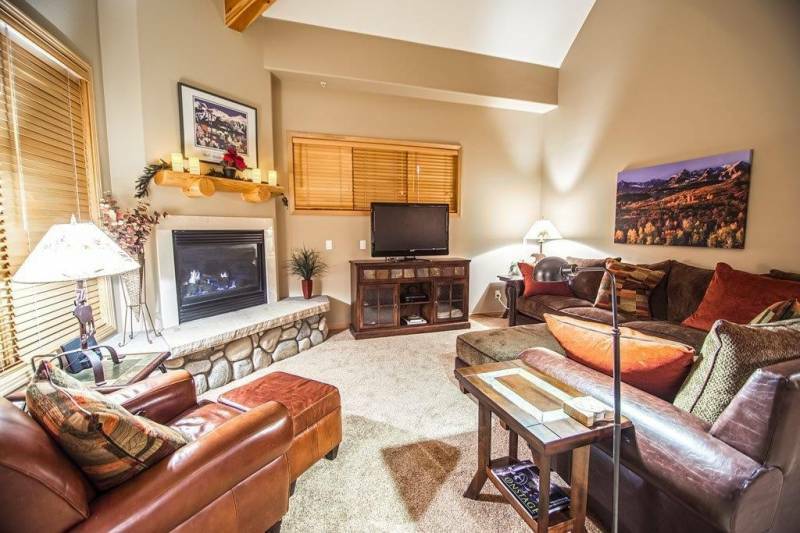 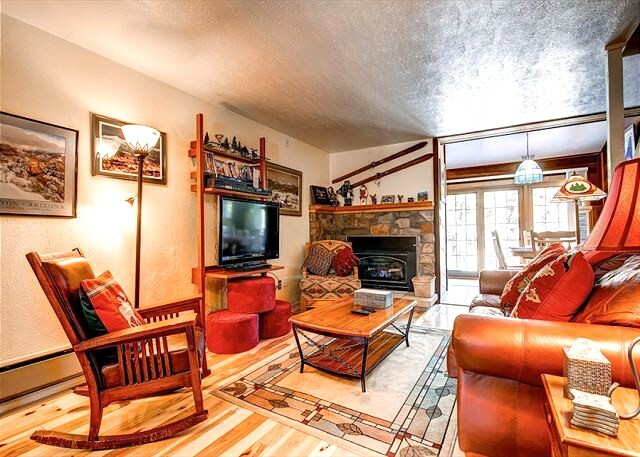 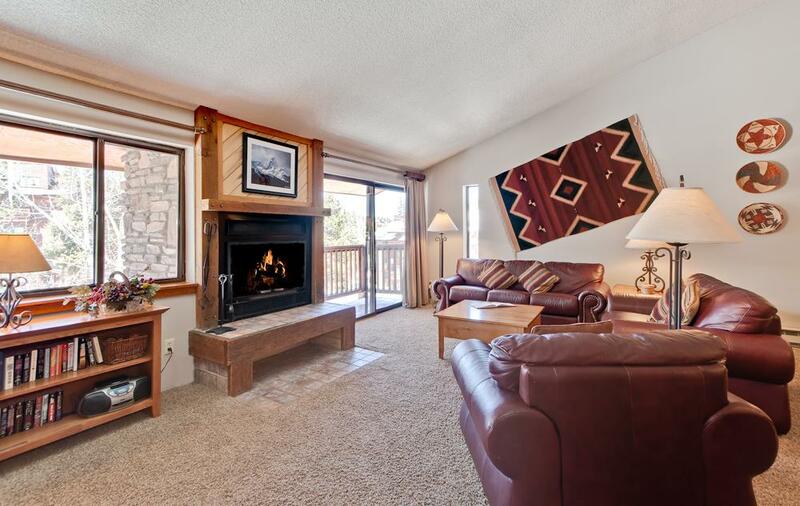 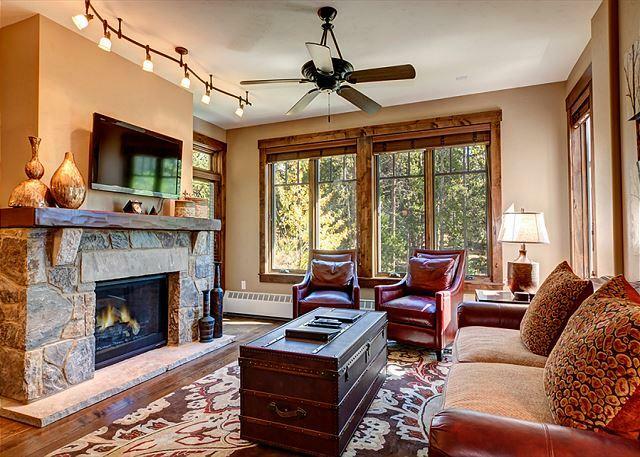 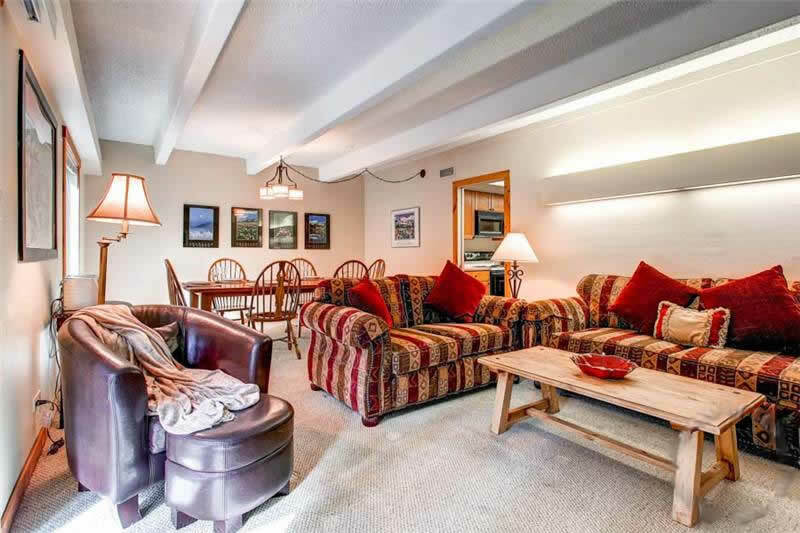 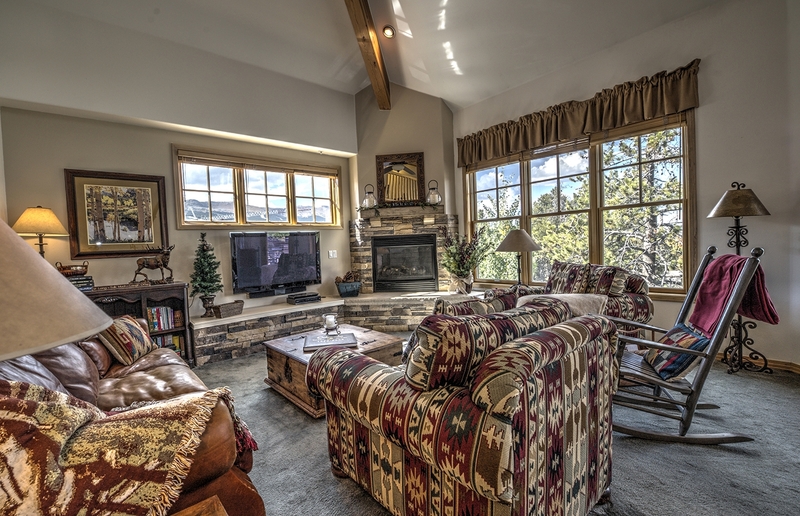 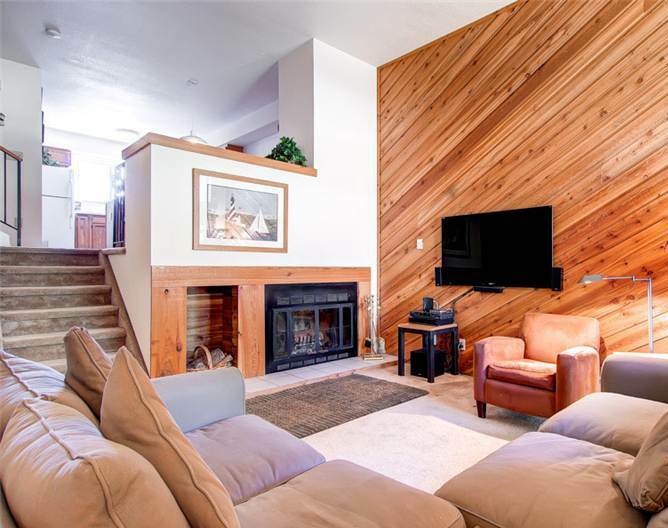 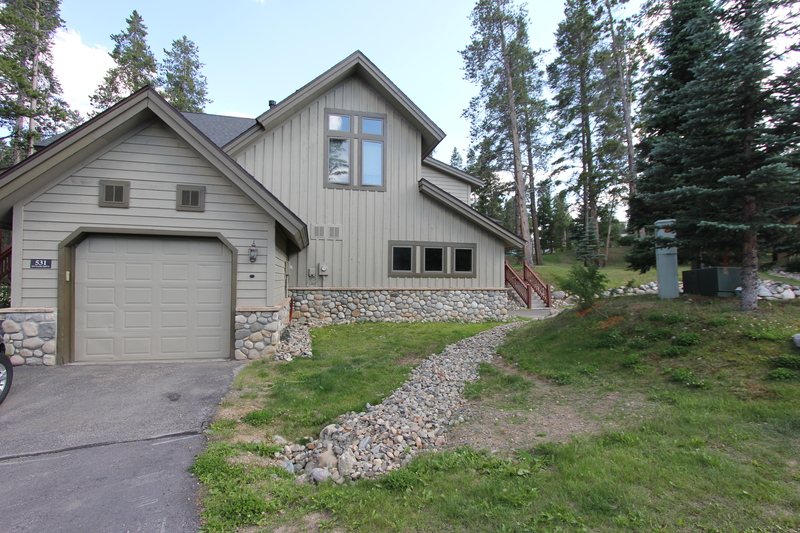 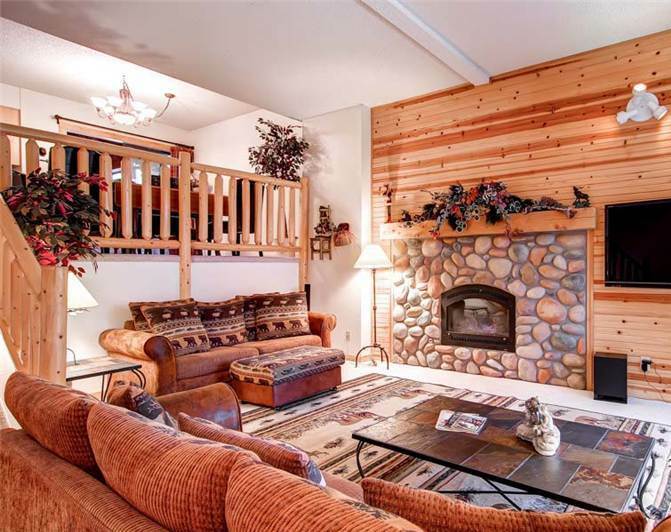 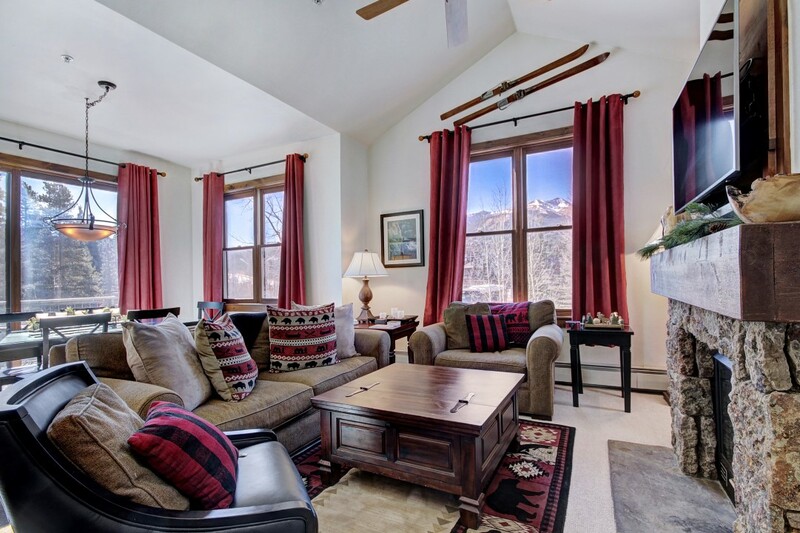 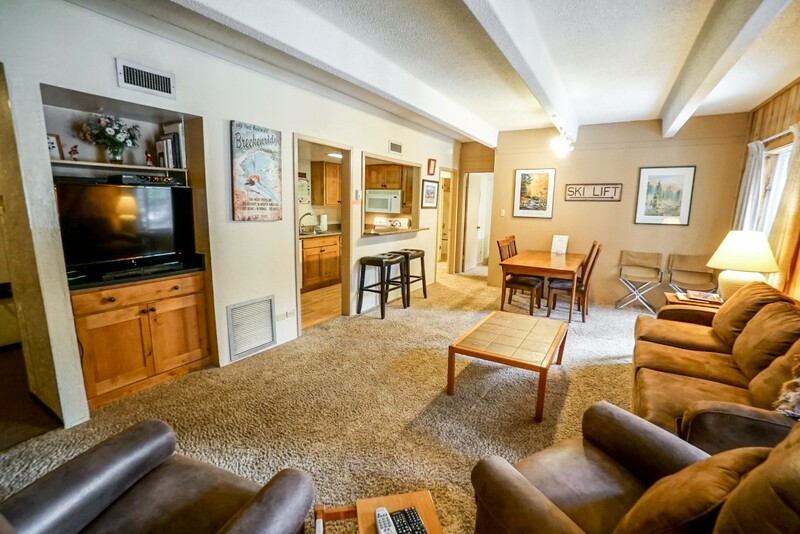 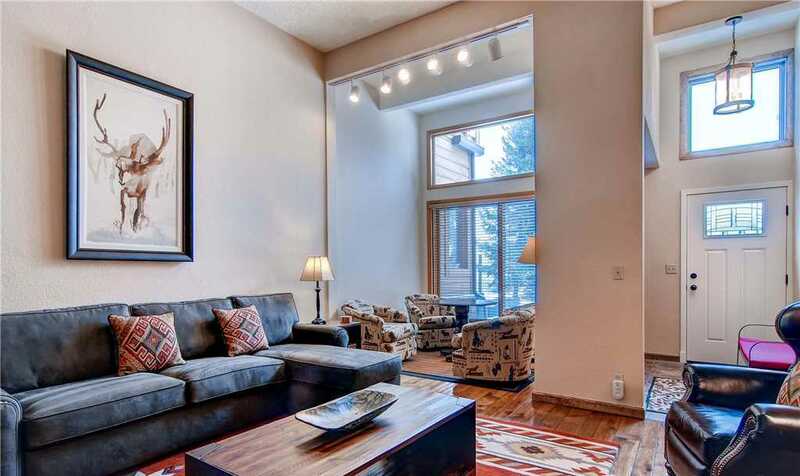 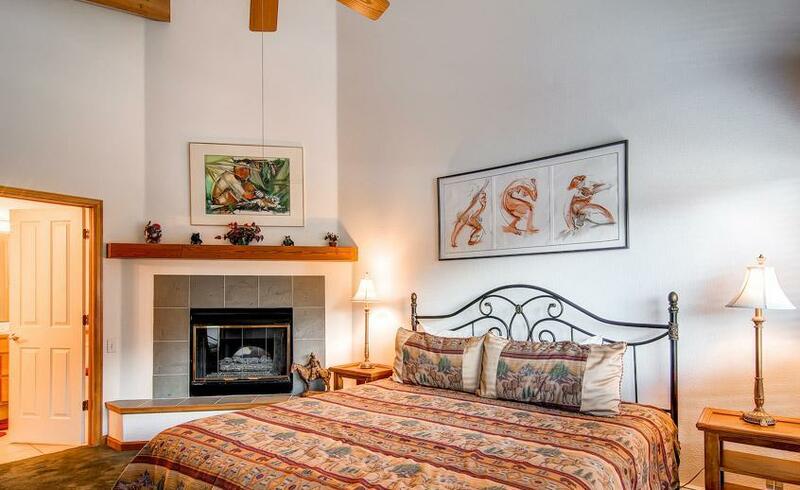 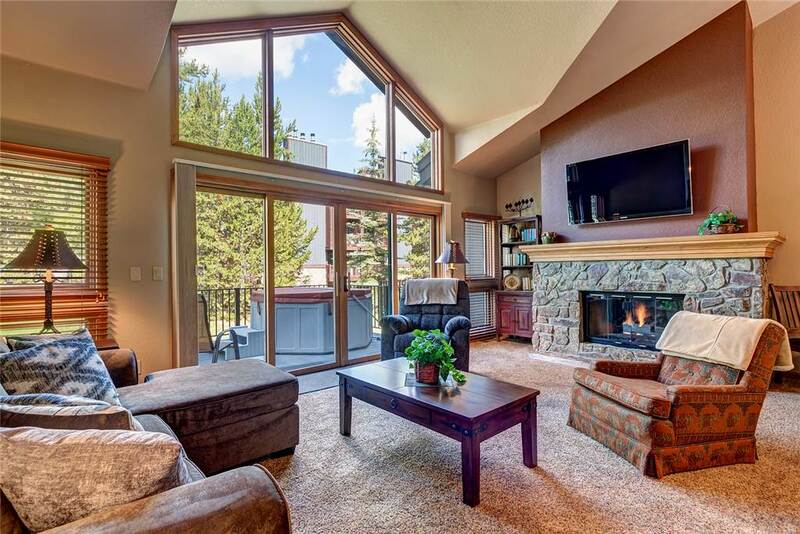 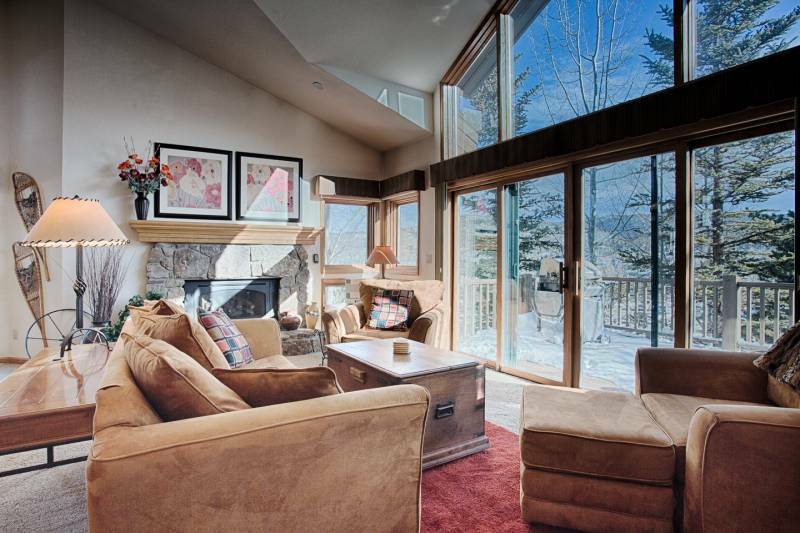 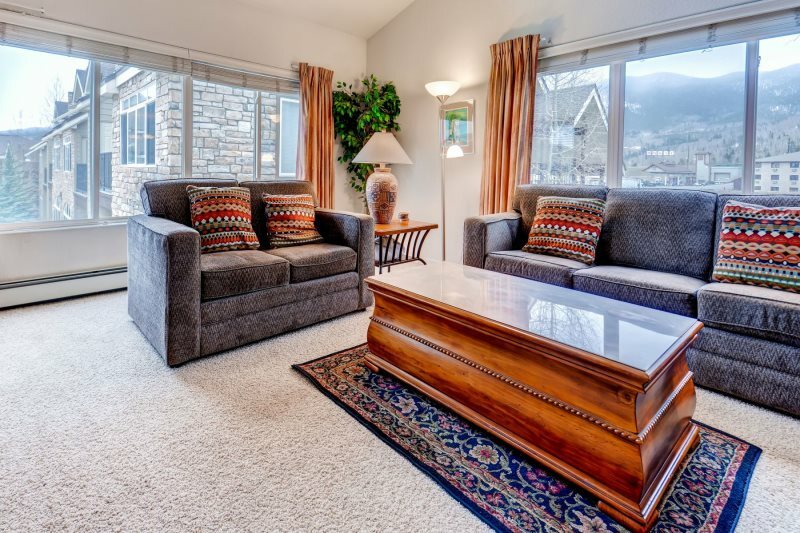 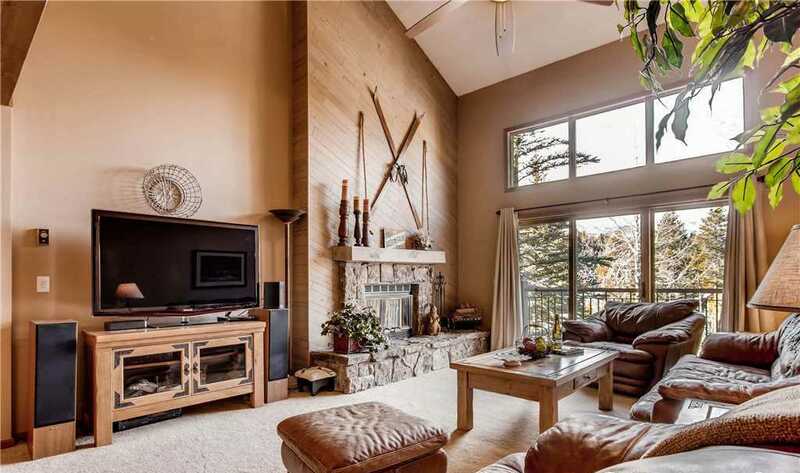 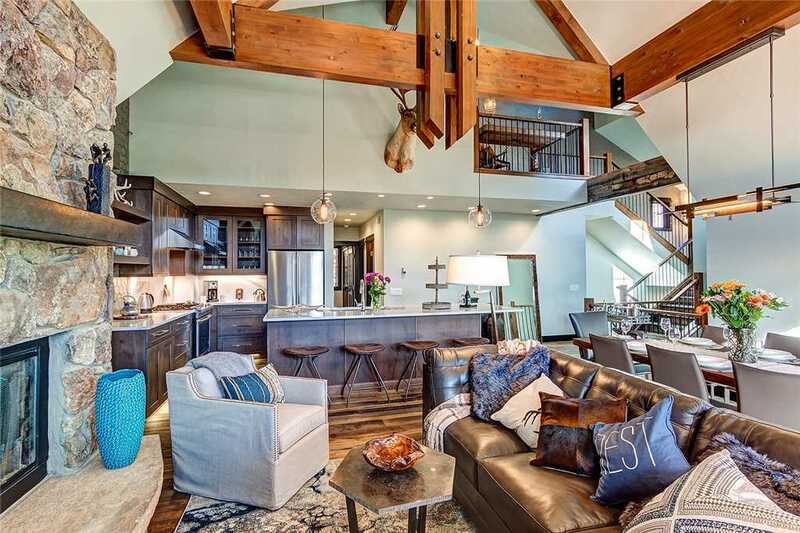 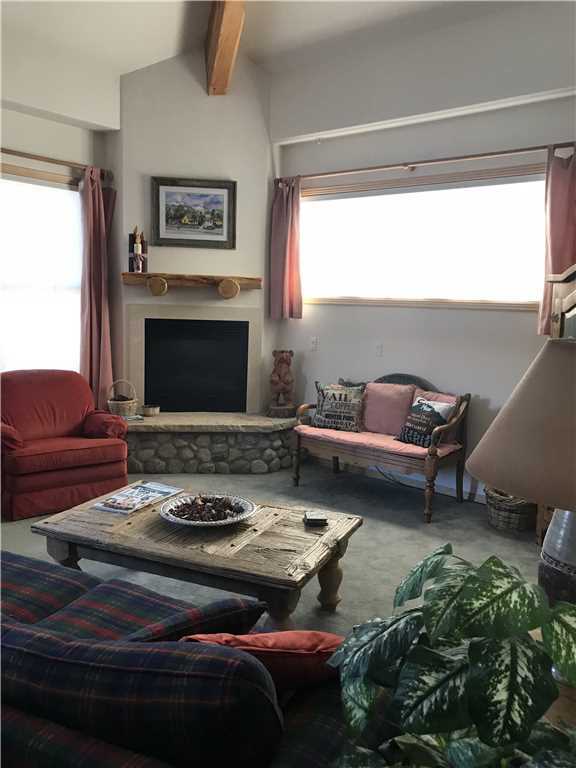 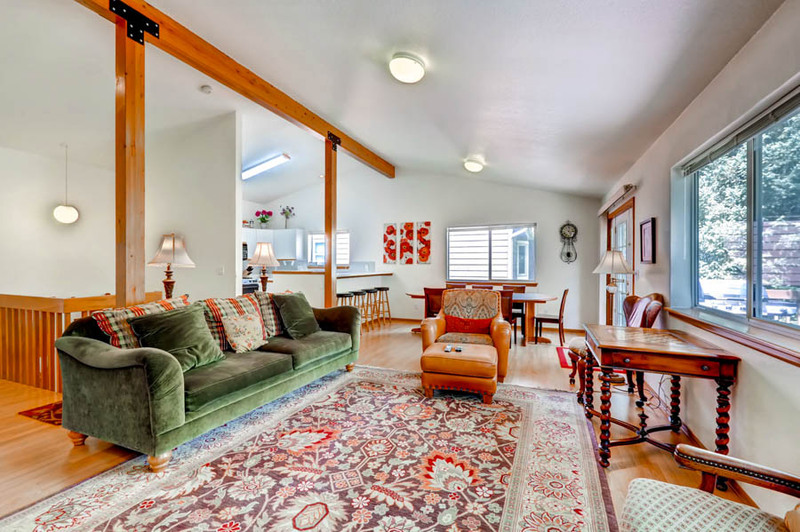 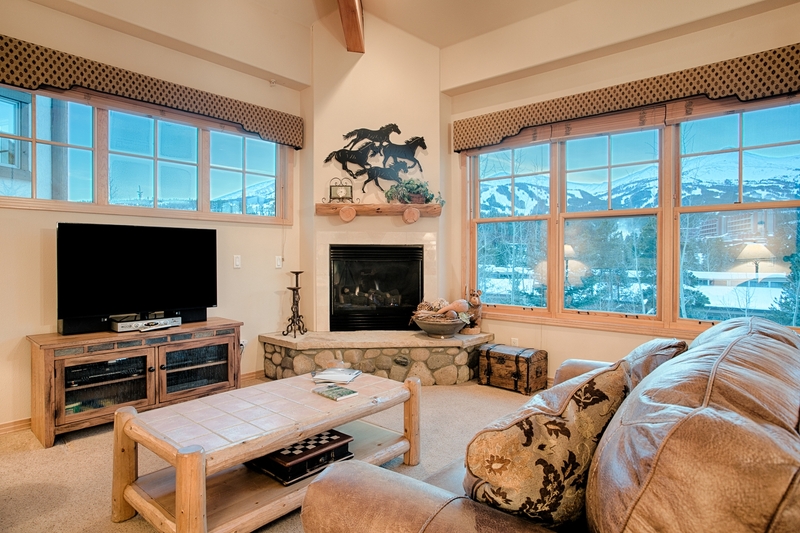 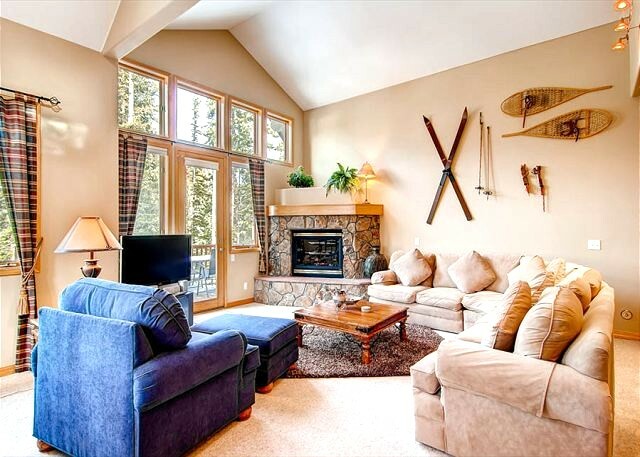 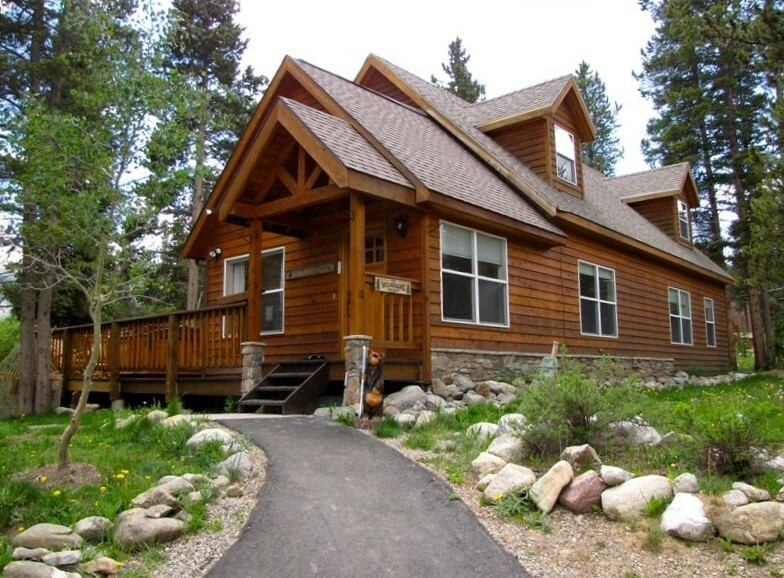 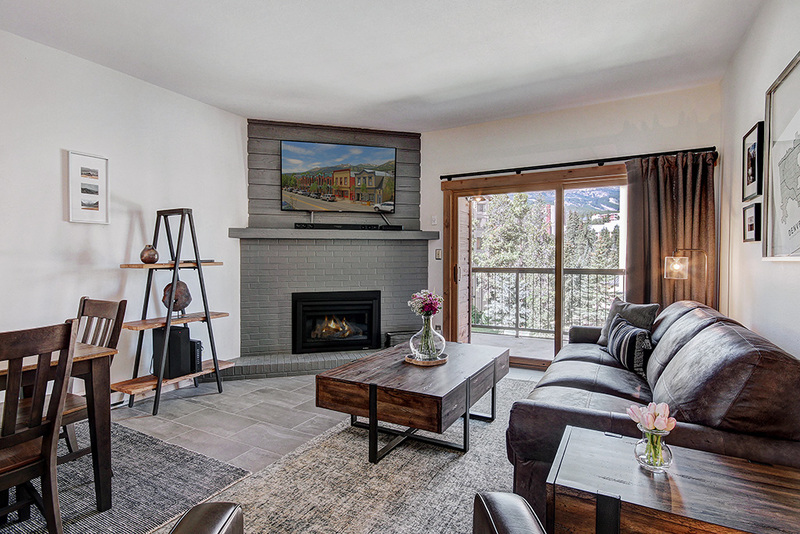 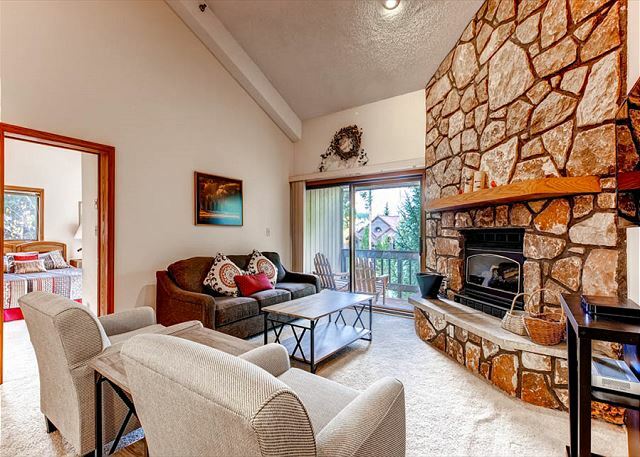 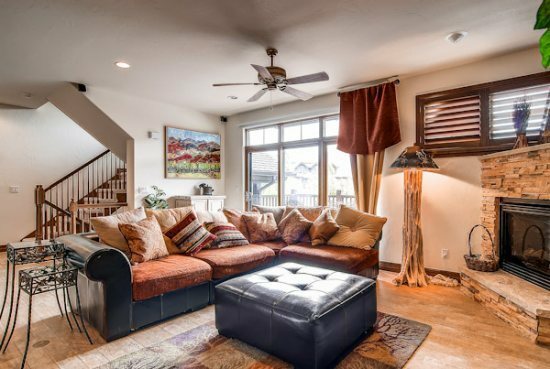 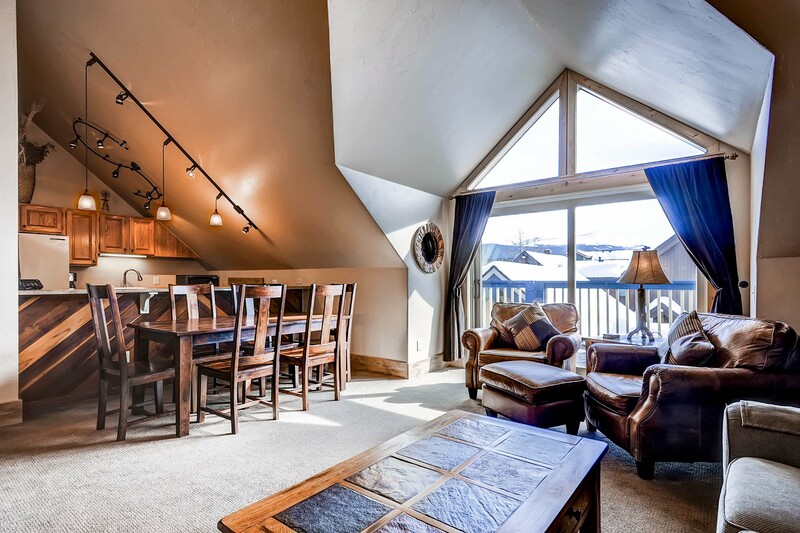 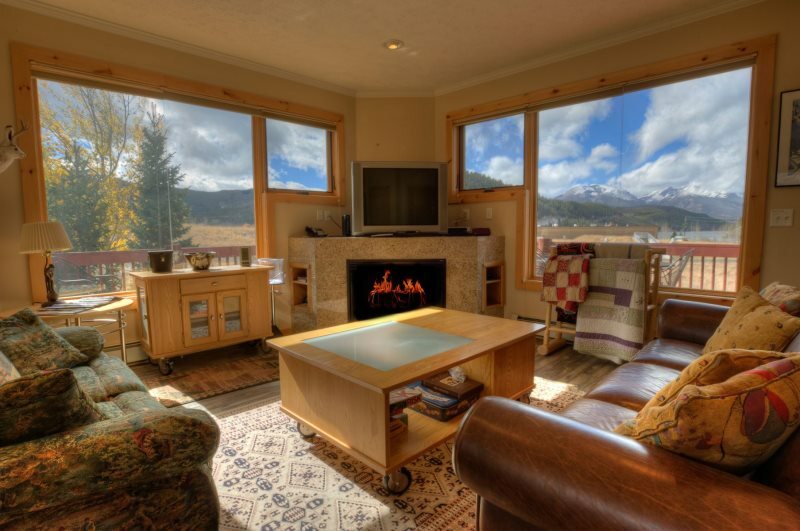 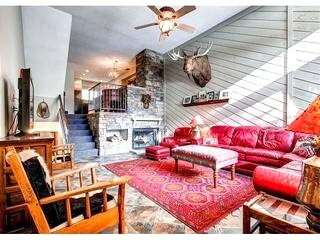 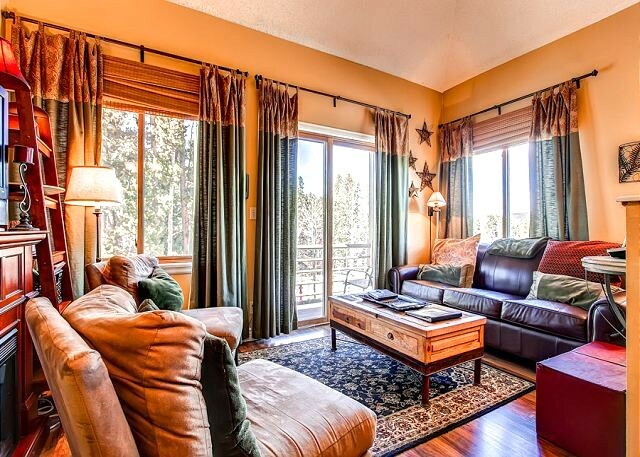 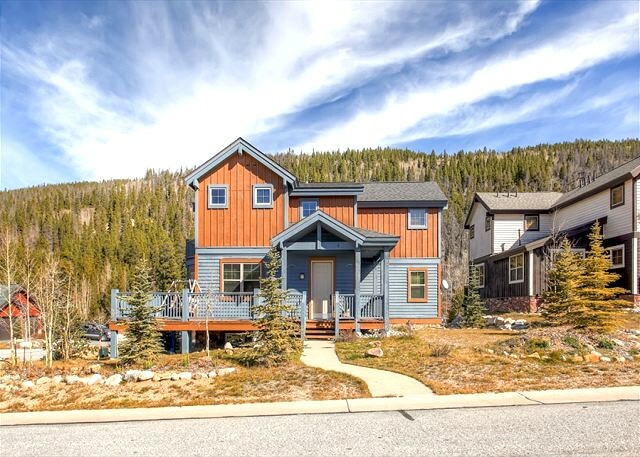 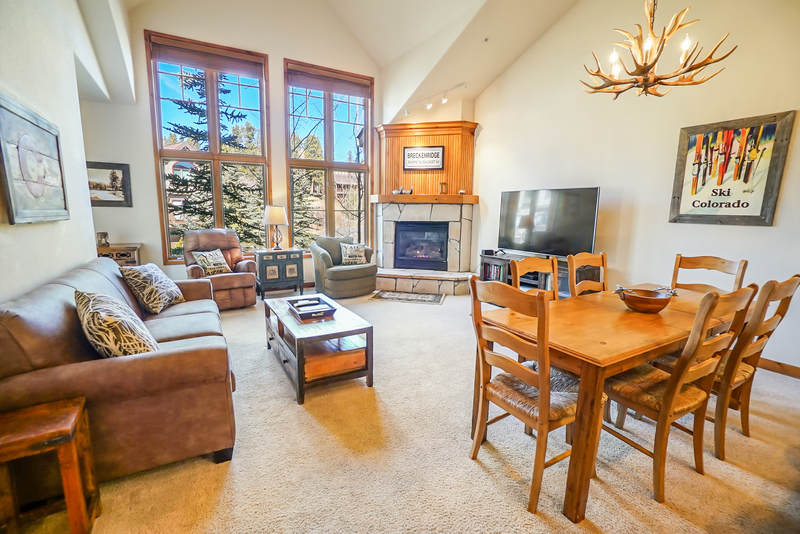 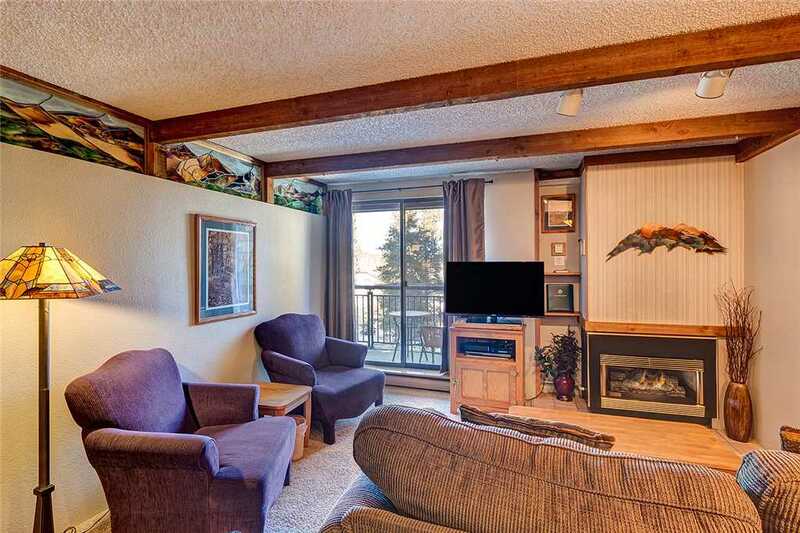 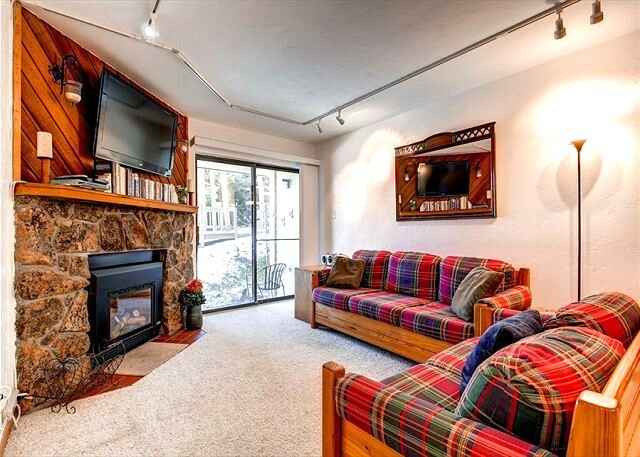 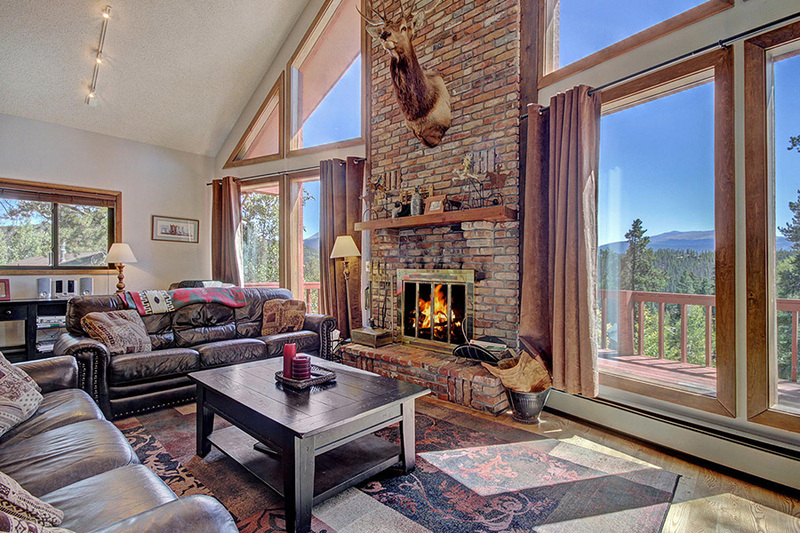 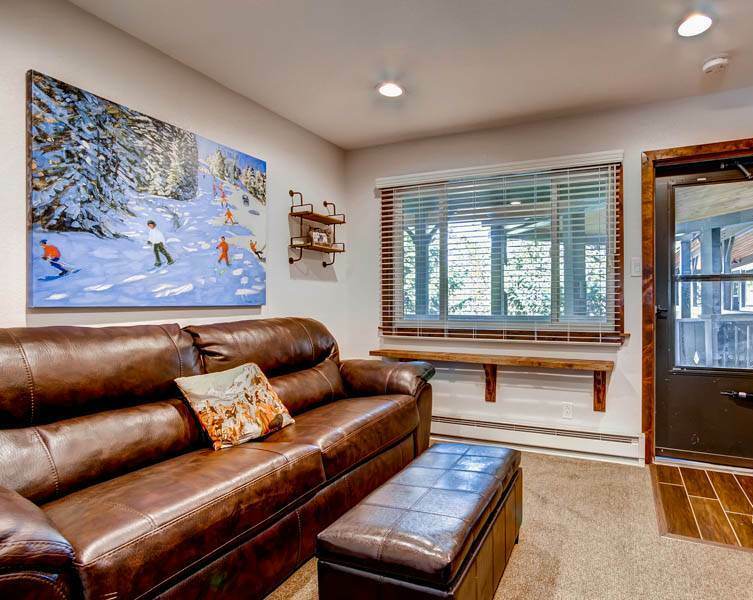 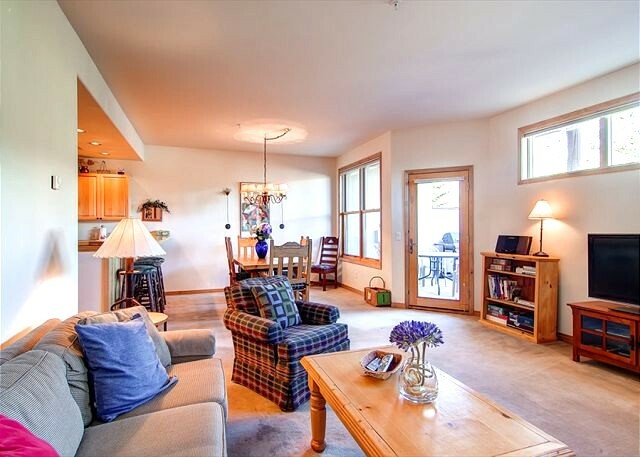 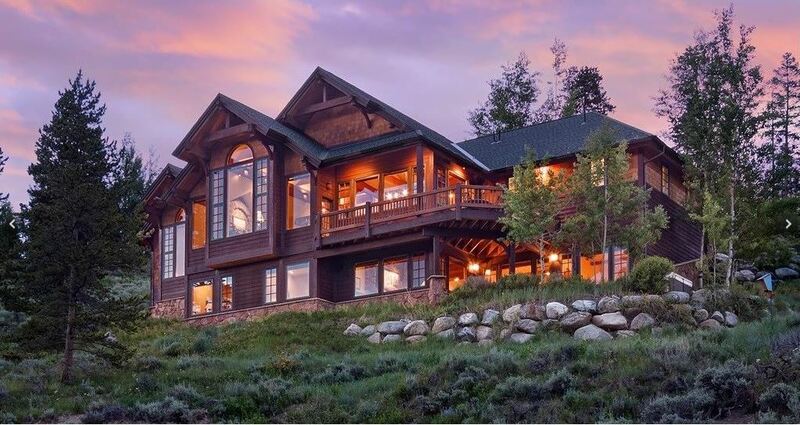 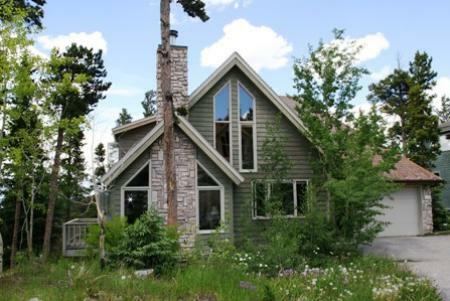 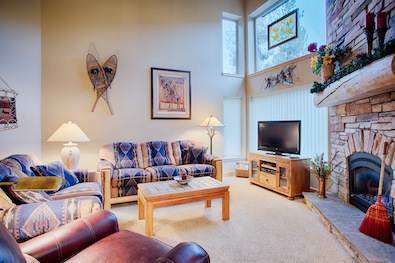 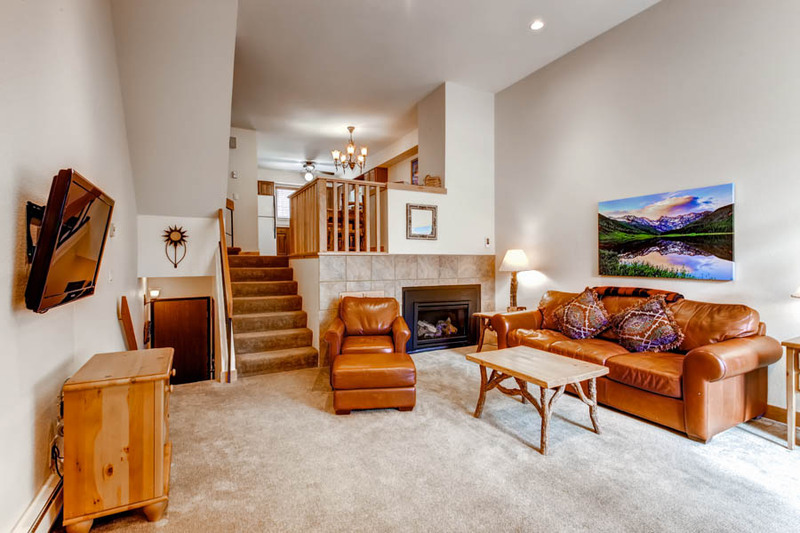 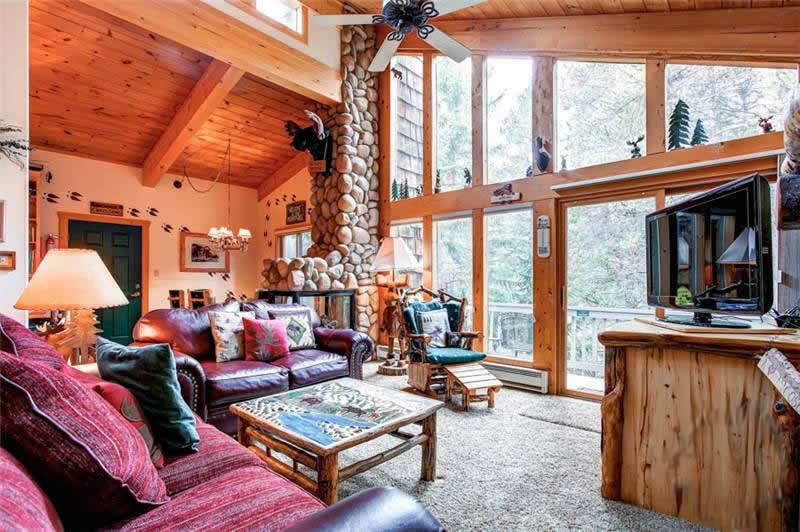 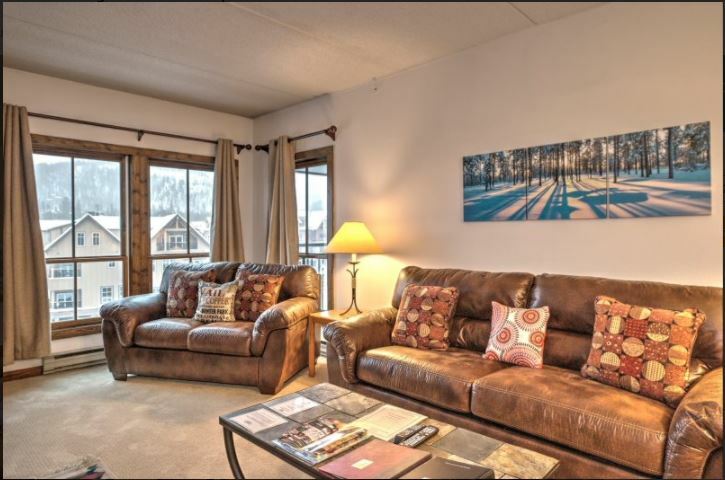 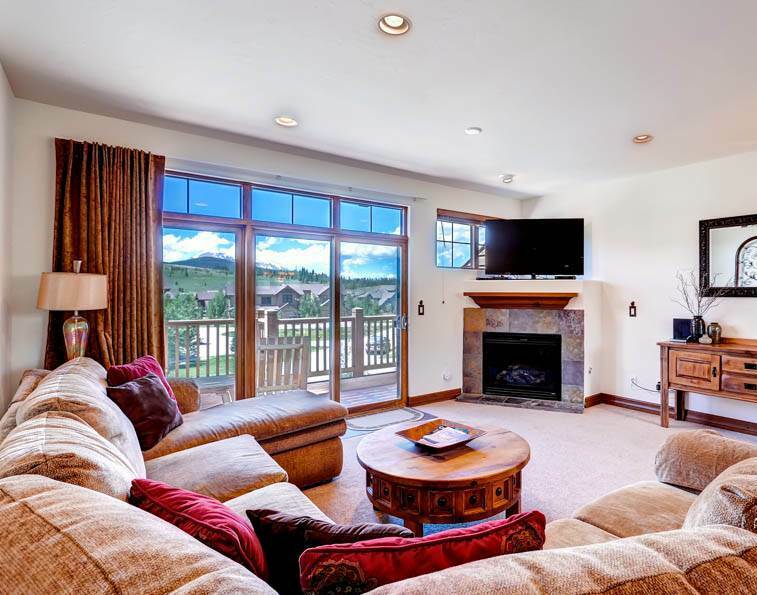 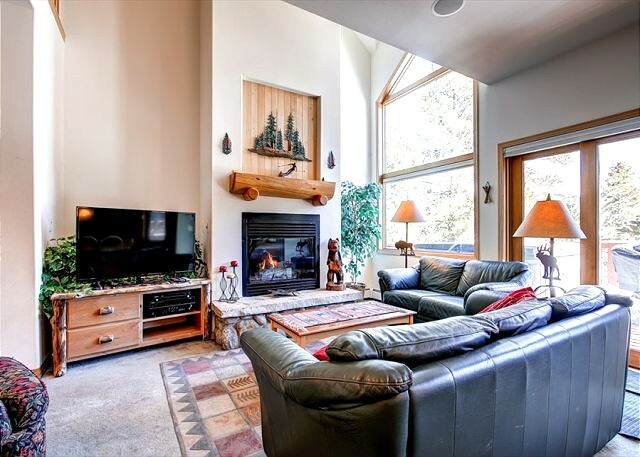 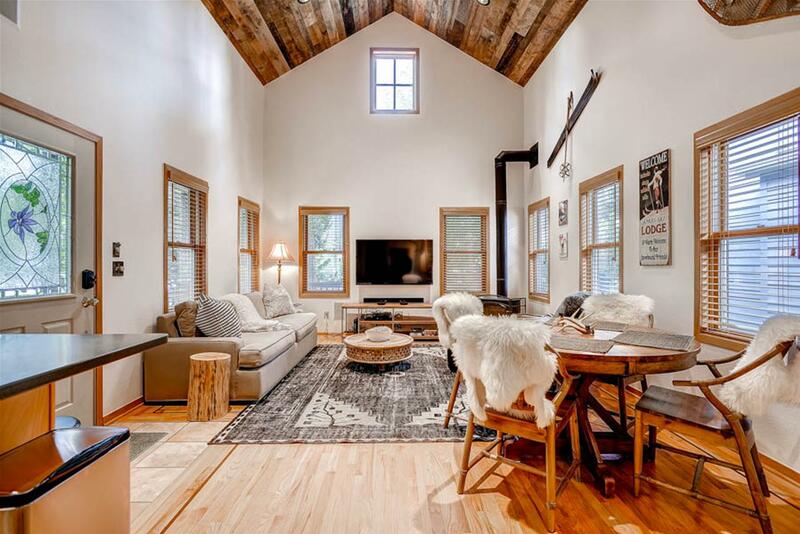 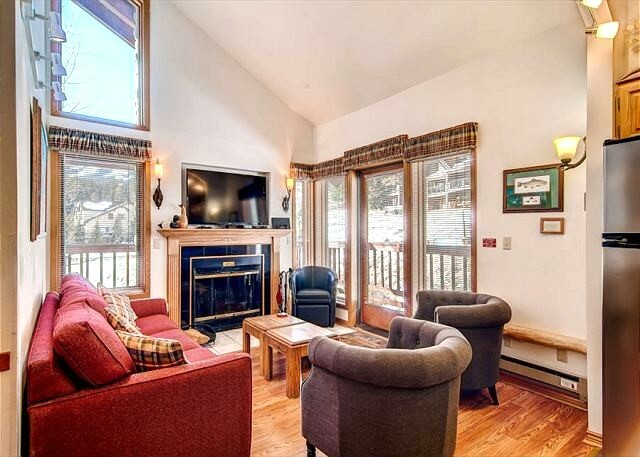 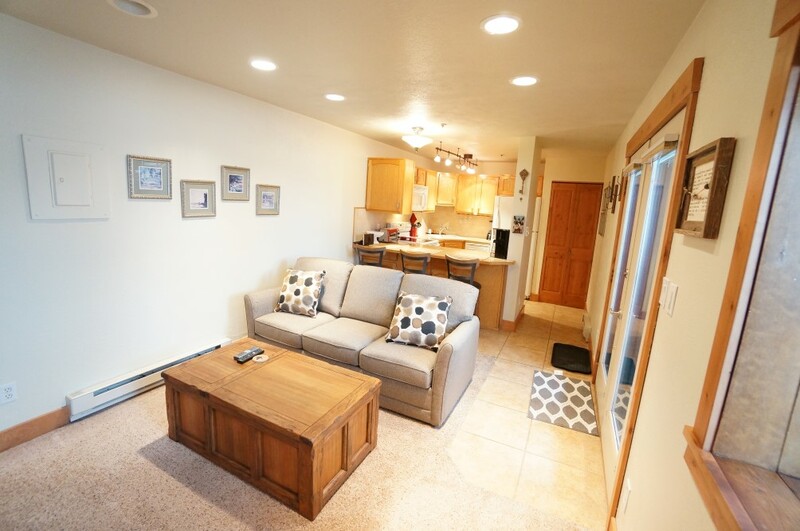 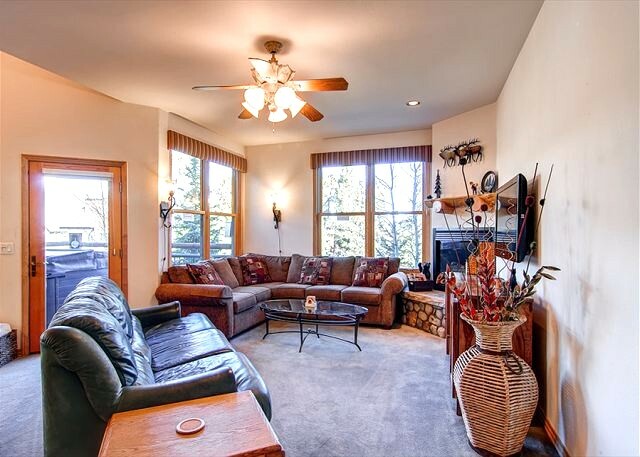 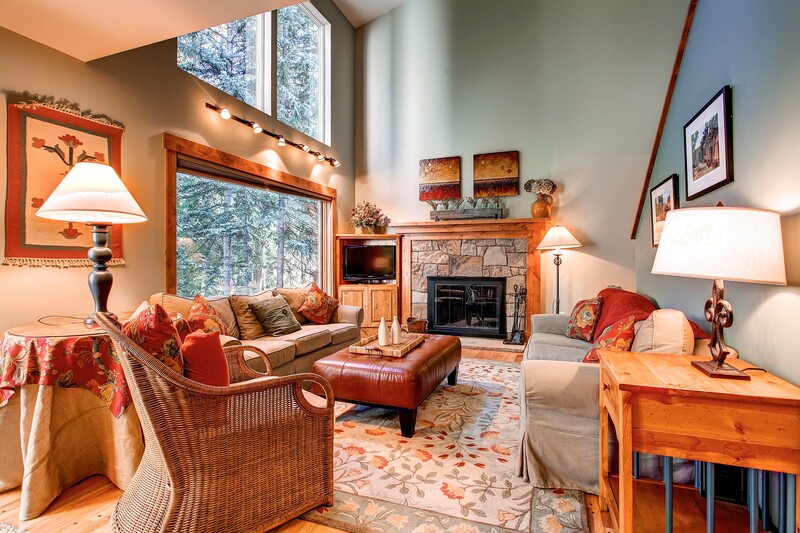 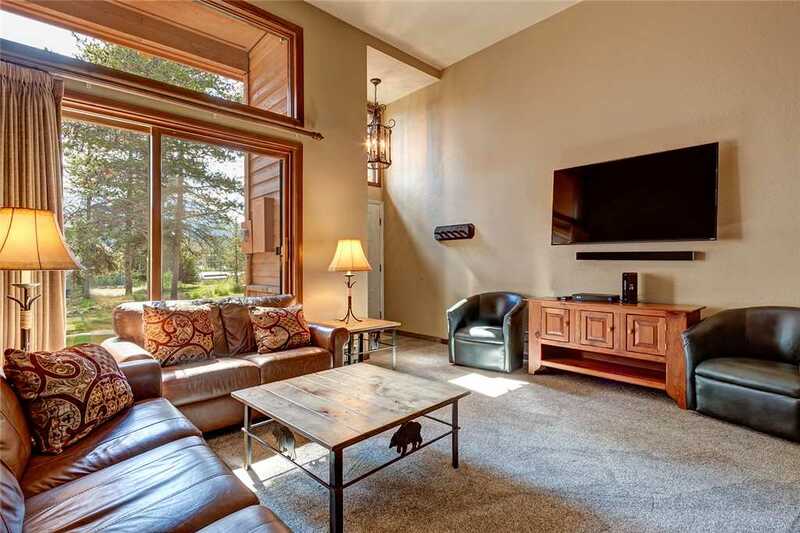 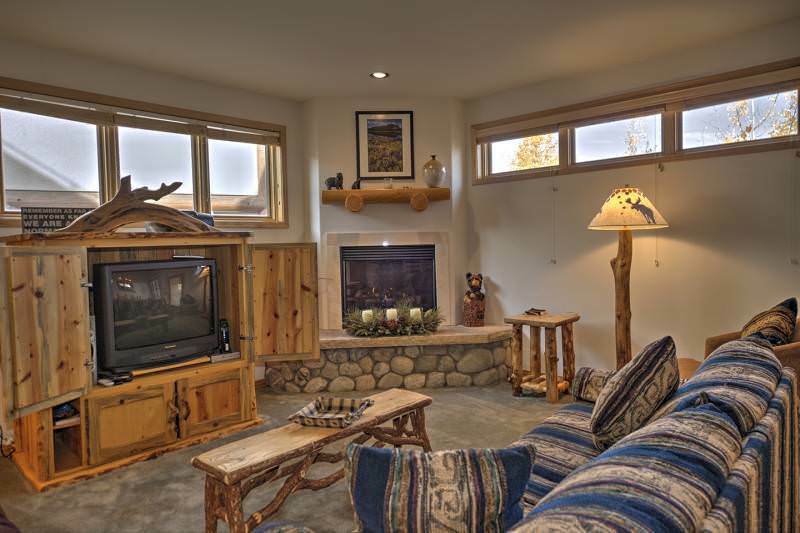 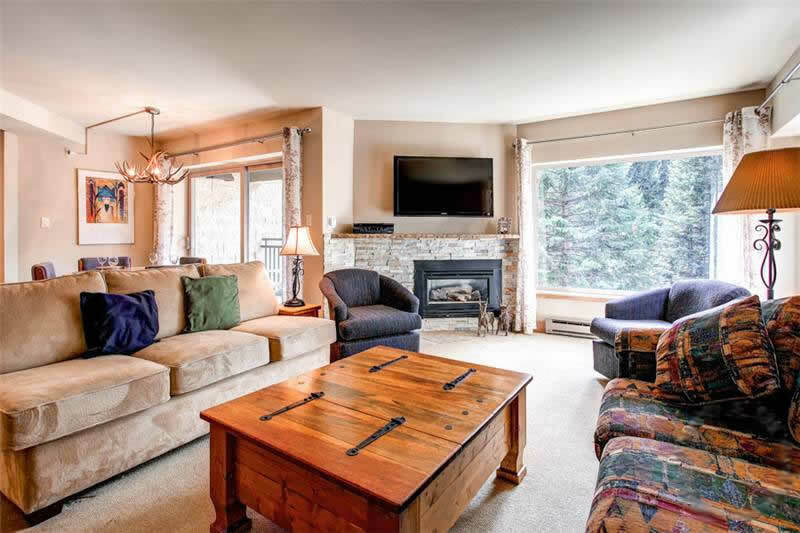 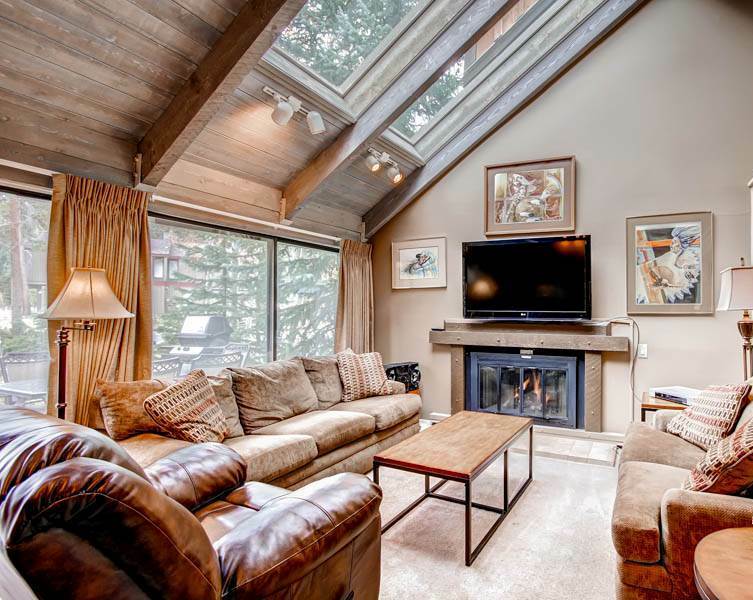 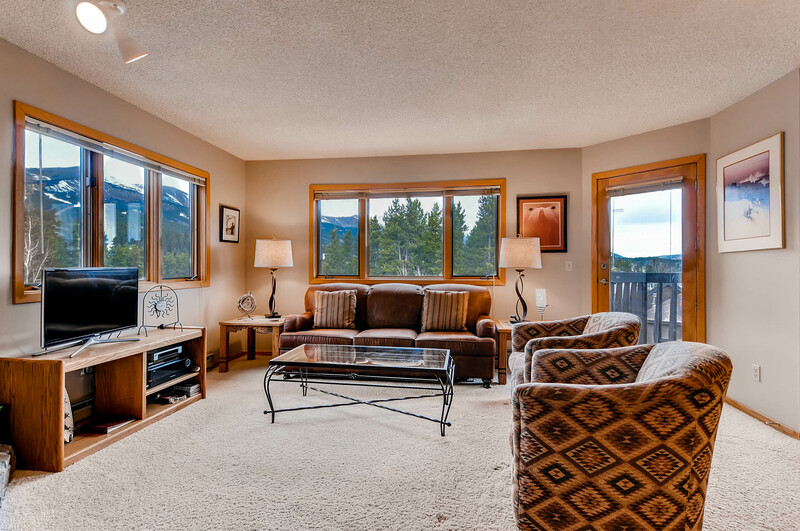 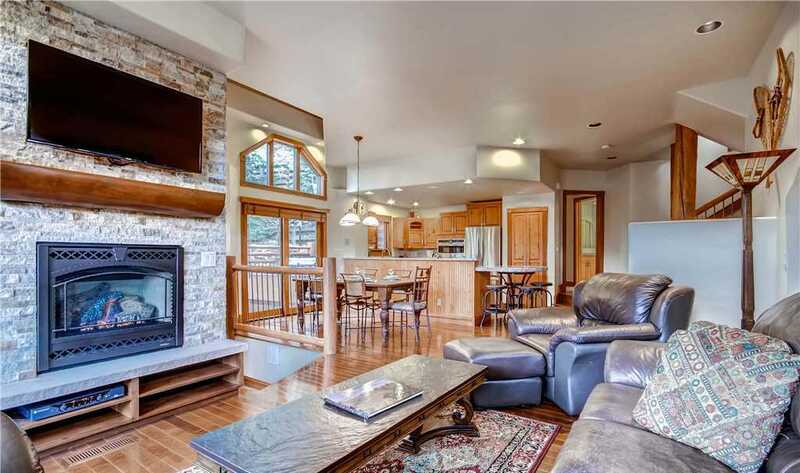 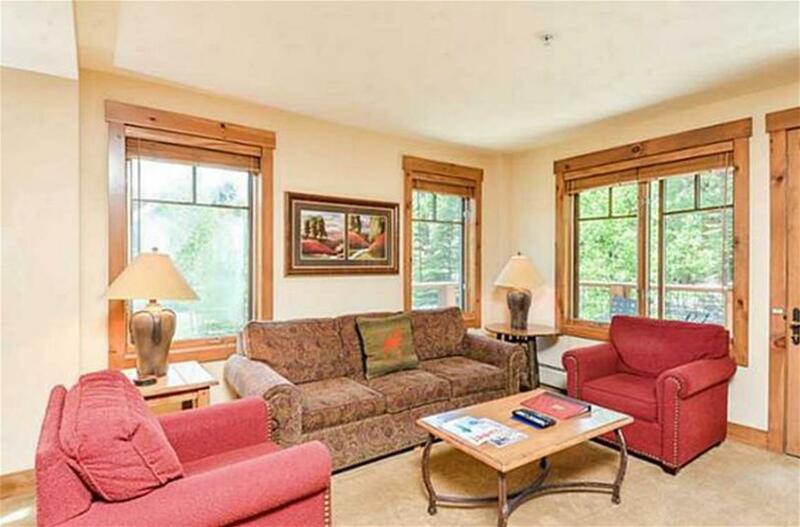 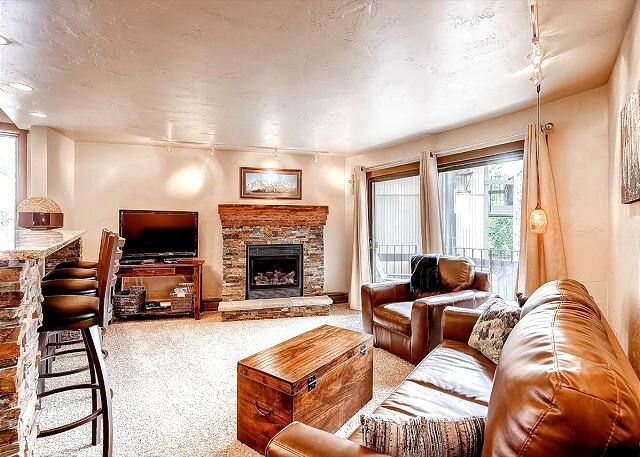 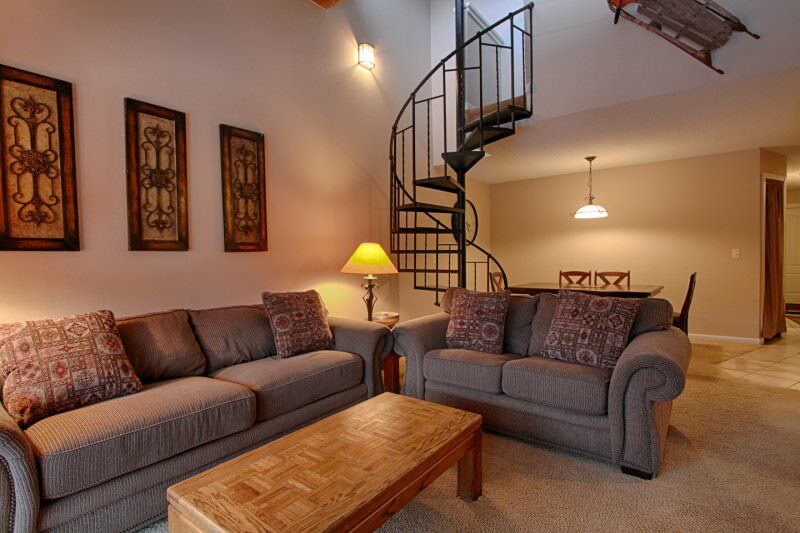 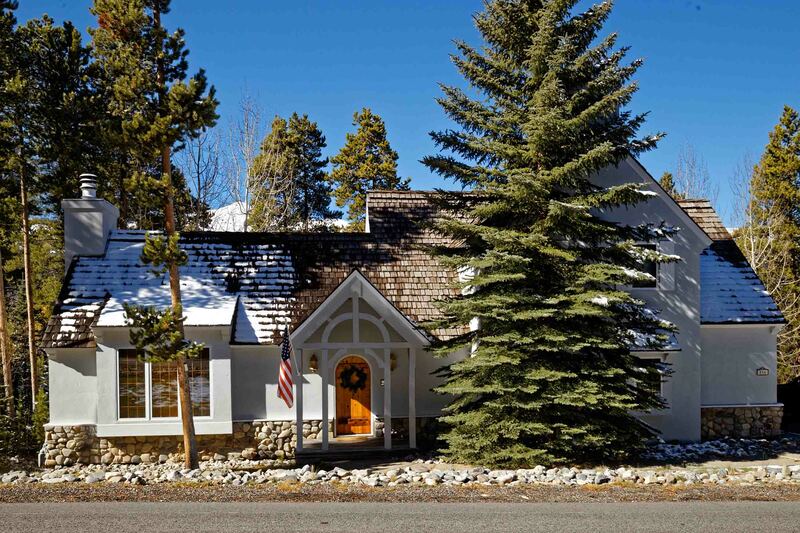 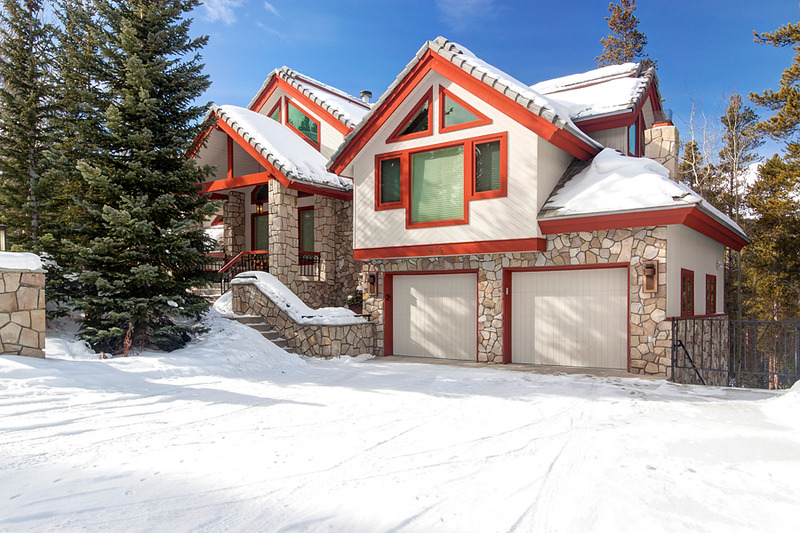 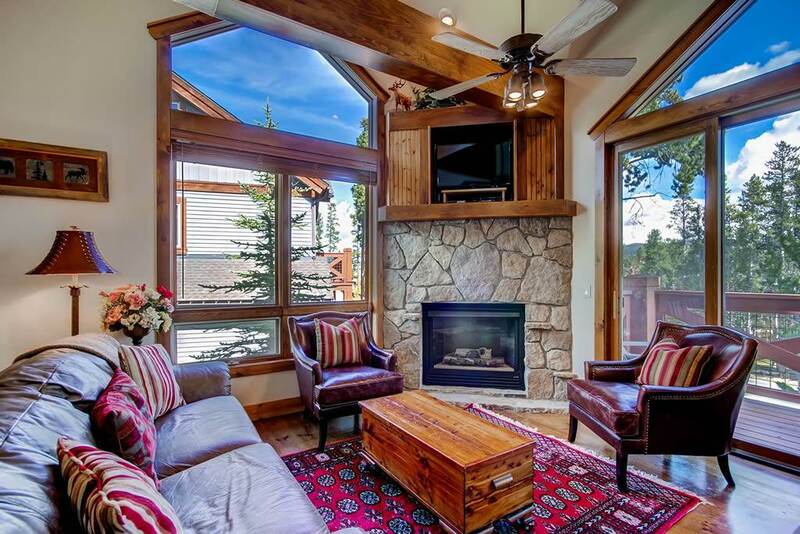 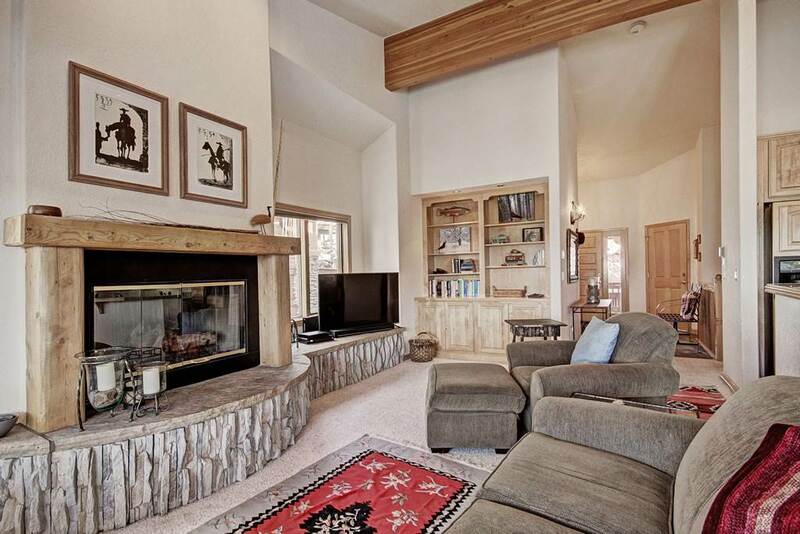 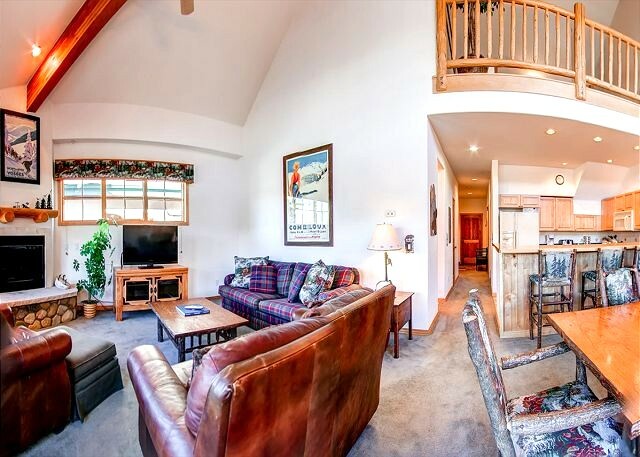 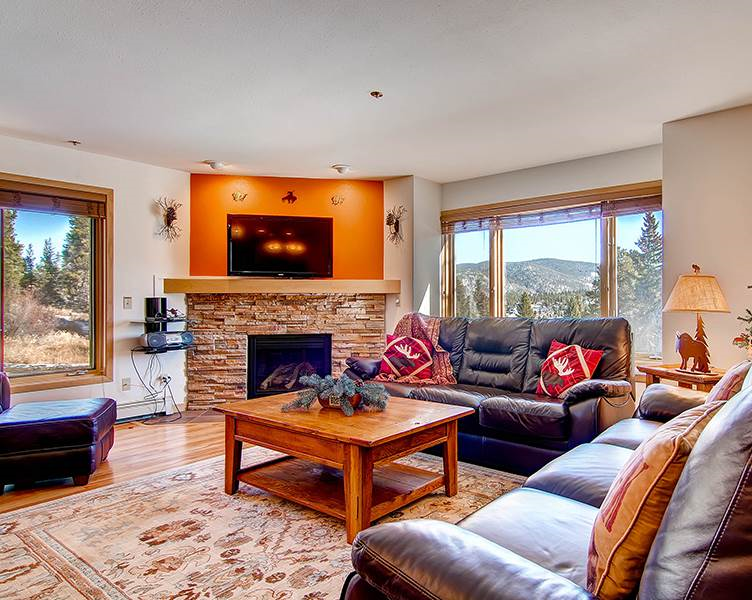 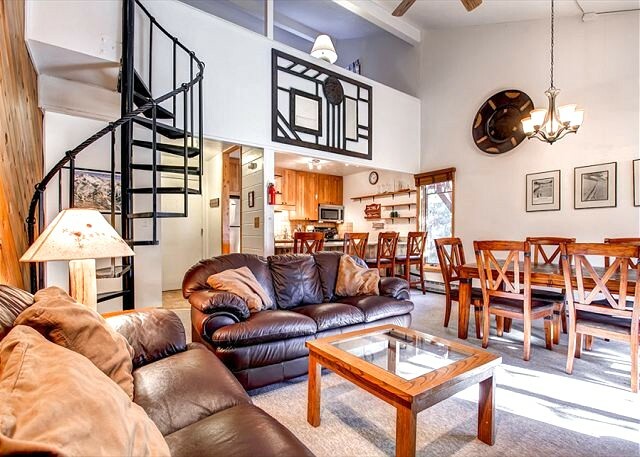 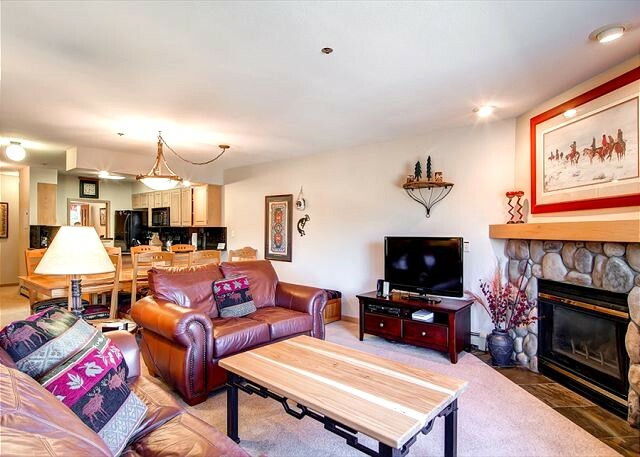 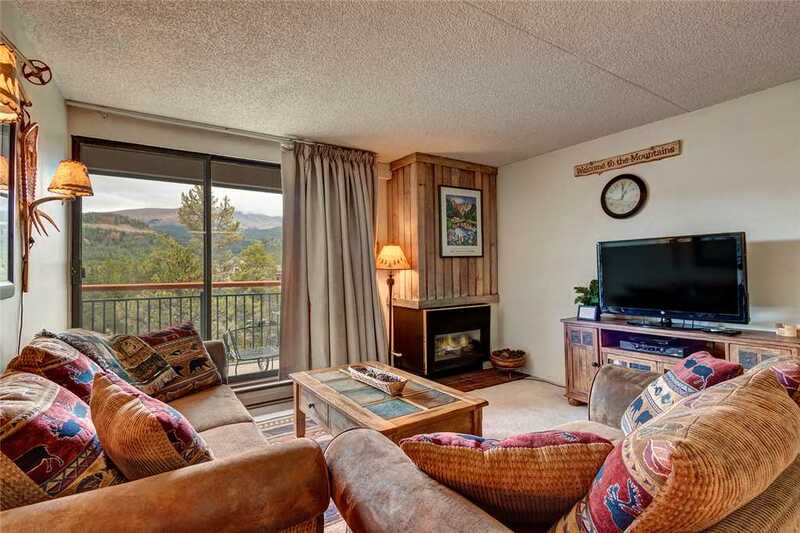 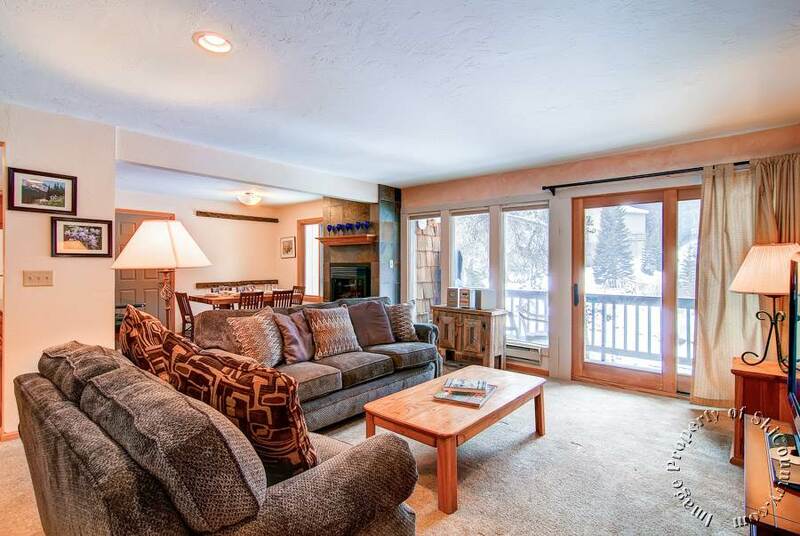 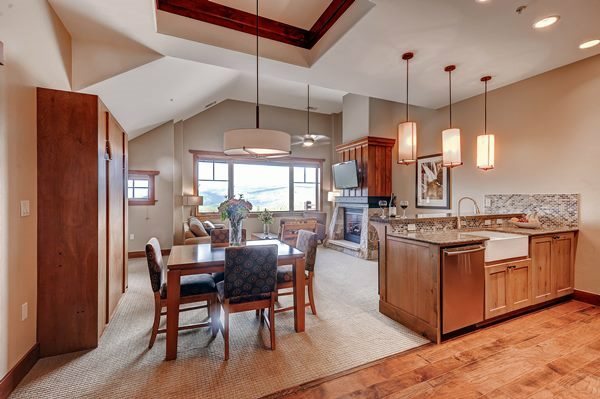 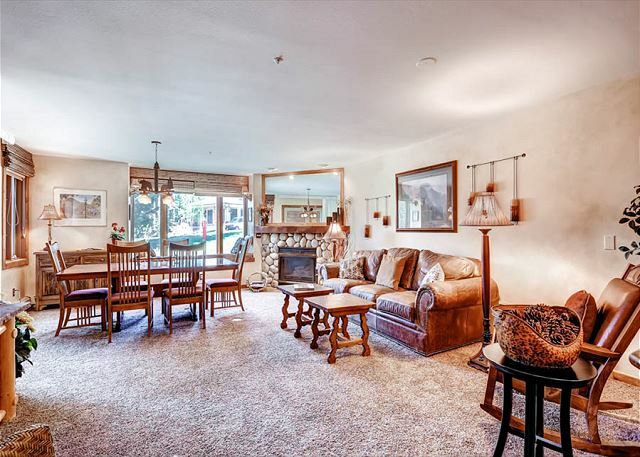 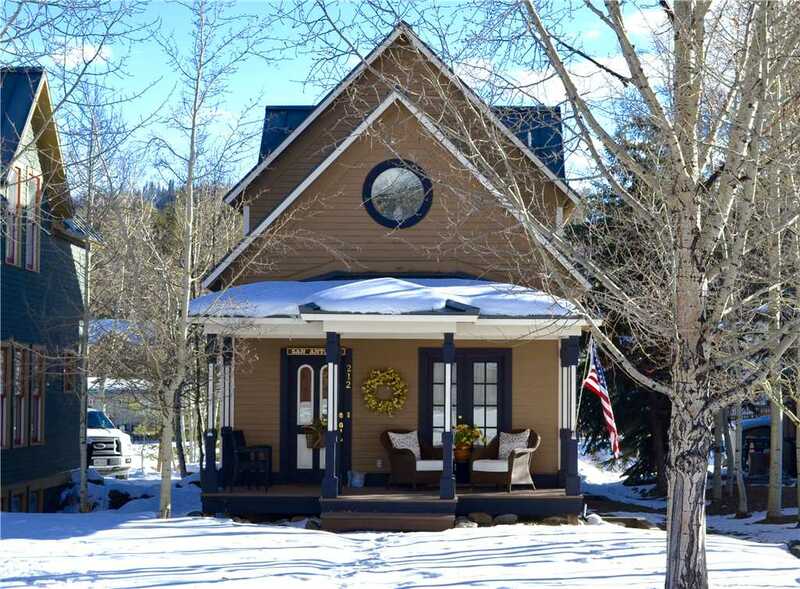 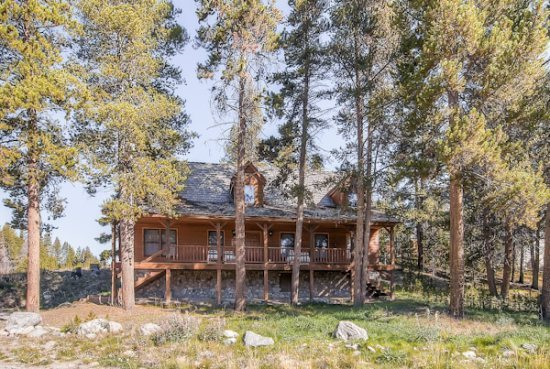 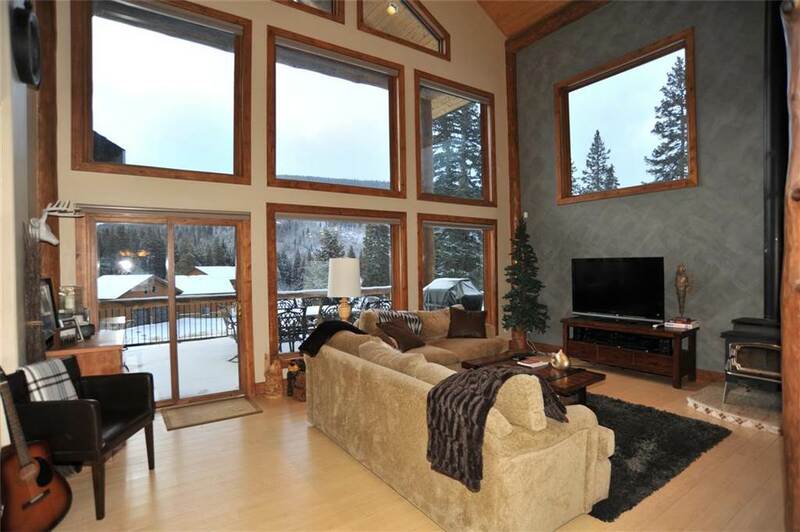 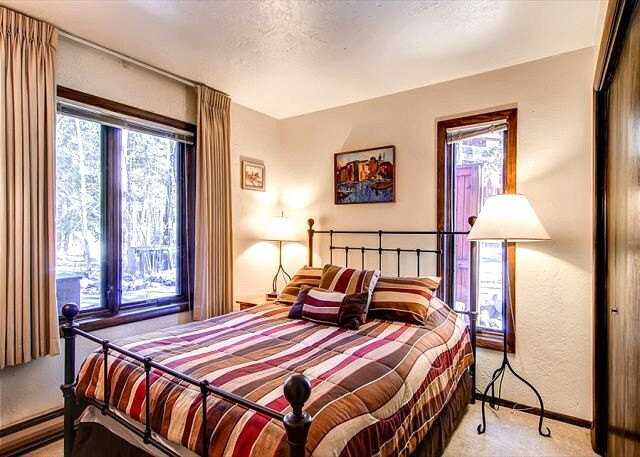 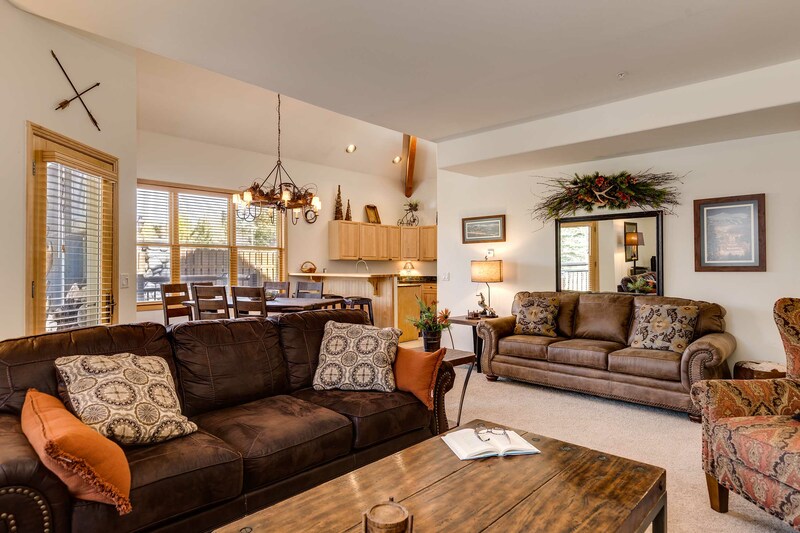 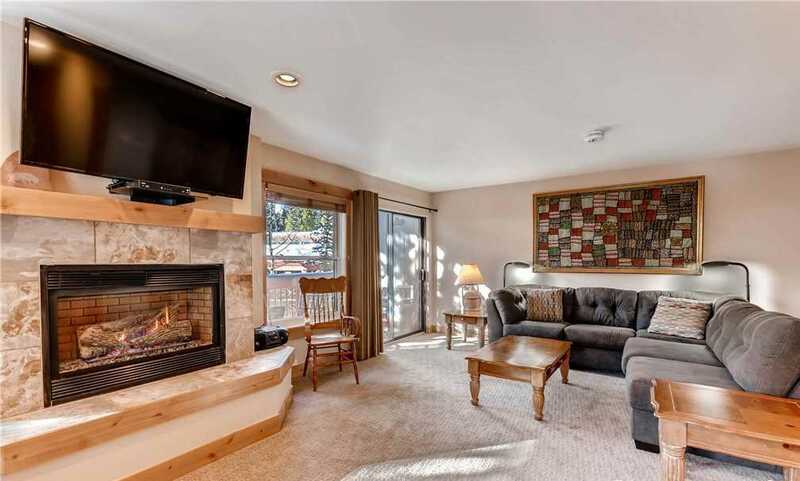 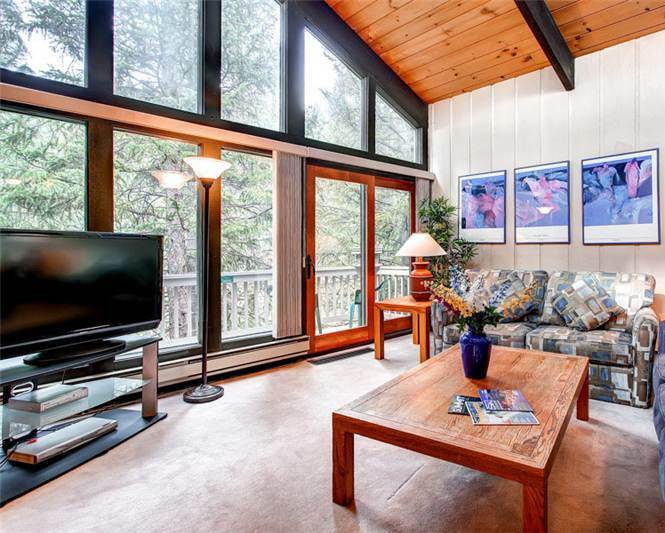 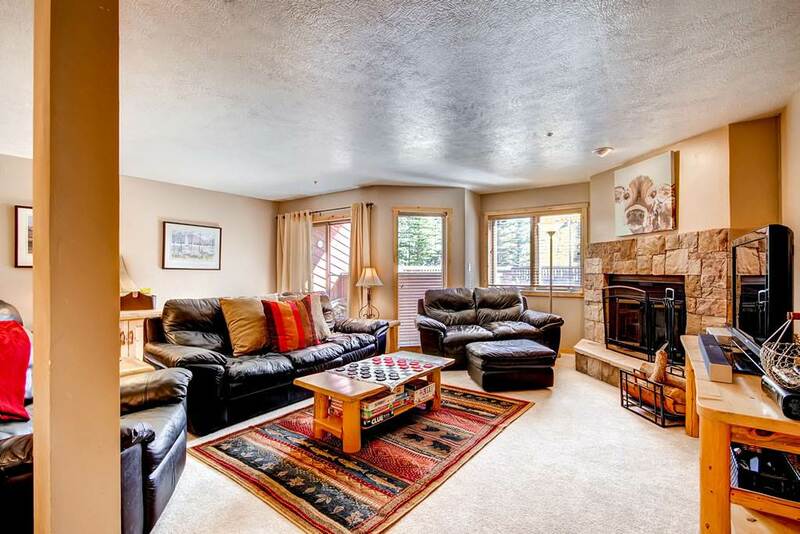 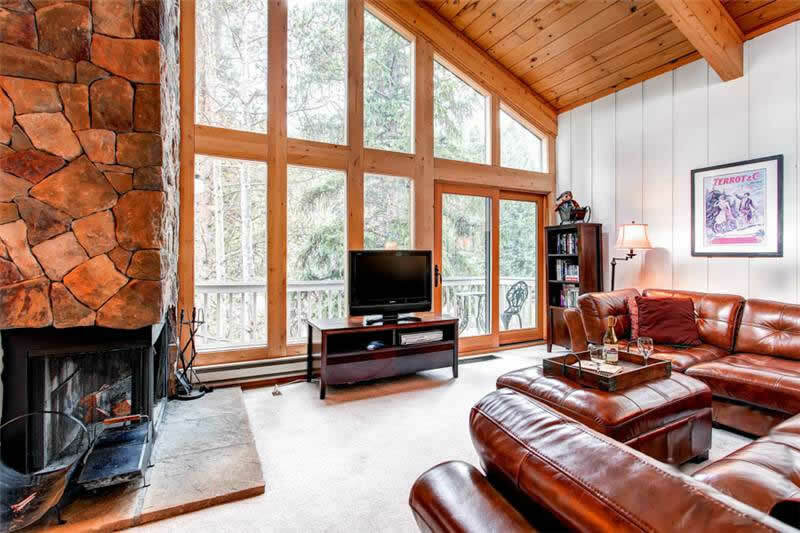 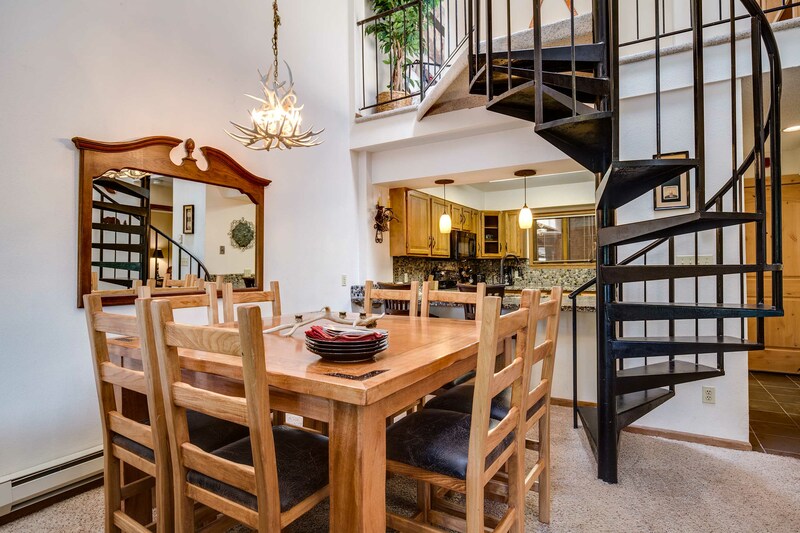 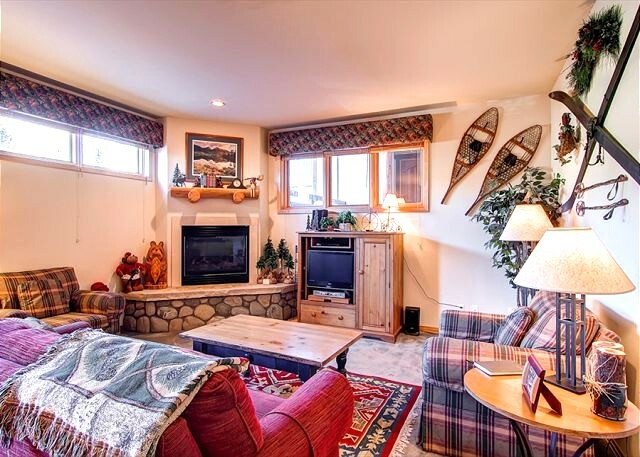 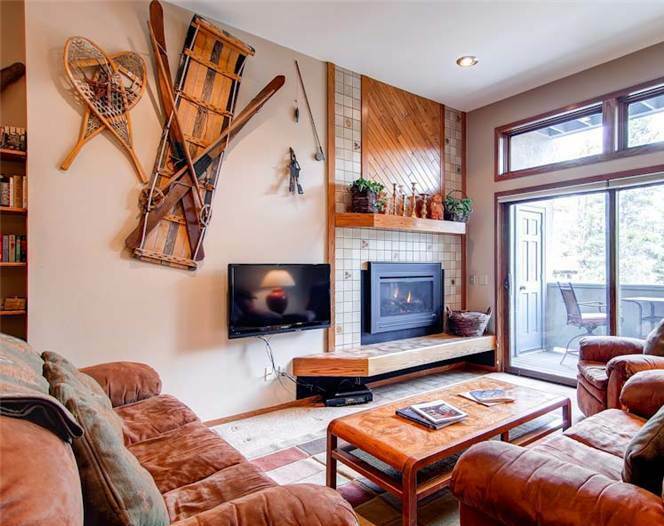 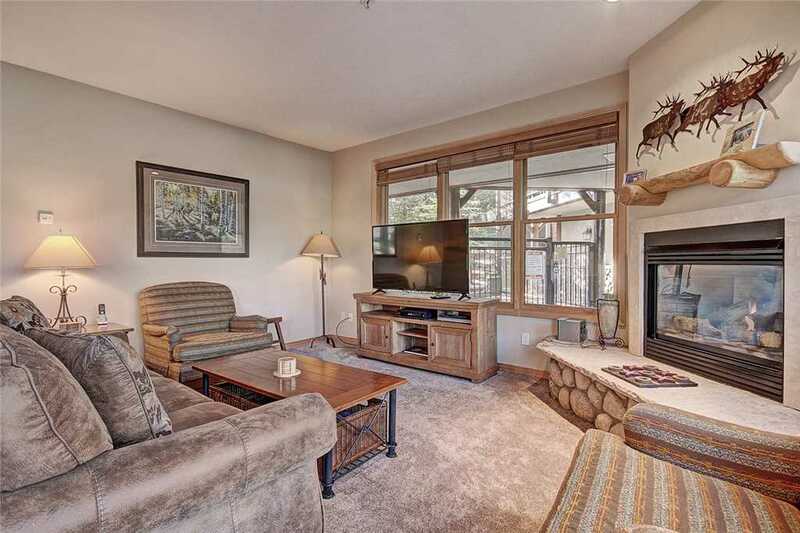 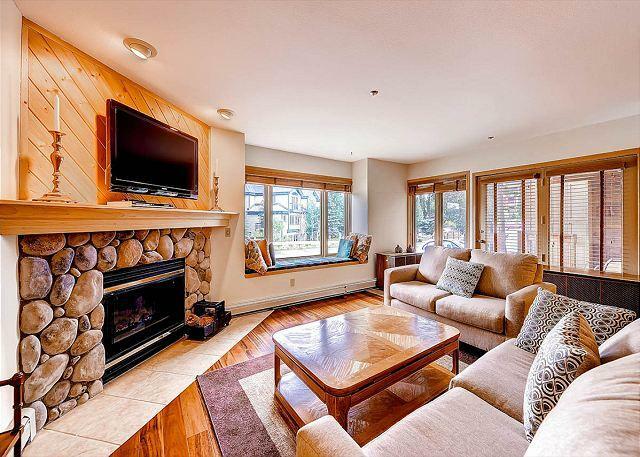 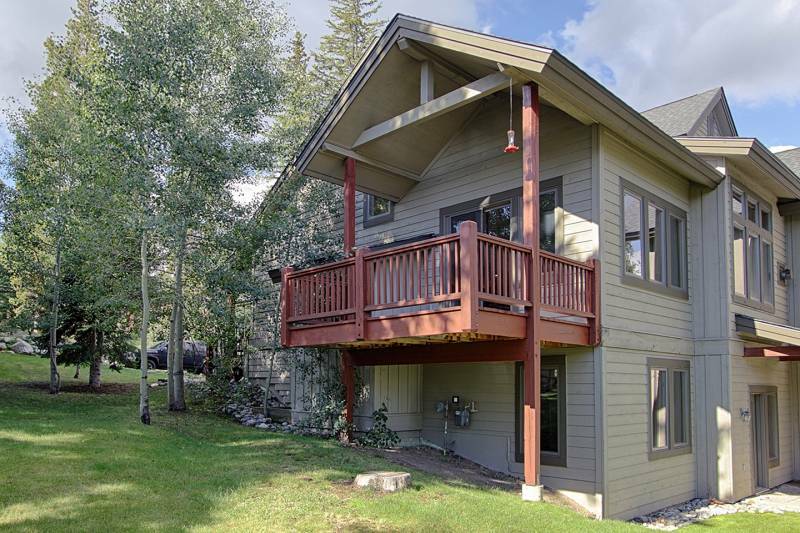 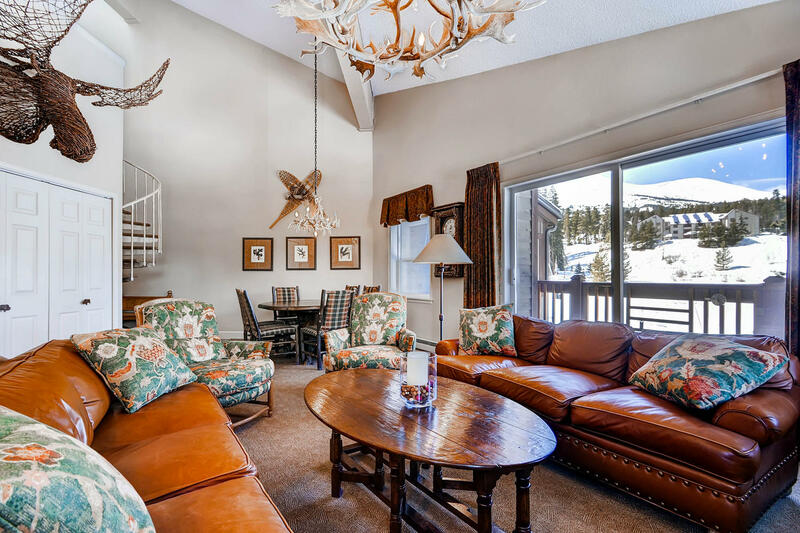 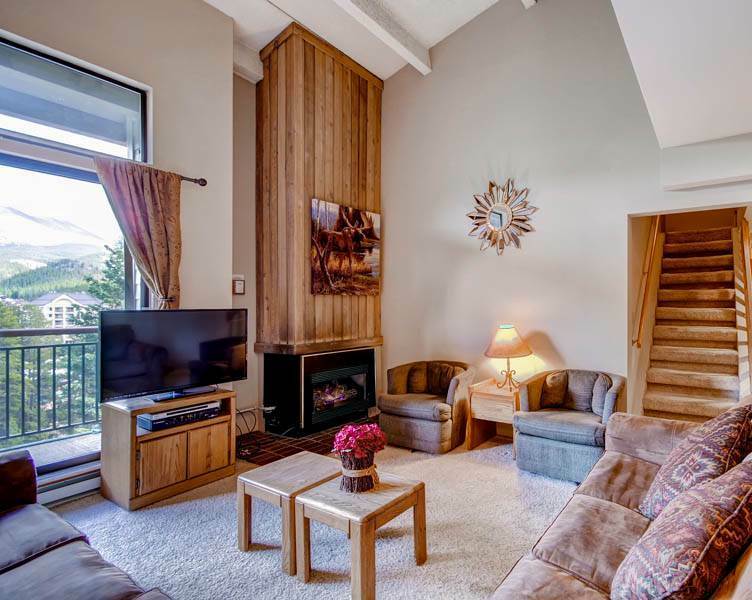 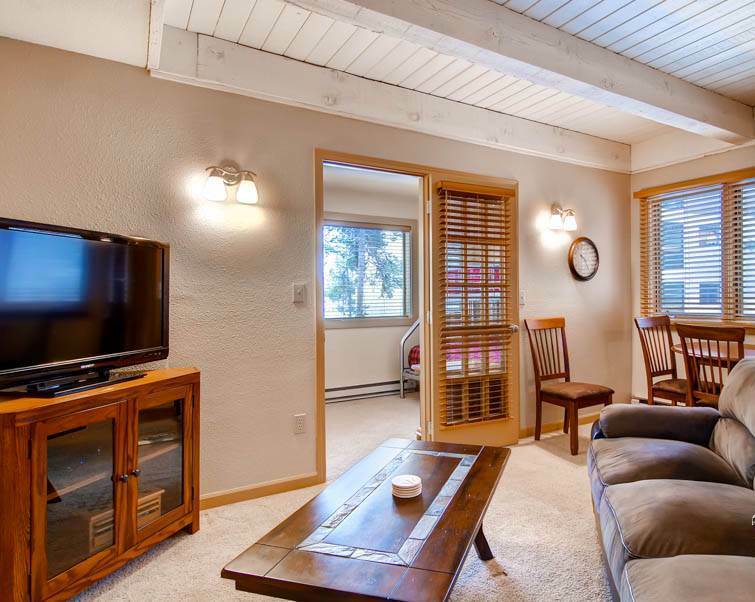 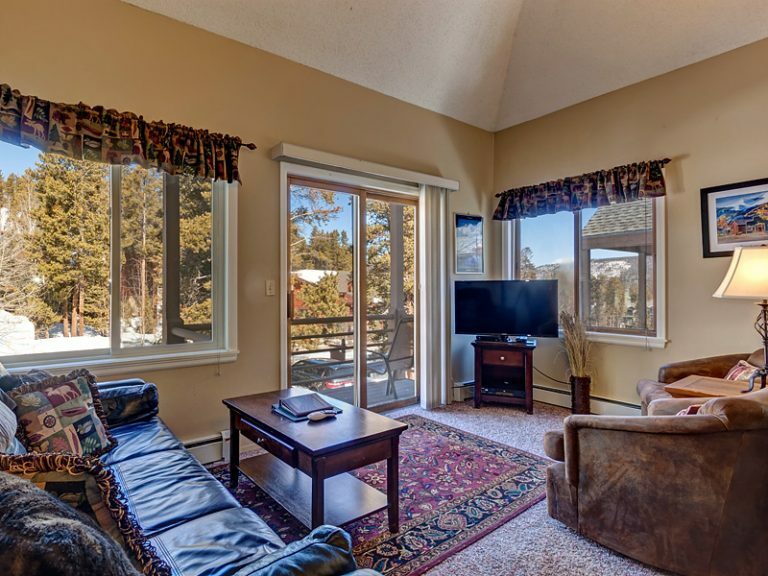 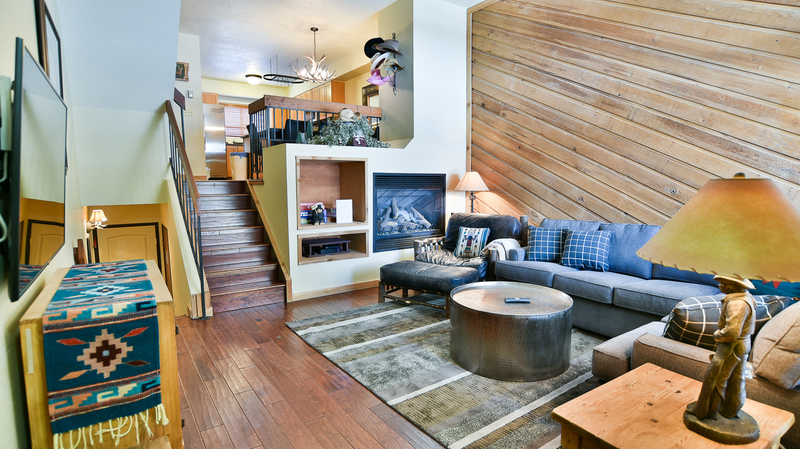 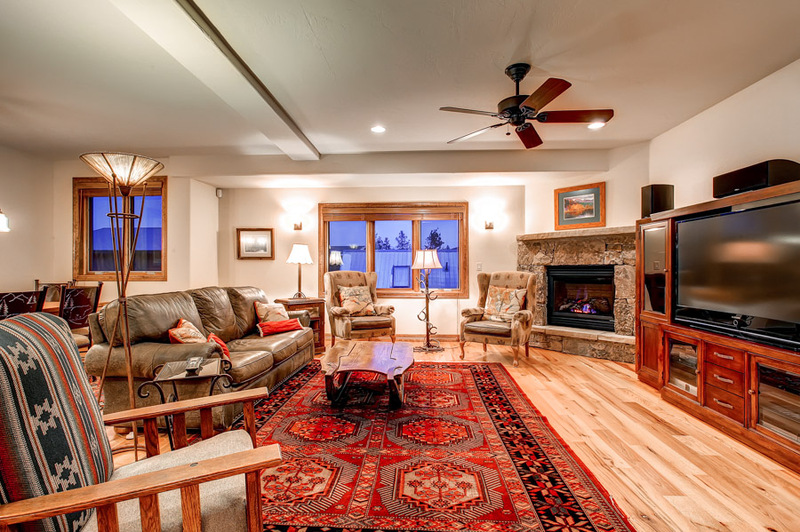 This unique 2,765 square foot townhome has beautiful windows, high ceilings, and is well decorated for a mountain getaway and offers the perfect relief after a long day of mountain activities or summer hiking. 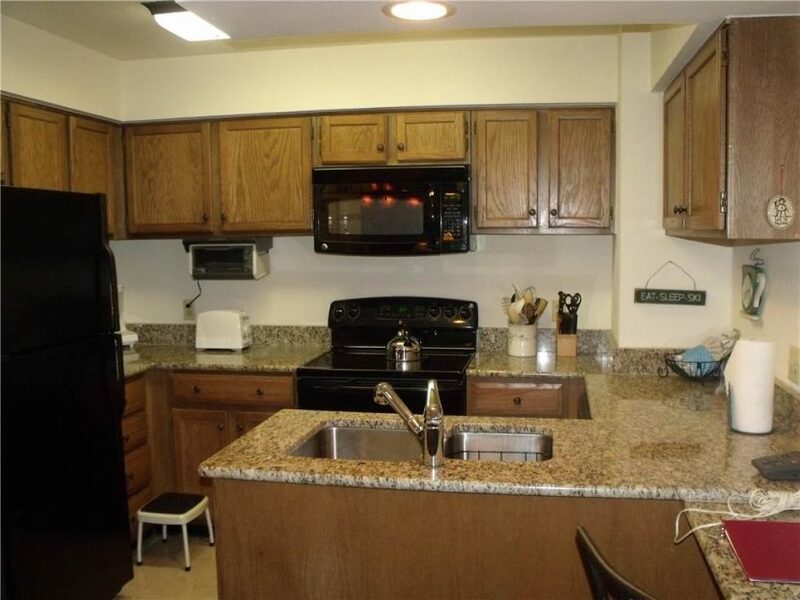 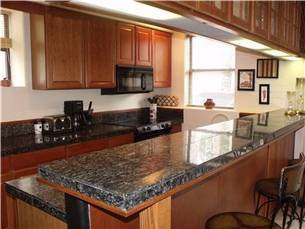 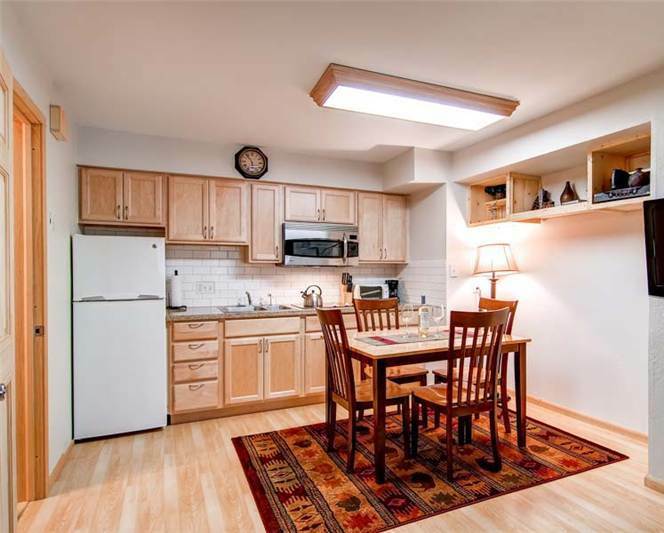 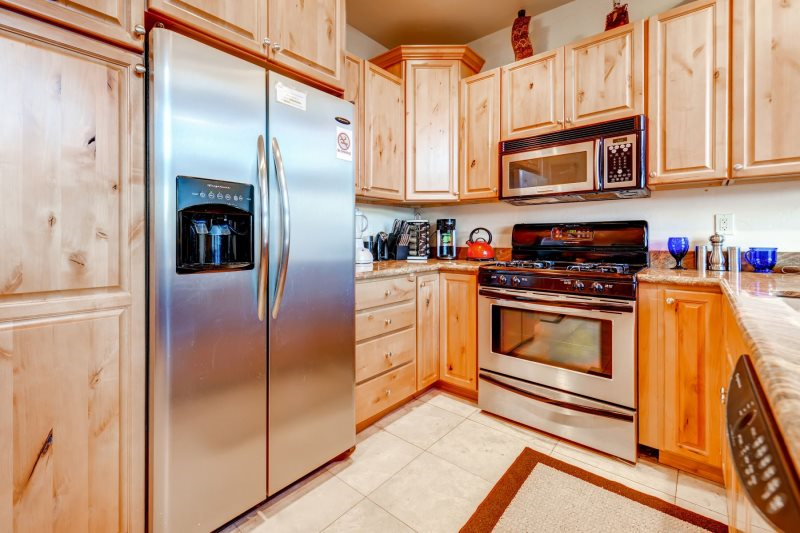 Some bonus amenities in this unit include a full-size washer and dryer, wireless high speed internet and a two car garage. 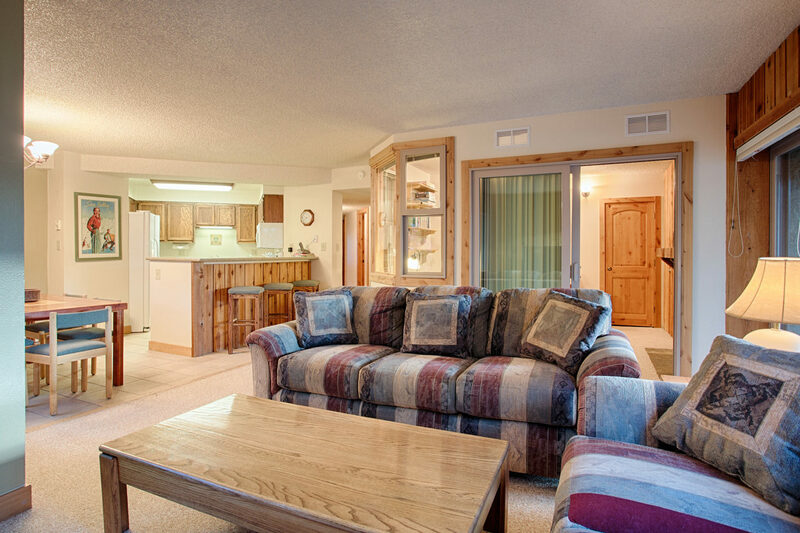 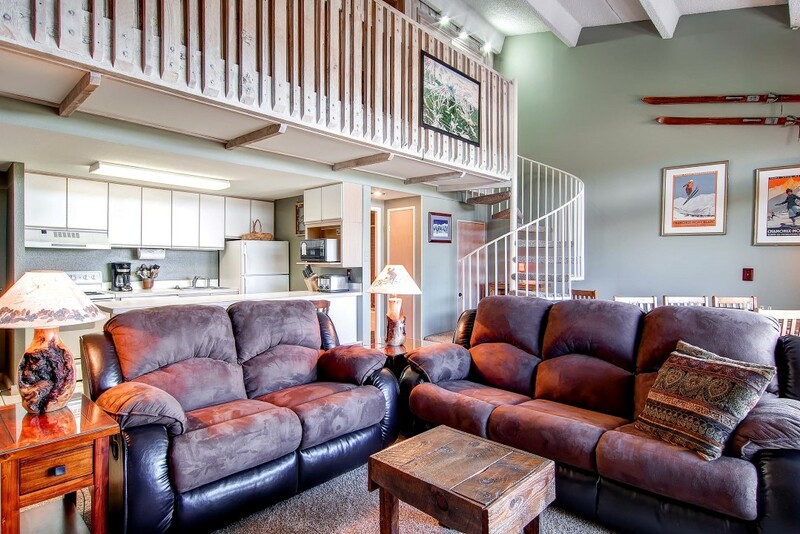 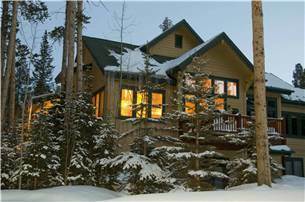 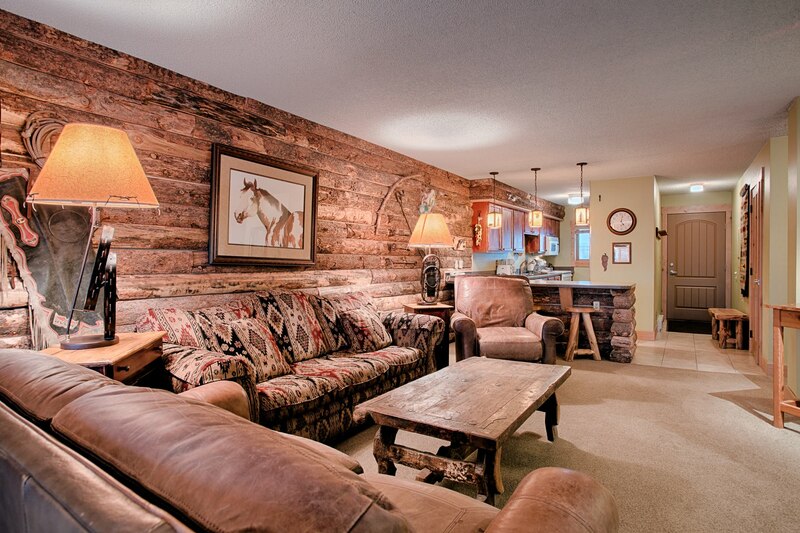 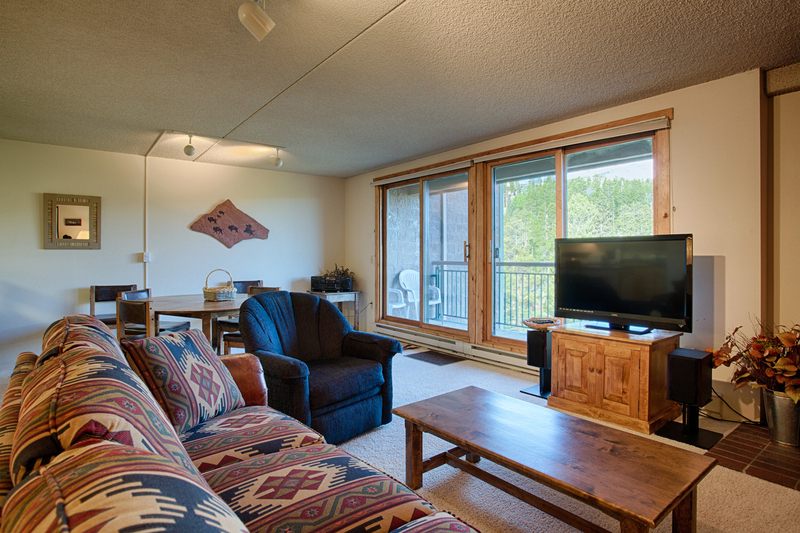 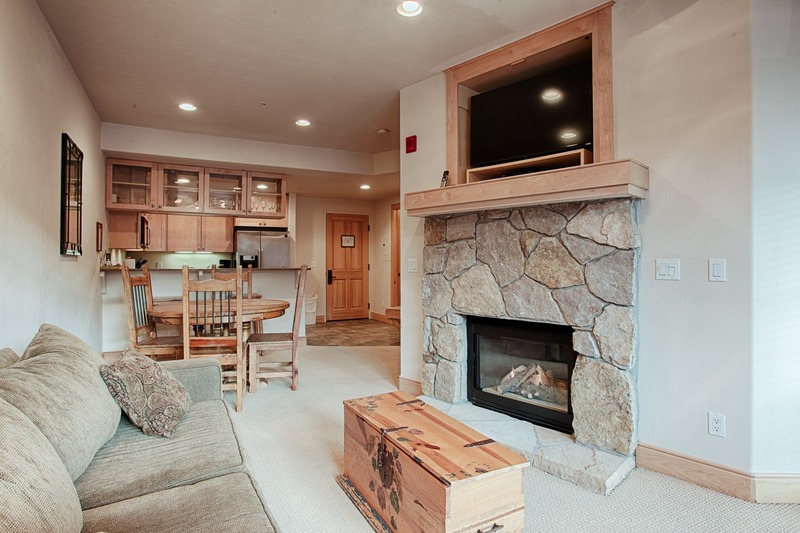 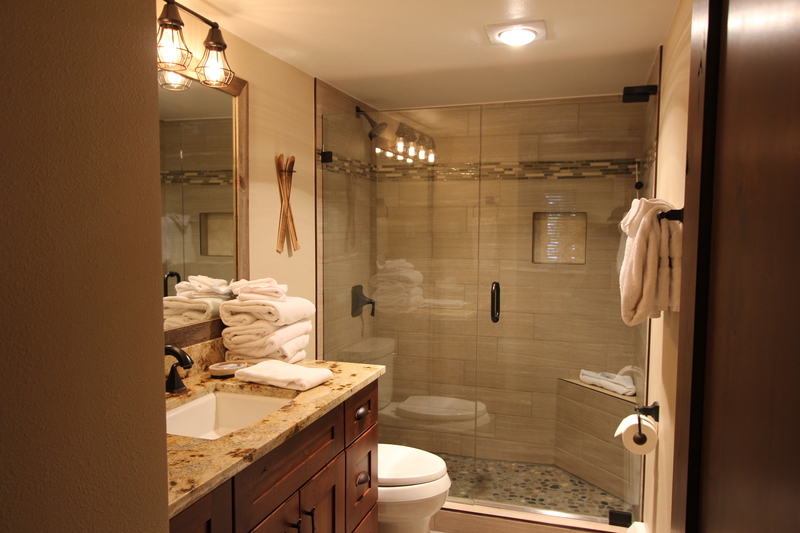 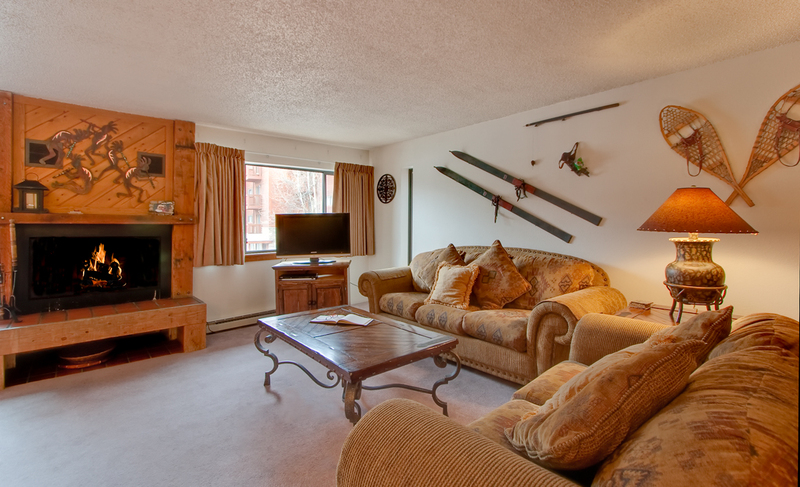 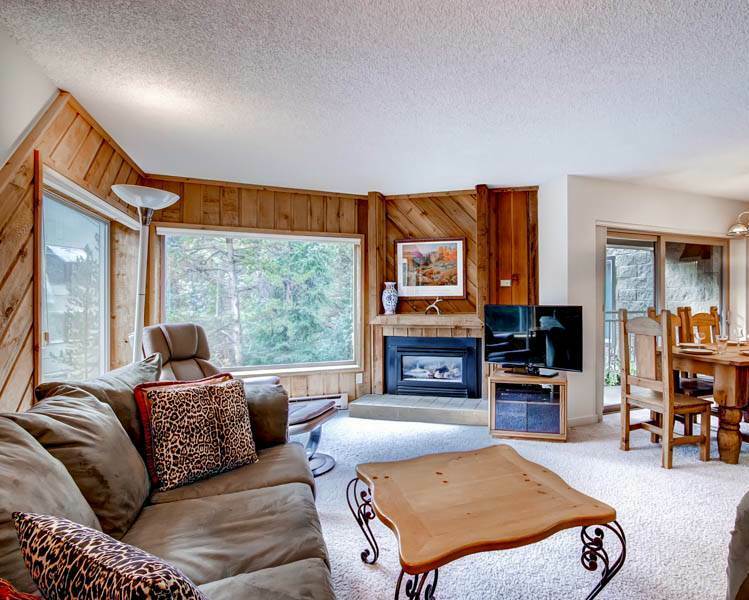 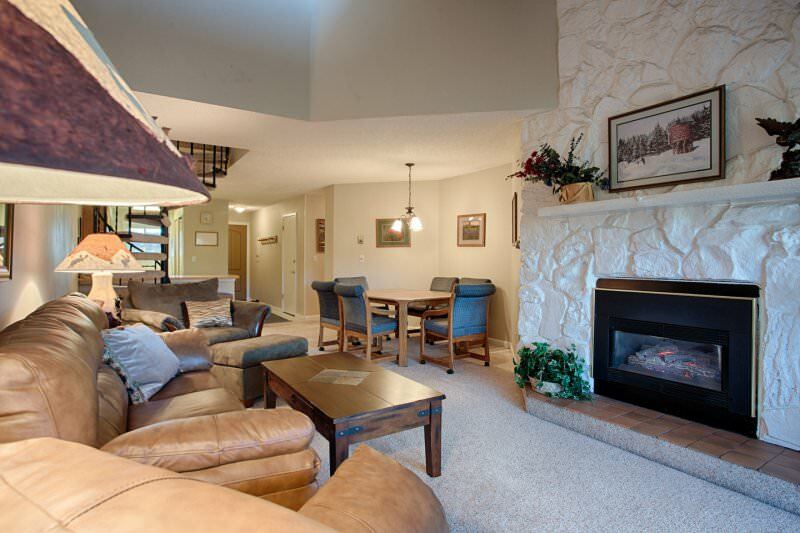 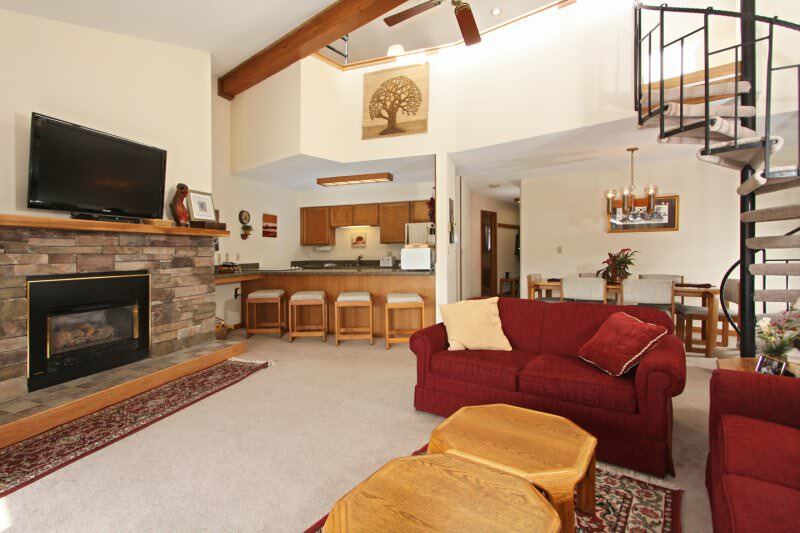 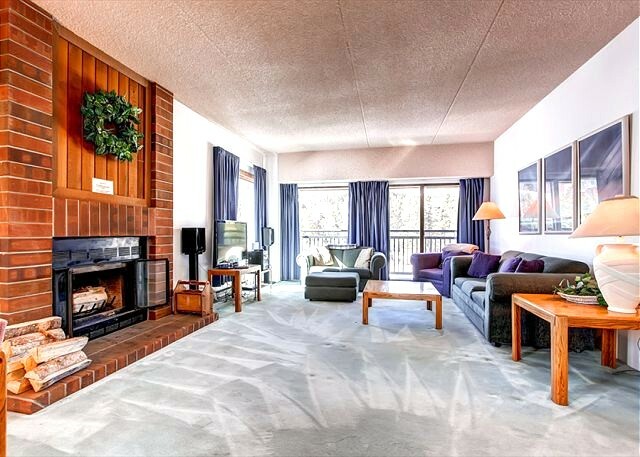 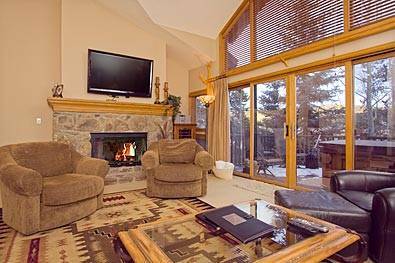 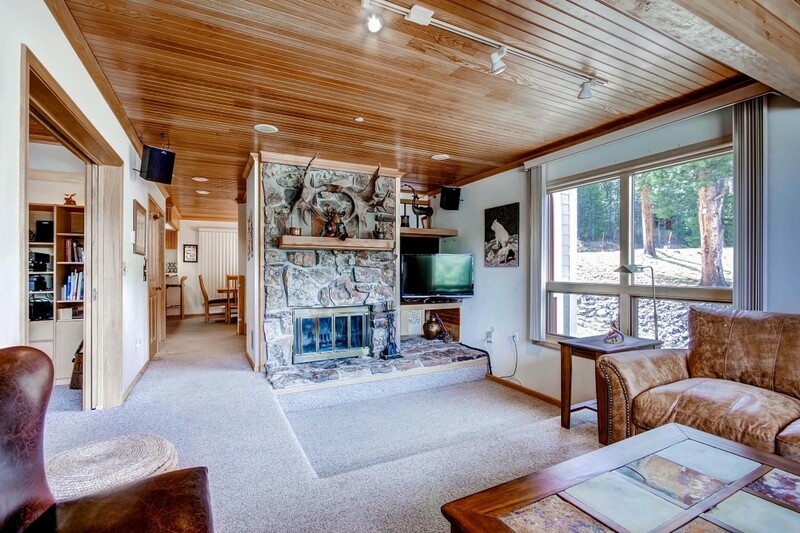 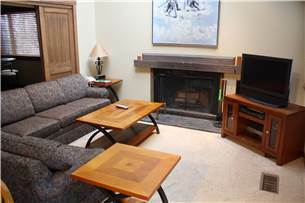 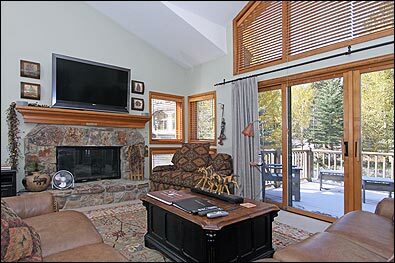 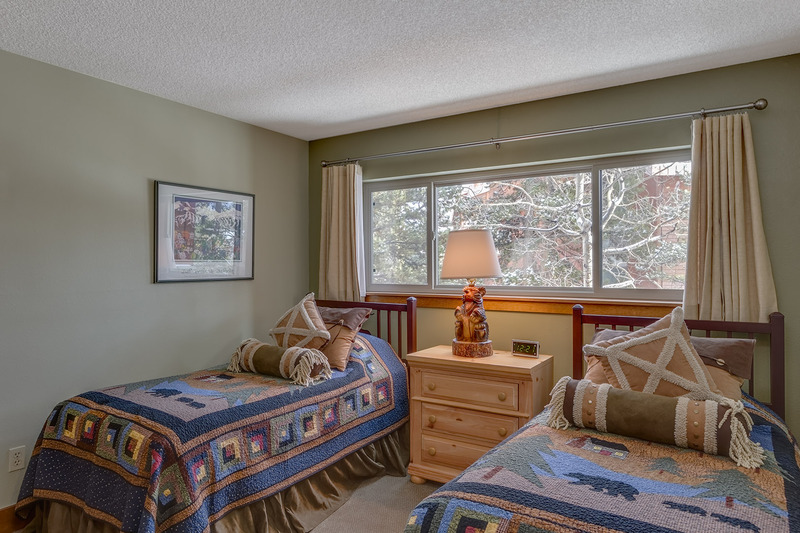 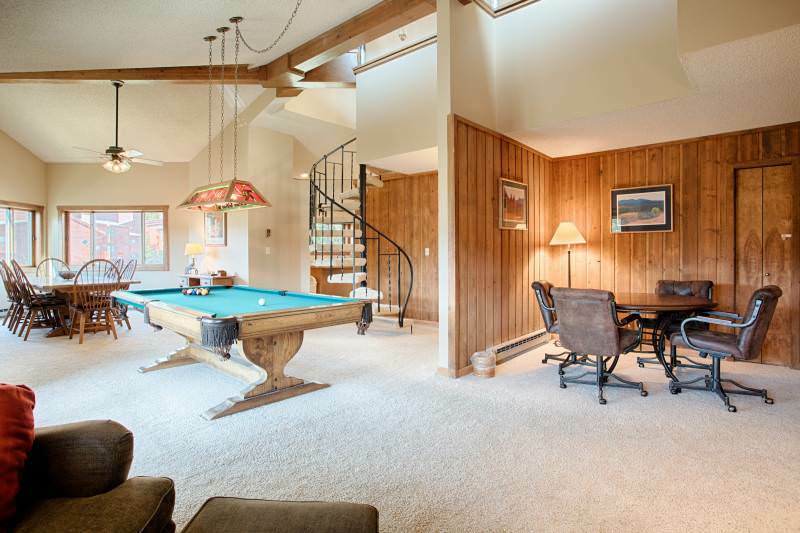 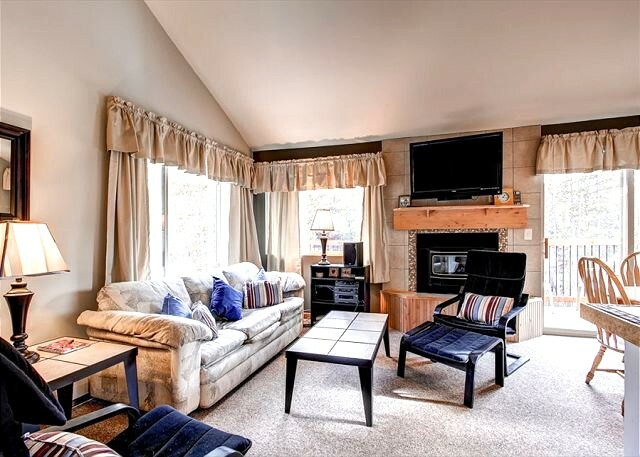 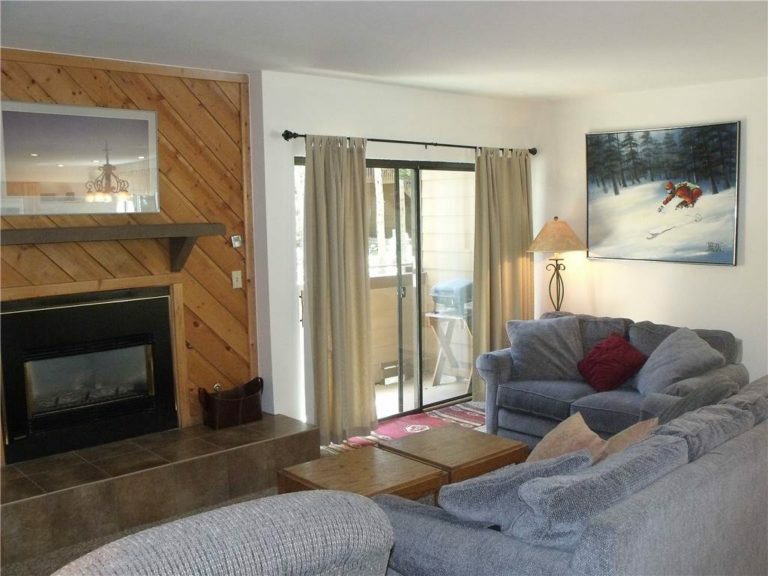 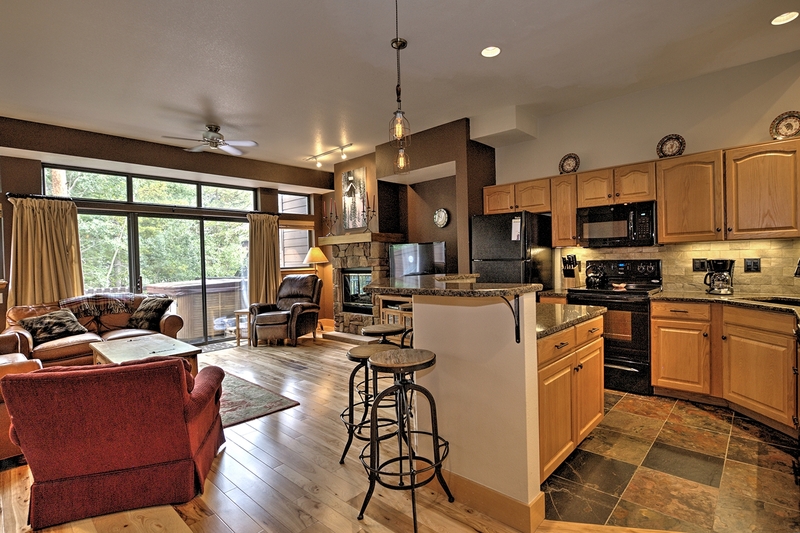 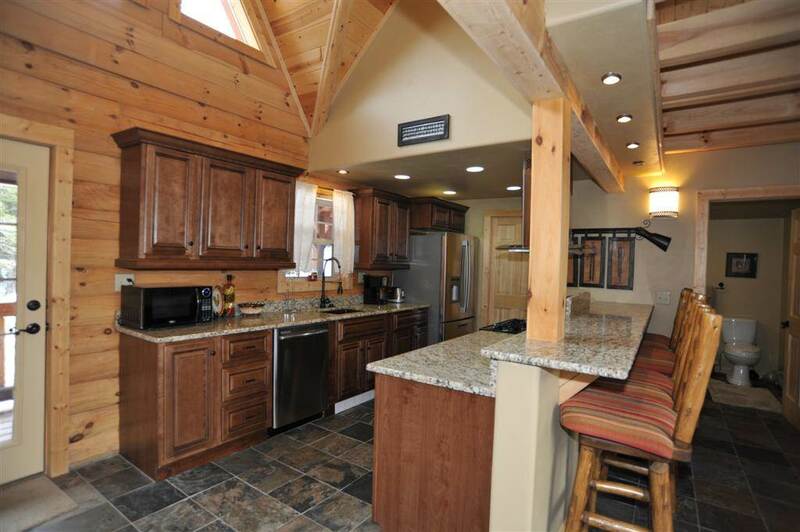 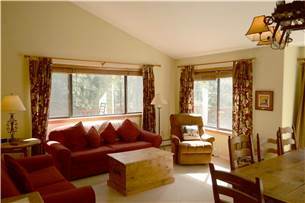 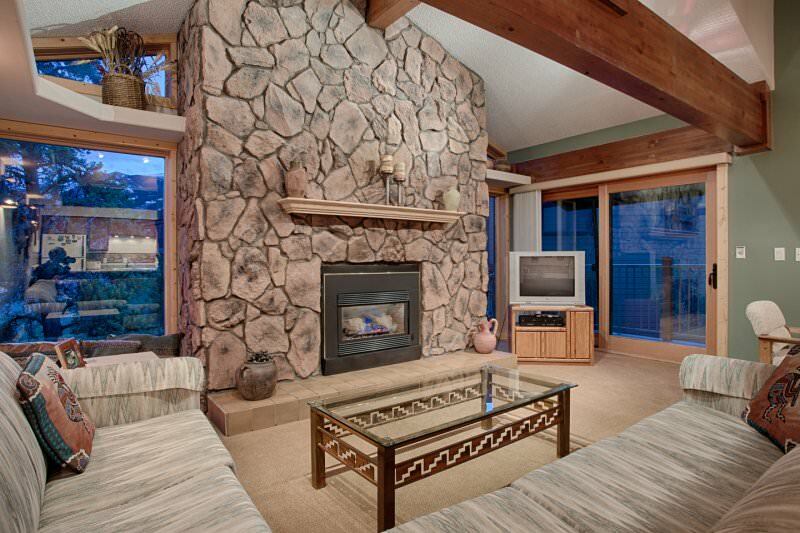 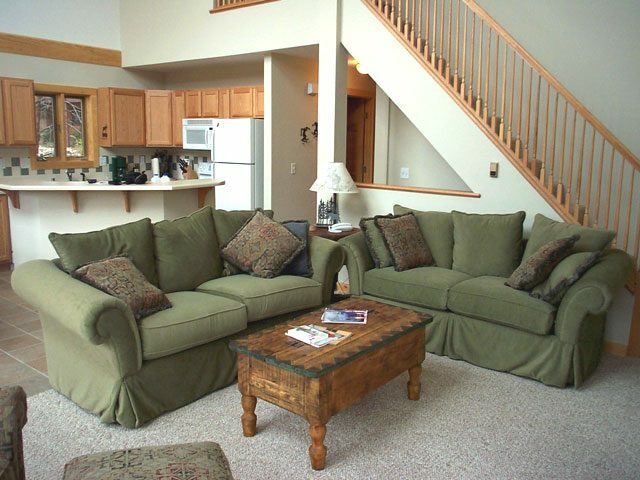 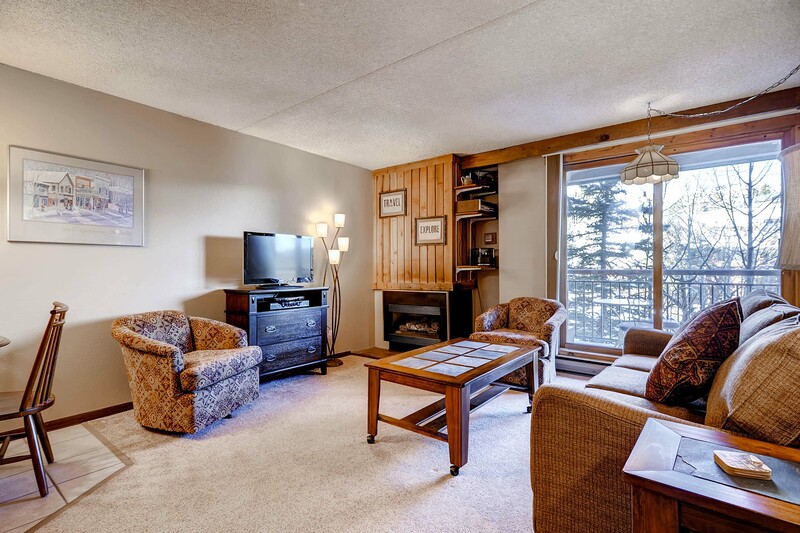 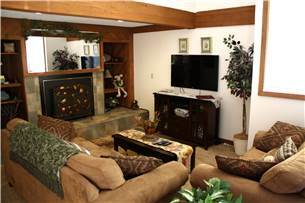 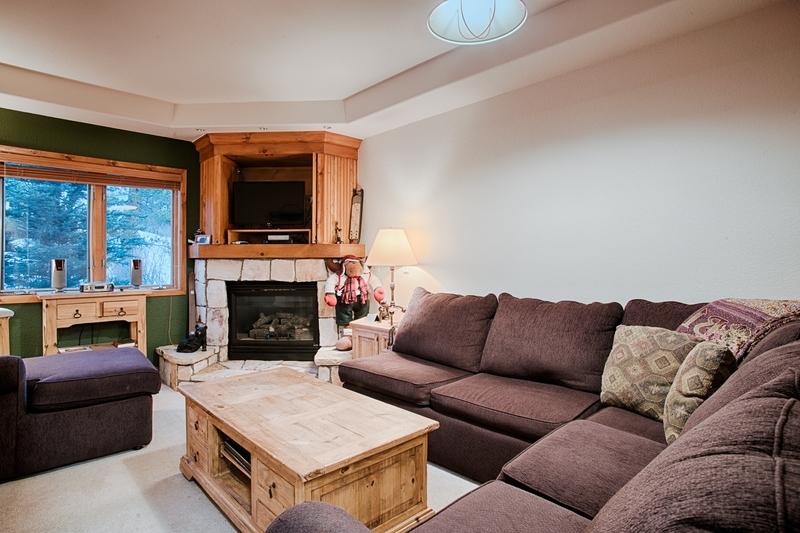 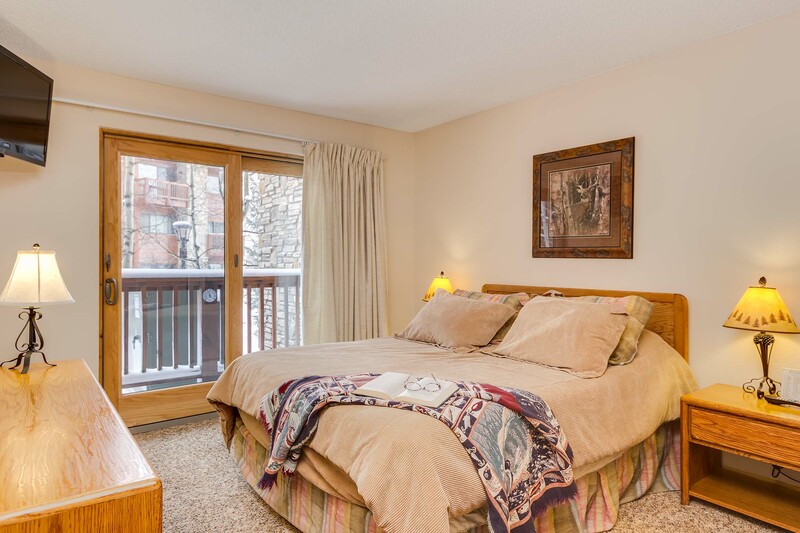 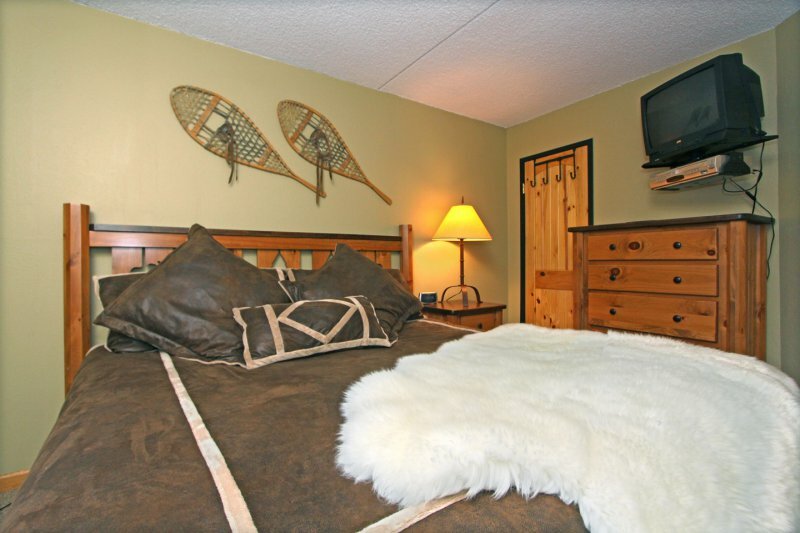 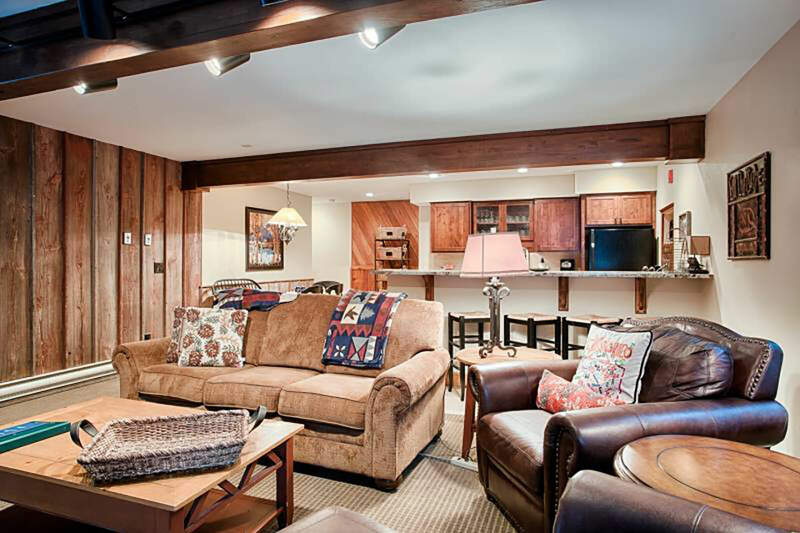 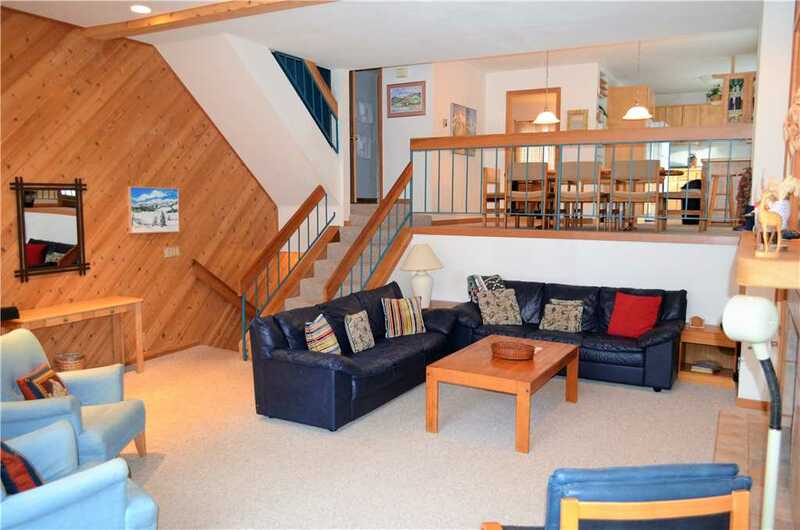 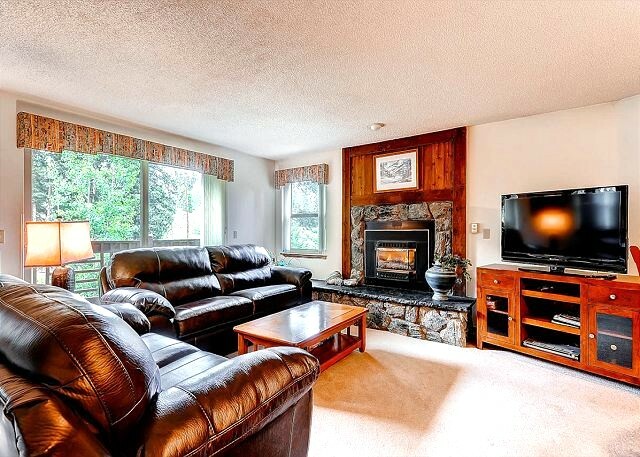 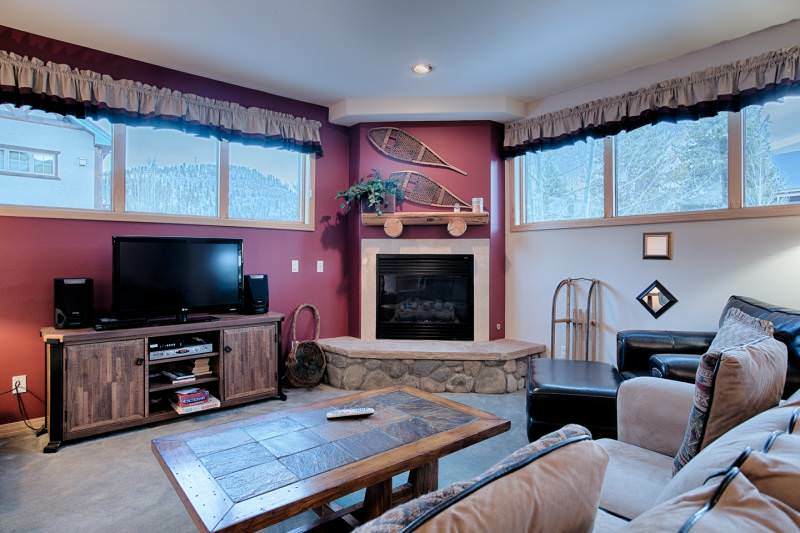 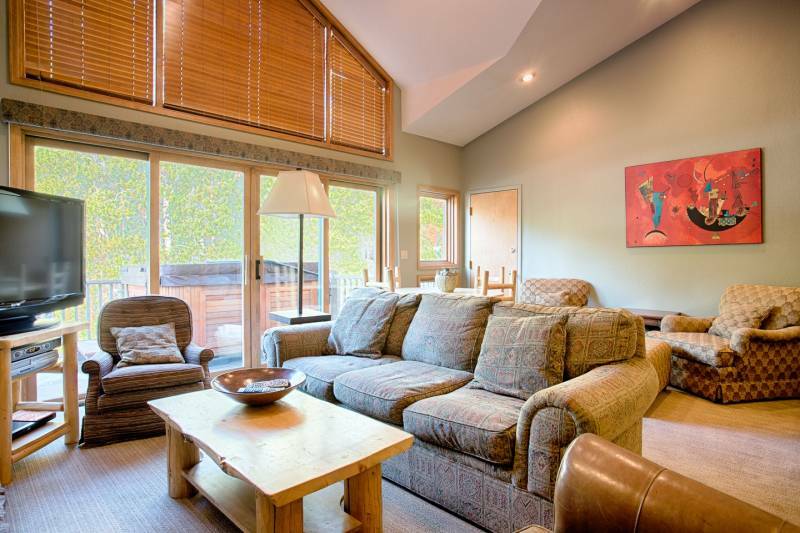 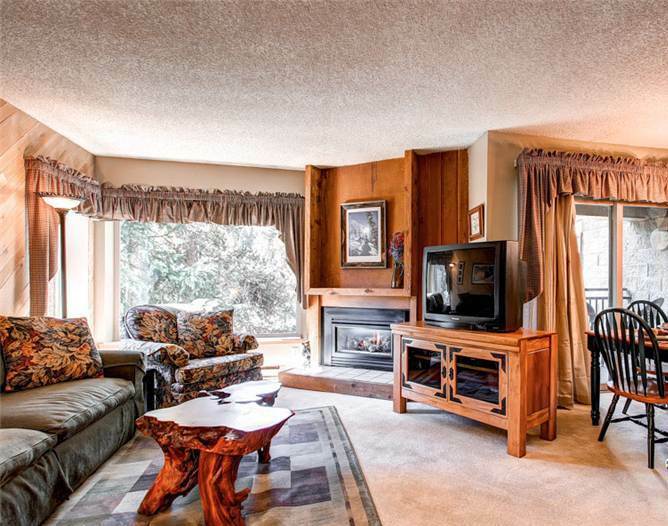 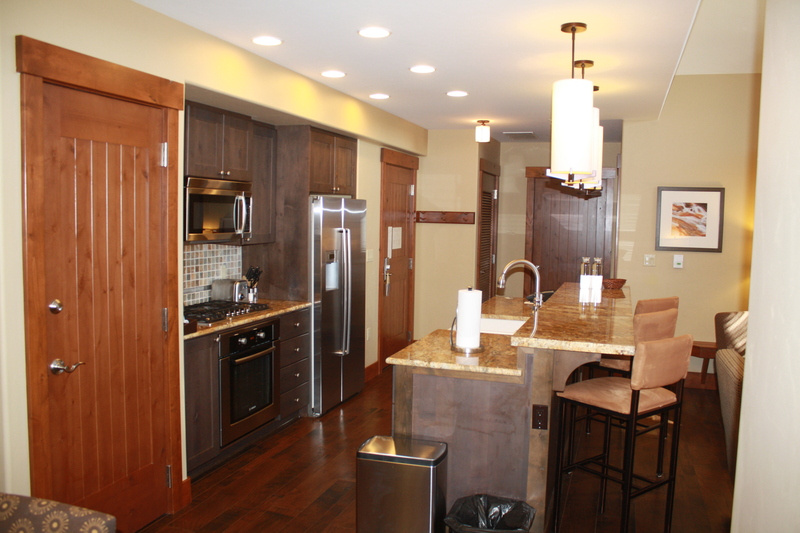 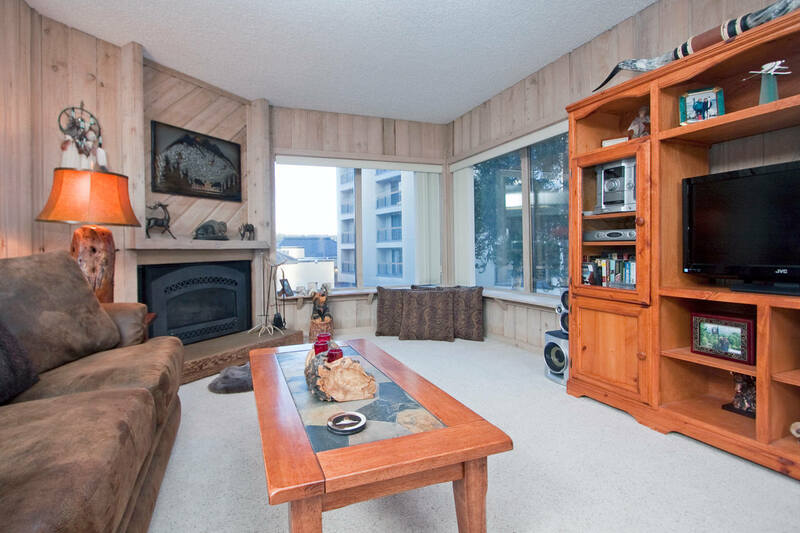 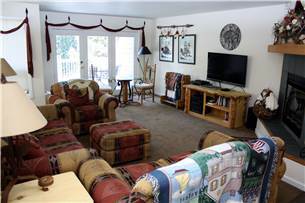 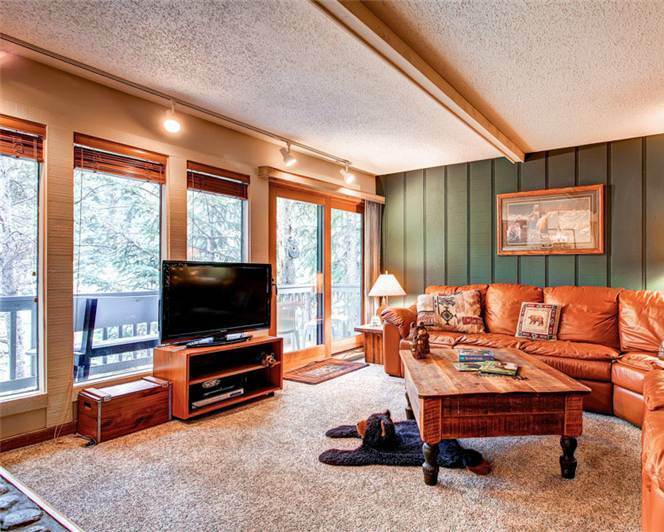 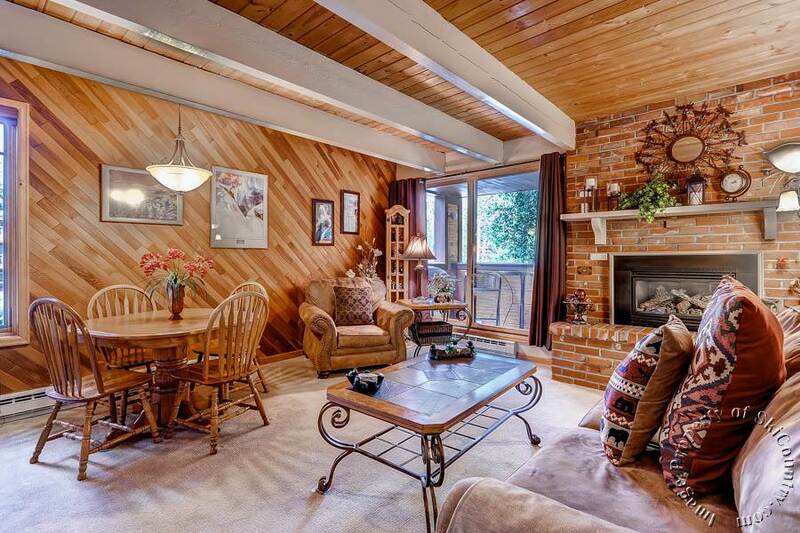 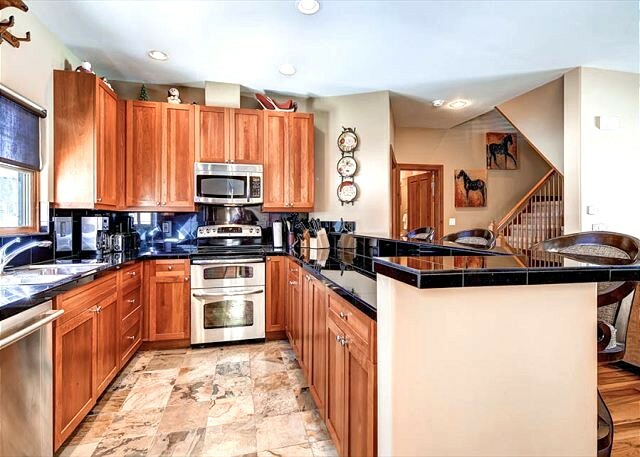 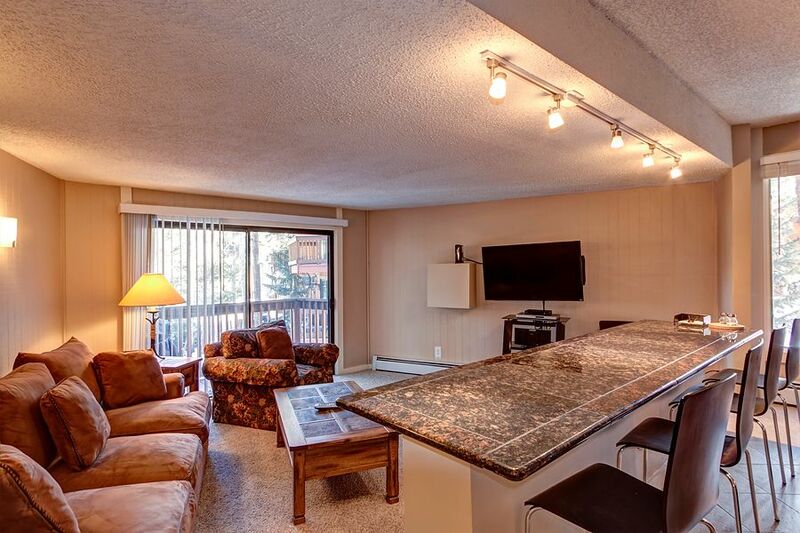 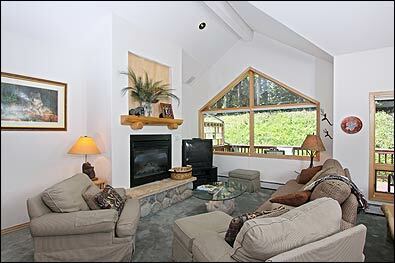 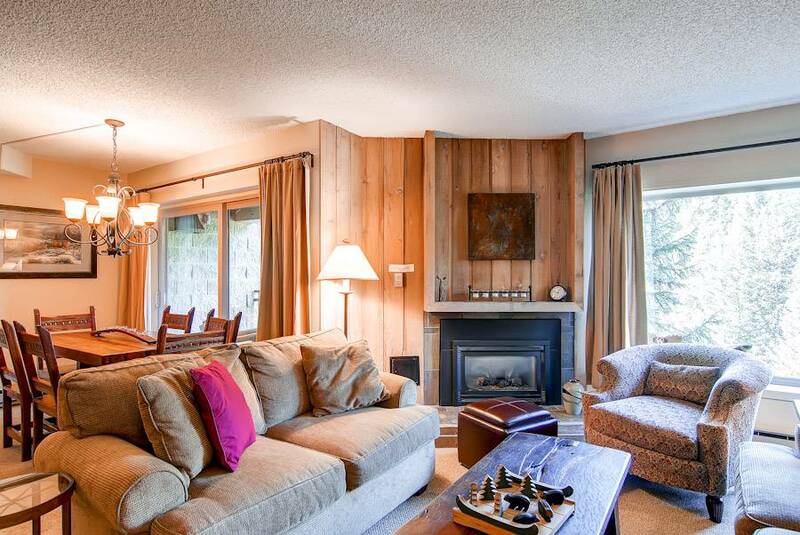 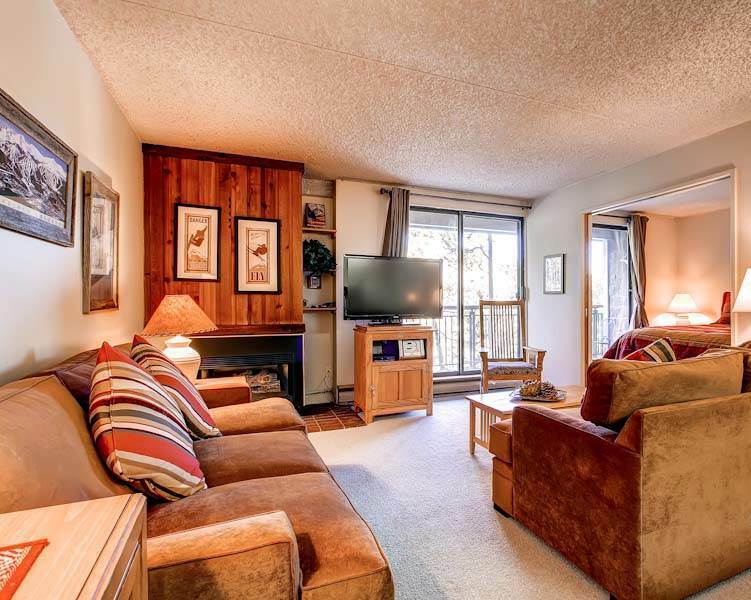 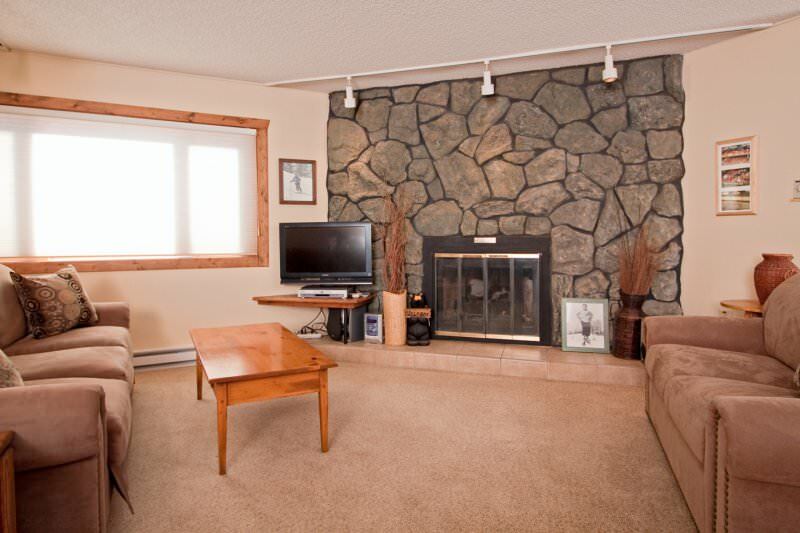 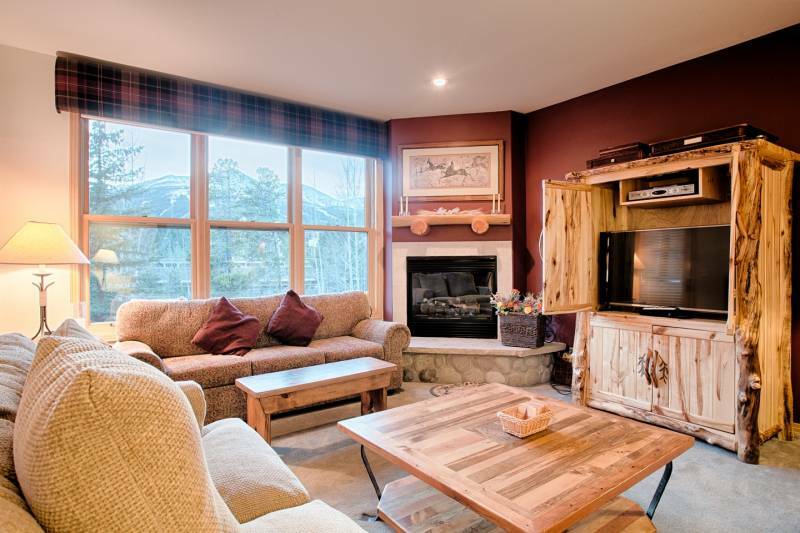 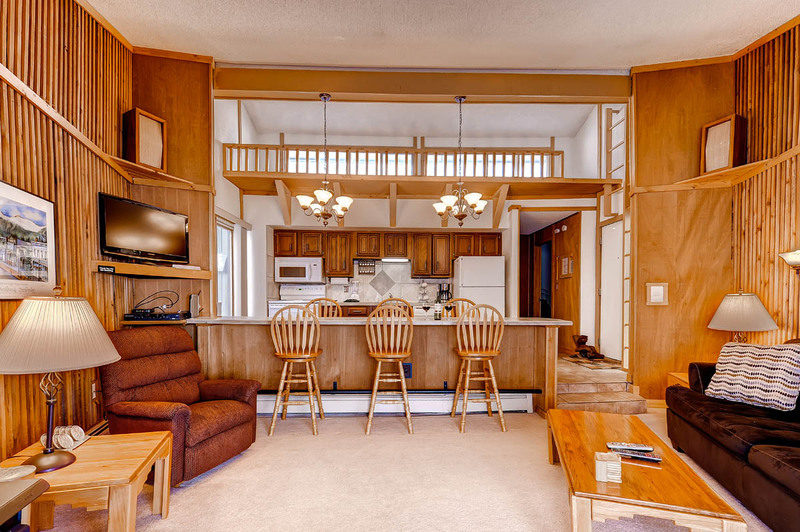 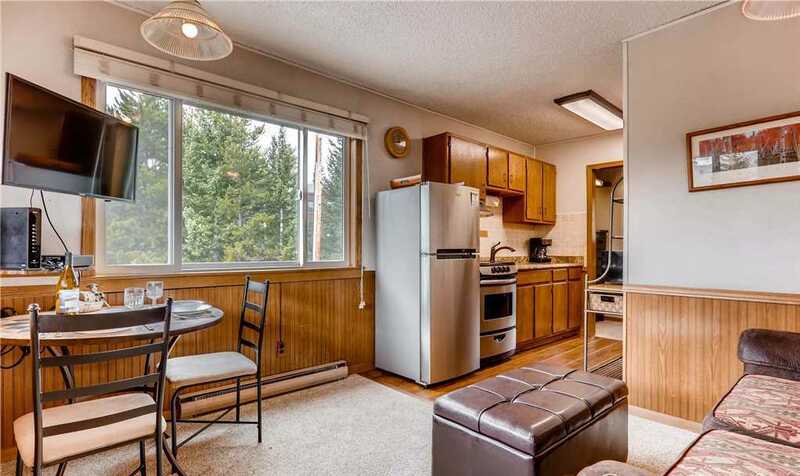 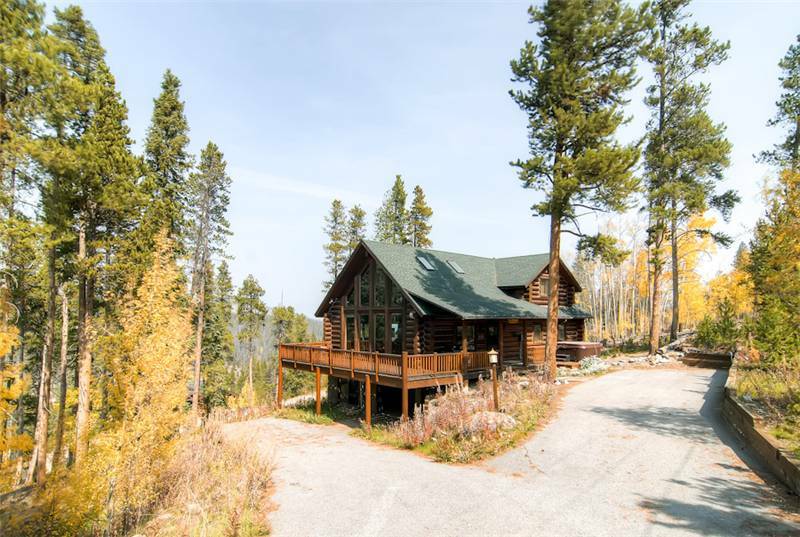 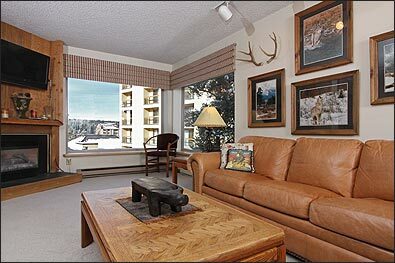 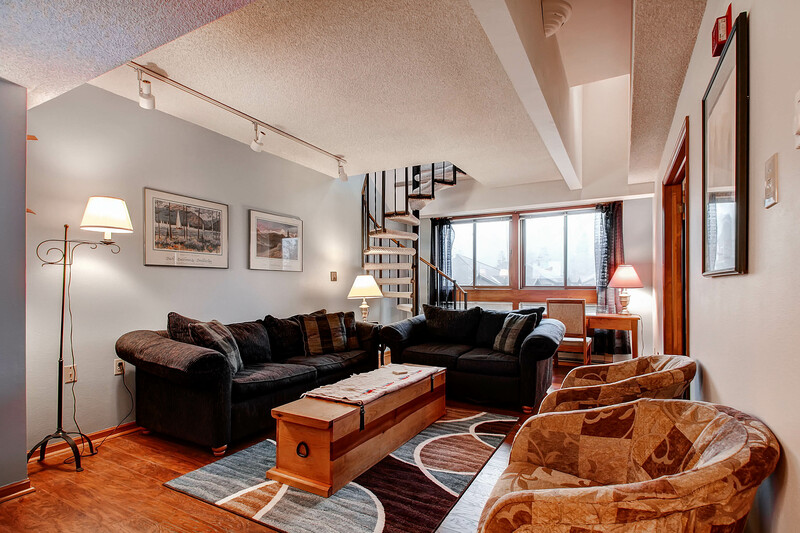 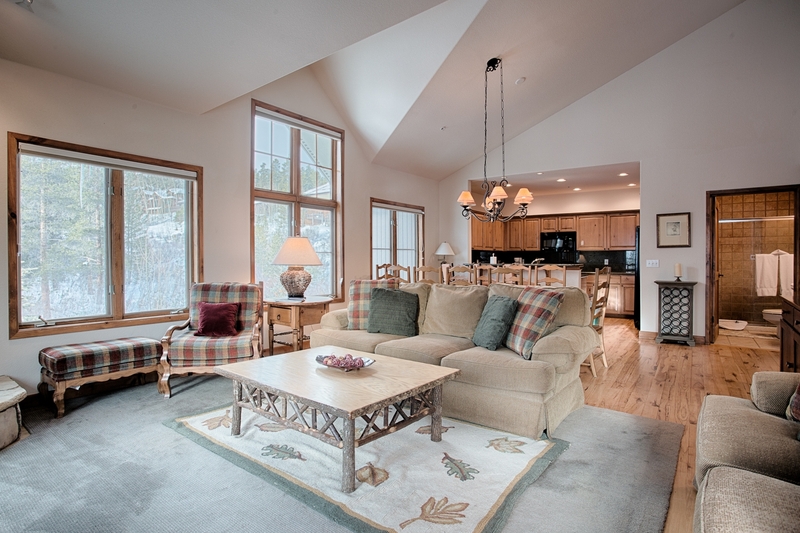 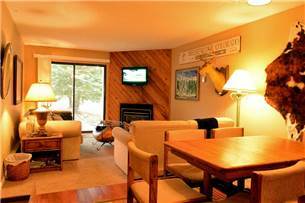 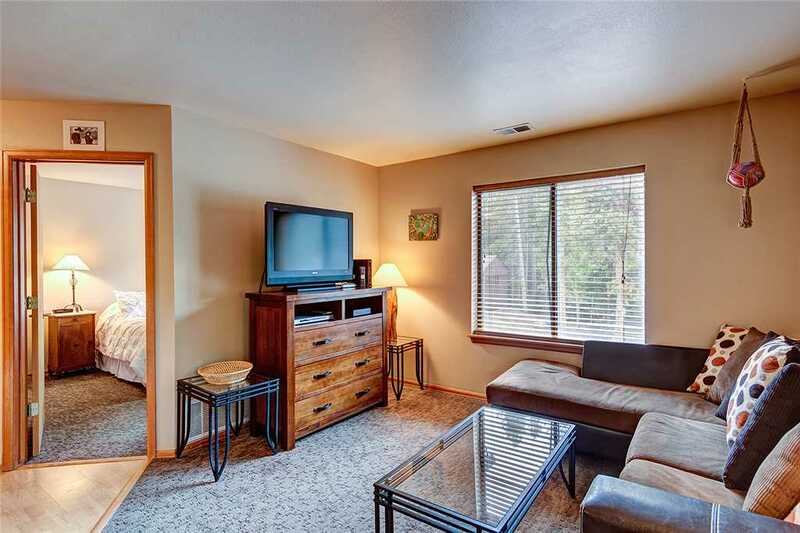 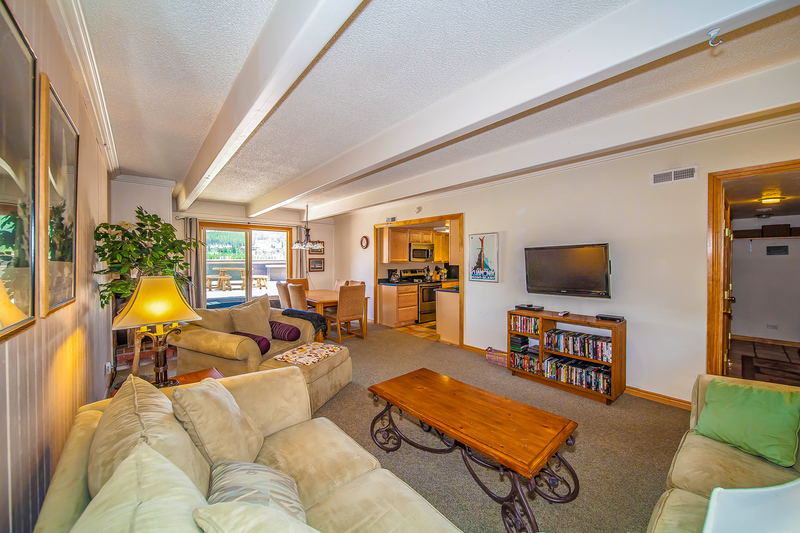 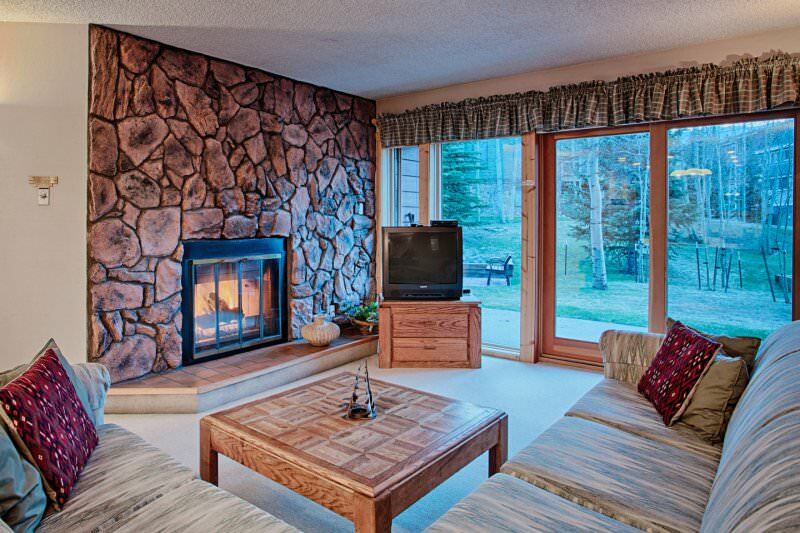 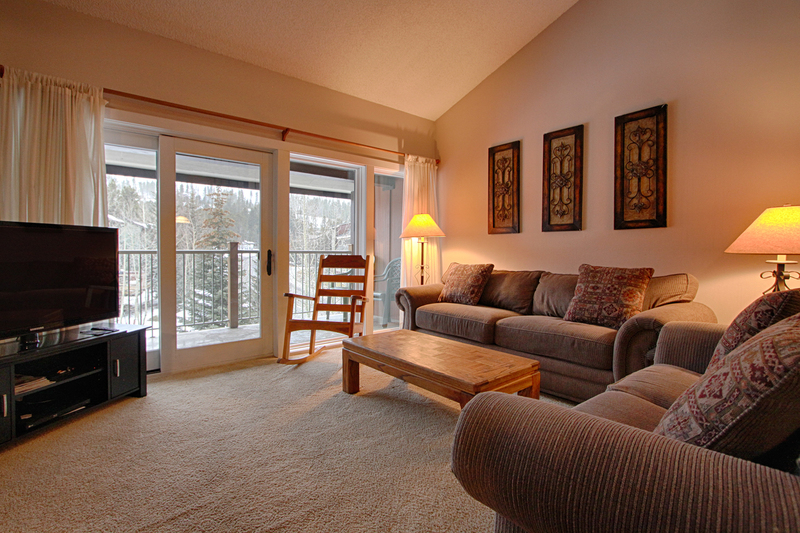 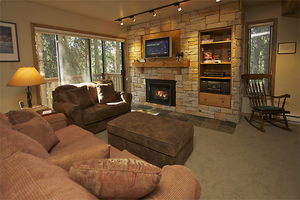 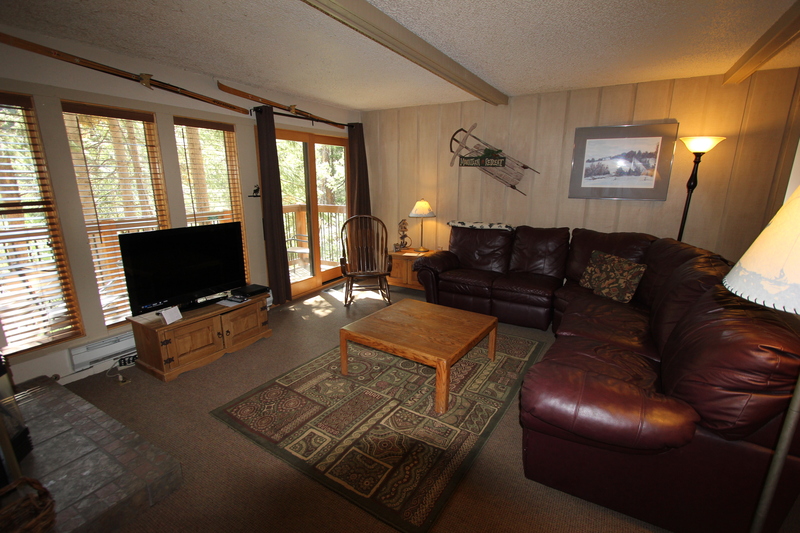 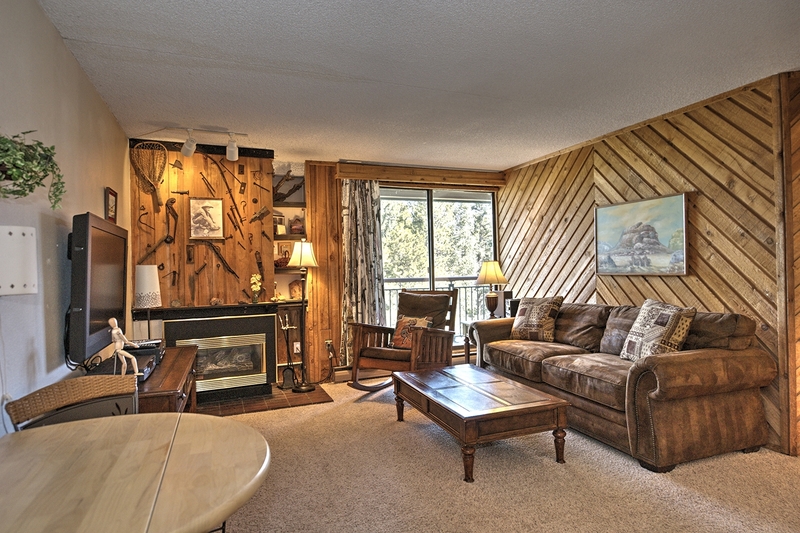 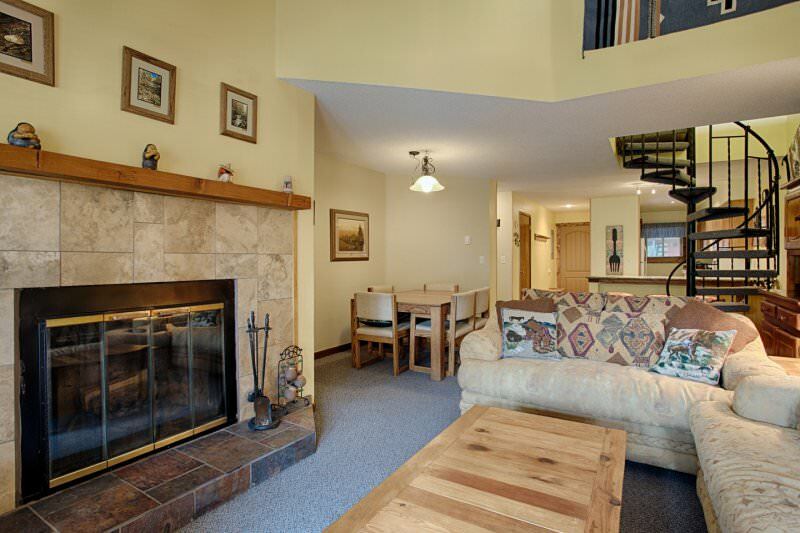 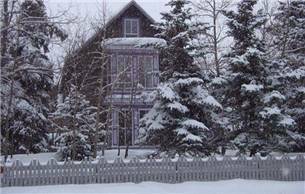 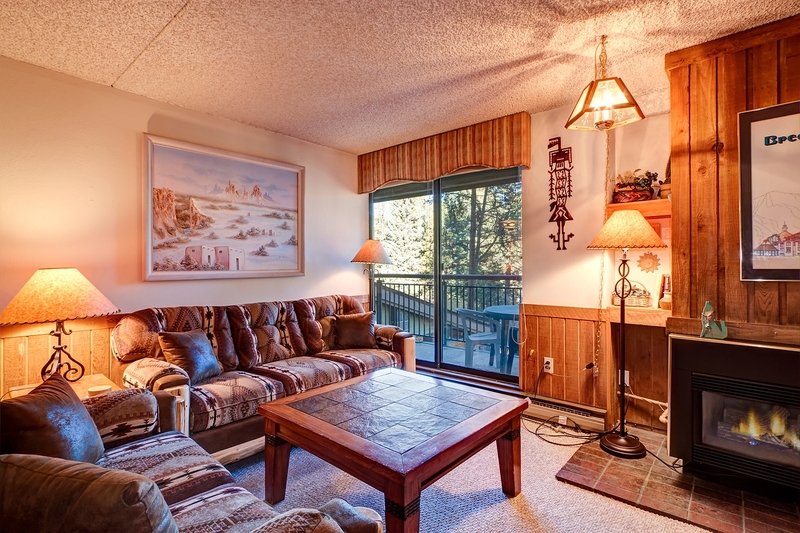 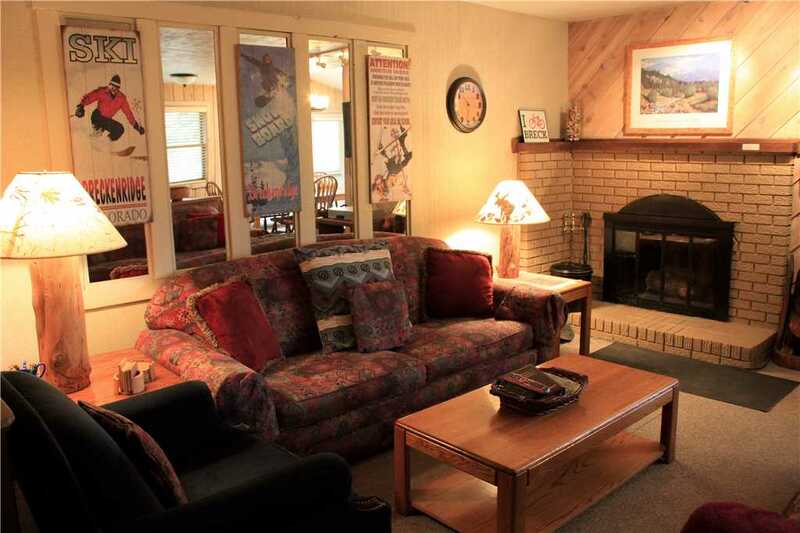 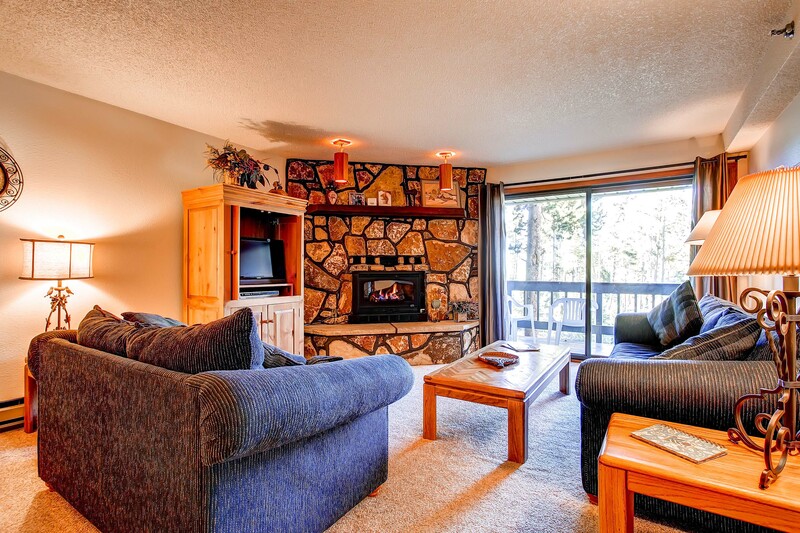 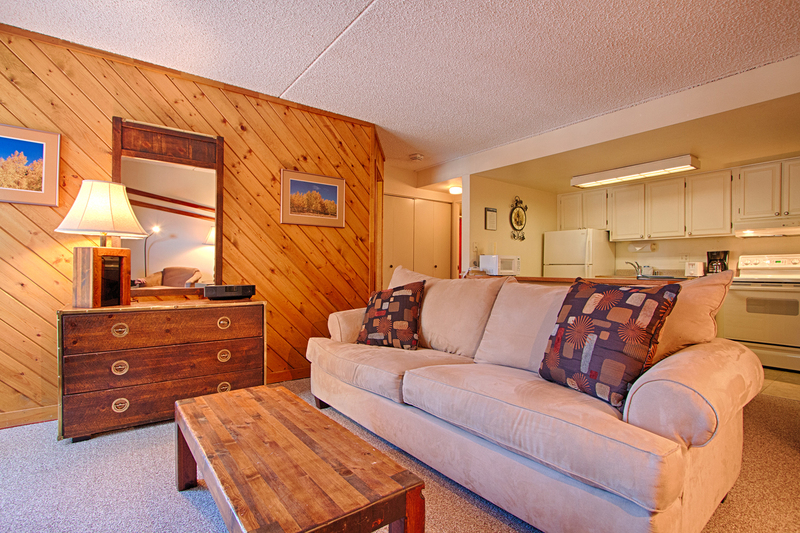 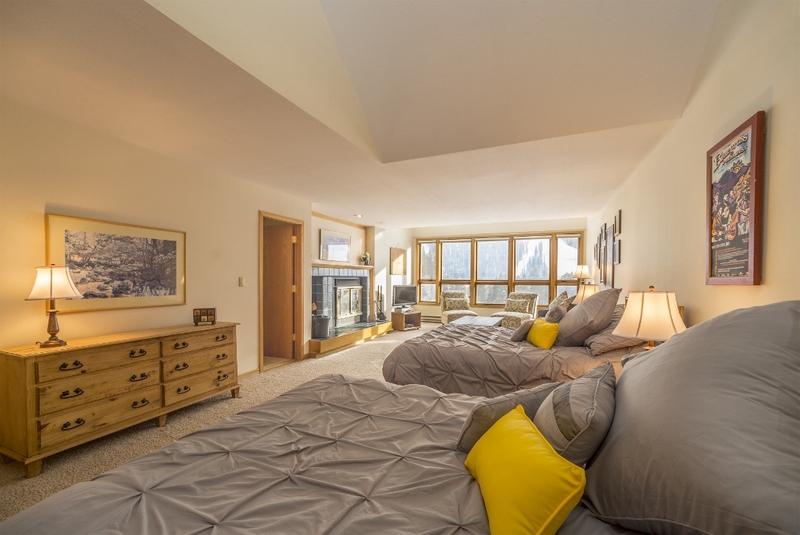 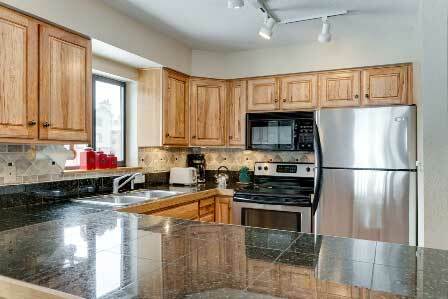 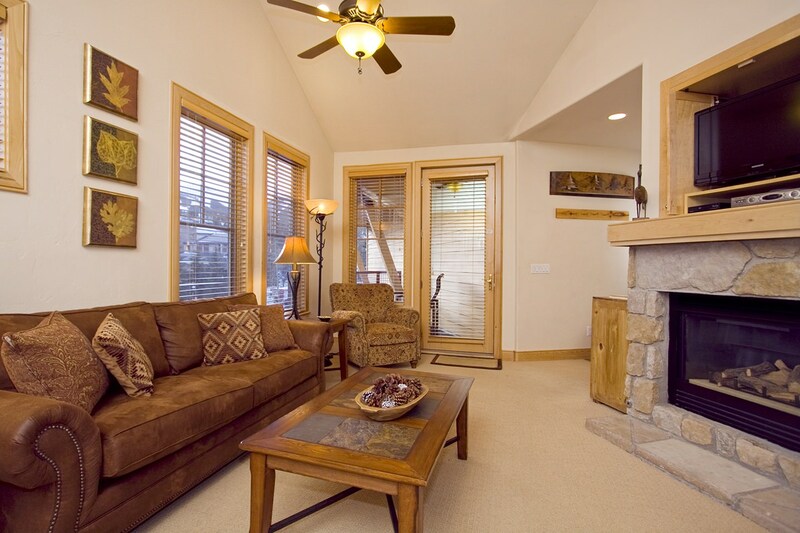 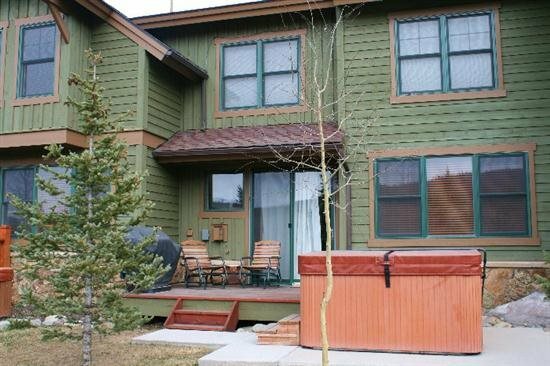 This unit also has a wood deck with gas grill, a private indoor hot tub and private sauna. 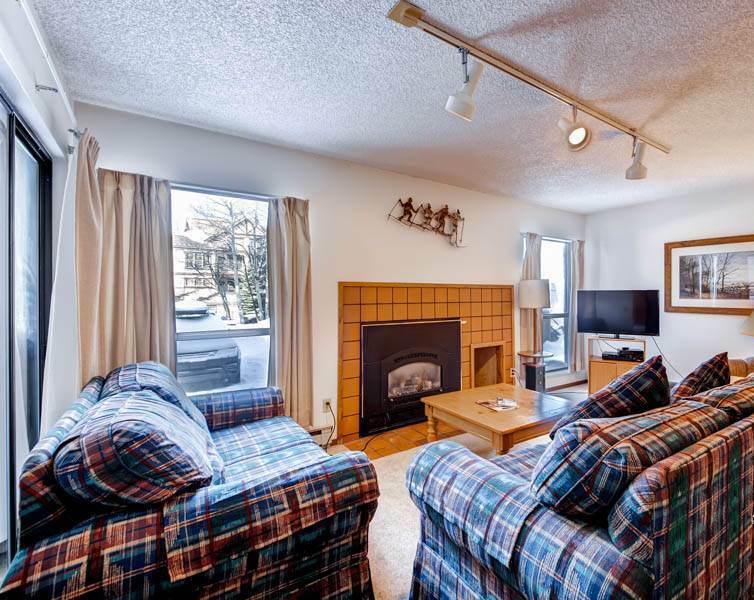 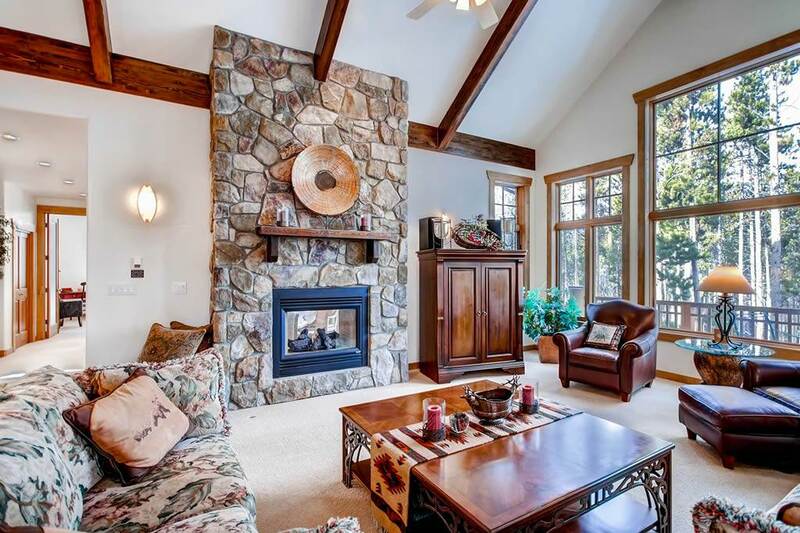 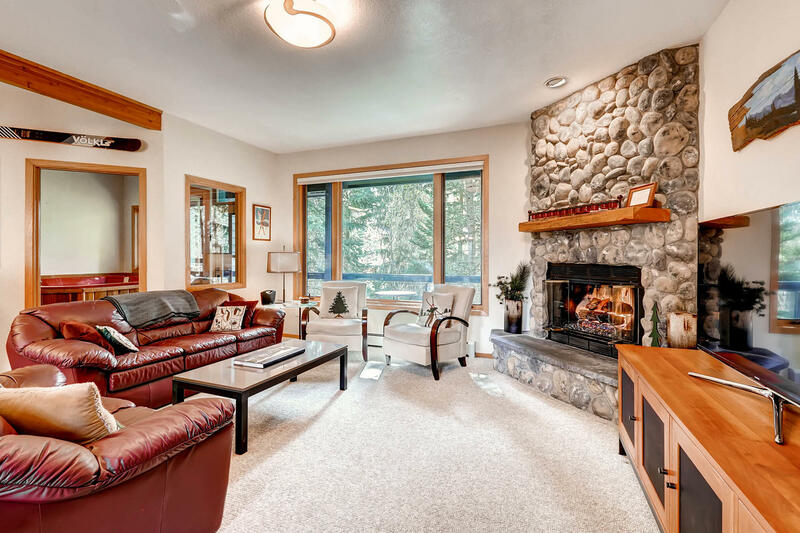 There is ample seating in the living room on the cozy, leather couches or snuggle up in the recessed floor that allows for basking in the warmth of the wood burning fireplace. 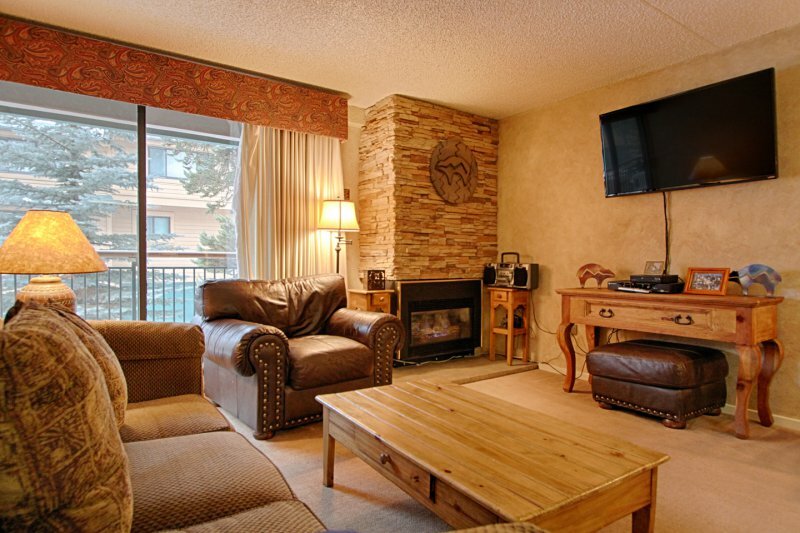 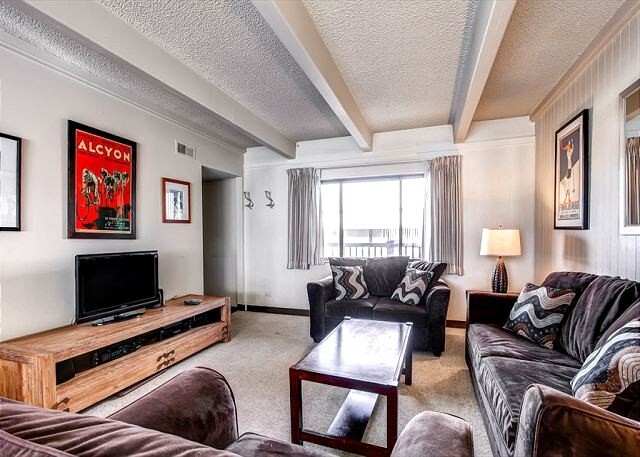 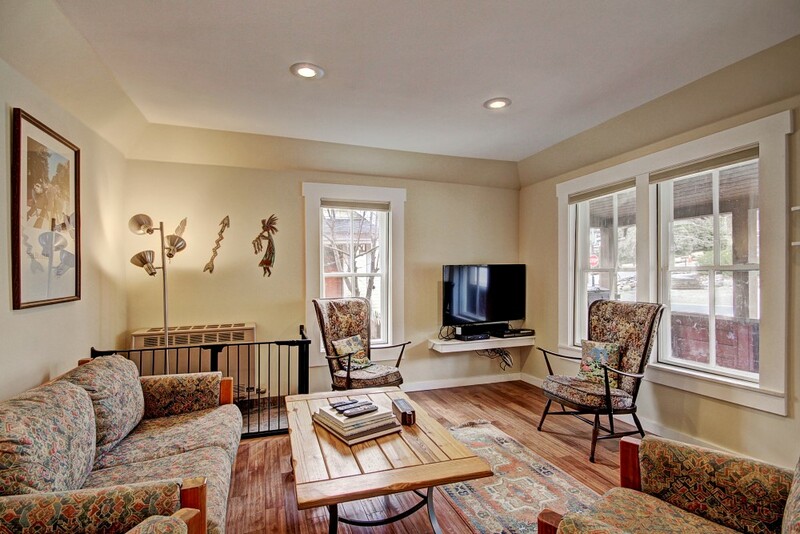 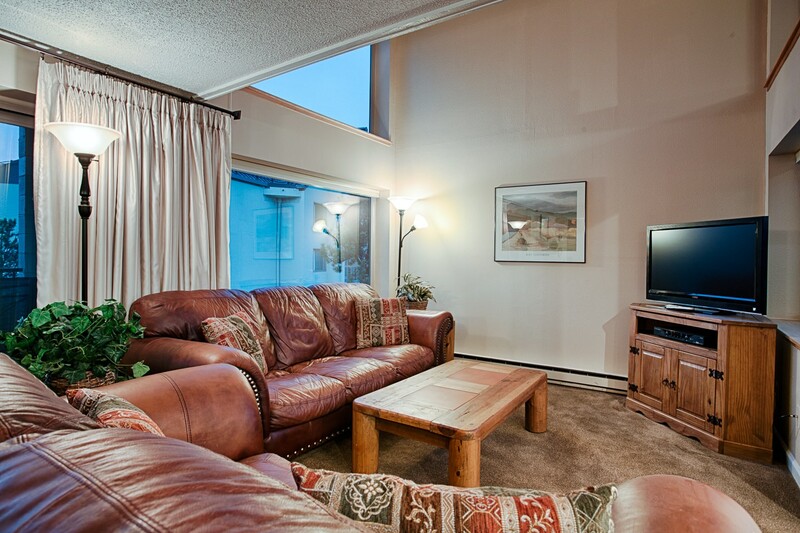 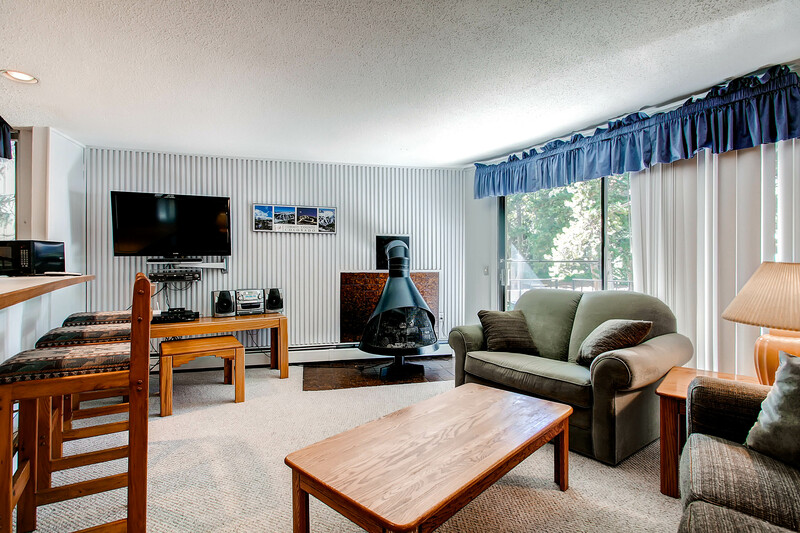 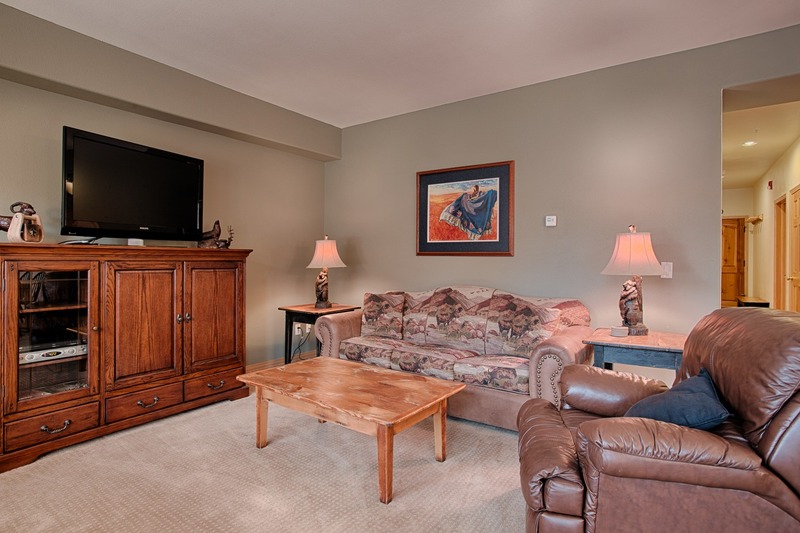 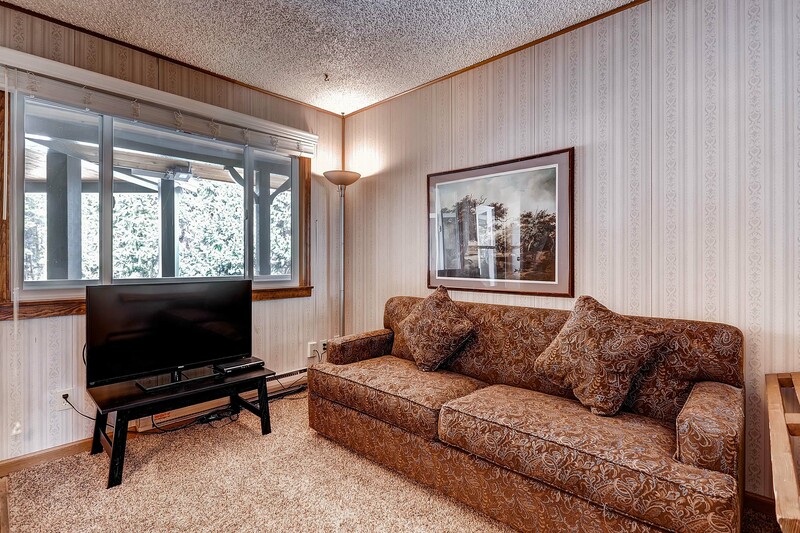 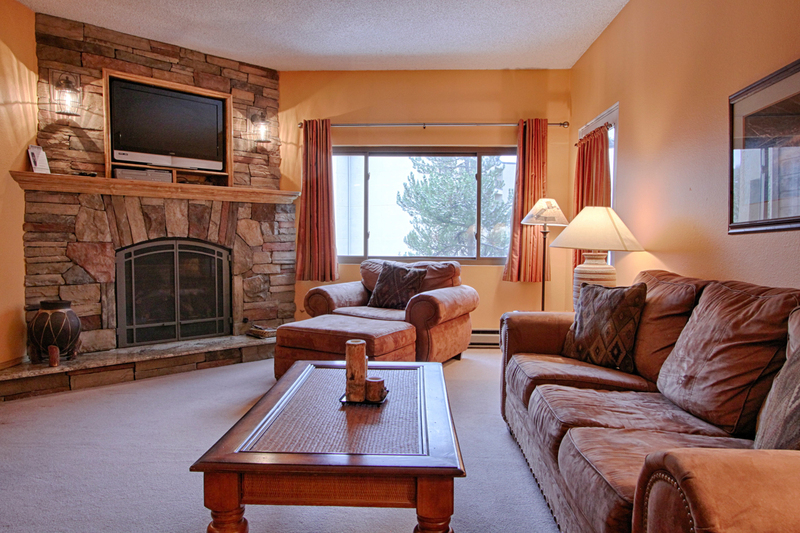 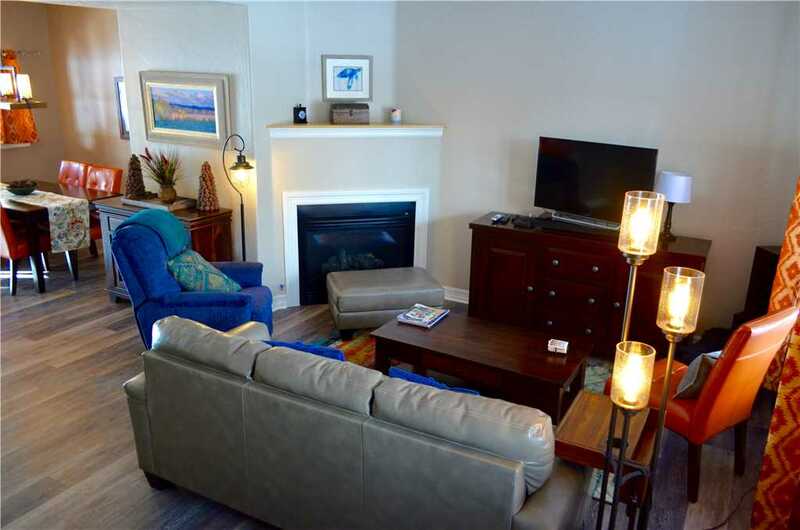 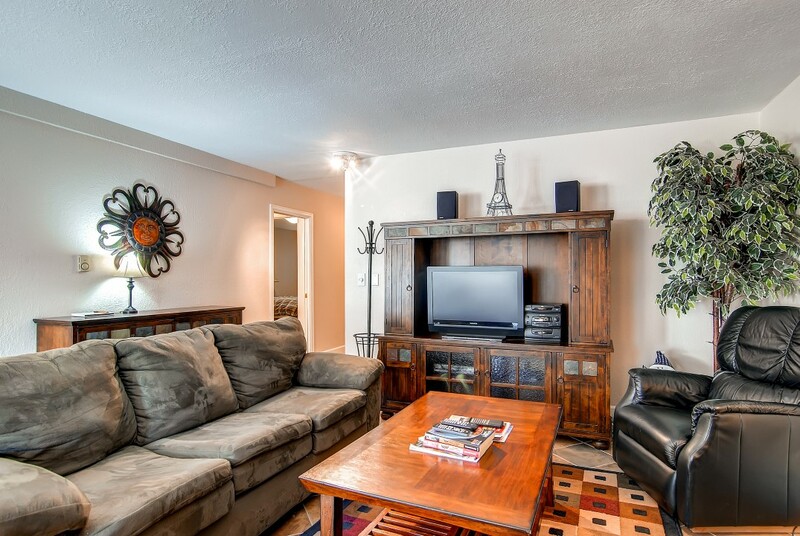 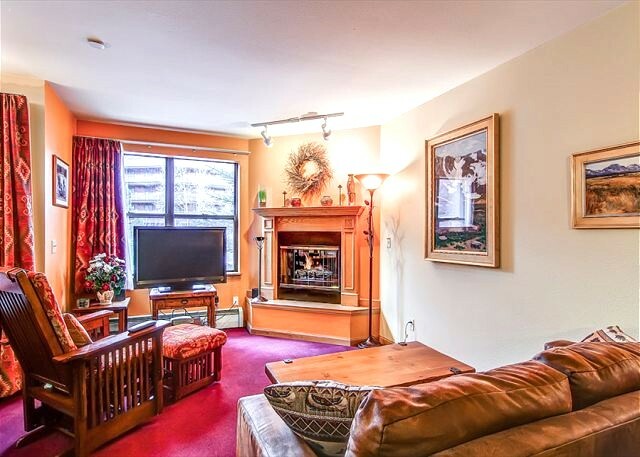 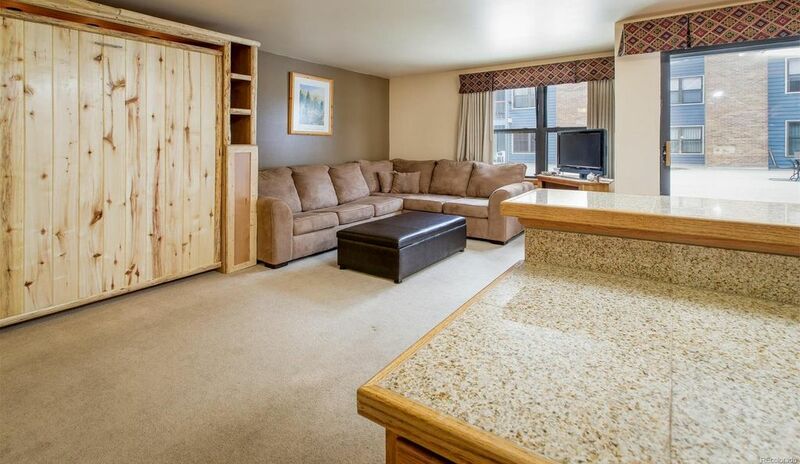 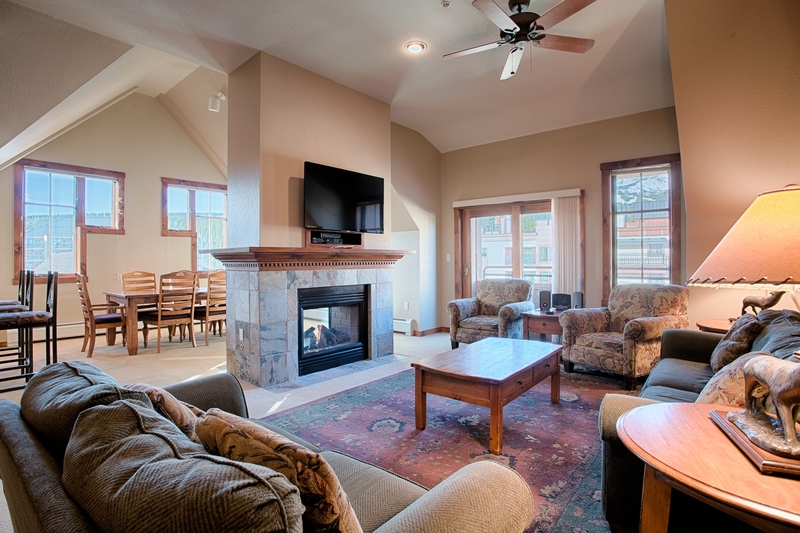 Watch your favorite show on the 42″ flat screen TV or just relish in the inviting room with good company. 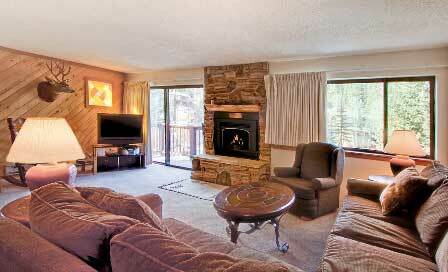 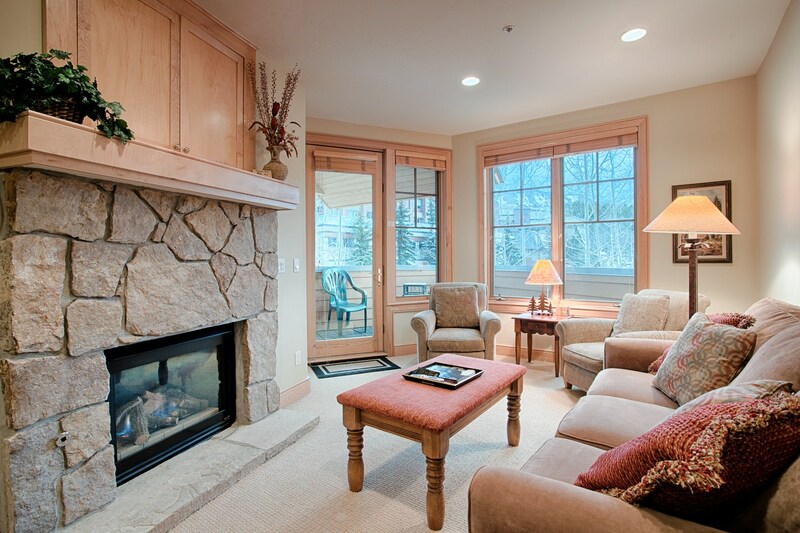 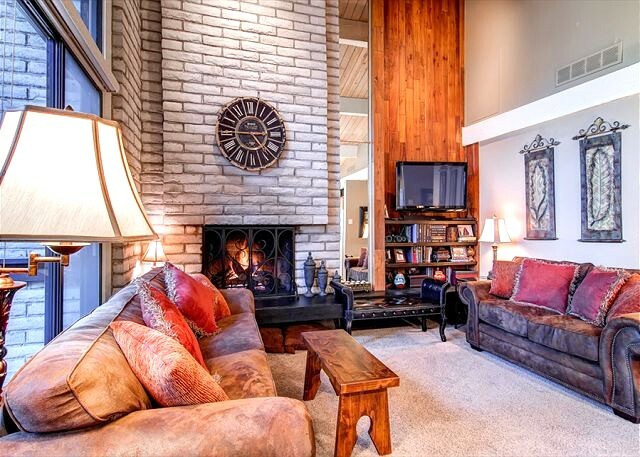 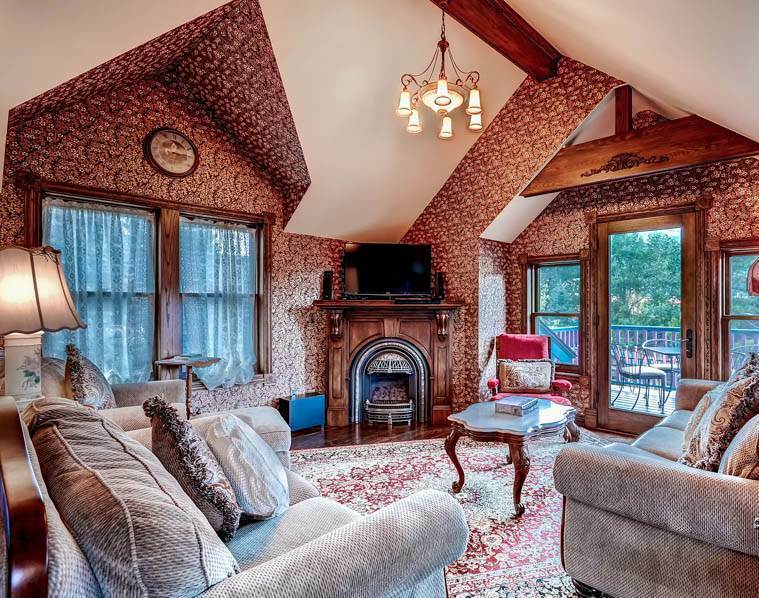 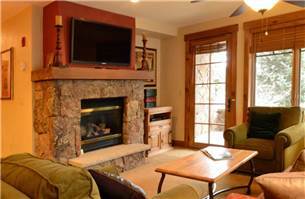 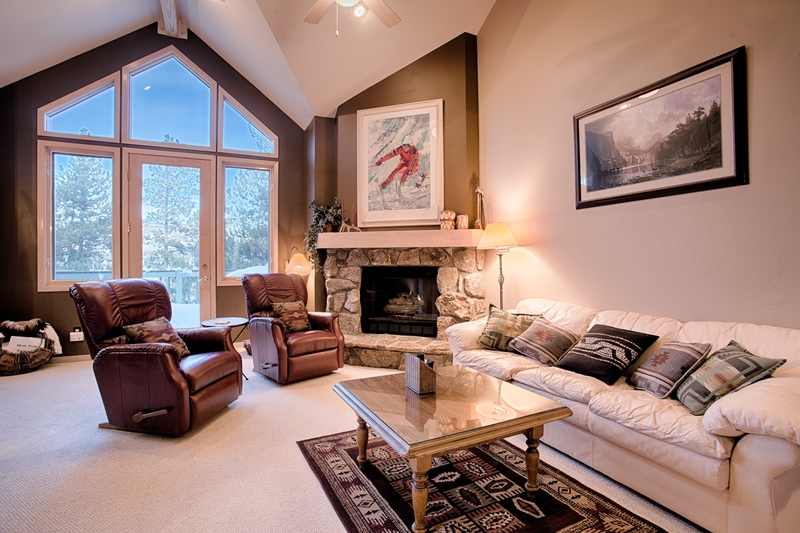 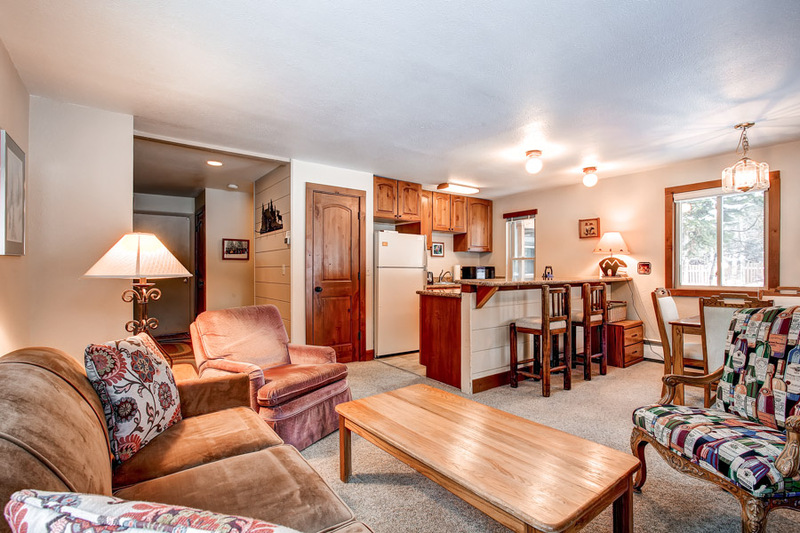 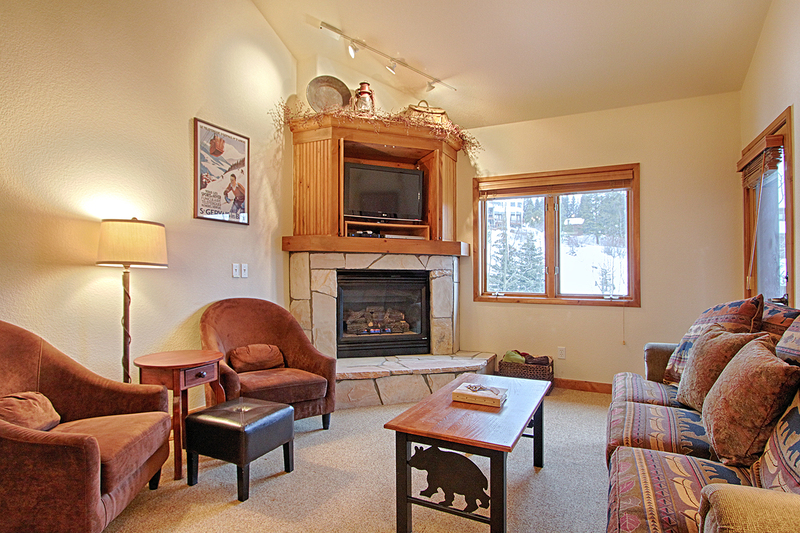 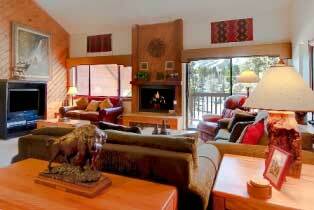 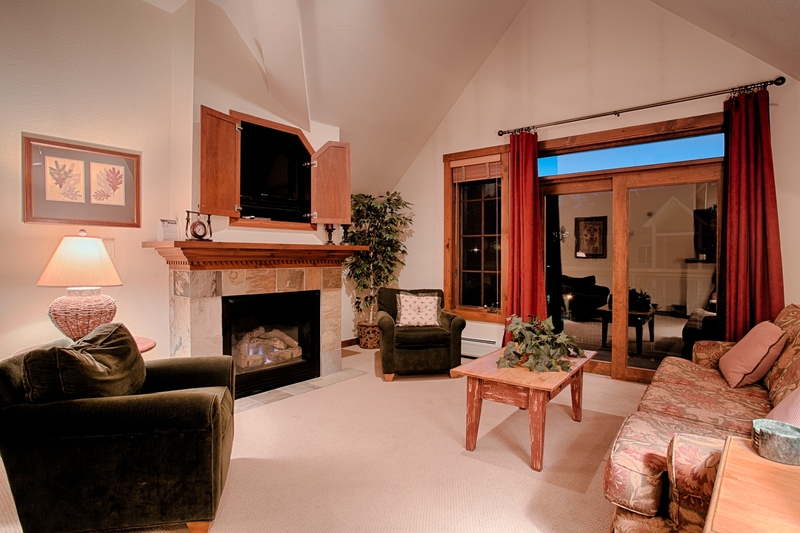 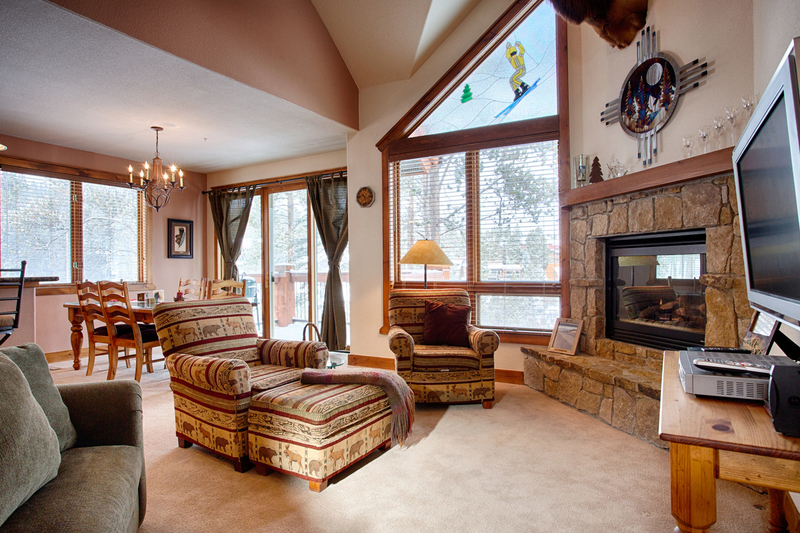 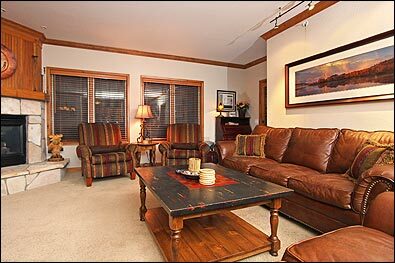 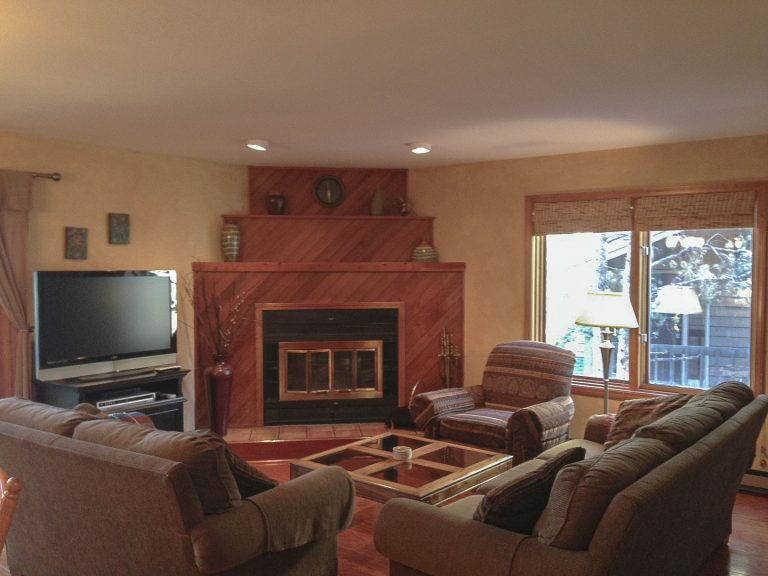 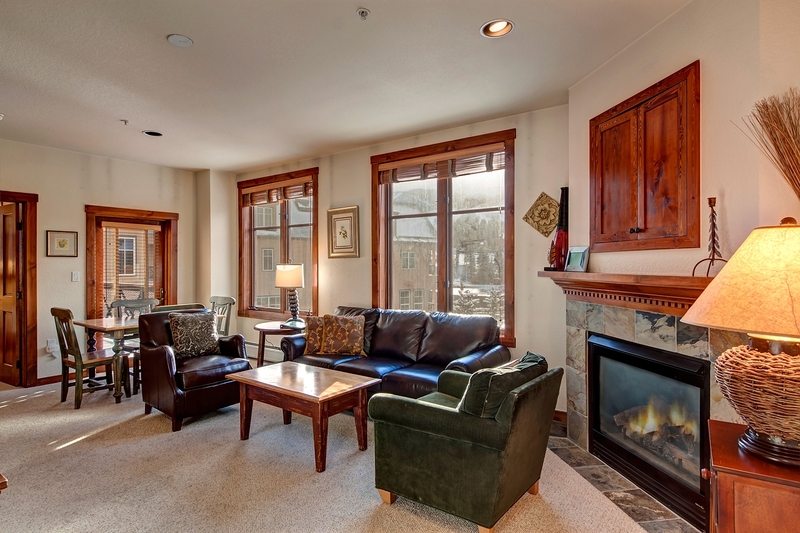 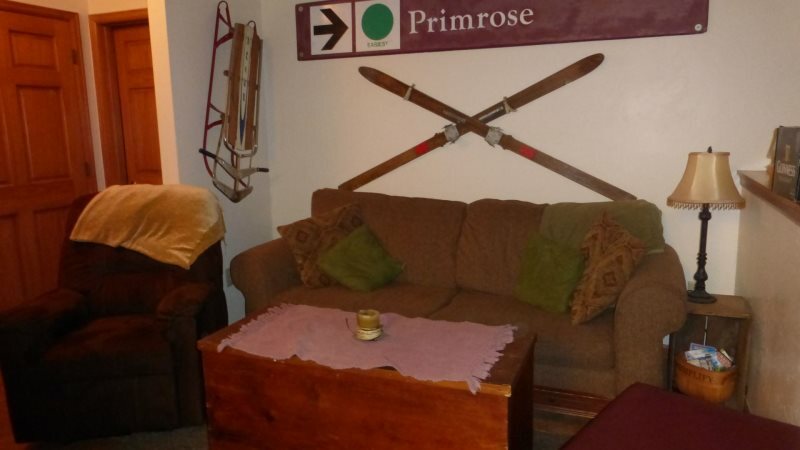 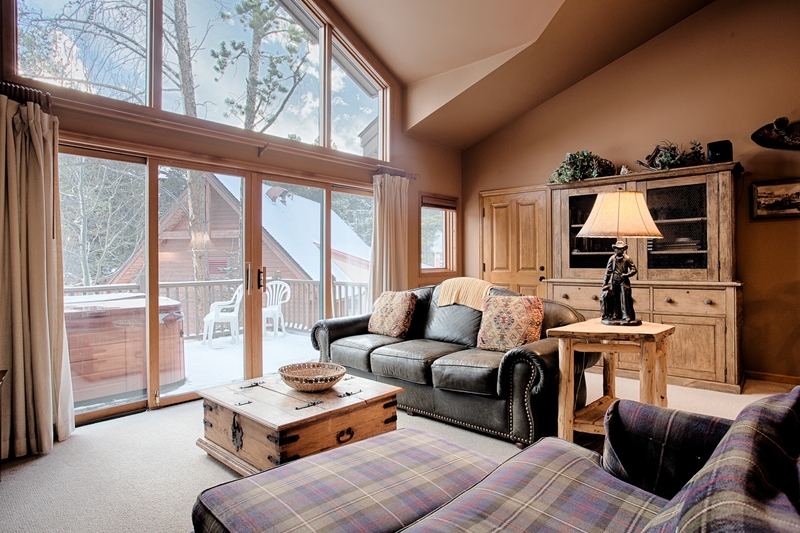 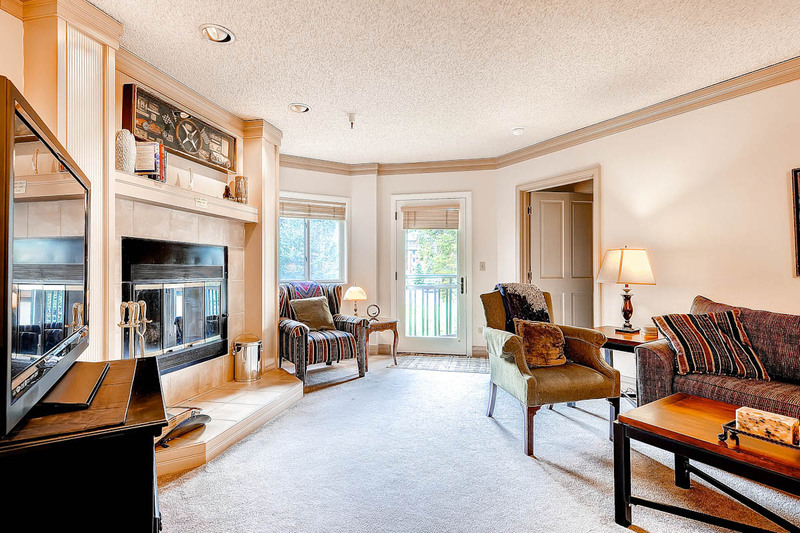 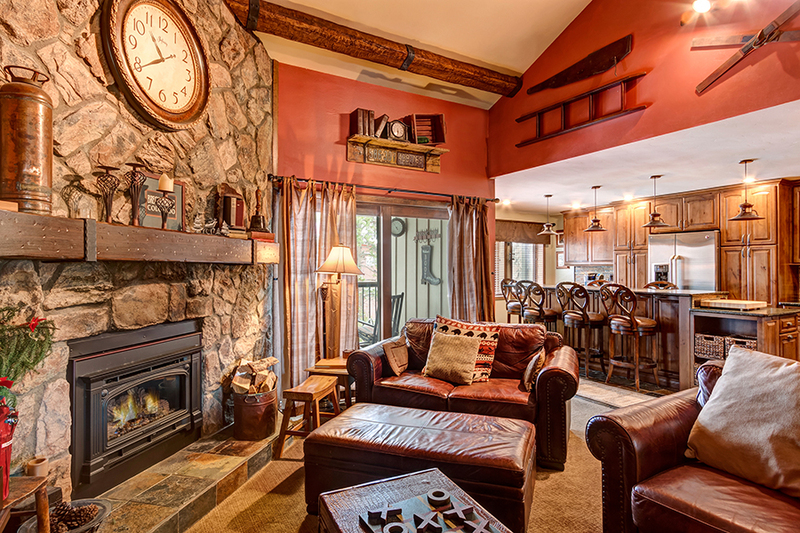 Enjoy your vacation book with a cup of hot cocoa in the side room off the living room. 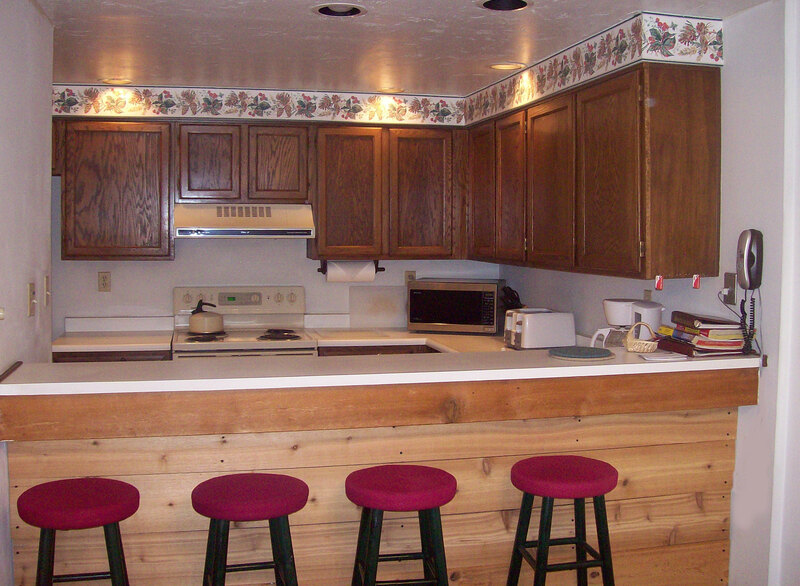 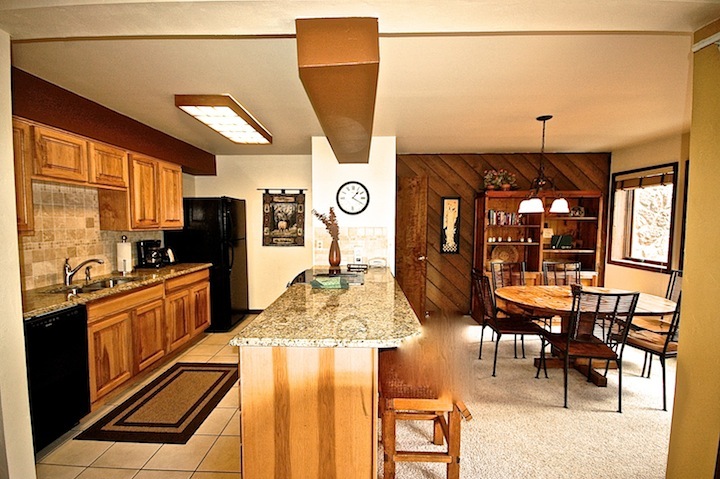 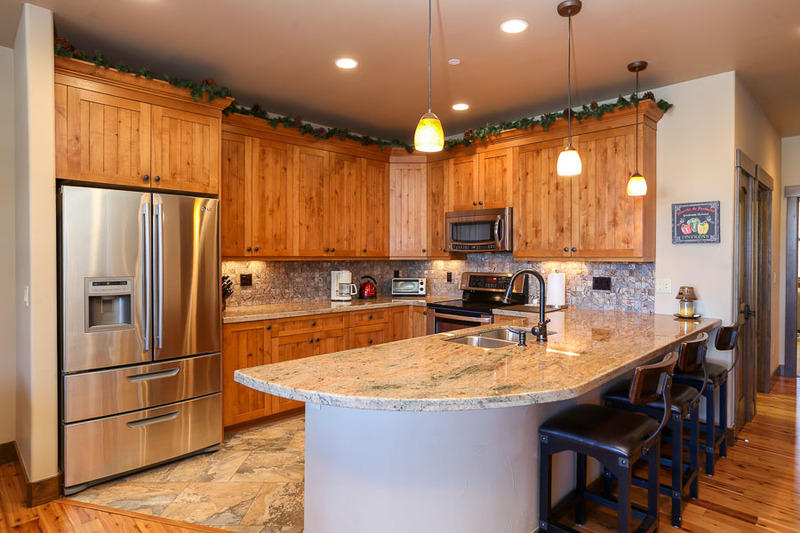 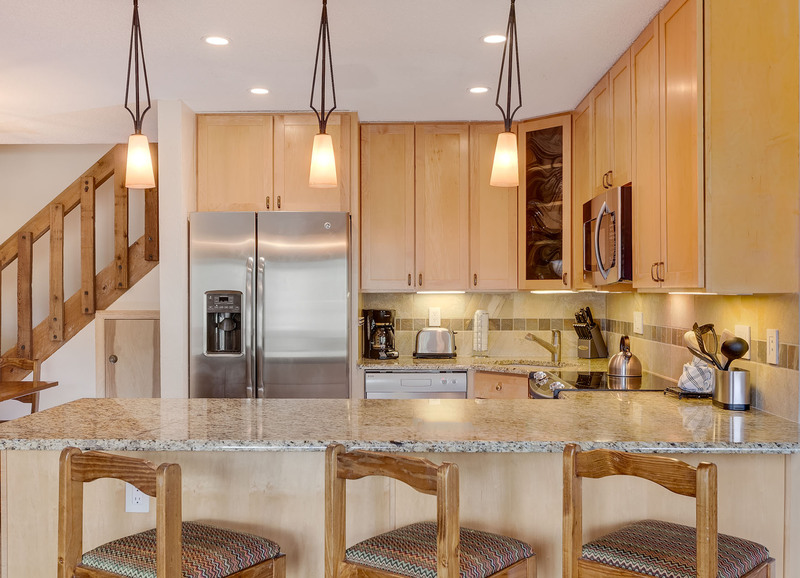 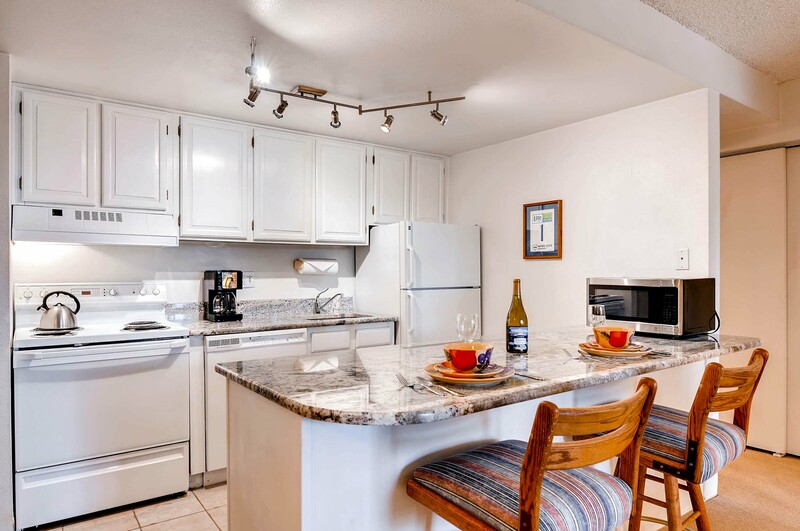 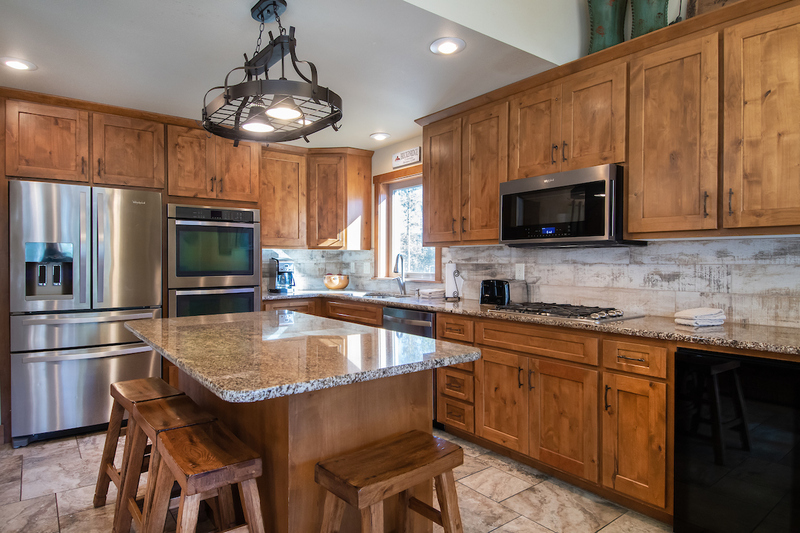 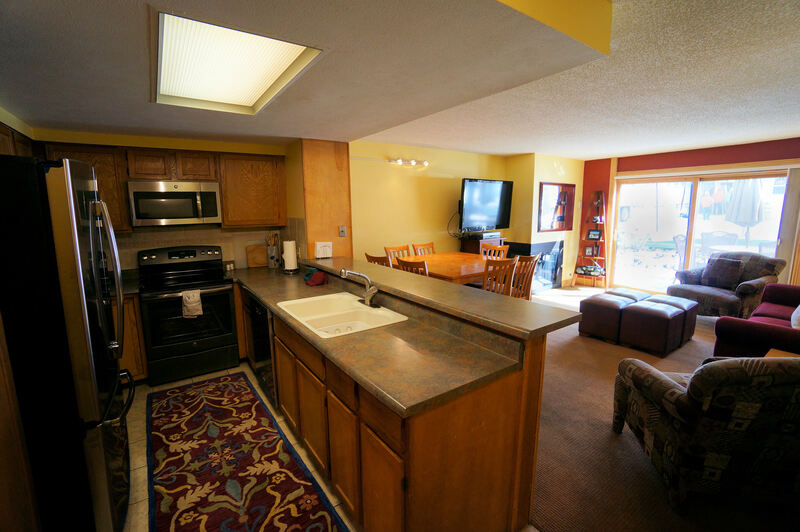 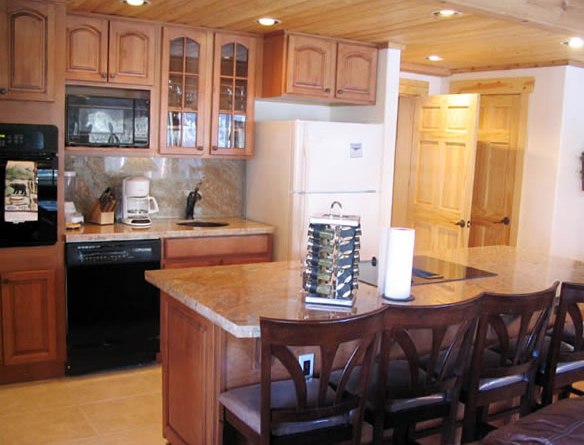 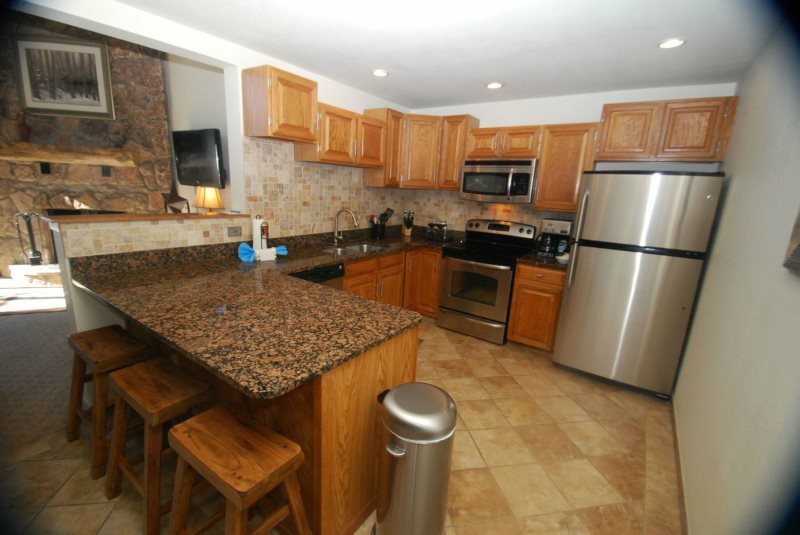 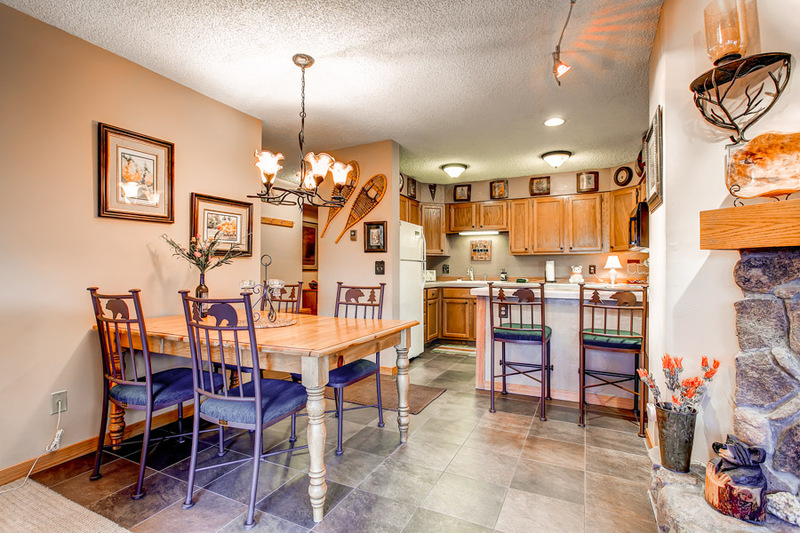 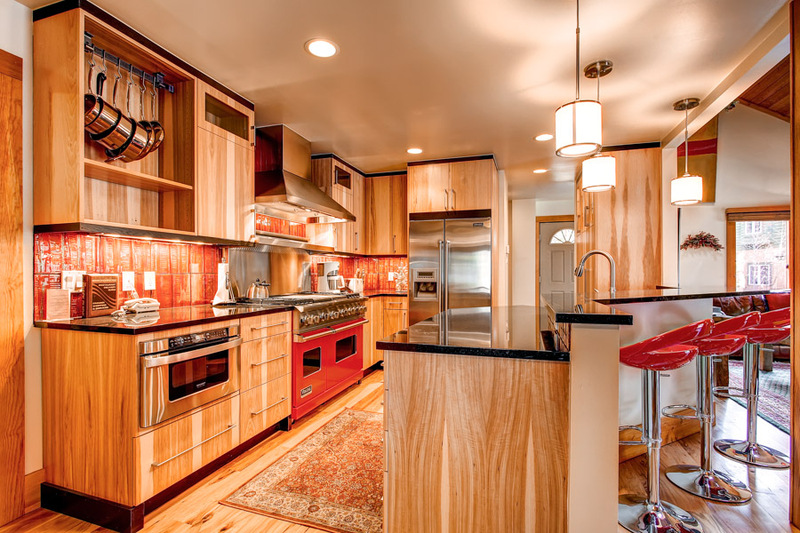 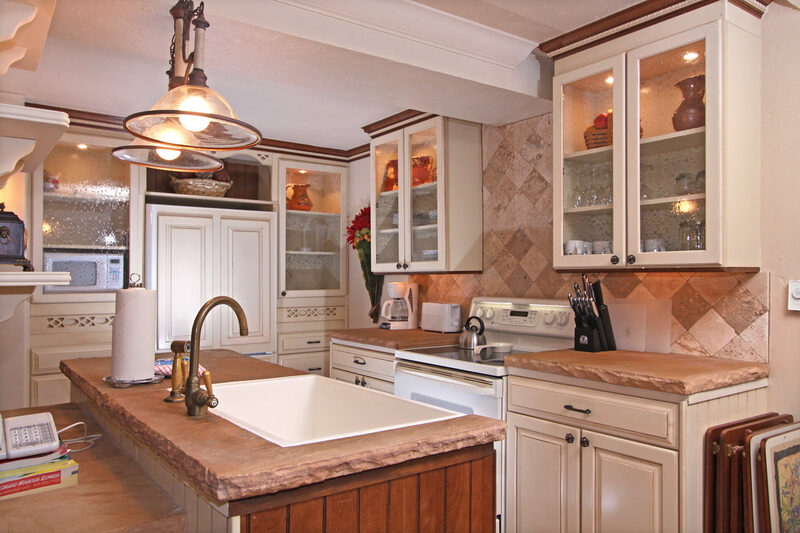 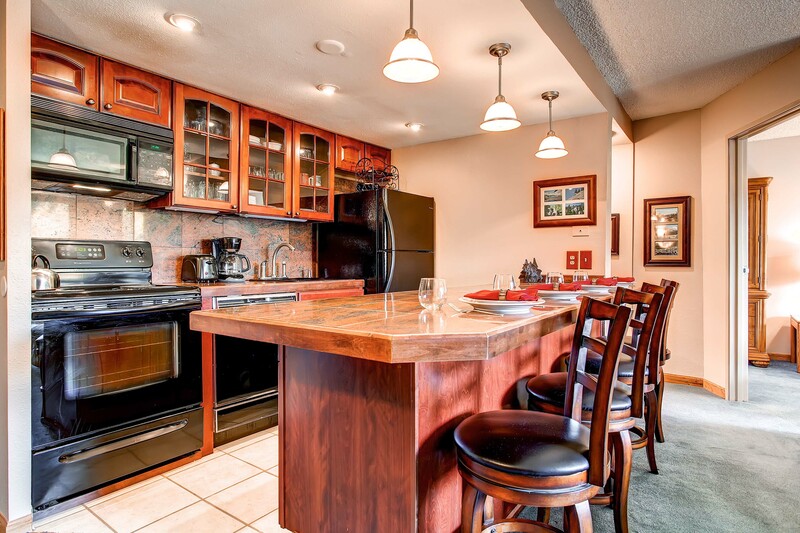 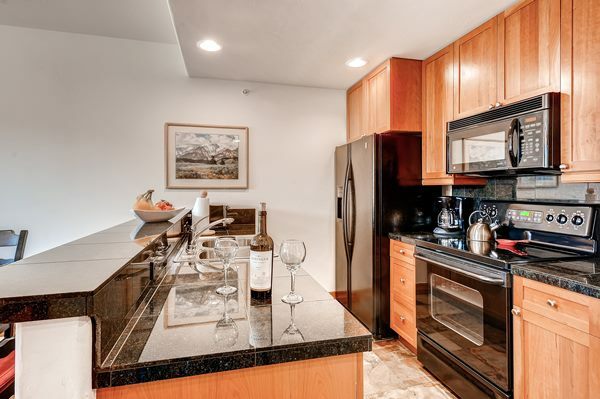 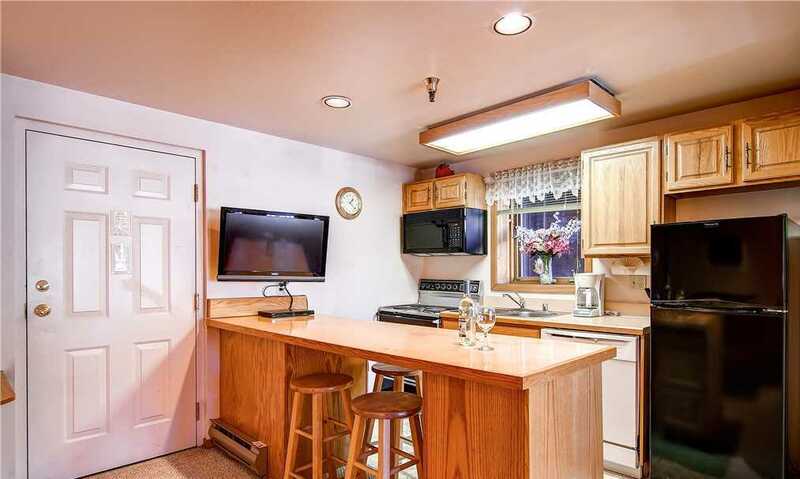 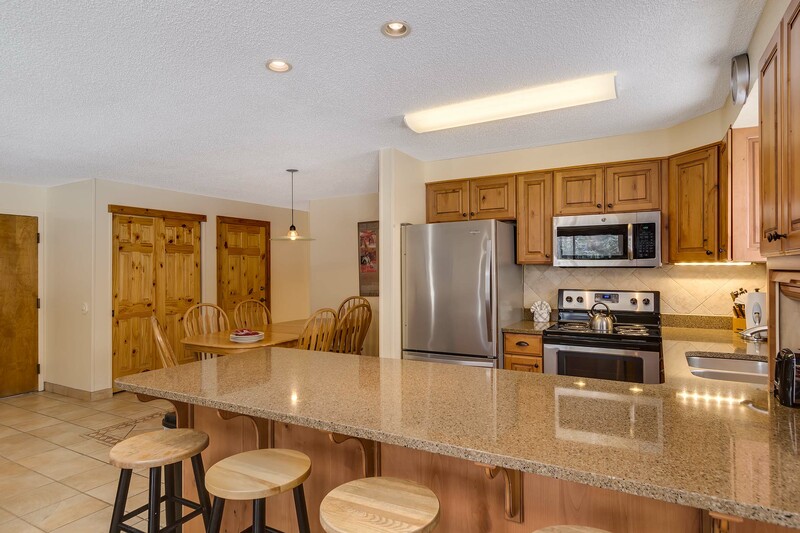 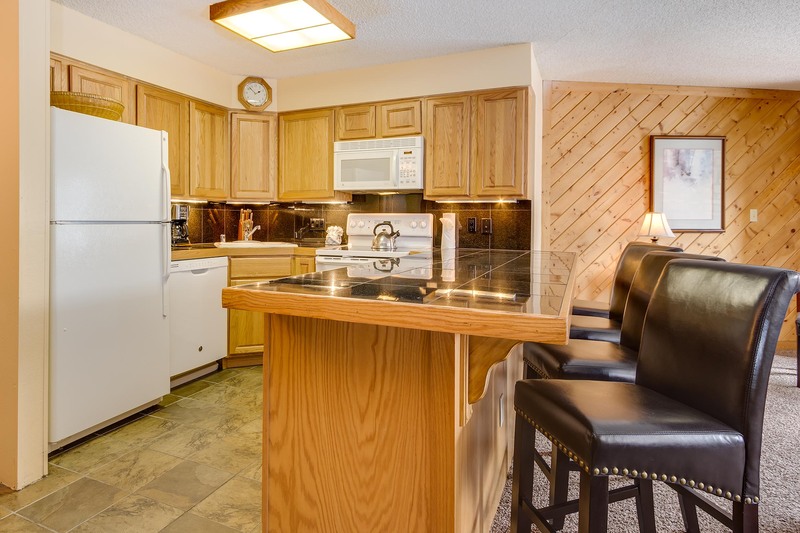 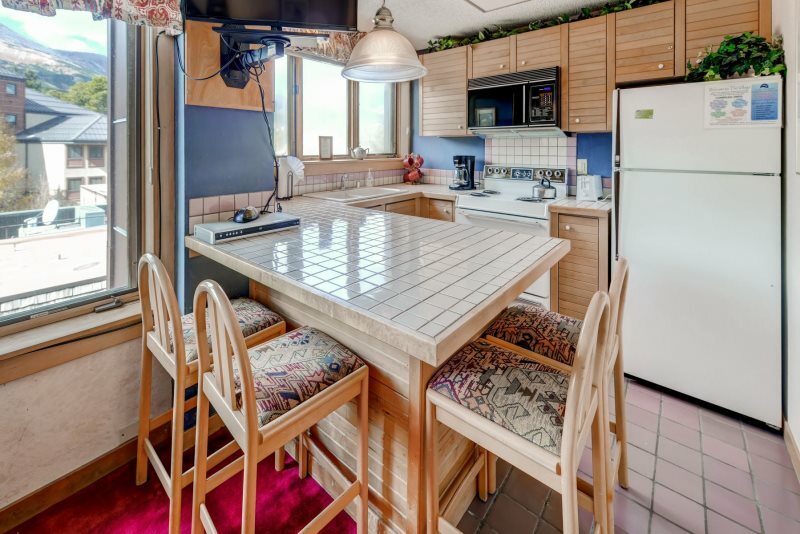 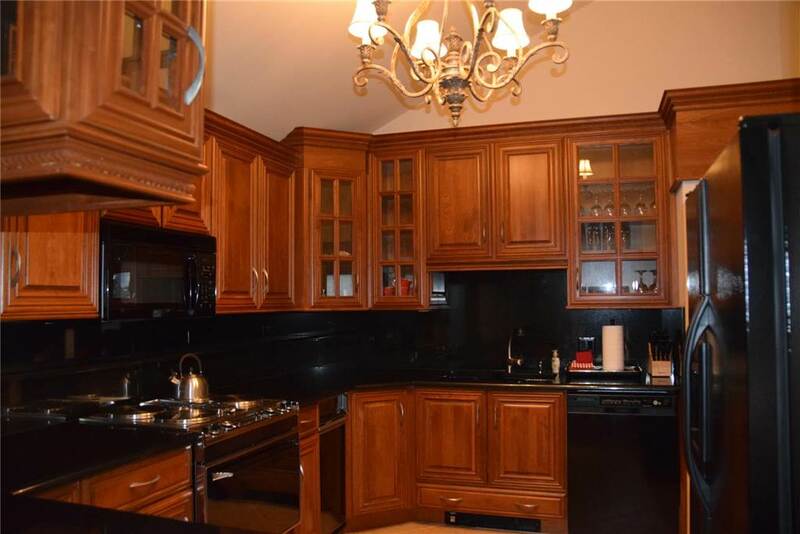 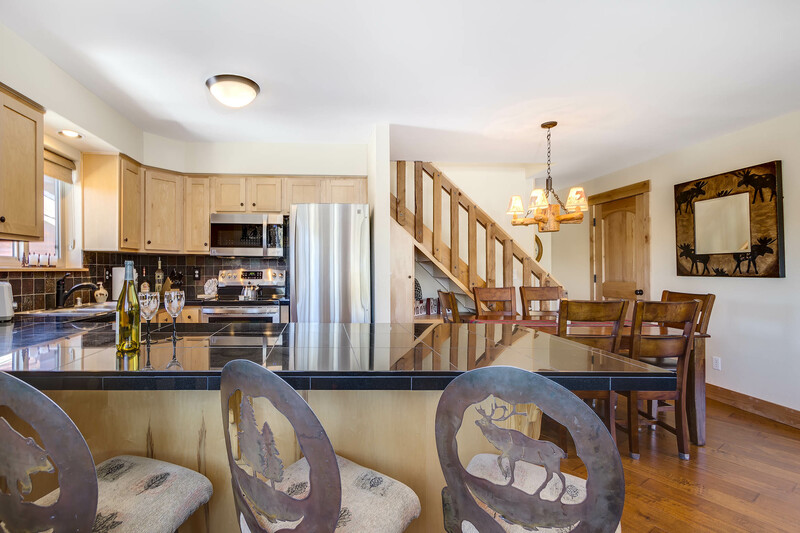 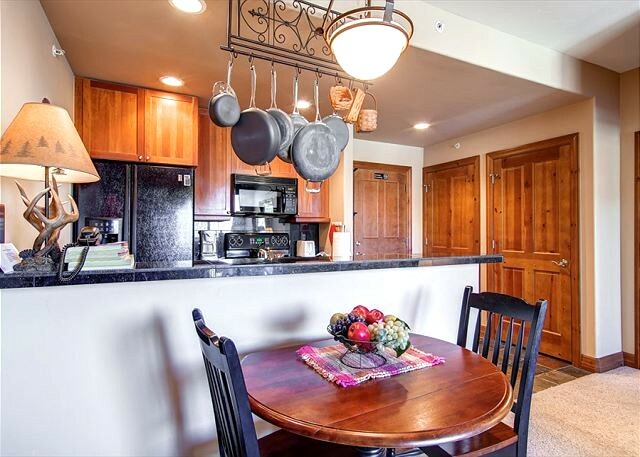 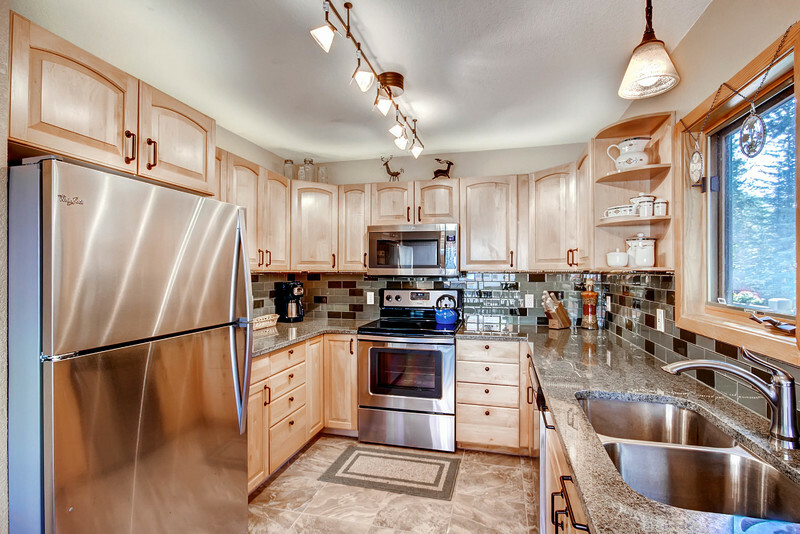 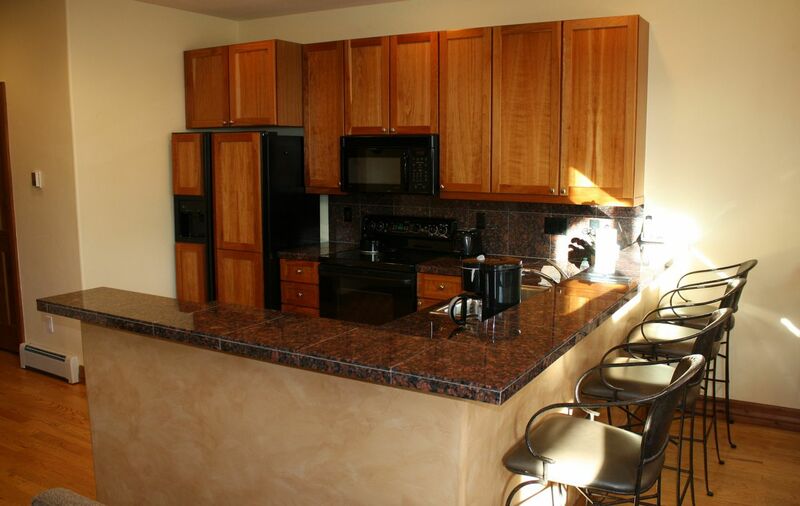 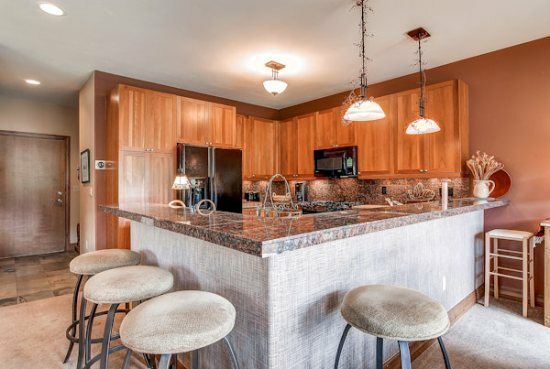 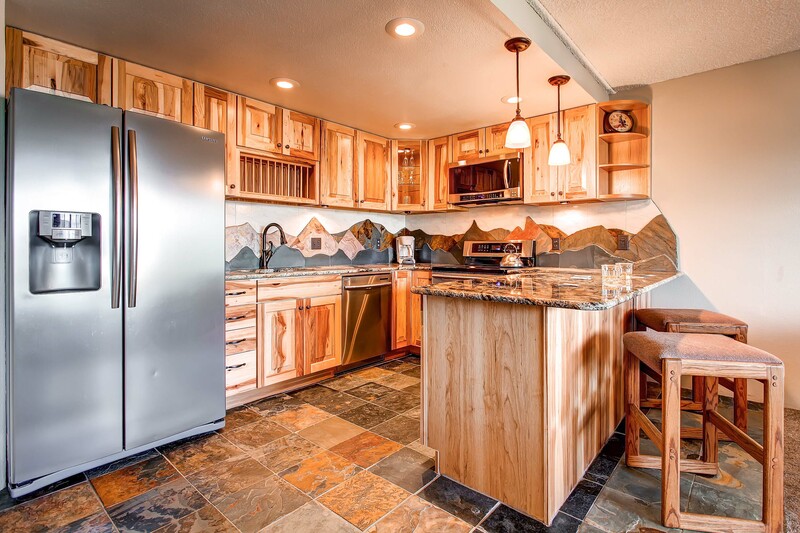 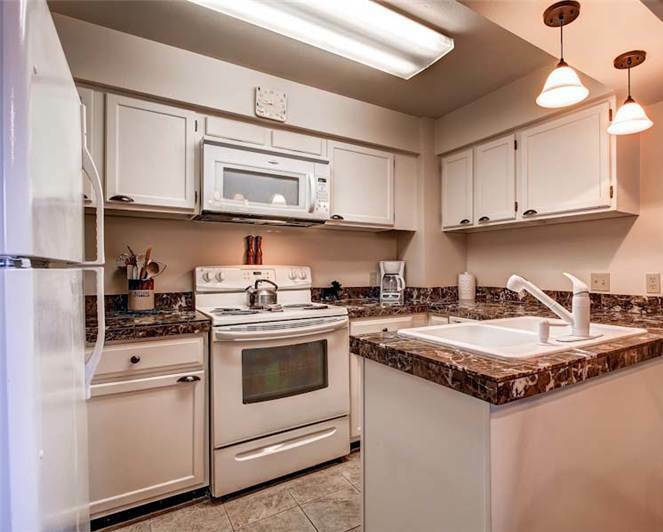 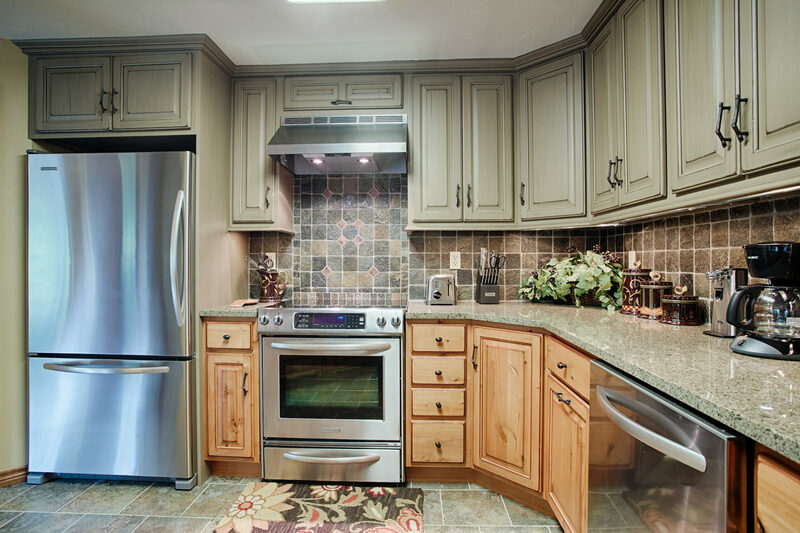 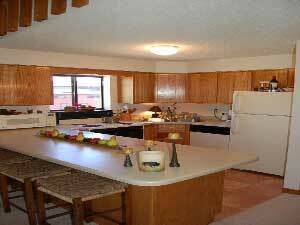 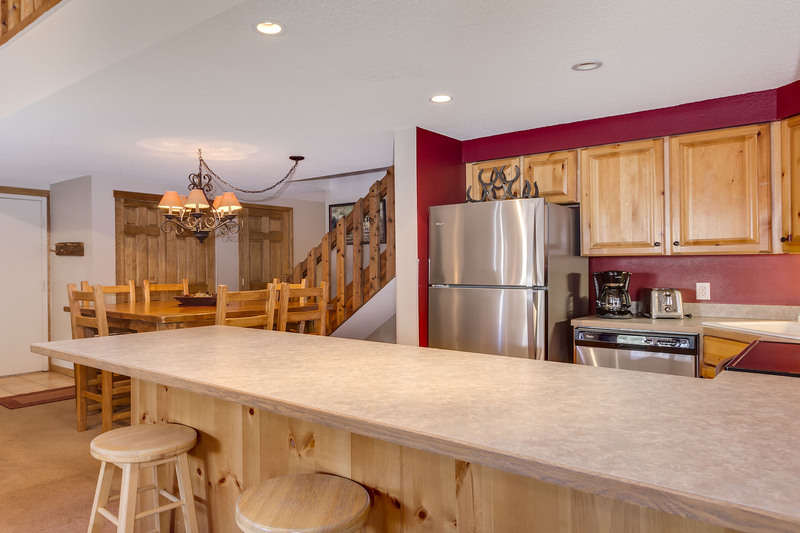 The kitchen has all the amenities of home and is the perfect space for entertaining and cooking your favorite meal in the comfort of your own vacation rental. 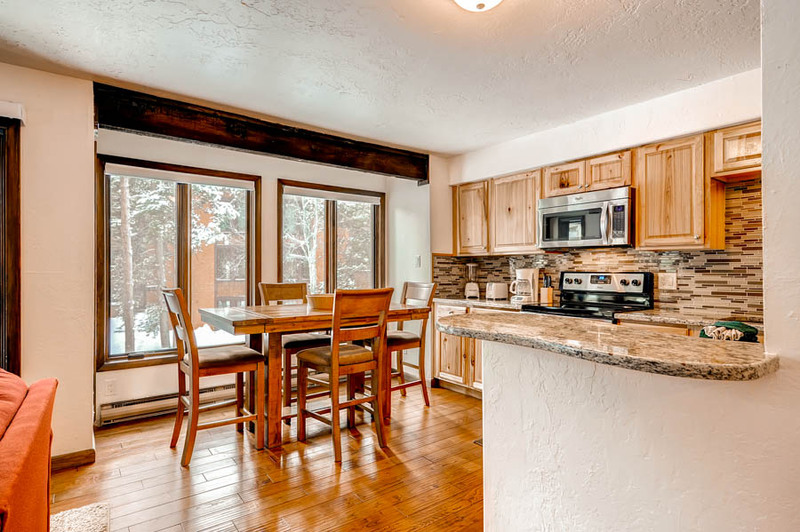 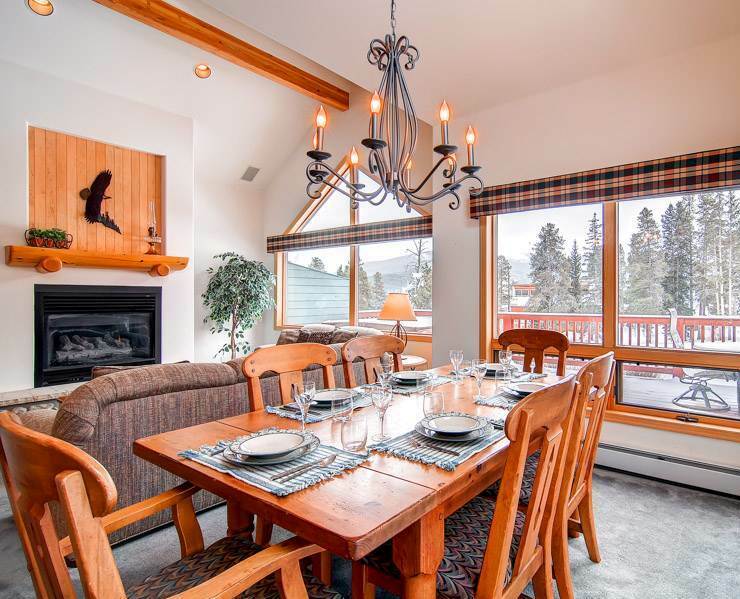 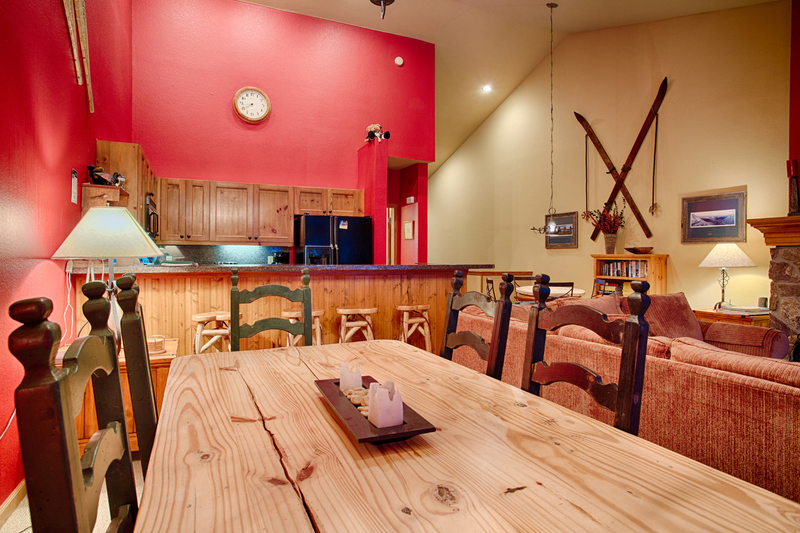 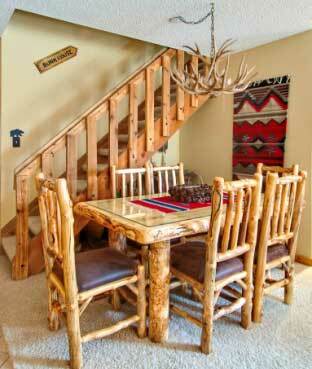 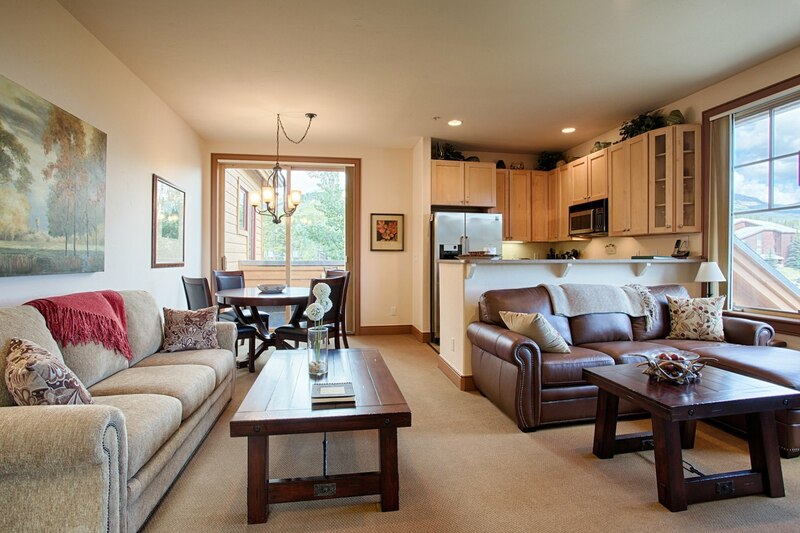 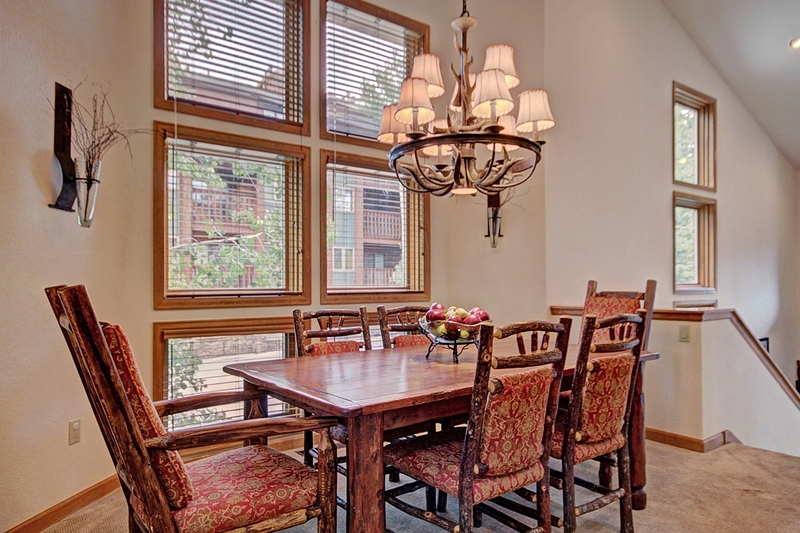 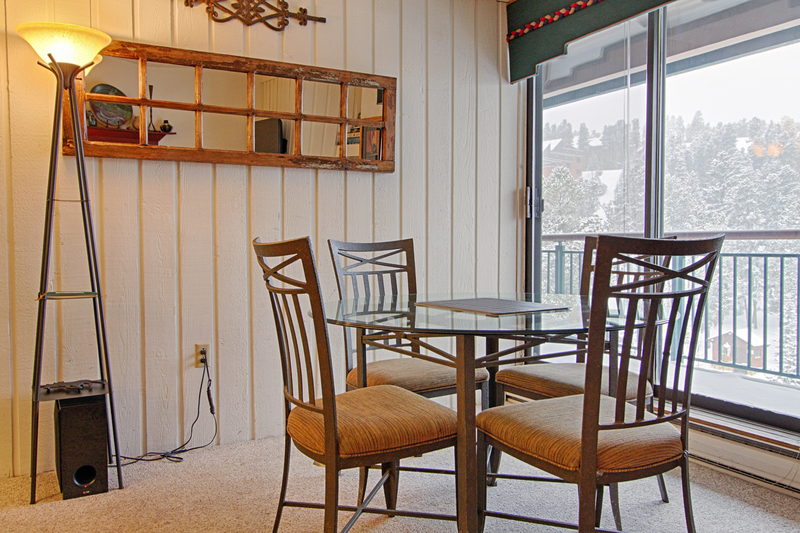 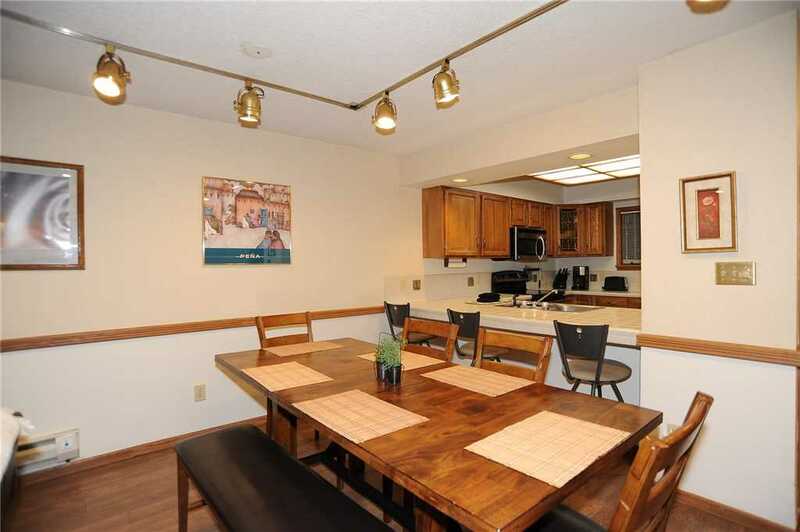 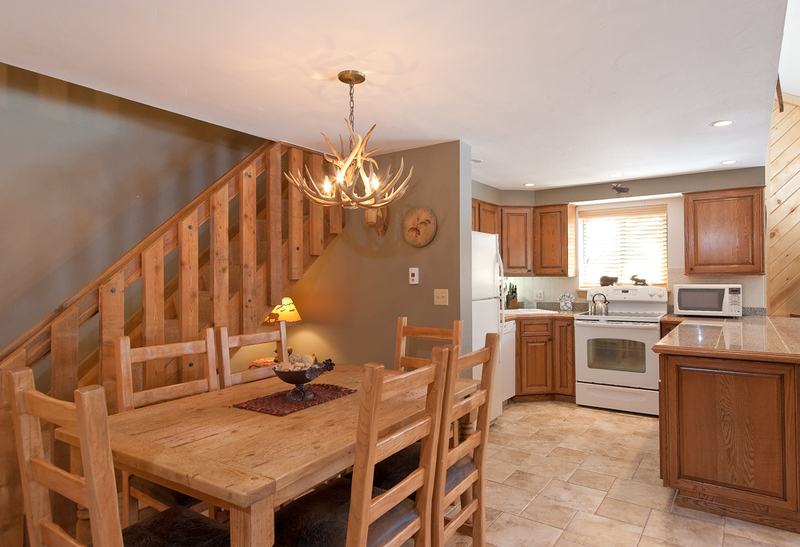 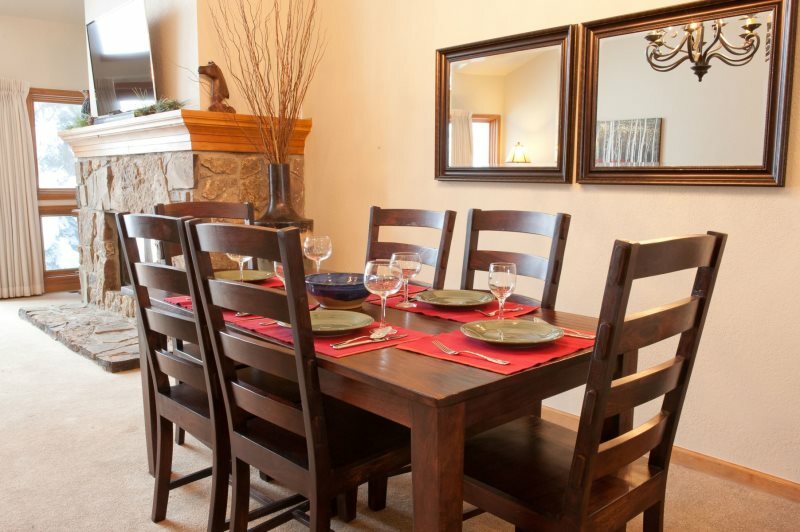 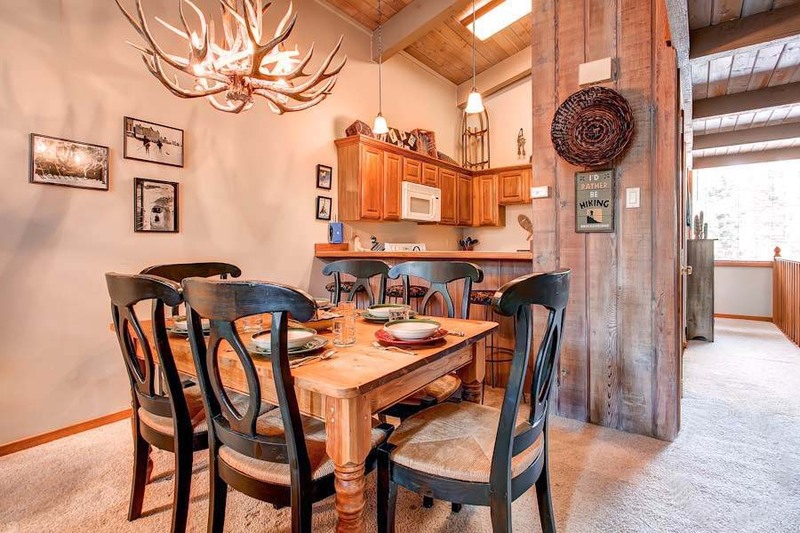 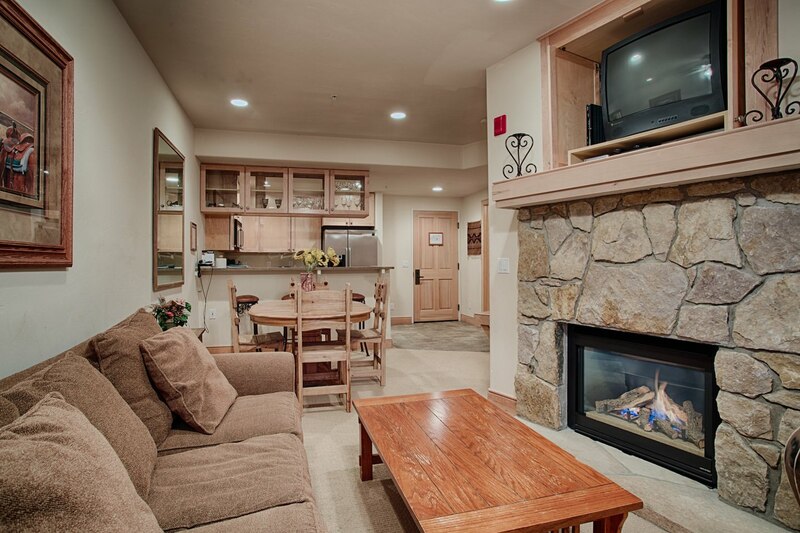 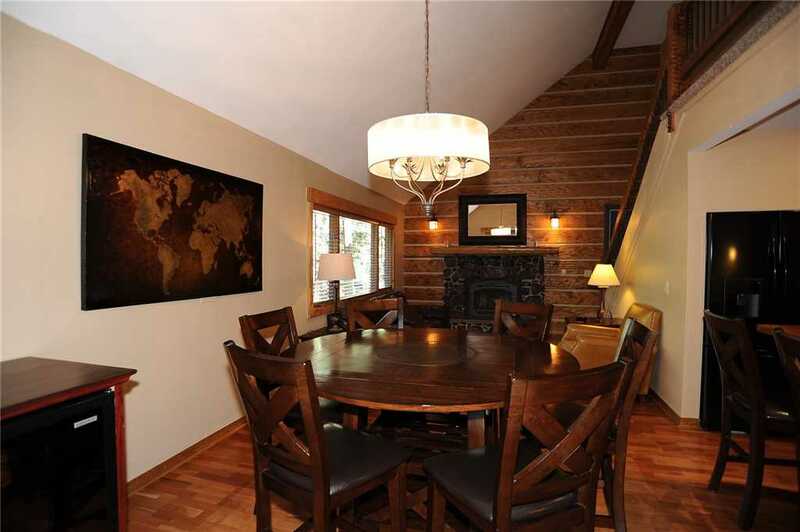 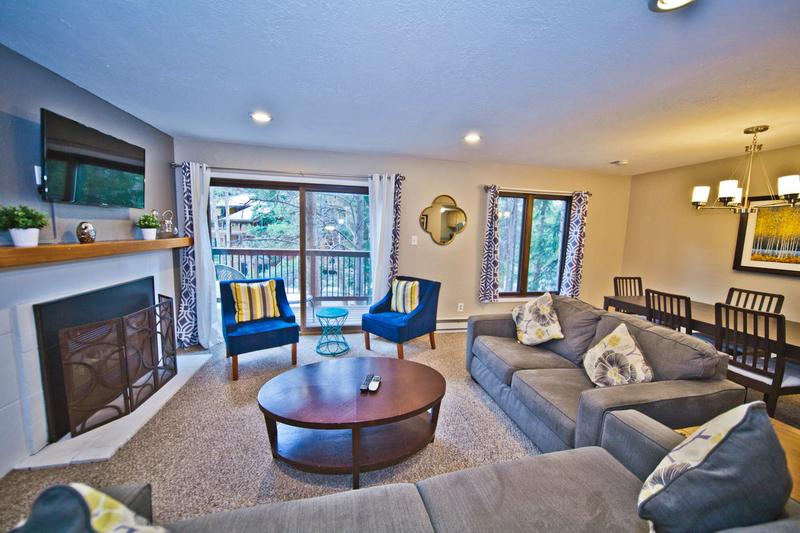 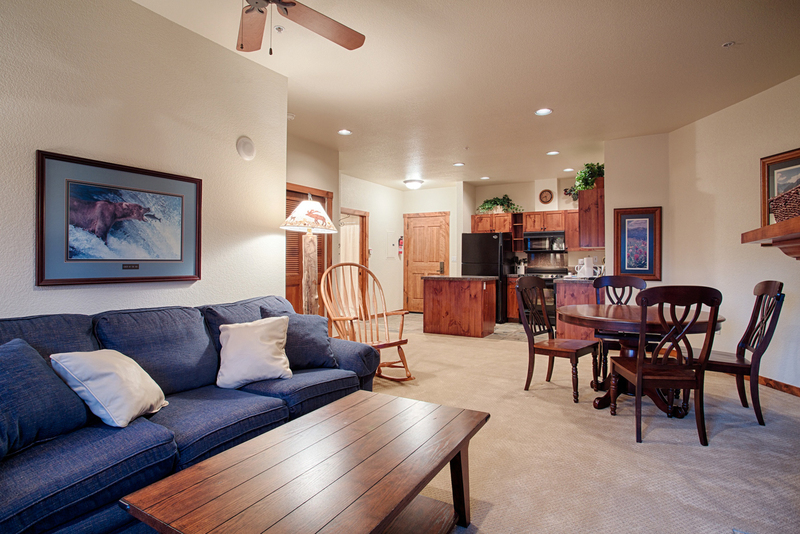 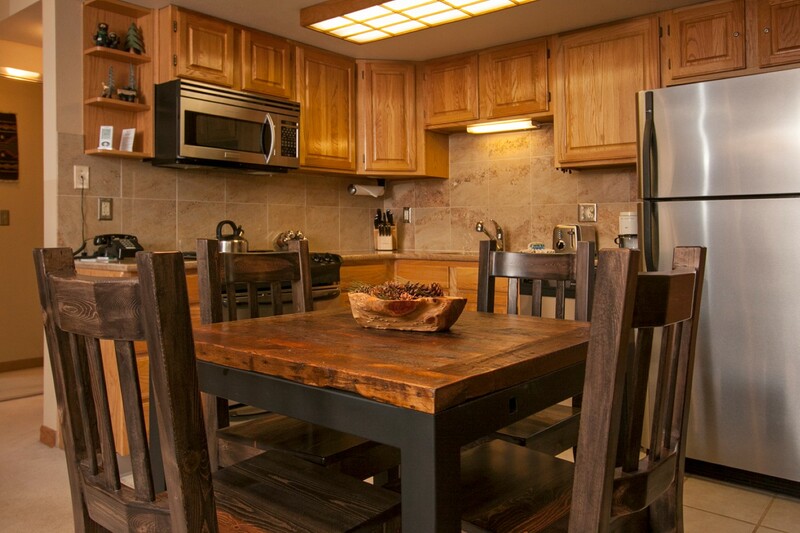 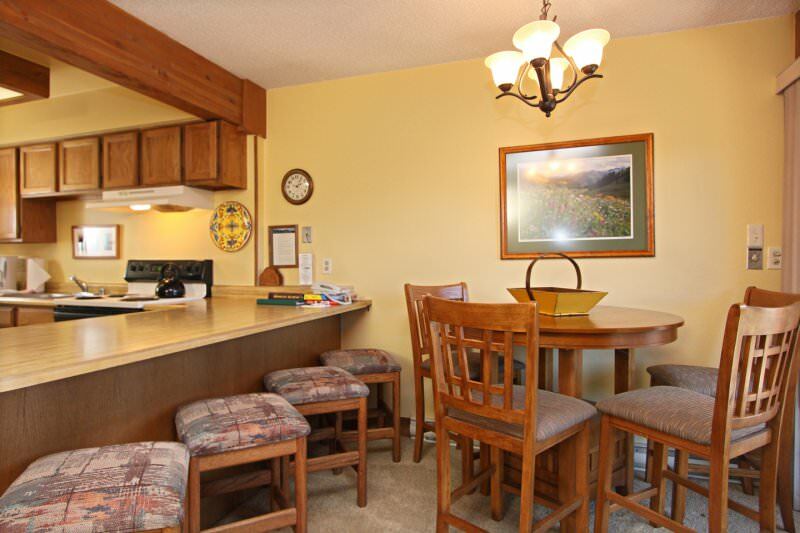 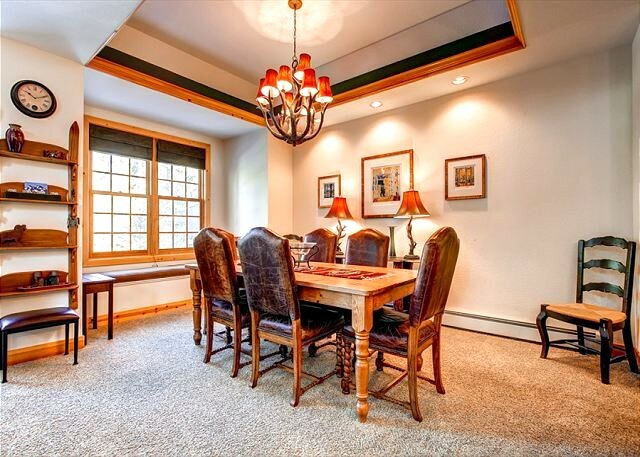 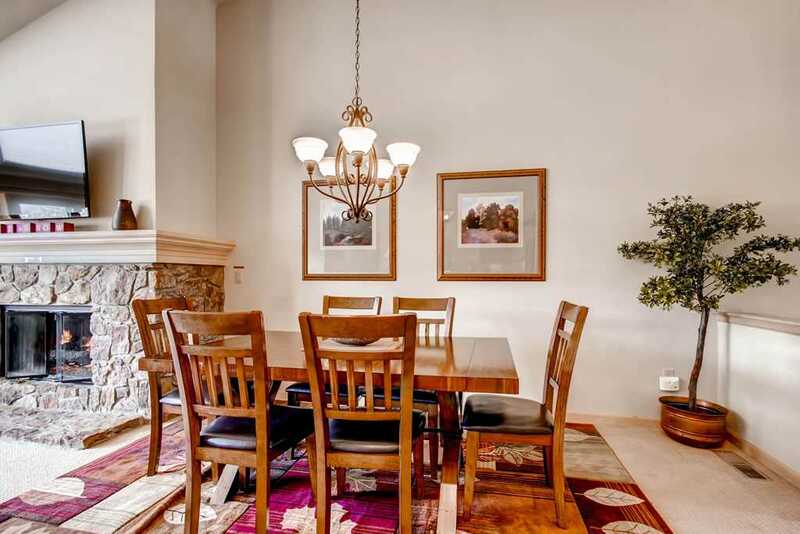 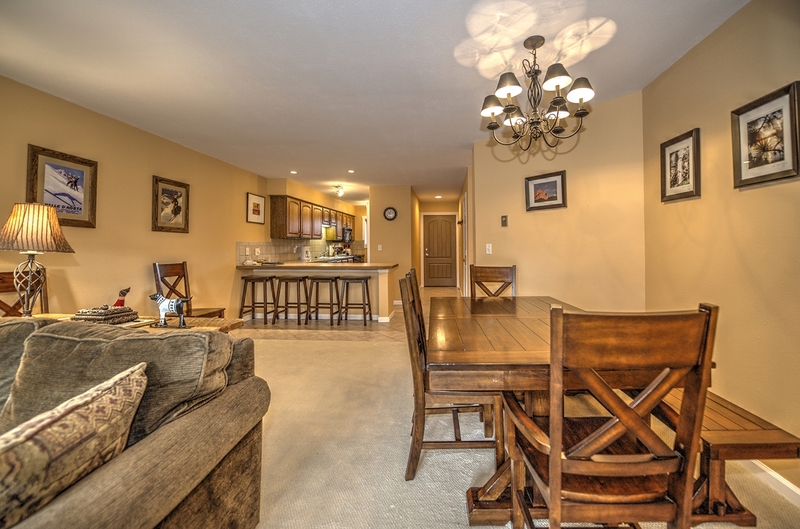 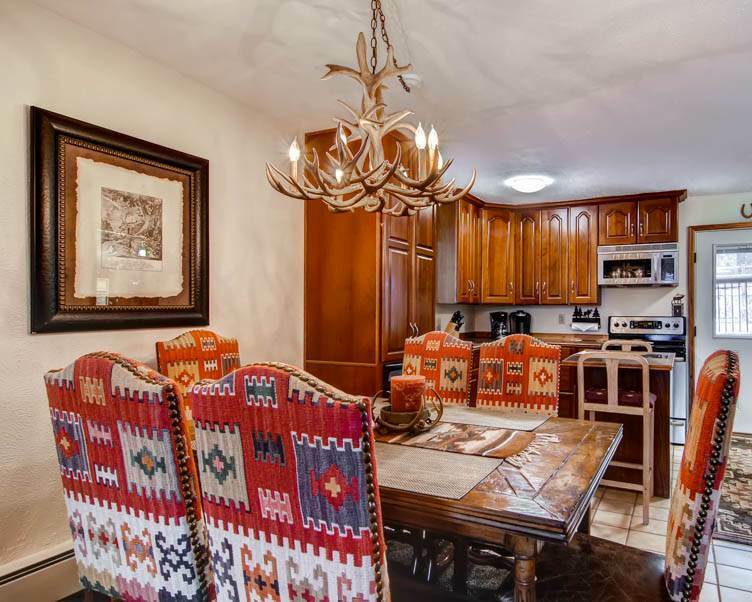 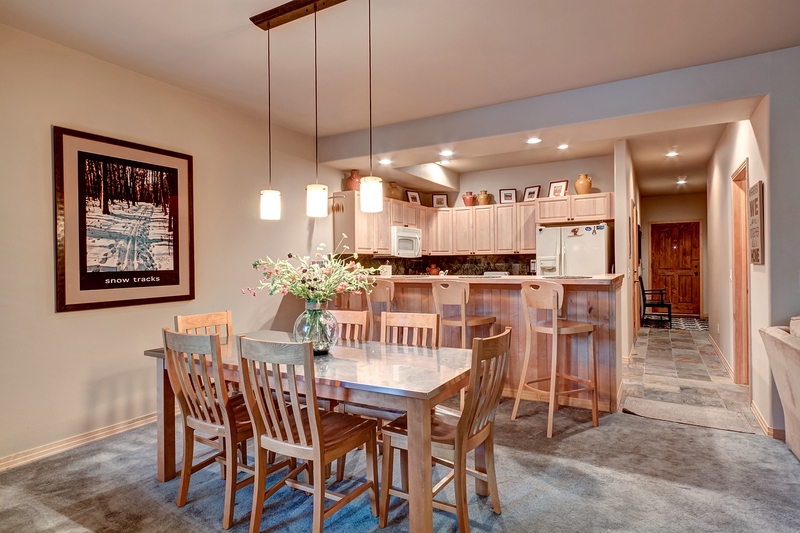 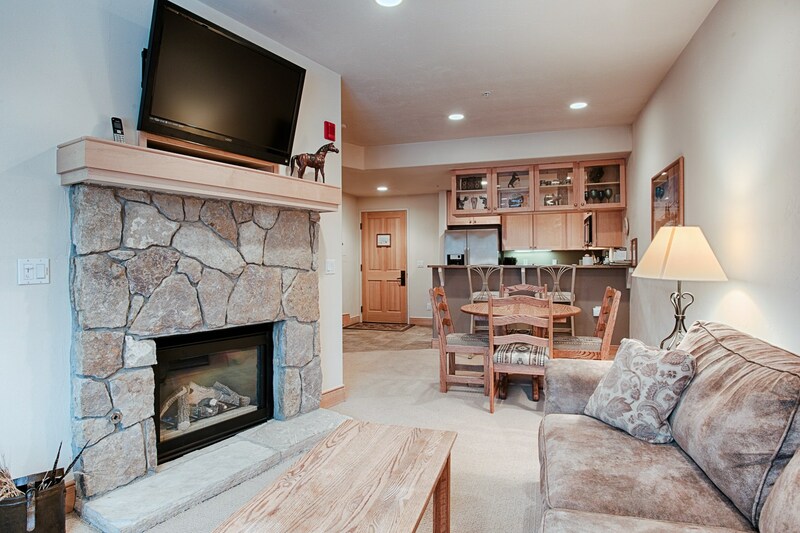 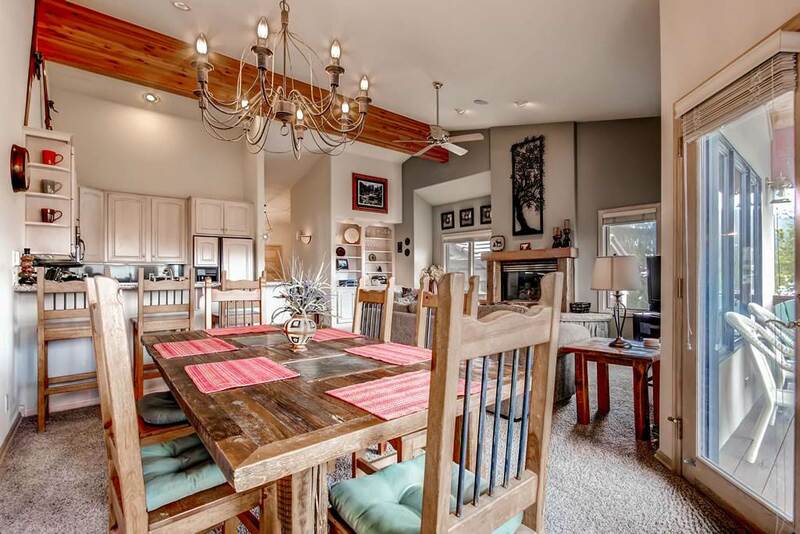 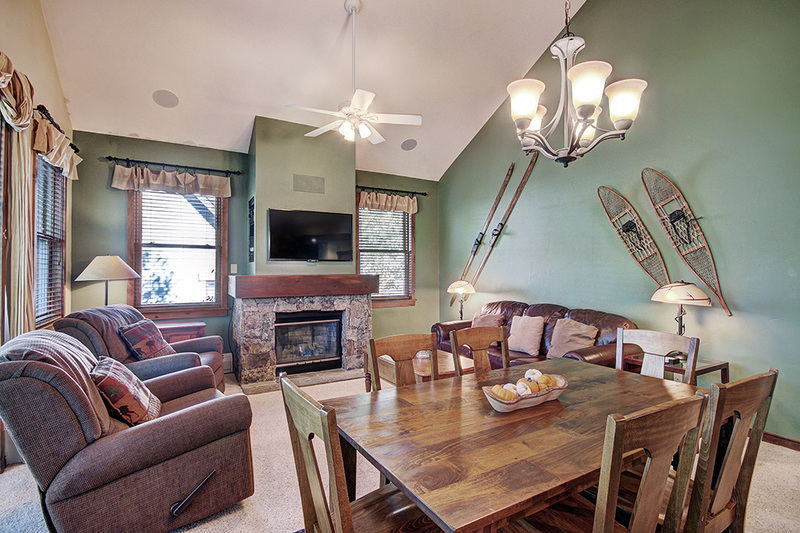 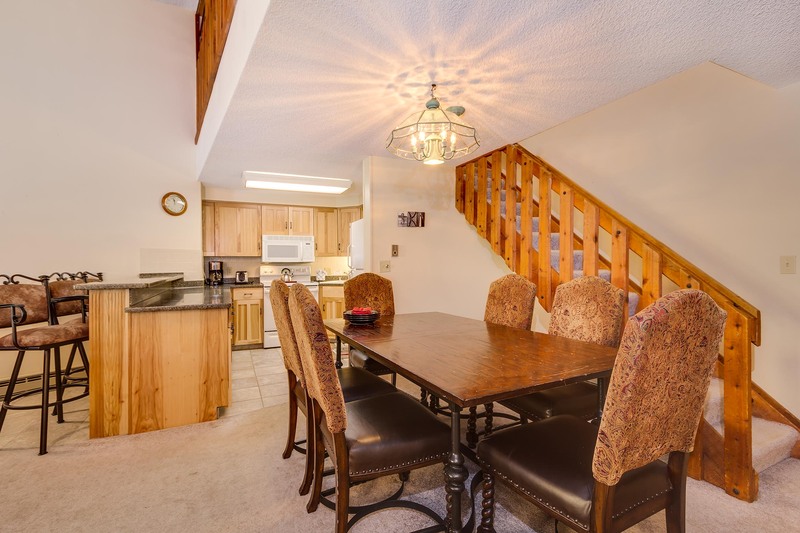 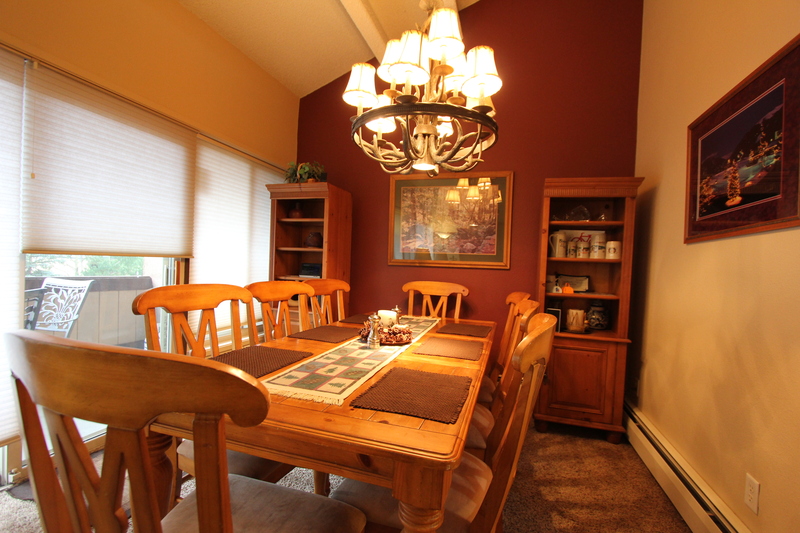 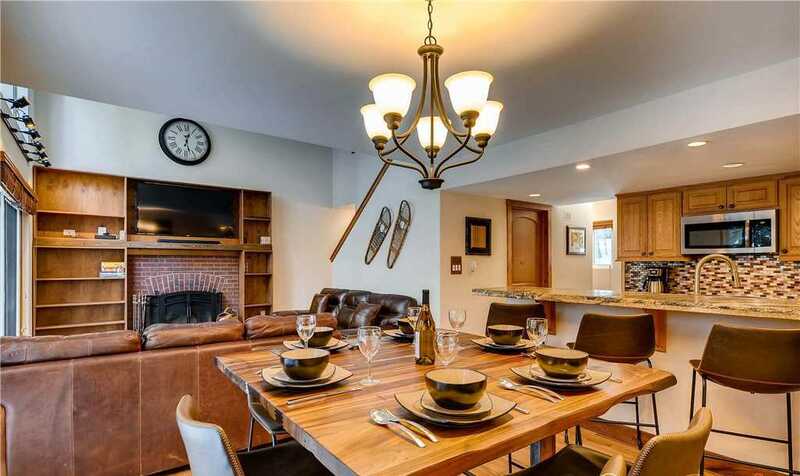 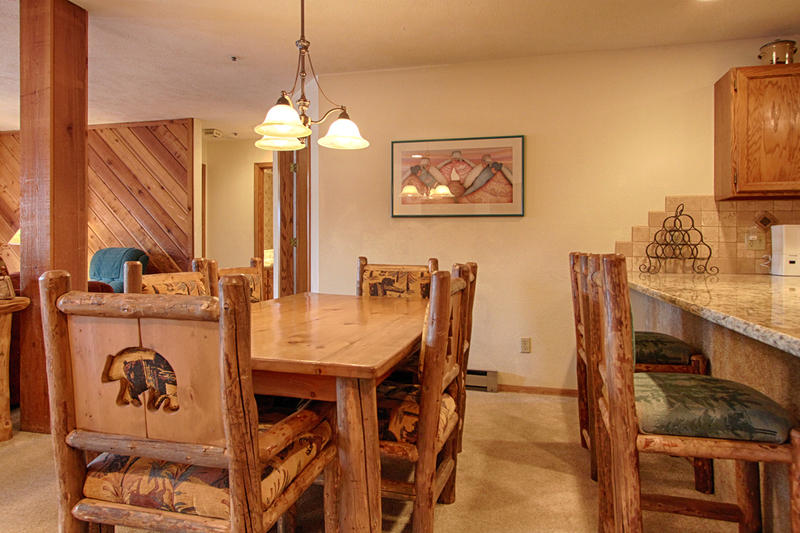 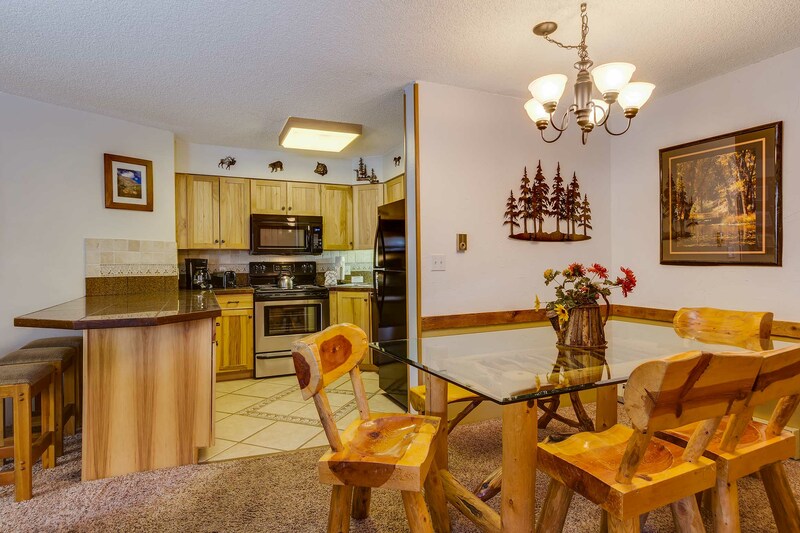 Enjoy your mountain meal in the comfort of your own townhome at the wood dining table with seating for ten. 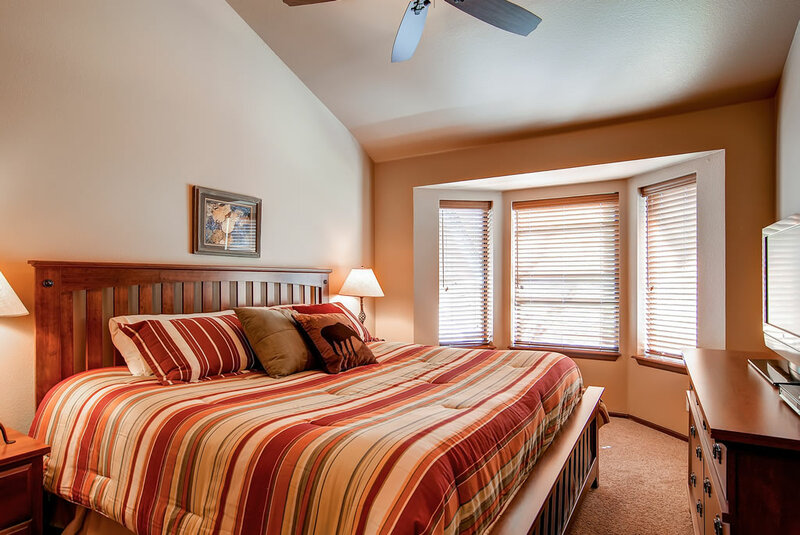 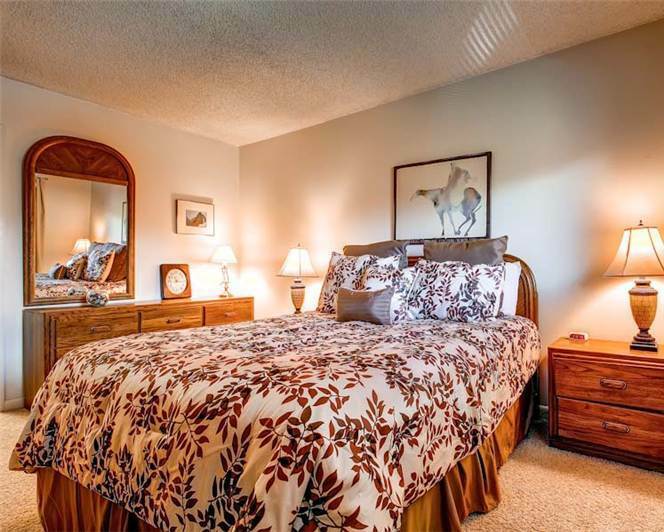 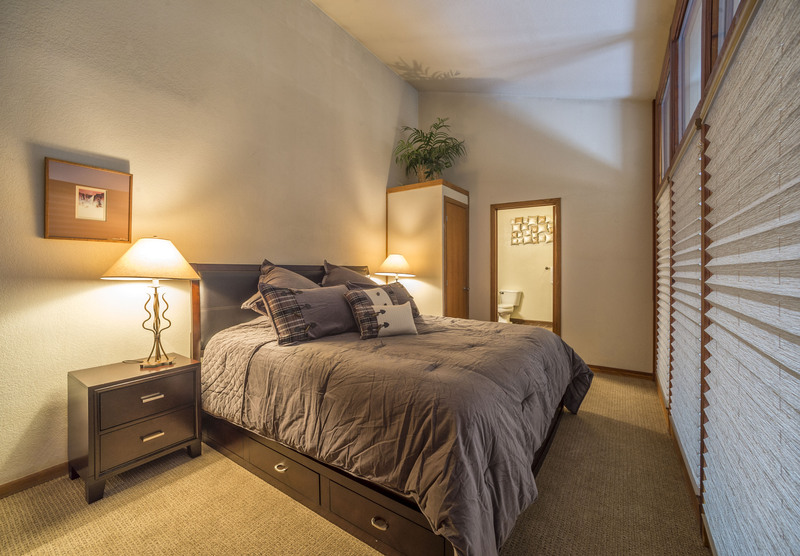 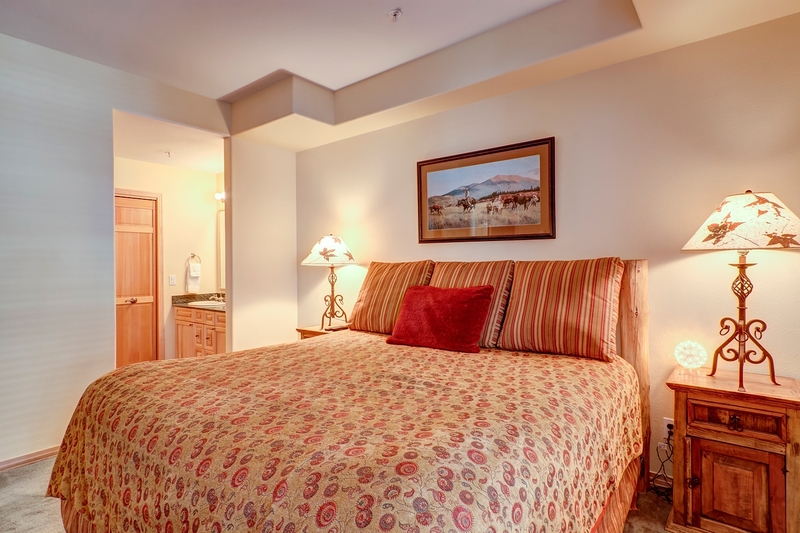 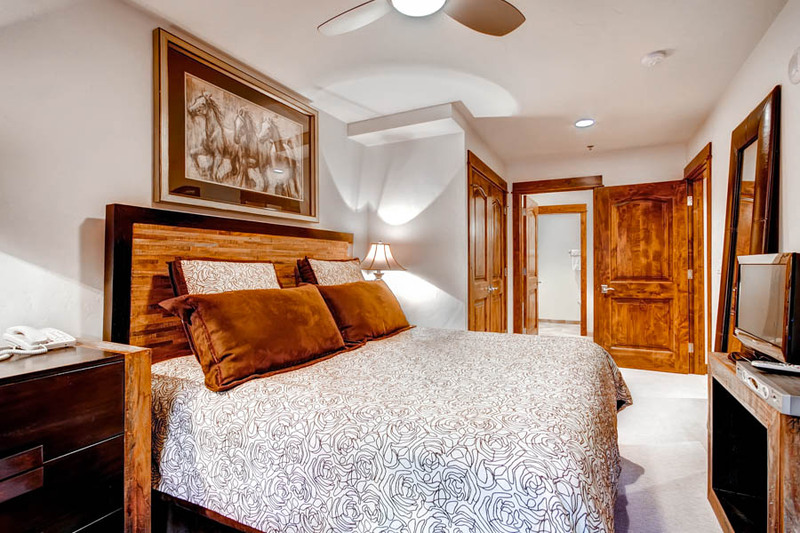 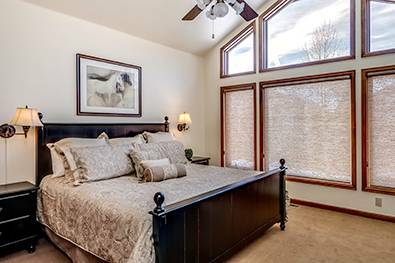 The clean, traditionally decorated master bedroom has a King bed encased in comfortable bedding and features a large window that allows the Colorado sunlight to be your wake up in the morning. 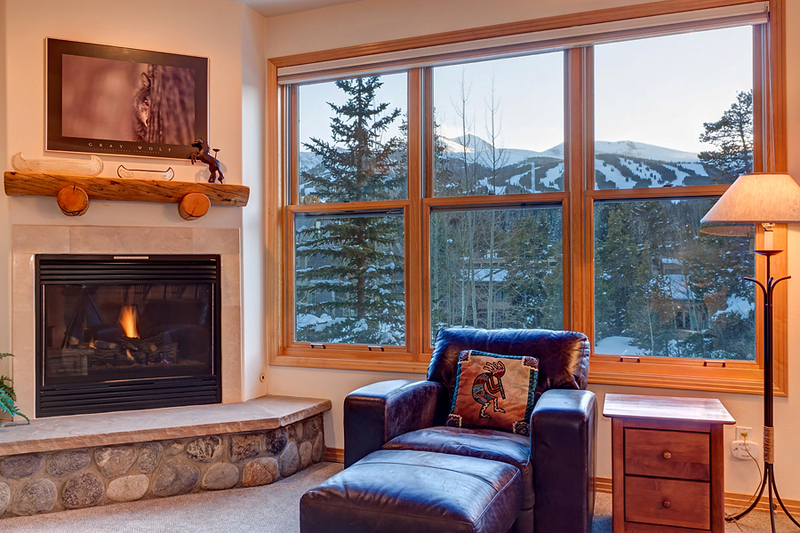 Relax to the scene of Peak 9 and 10 smiling at you. 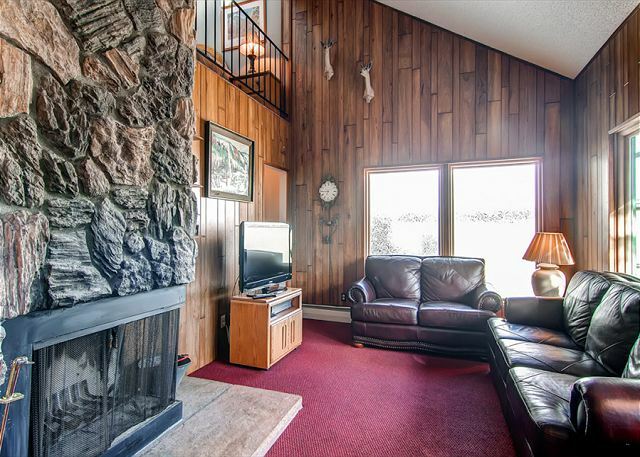 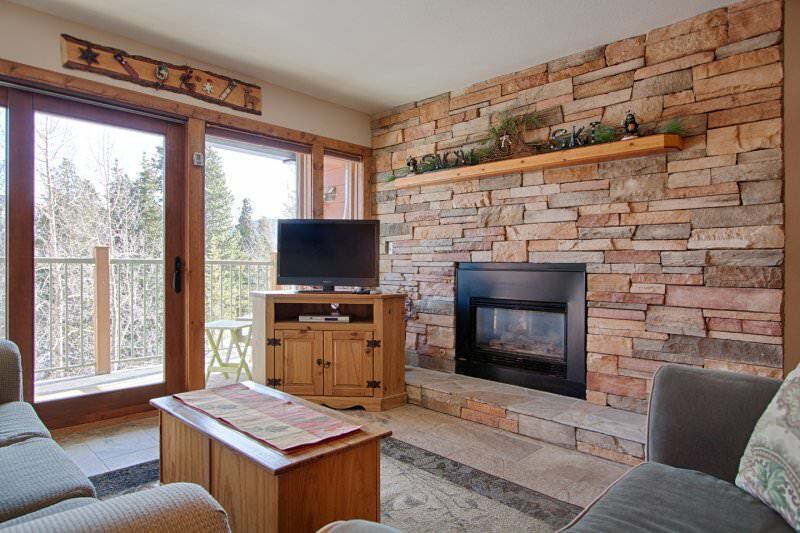 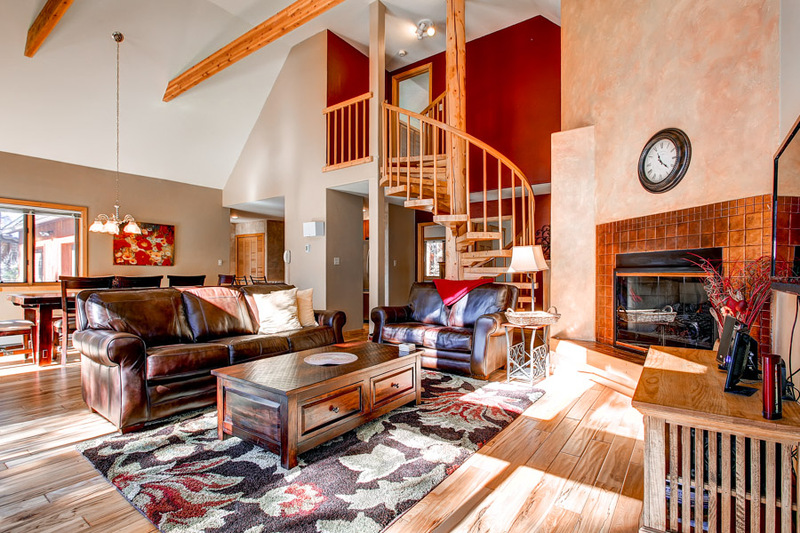 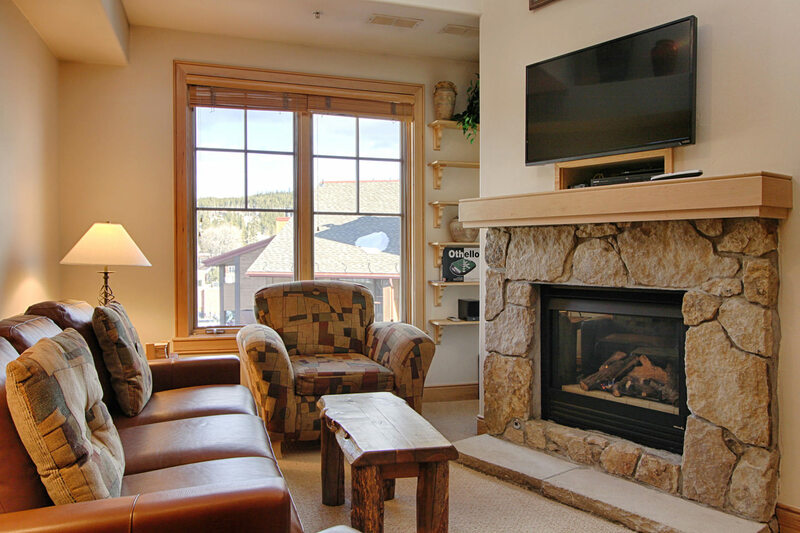 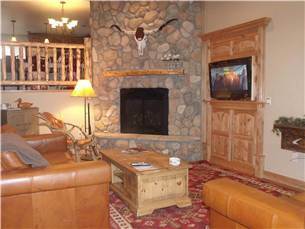 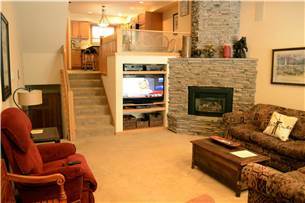 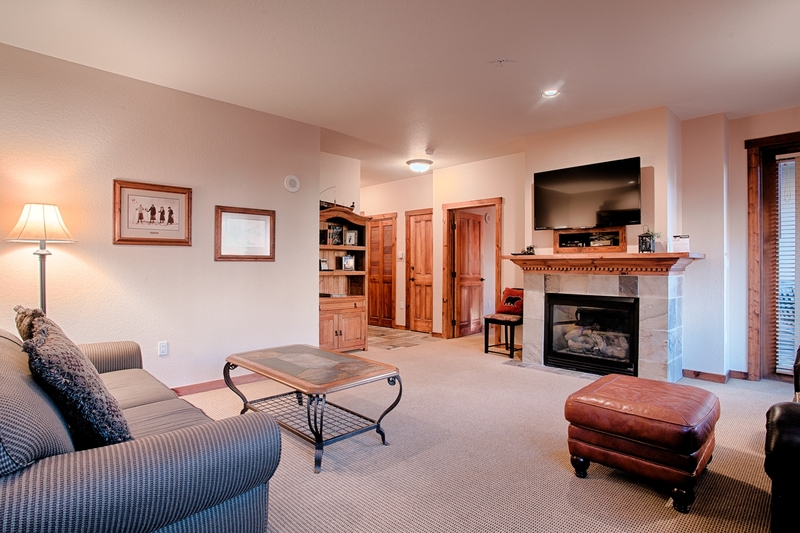 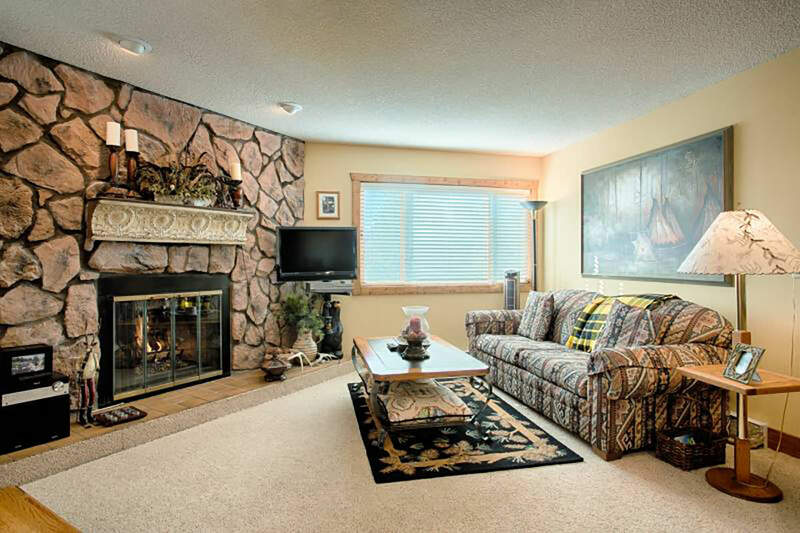 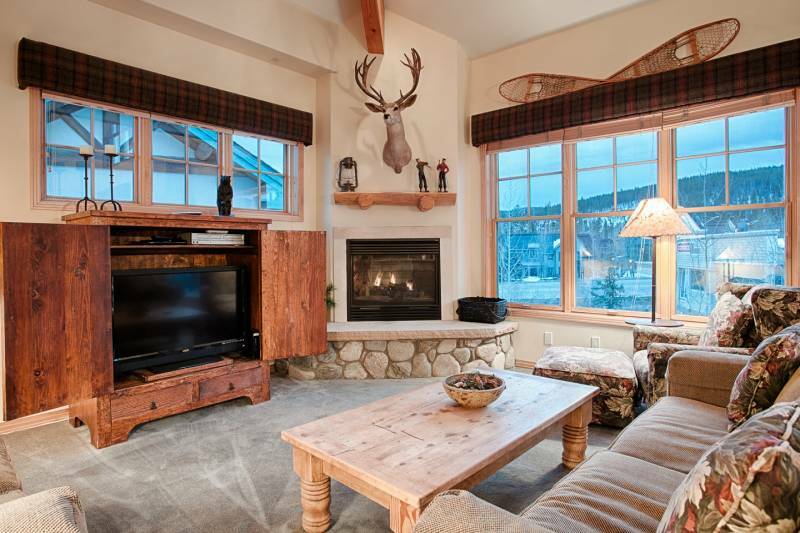 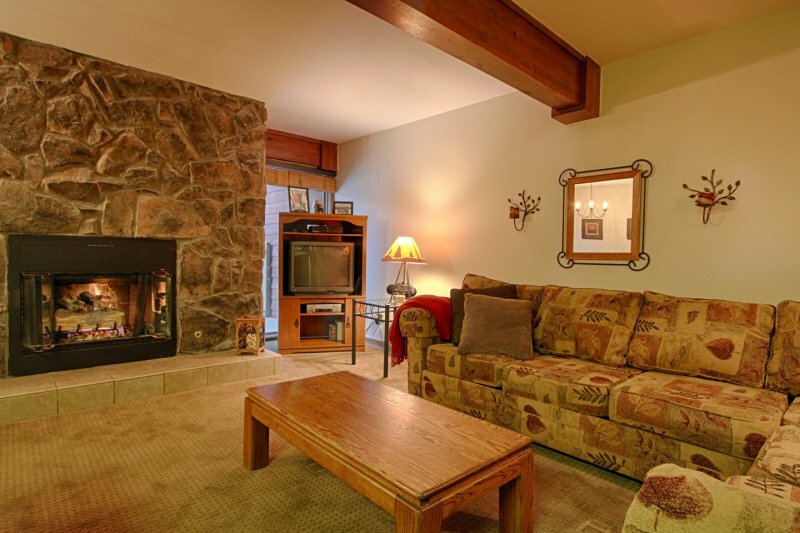 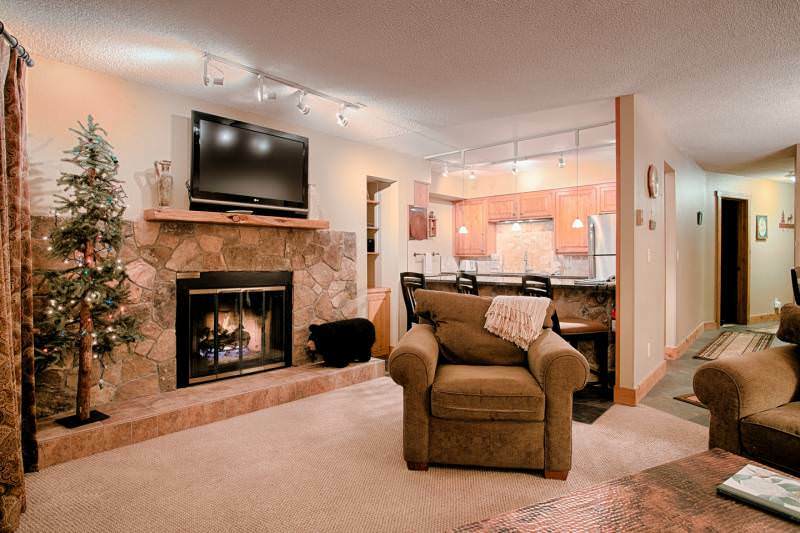 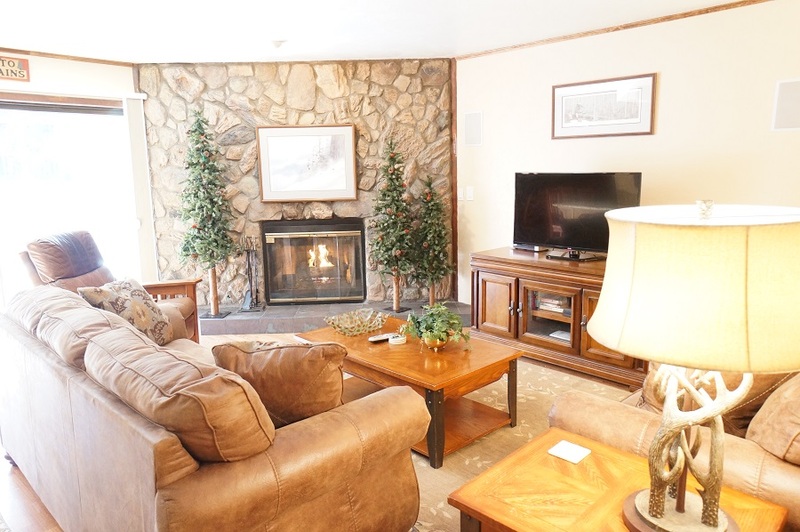 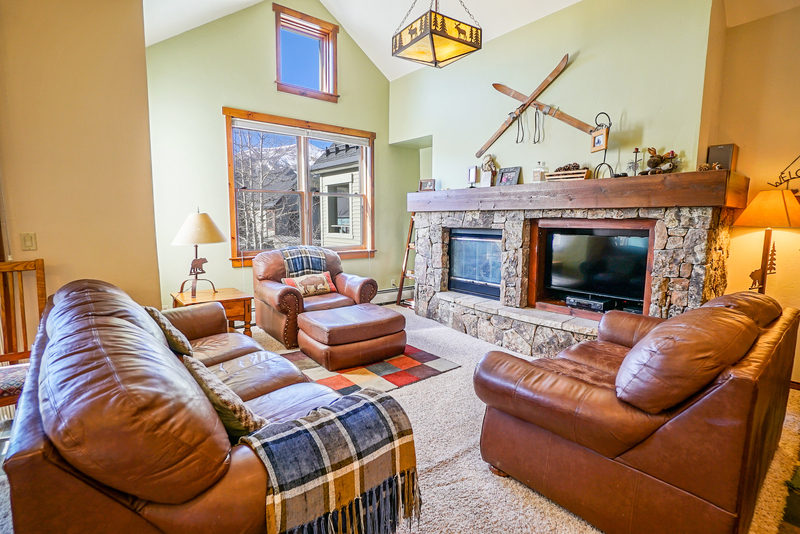 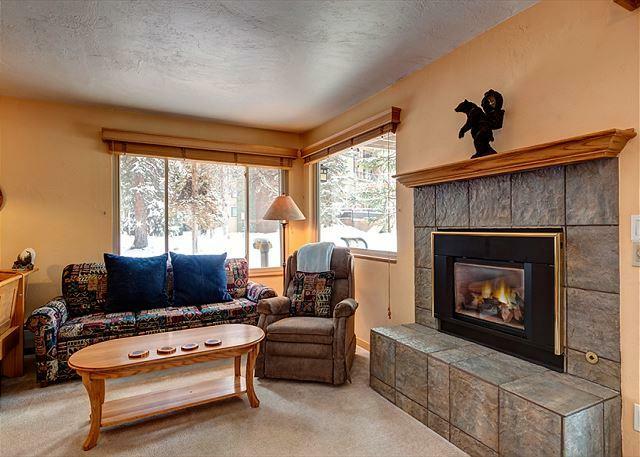 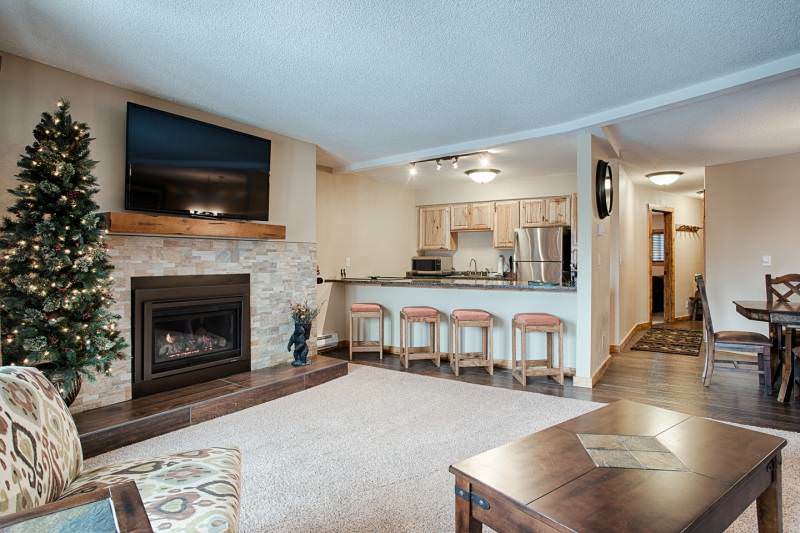 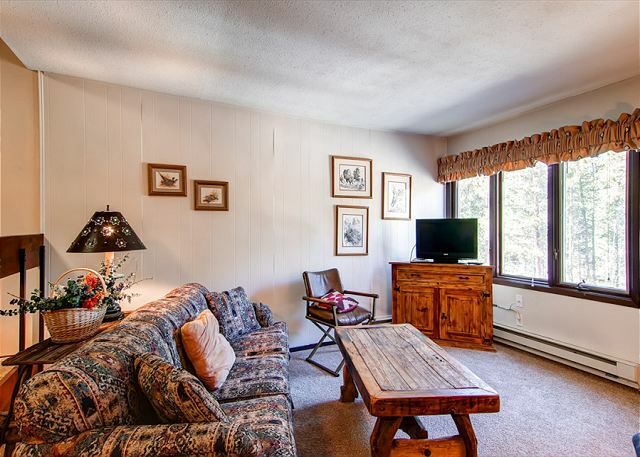 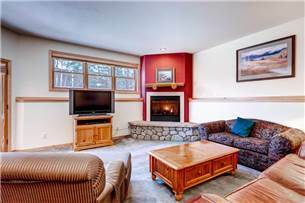 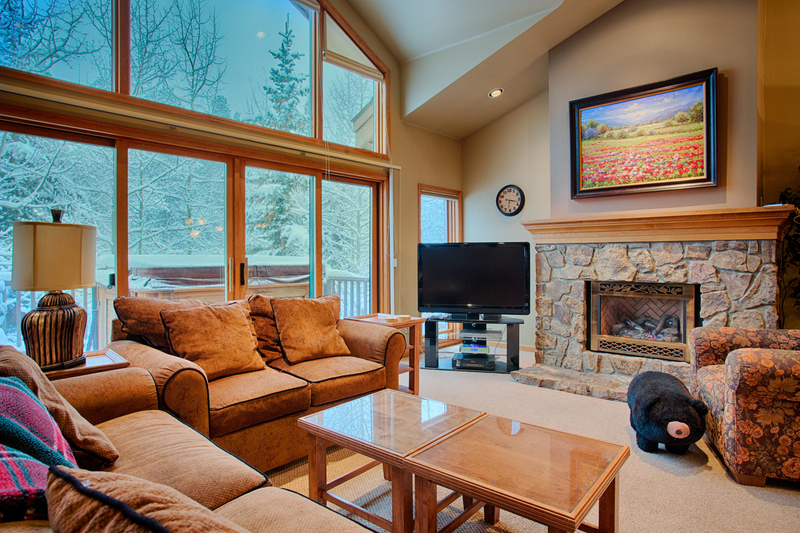 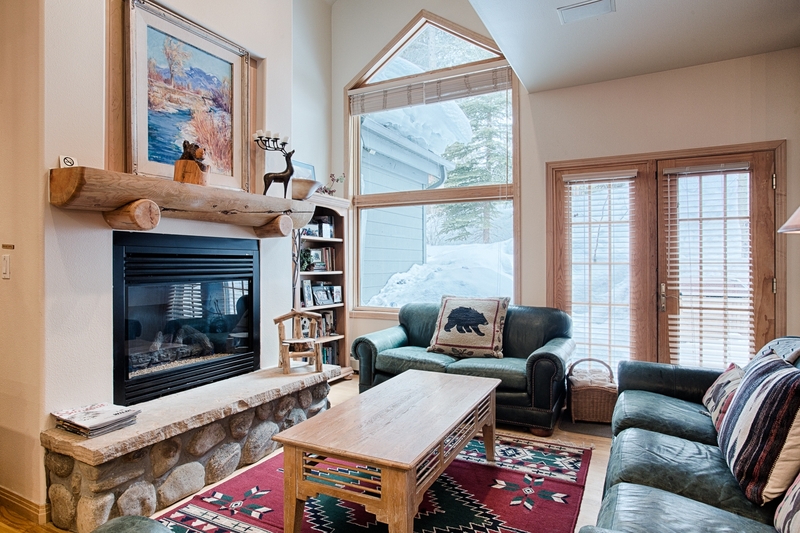 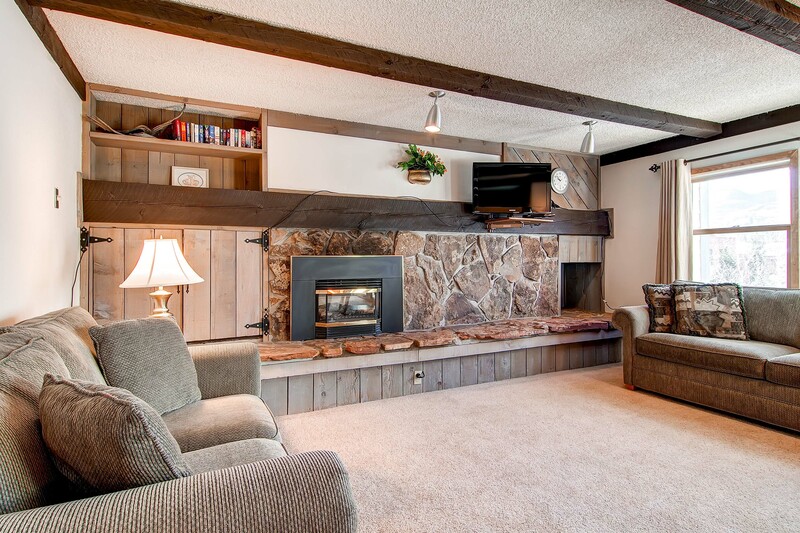 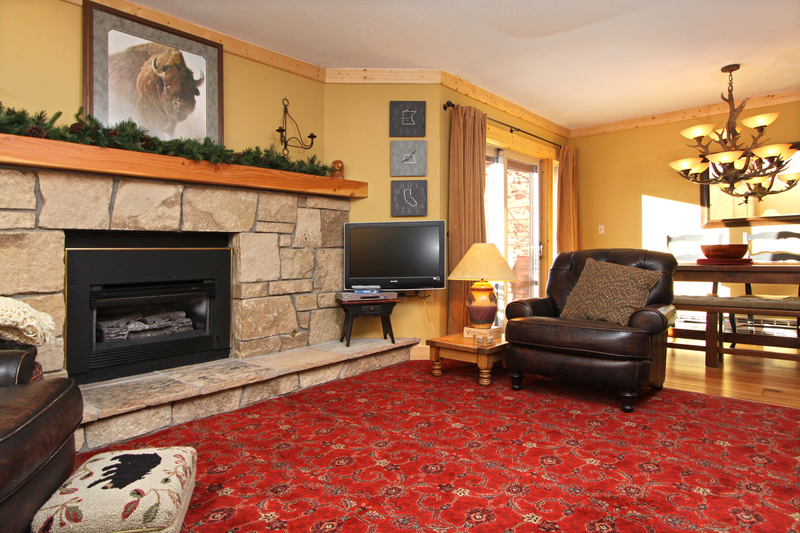 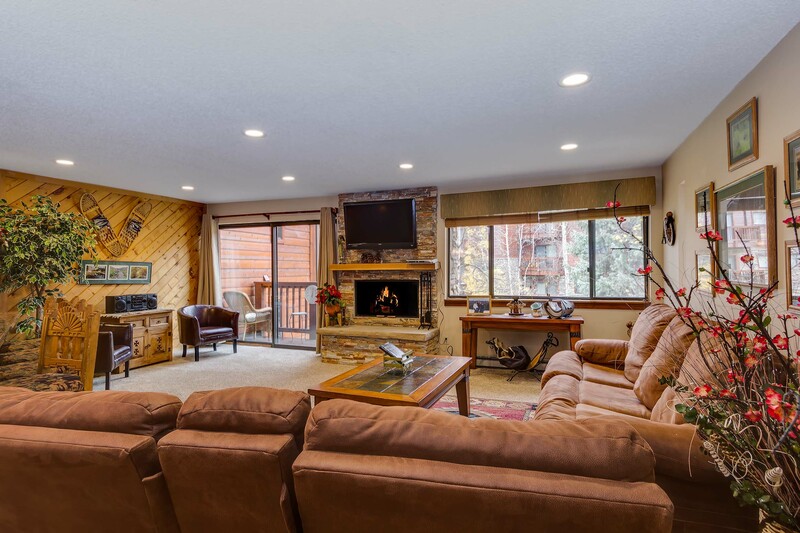 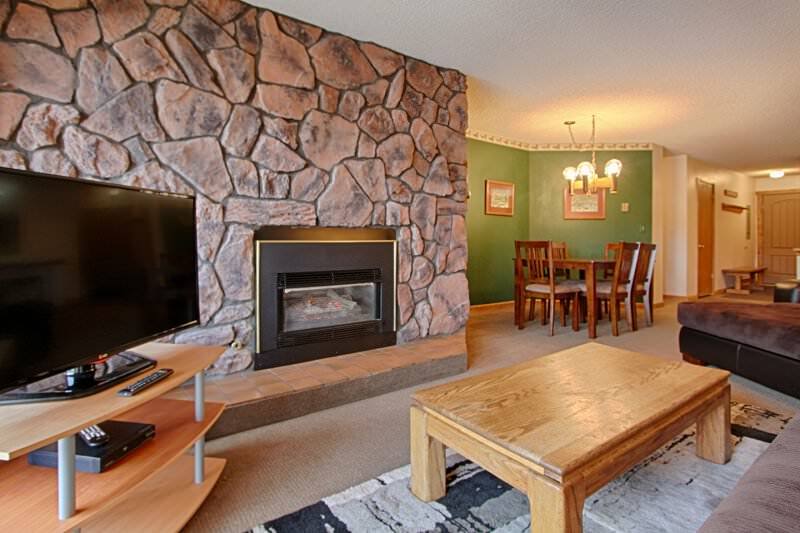 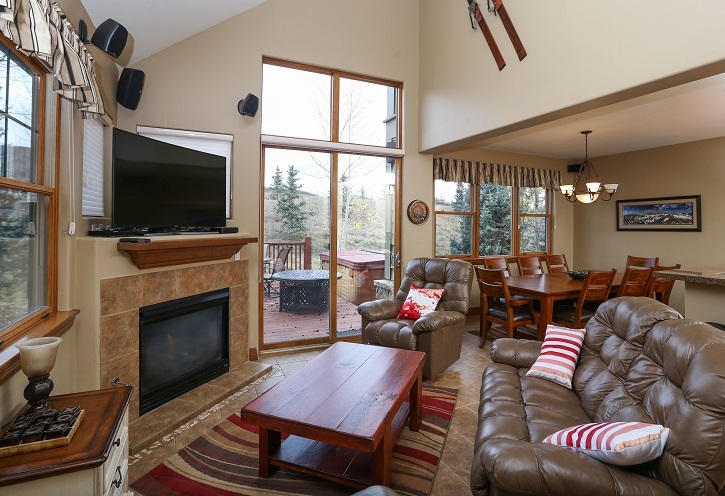 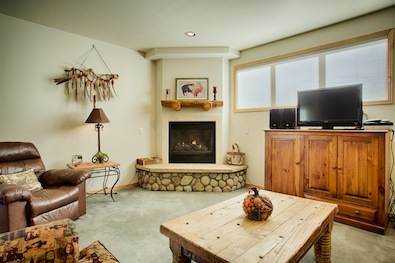 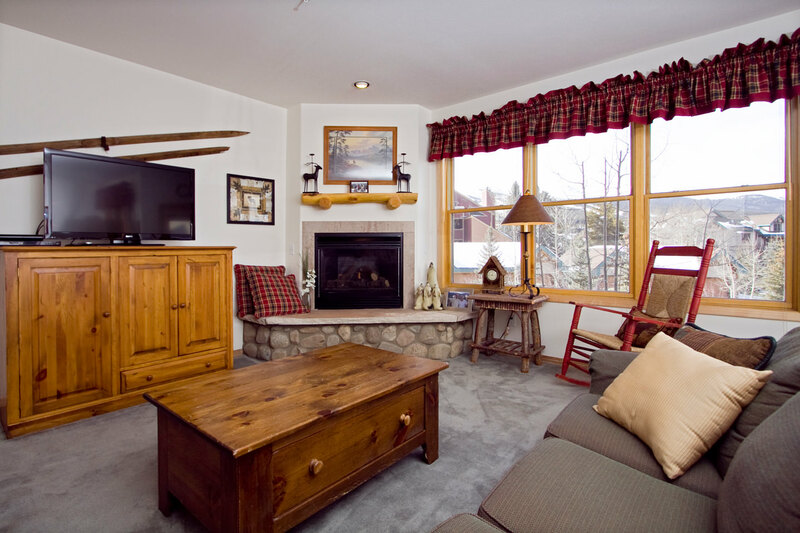 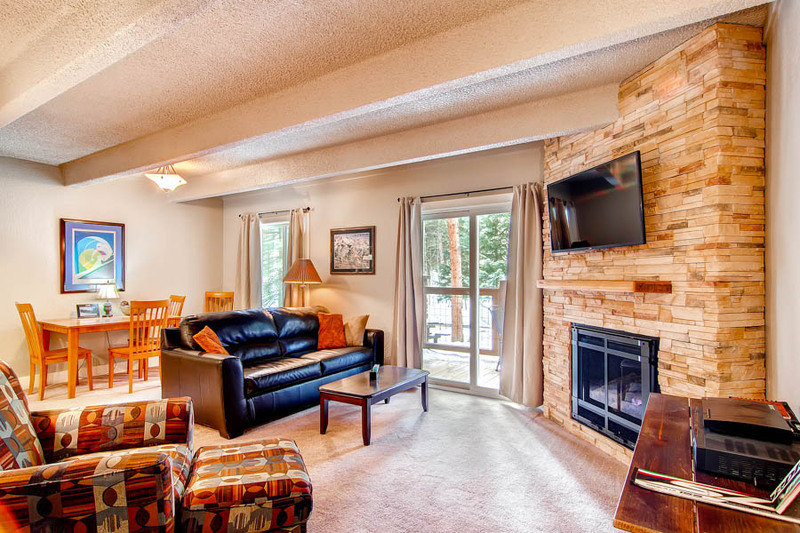 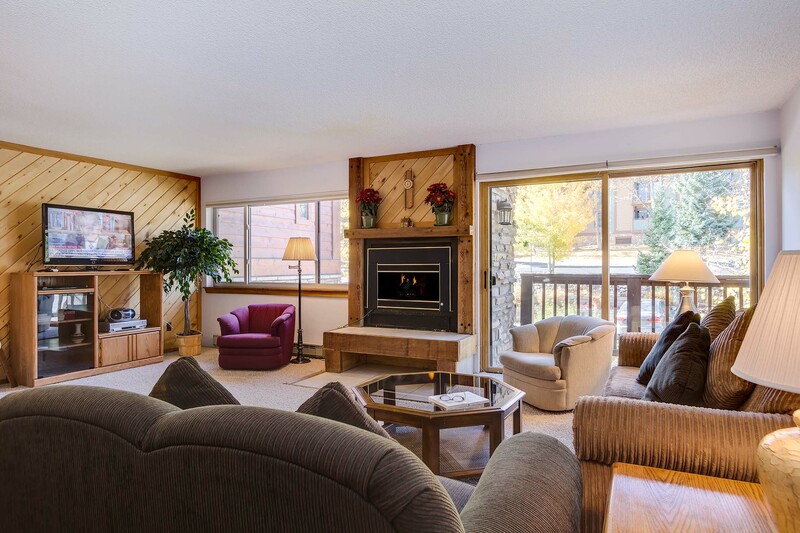 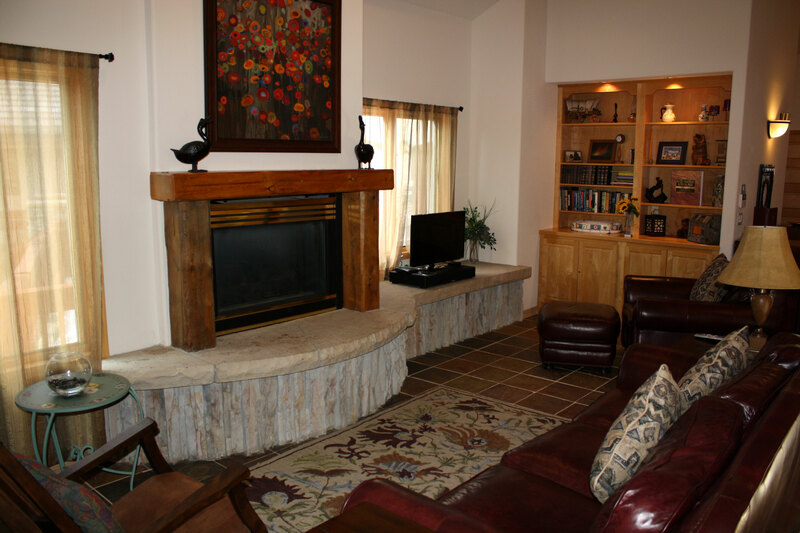 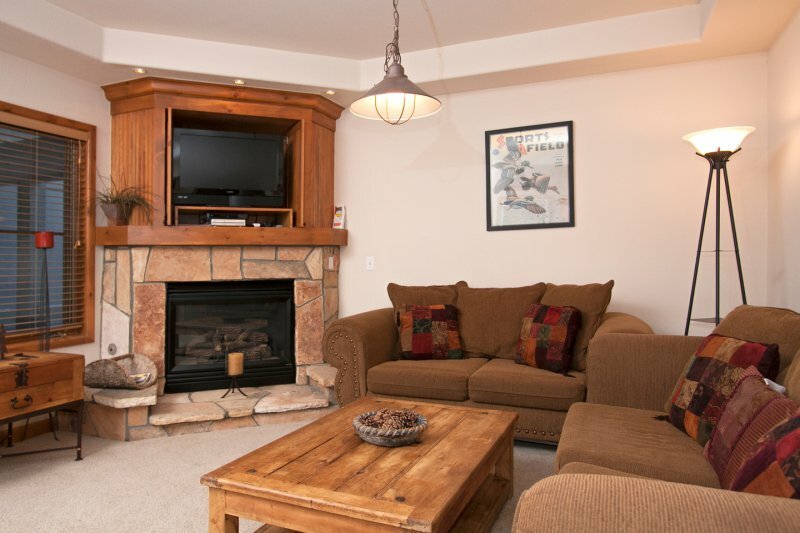 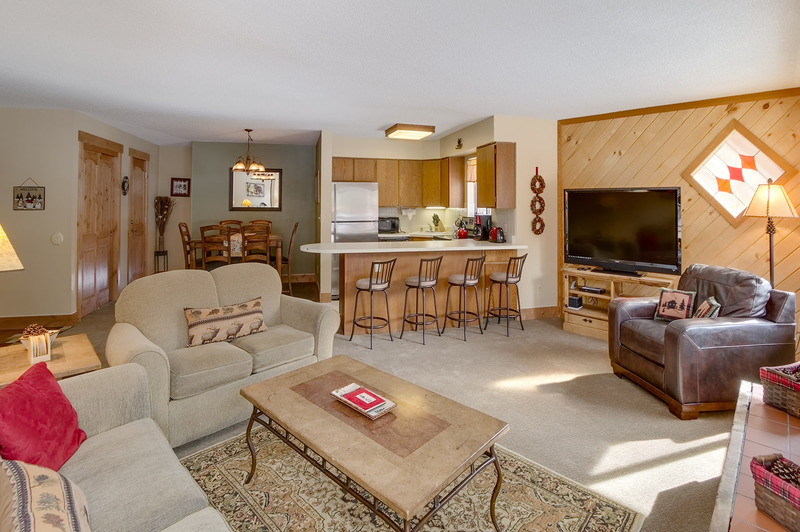 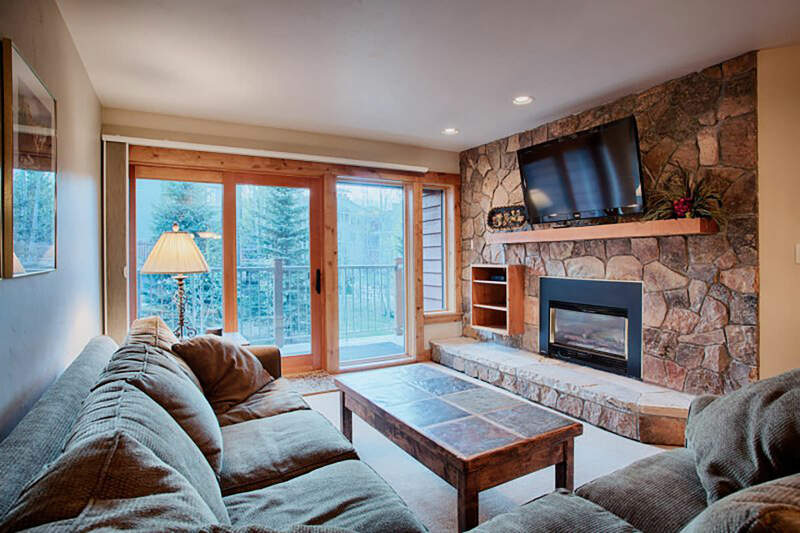 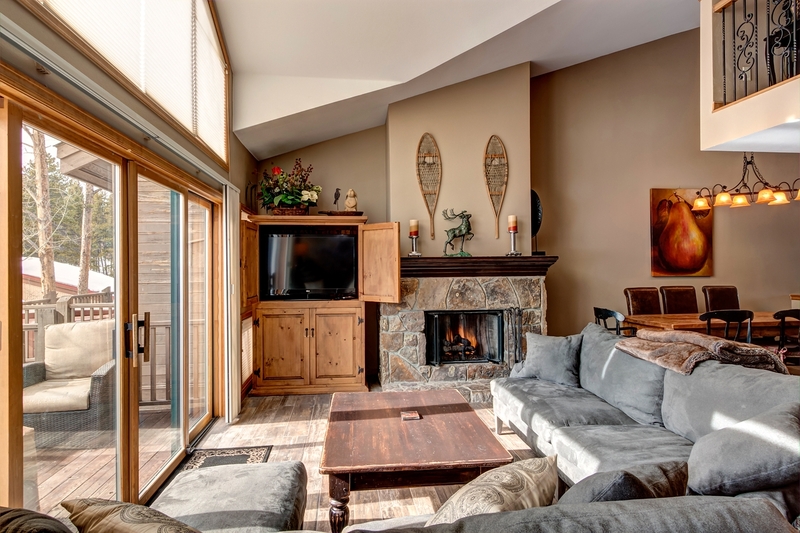 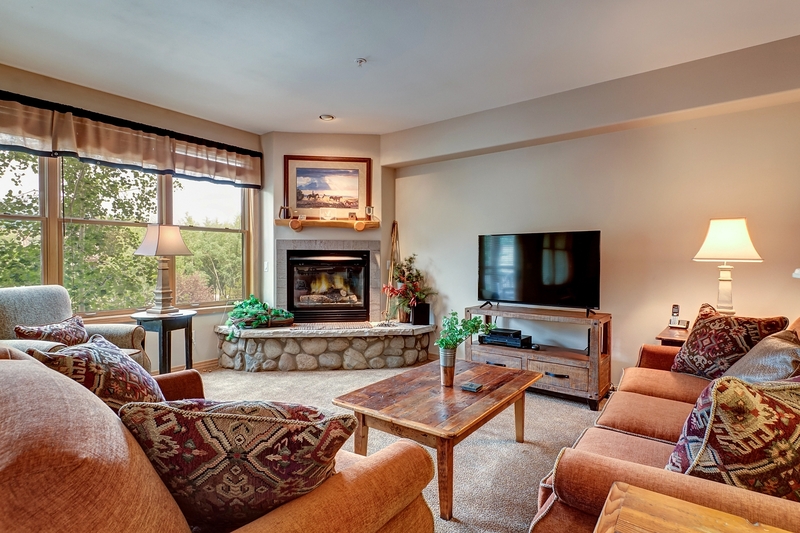 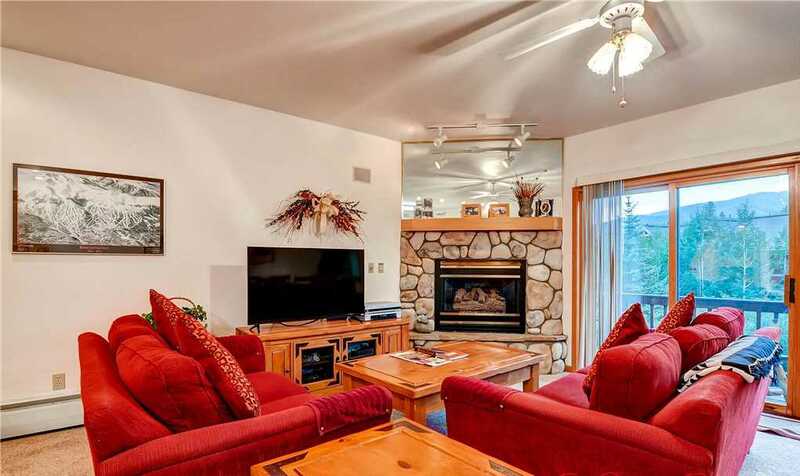 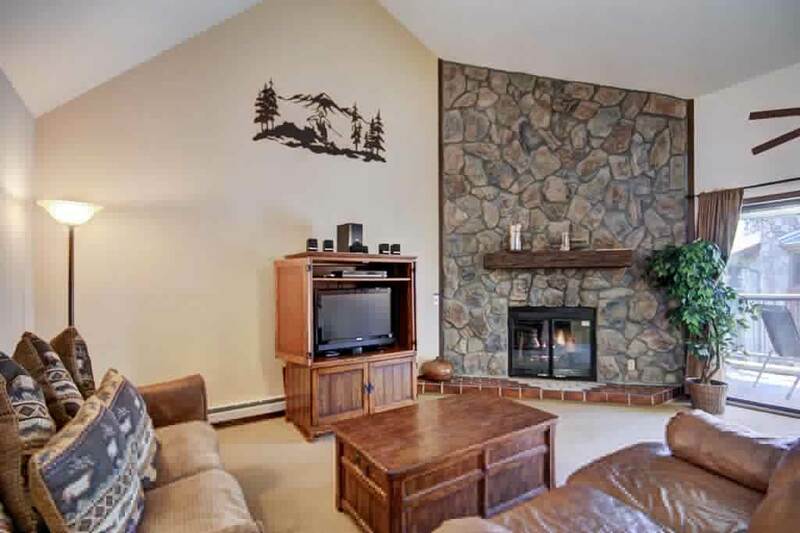 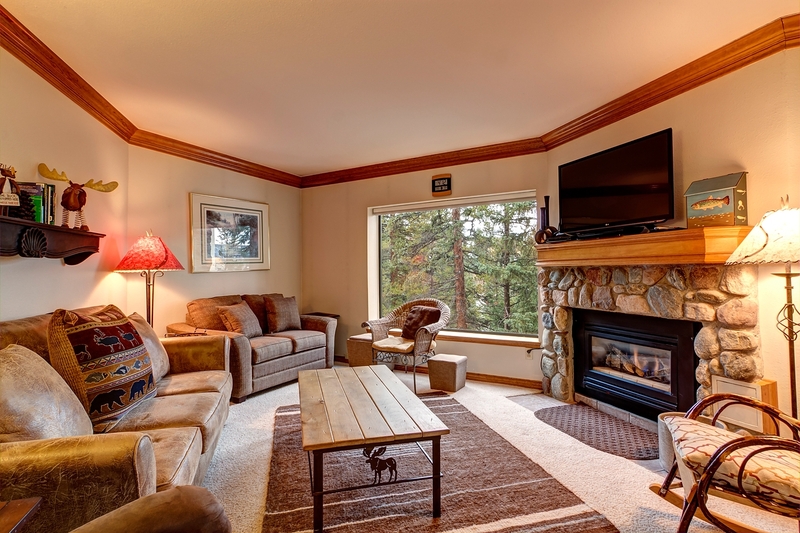 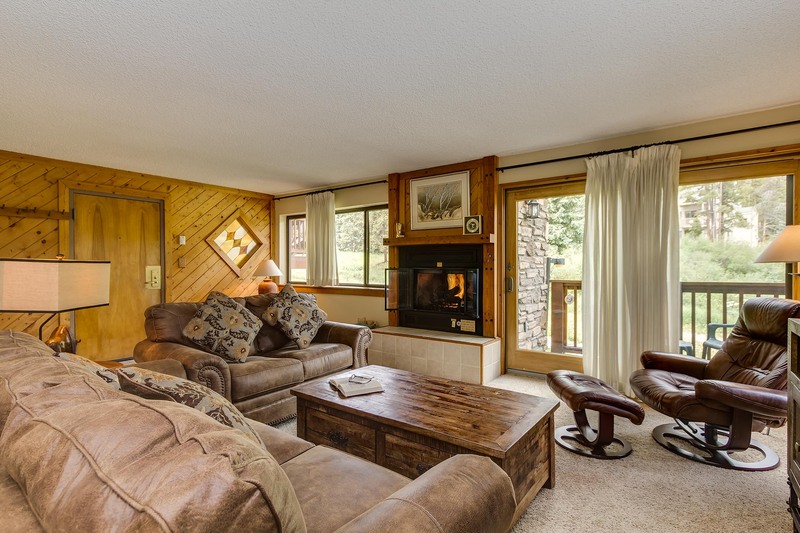 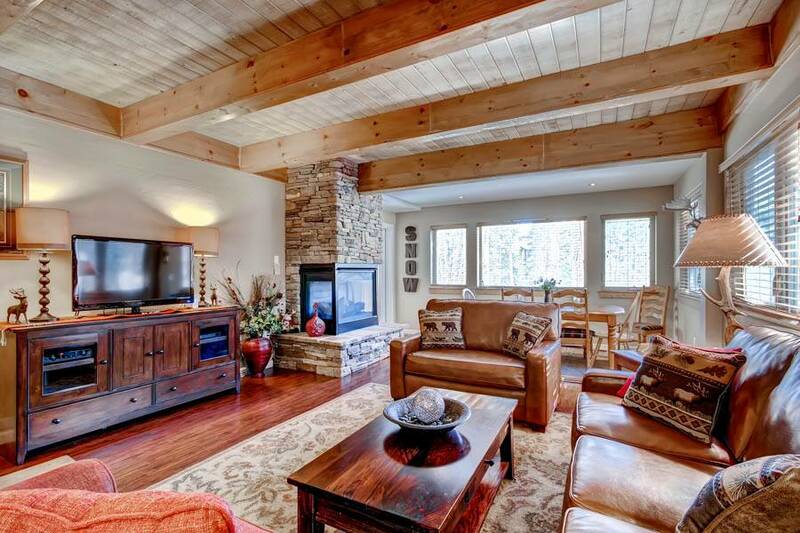 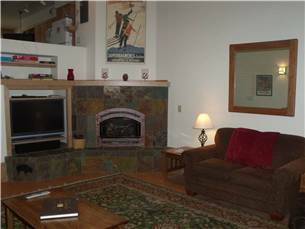 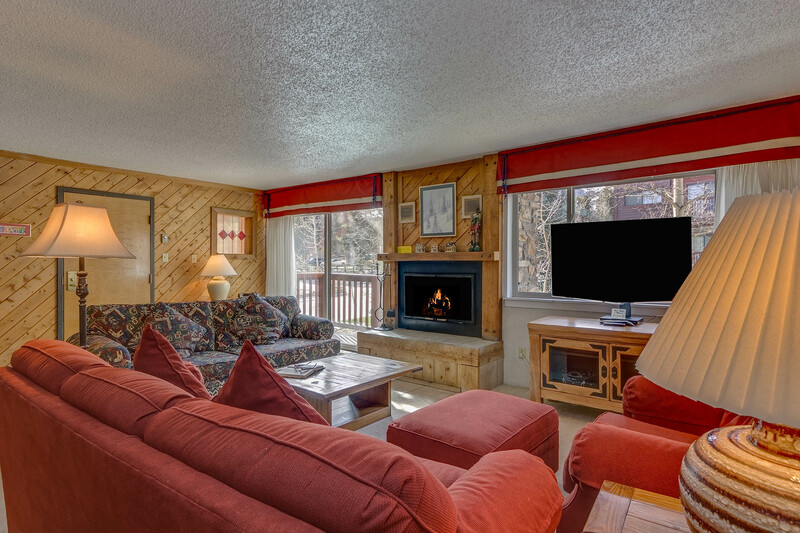 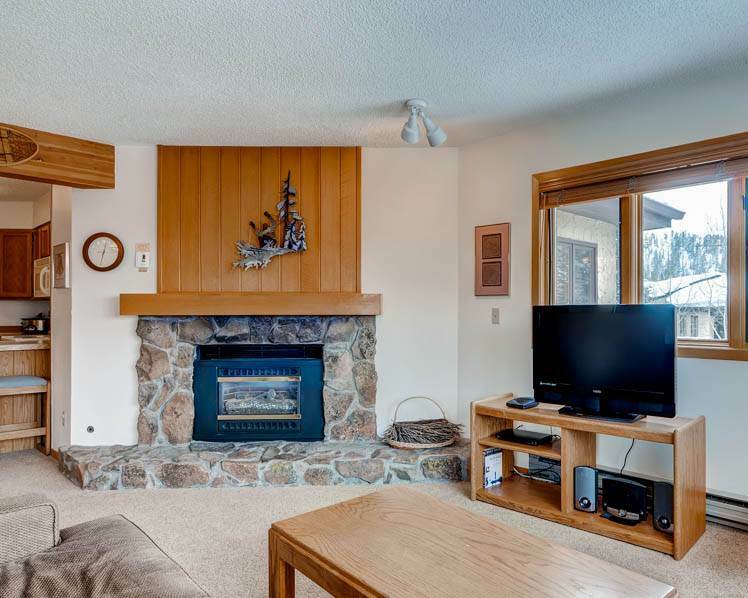 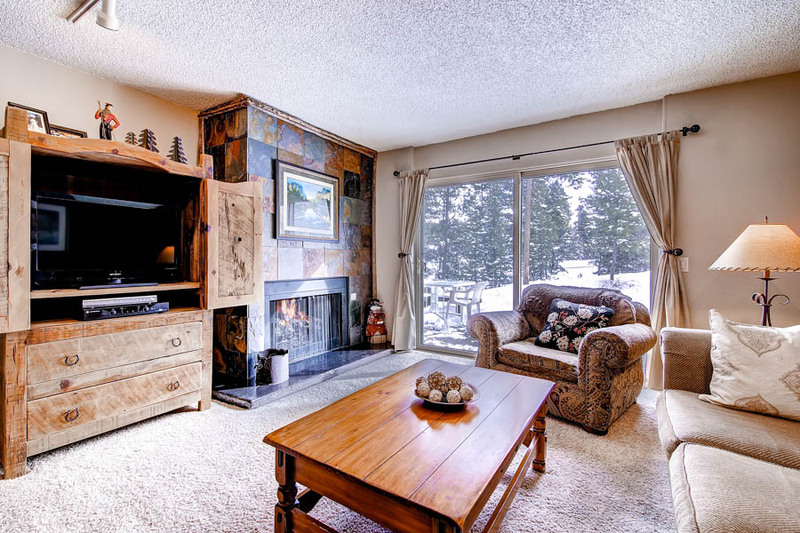 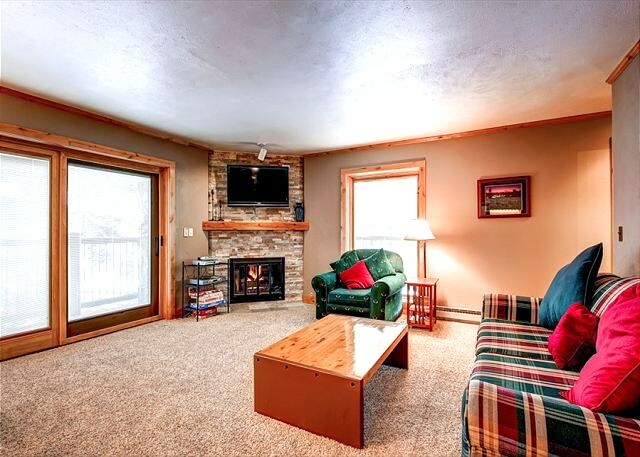 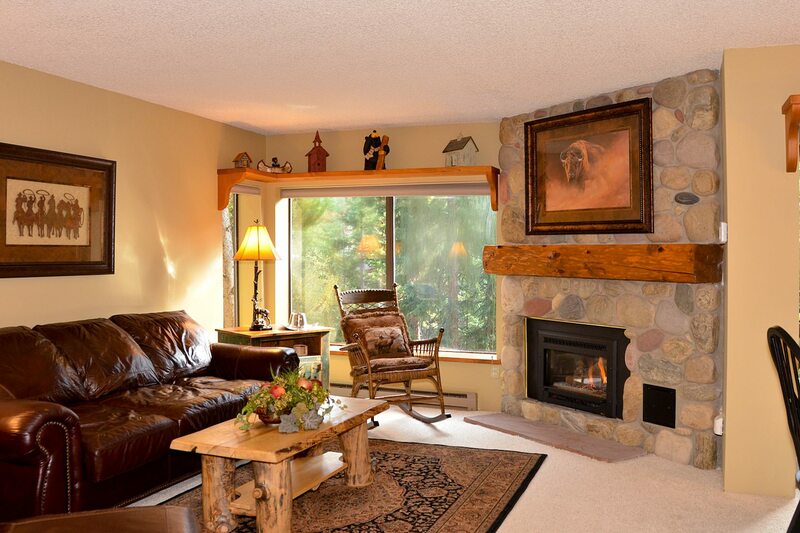 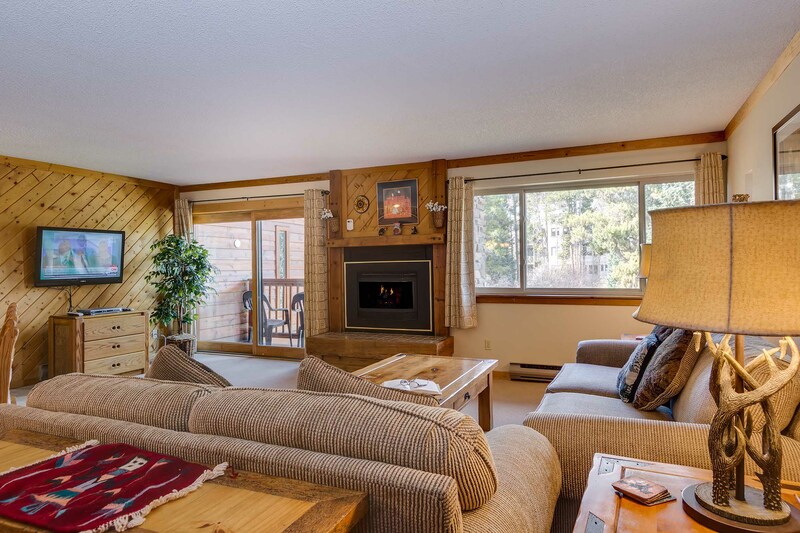 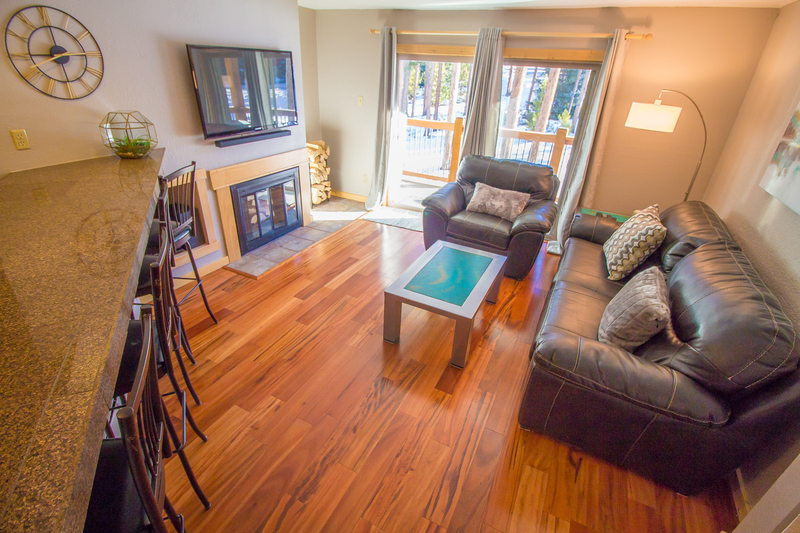 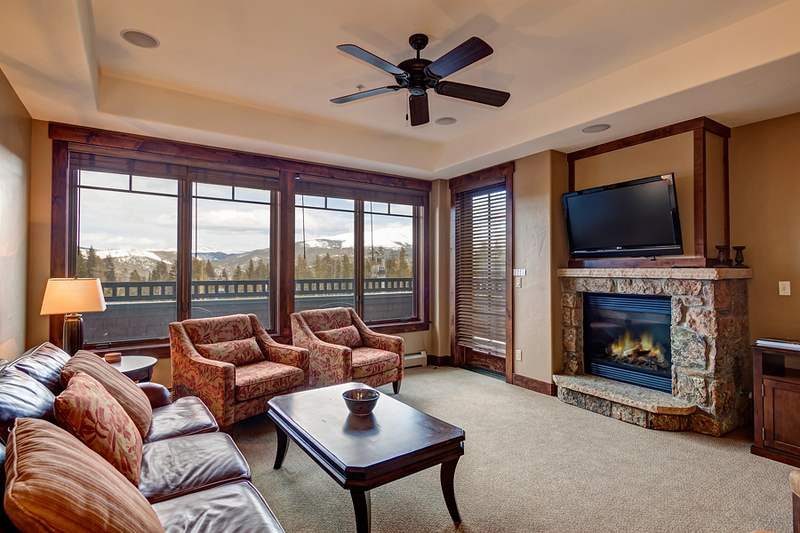 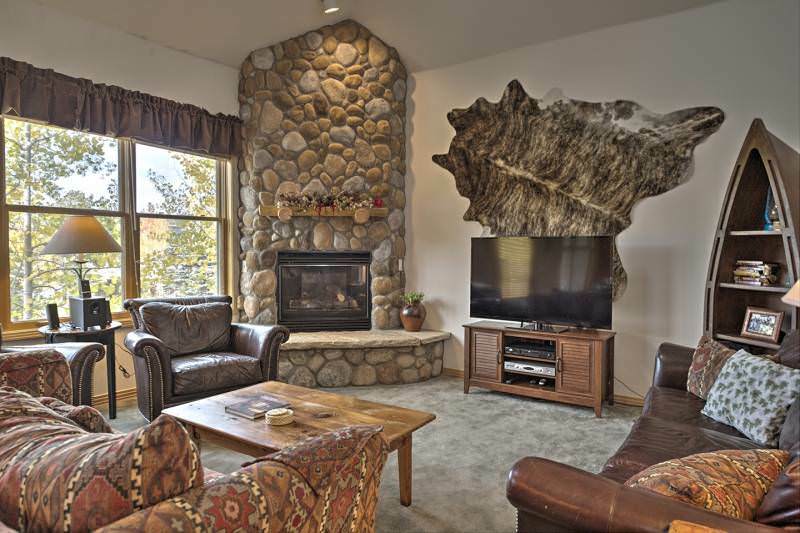 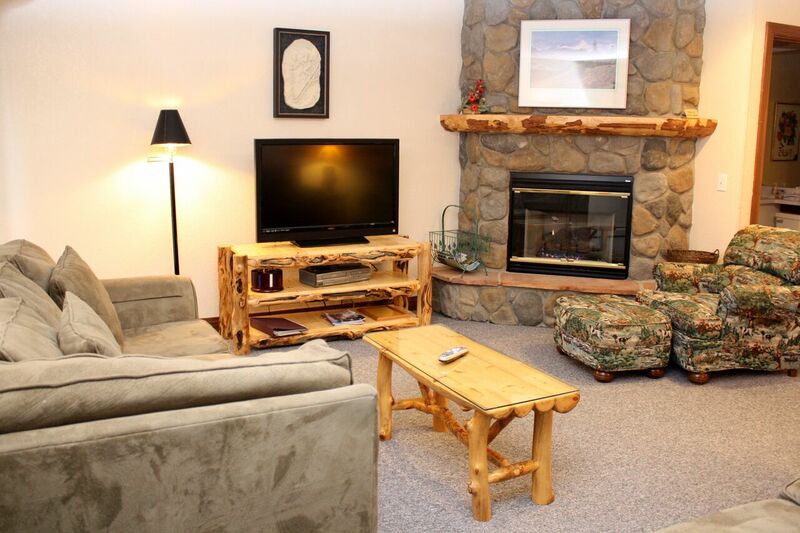 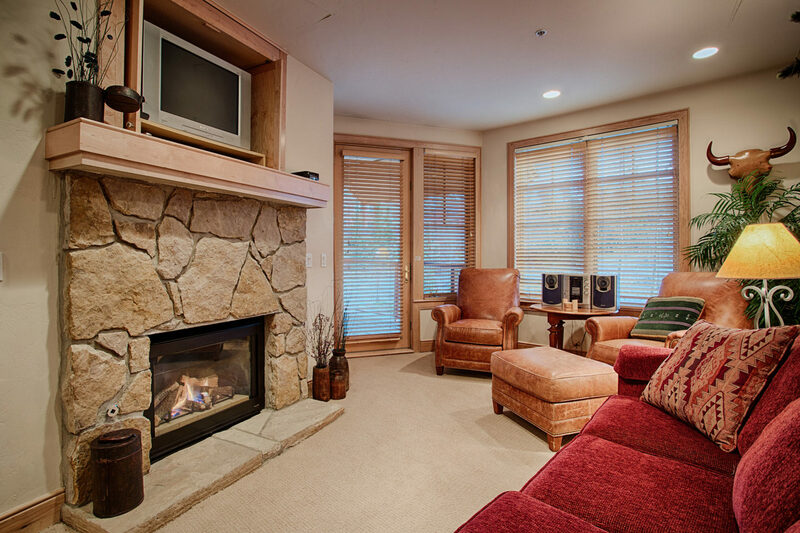 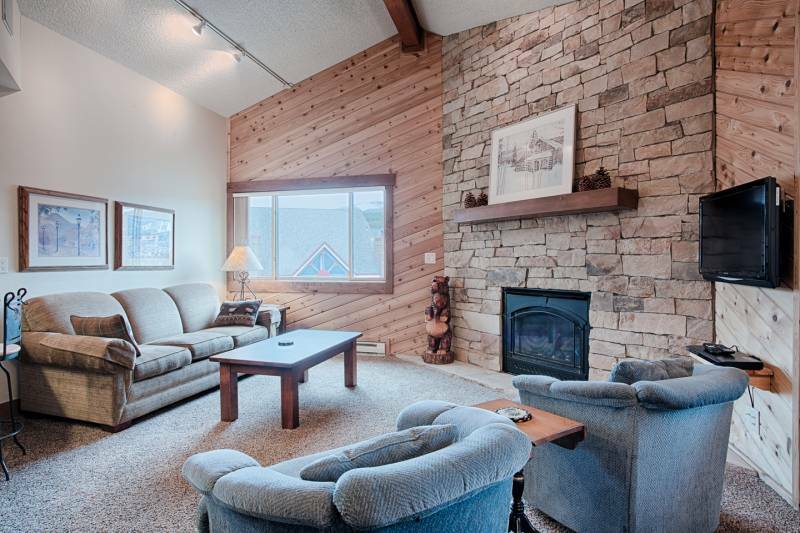 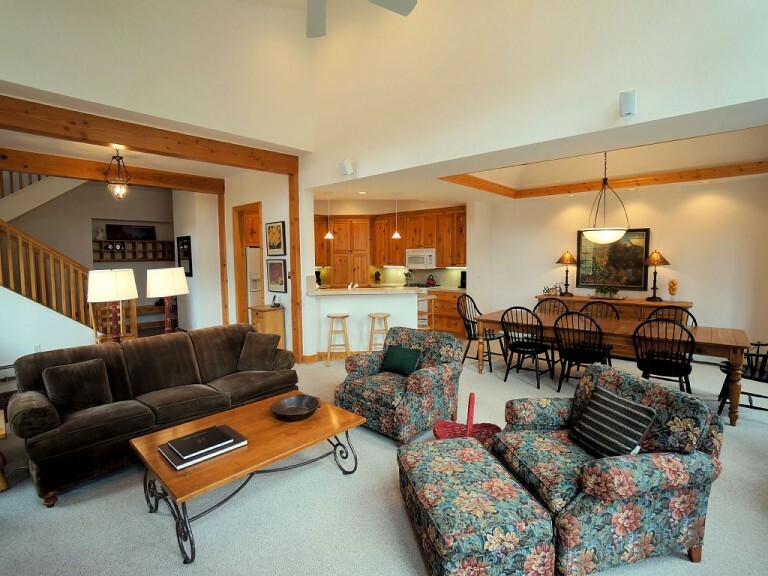 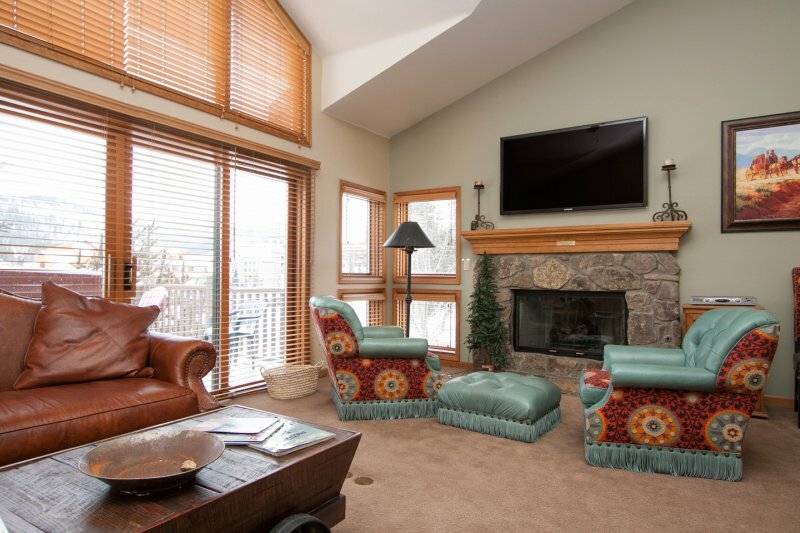 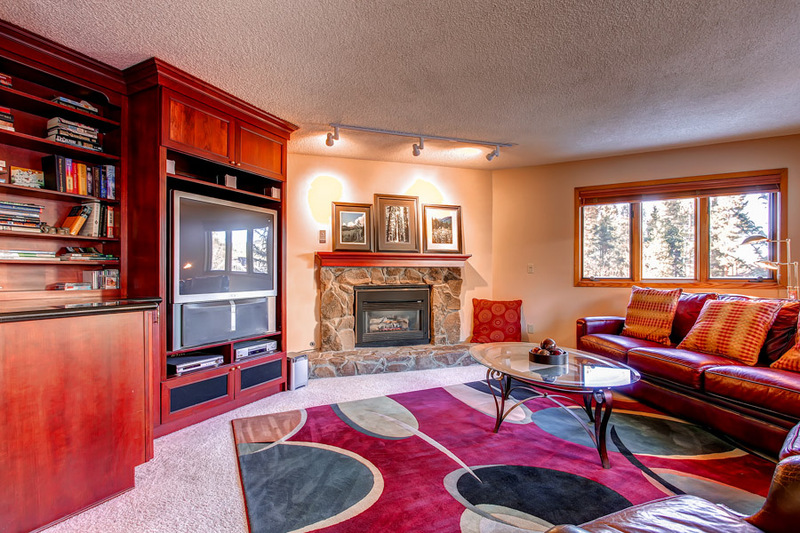 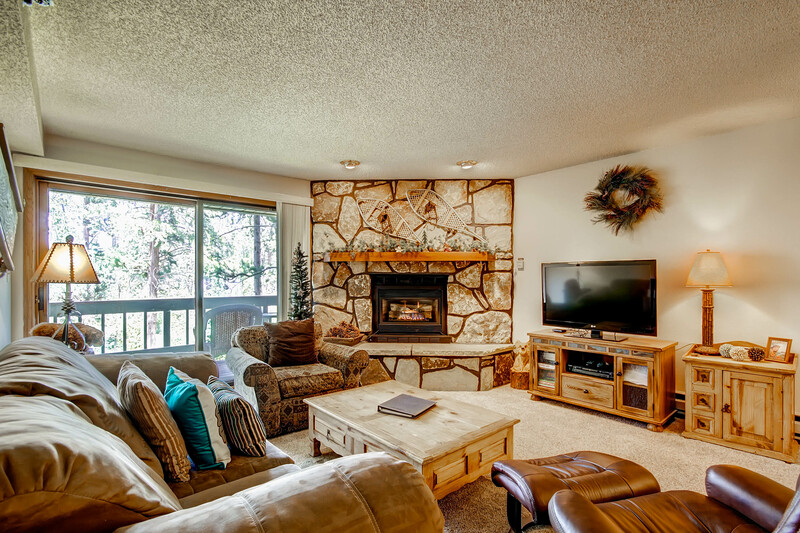 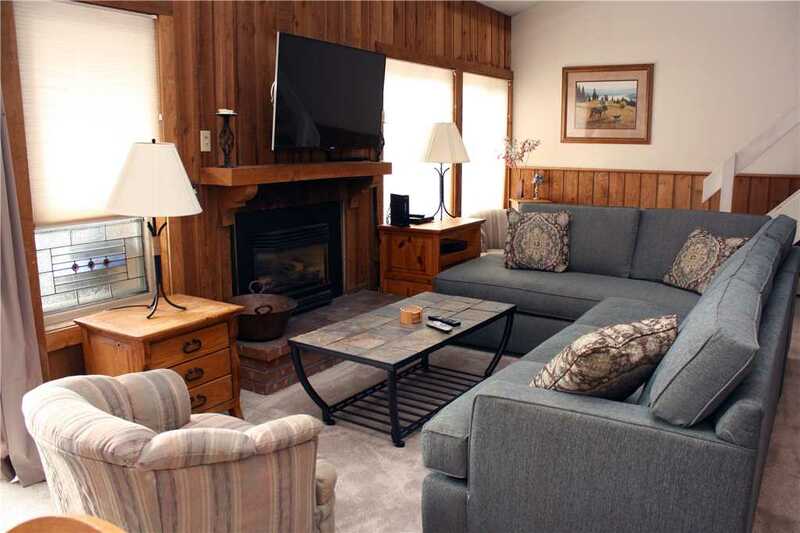 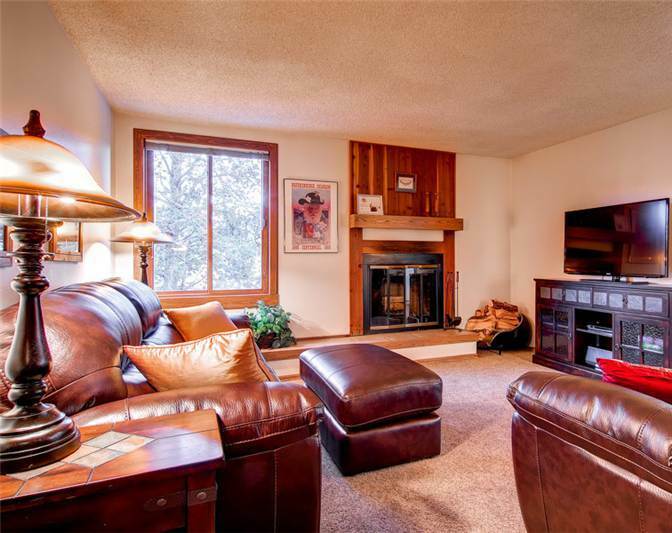 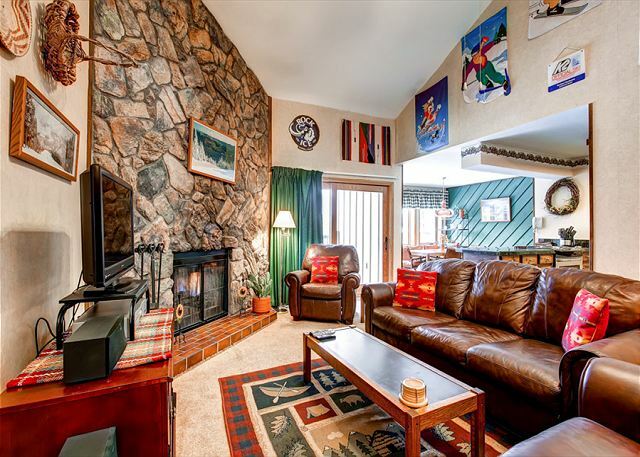 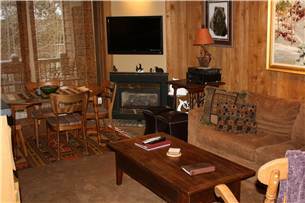 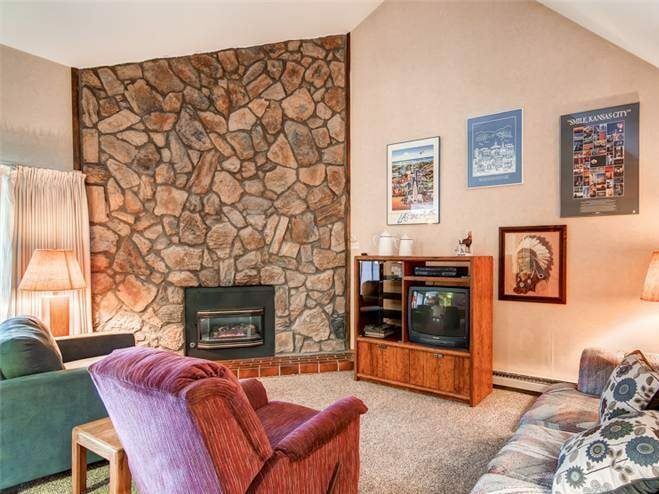 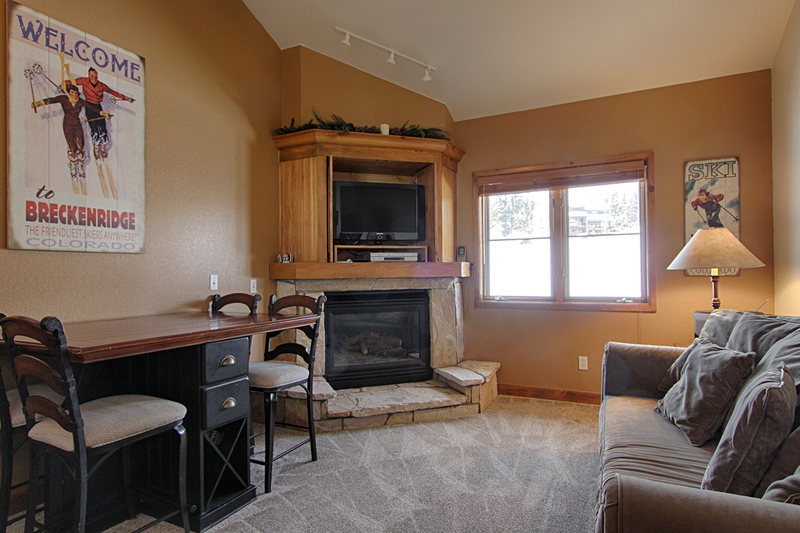 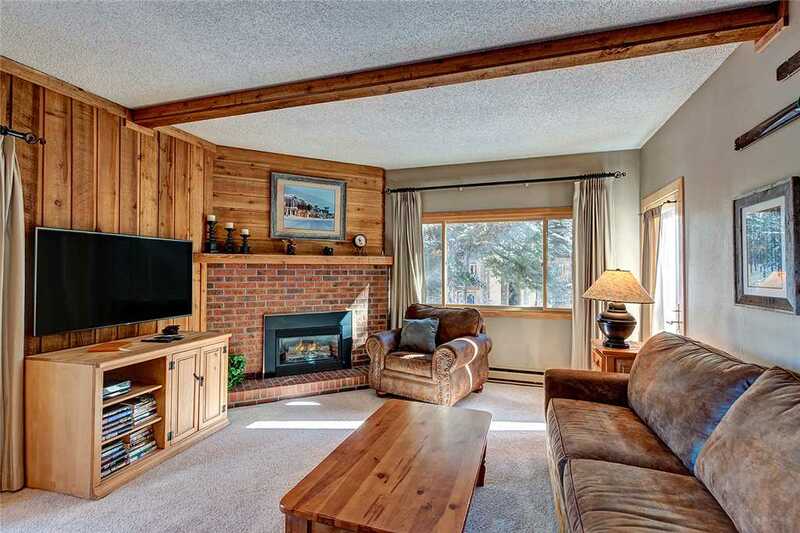 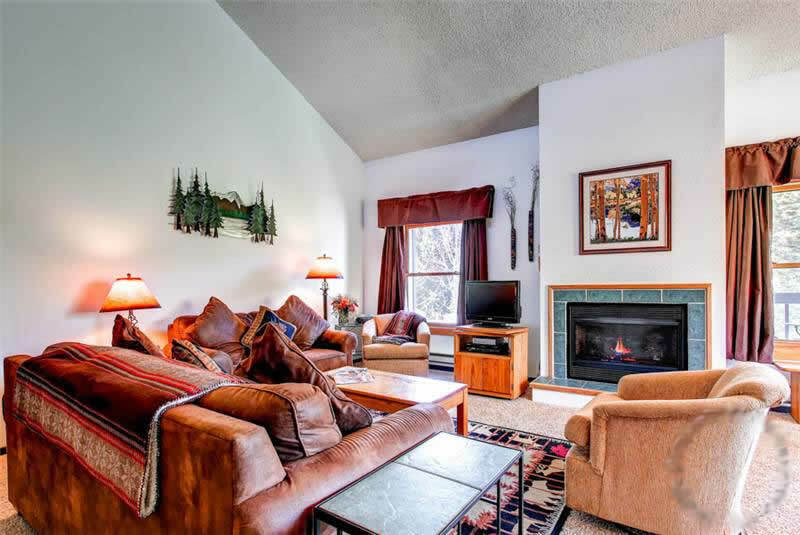 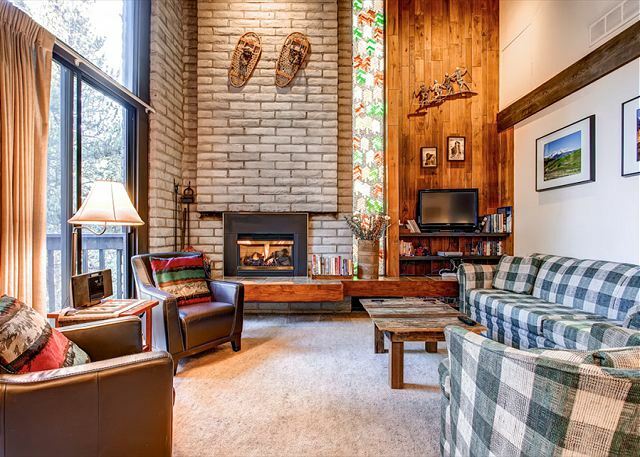 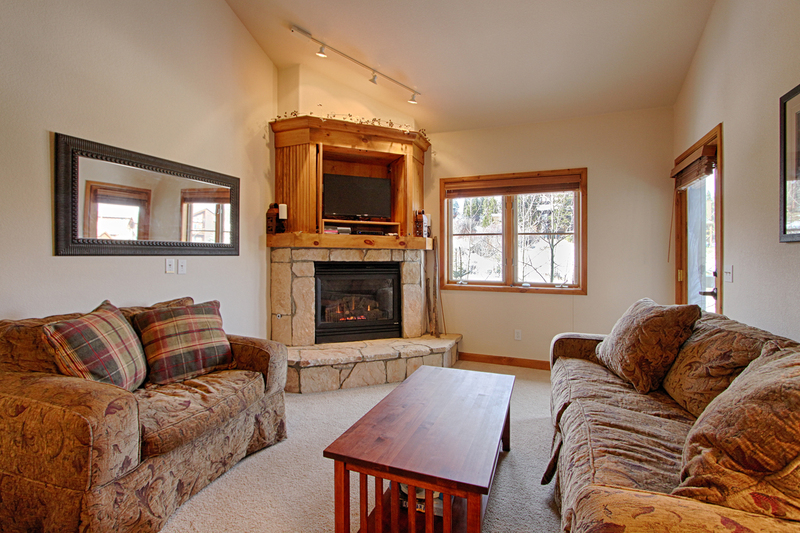 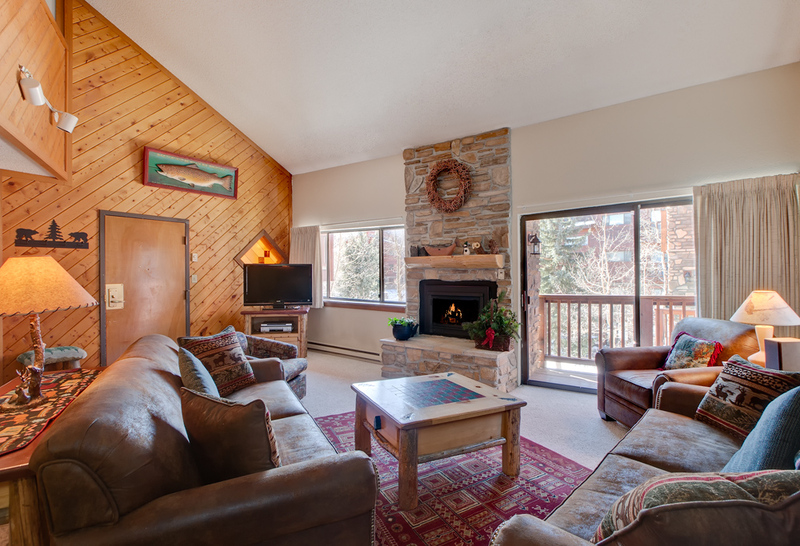 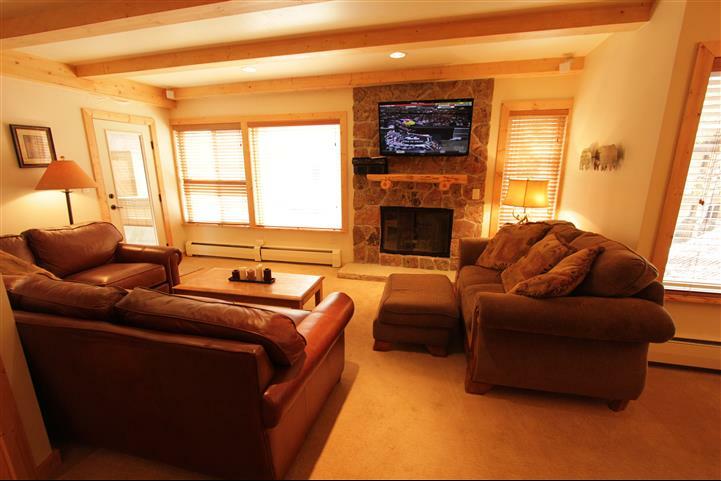 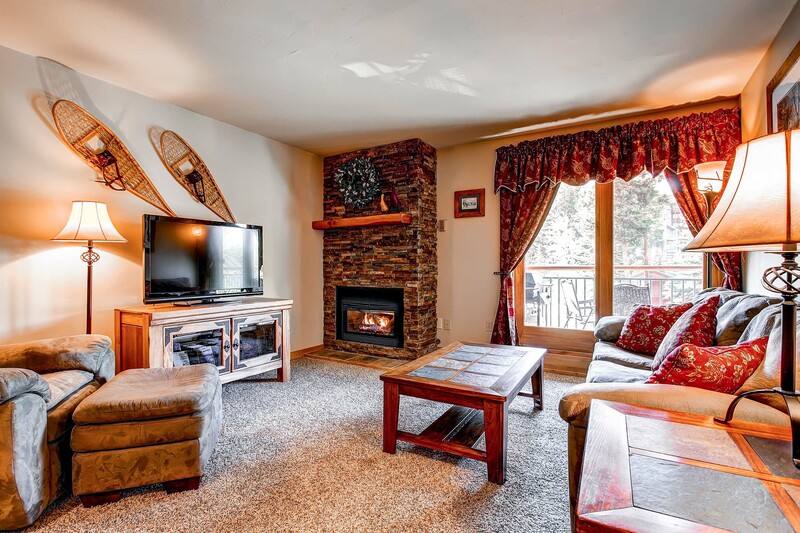 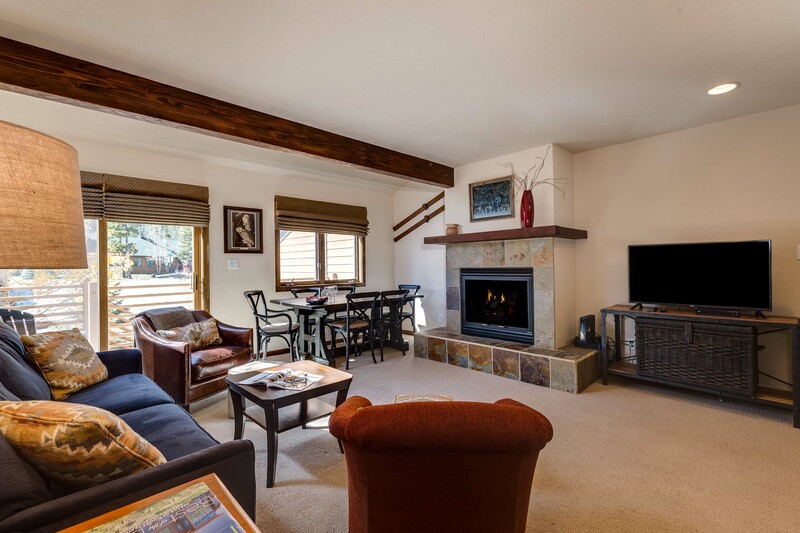 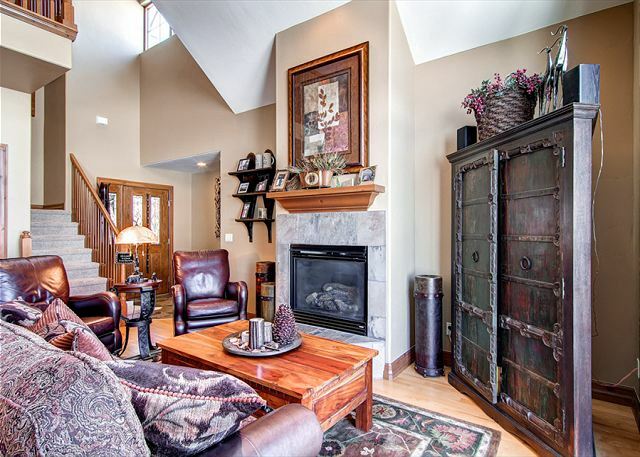 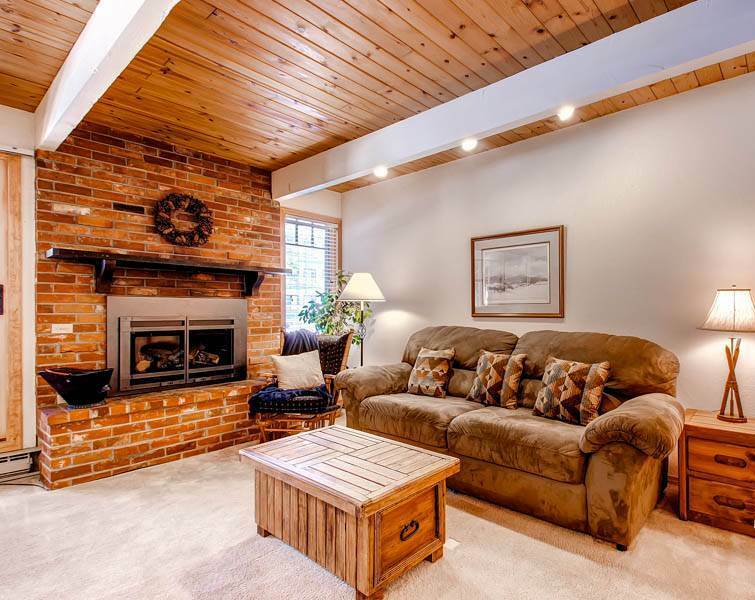 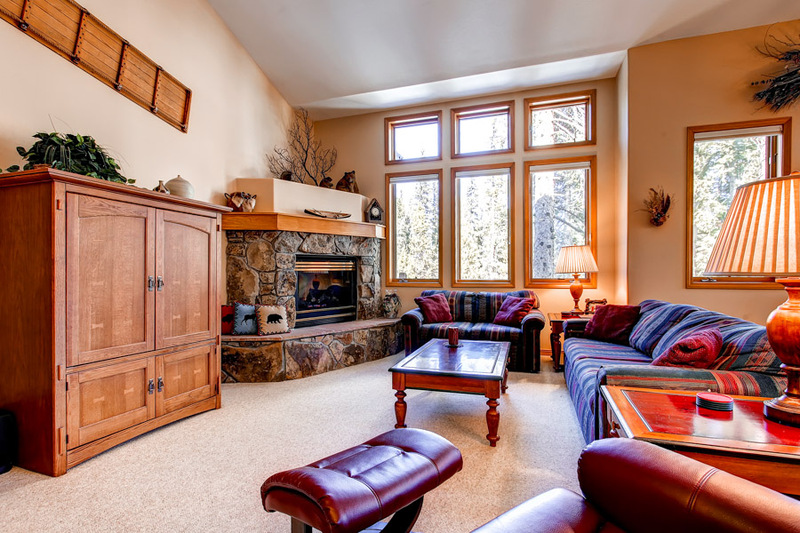 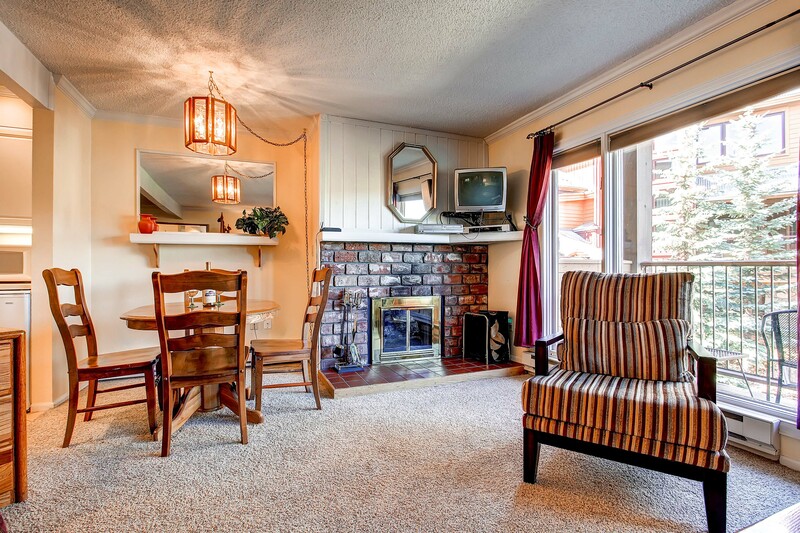 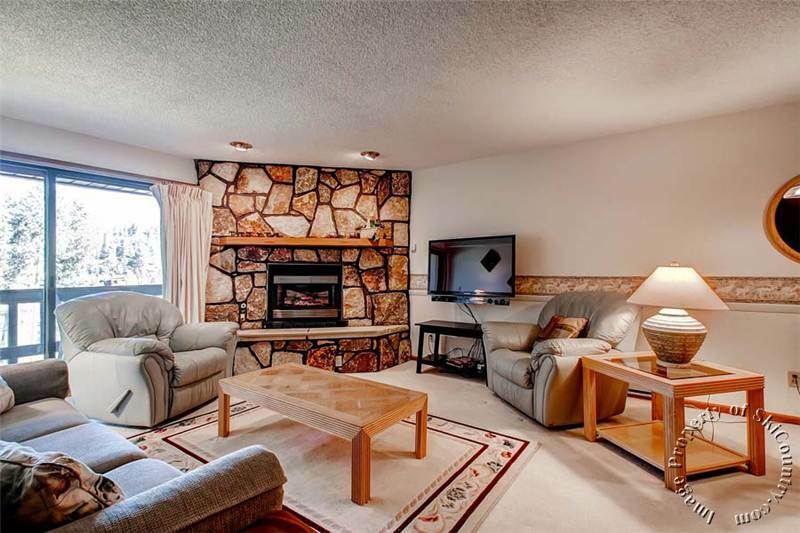 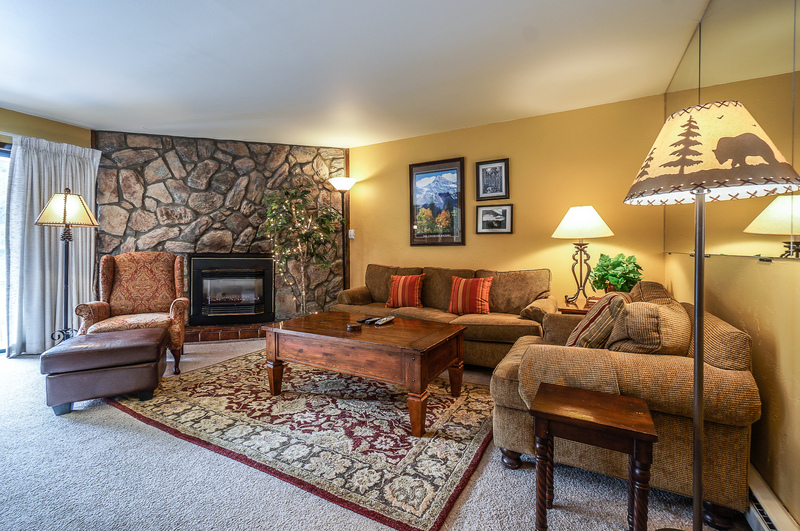 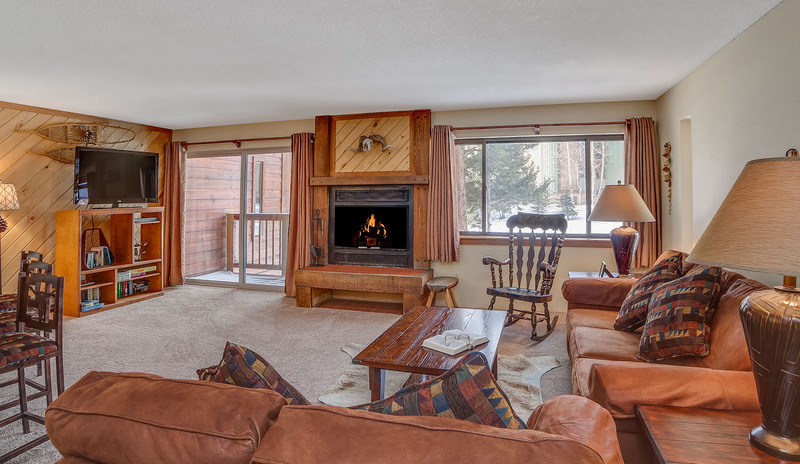 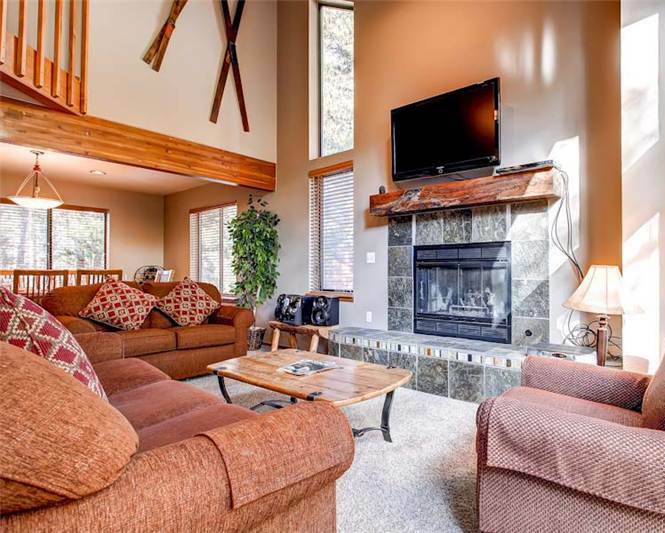 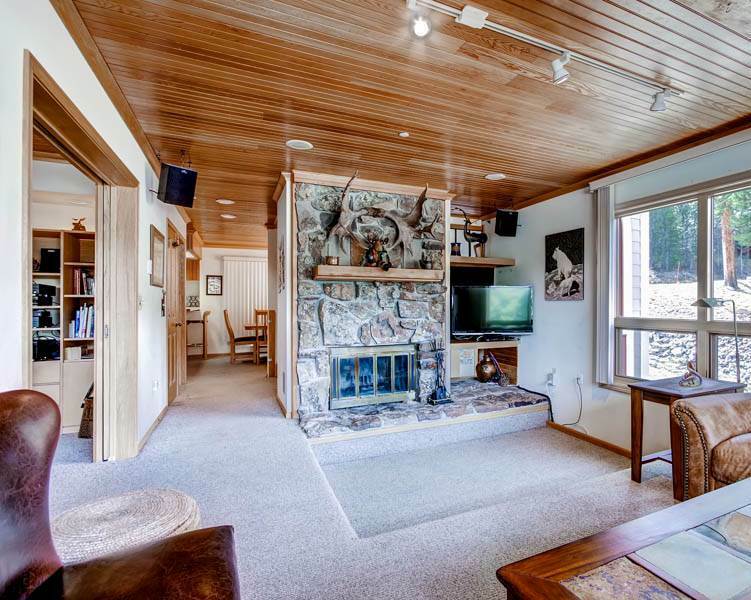 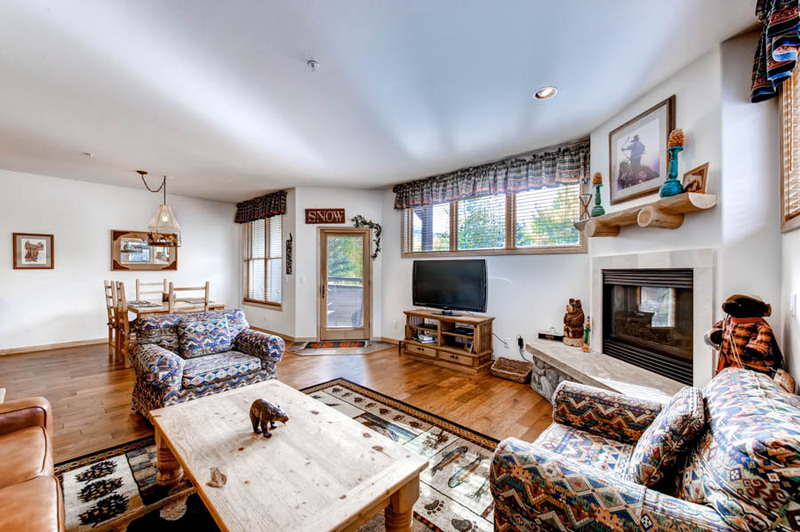 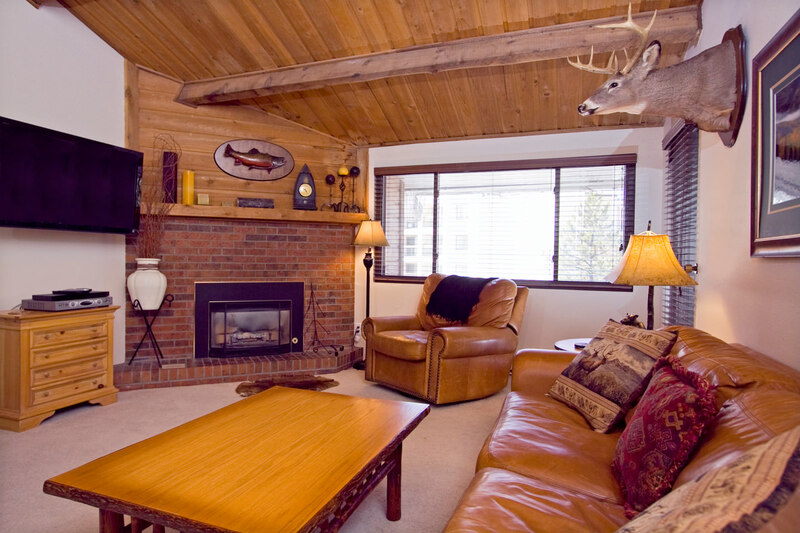 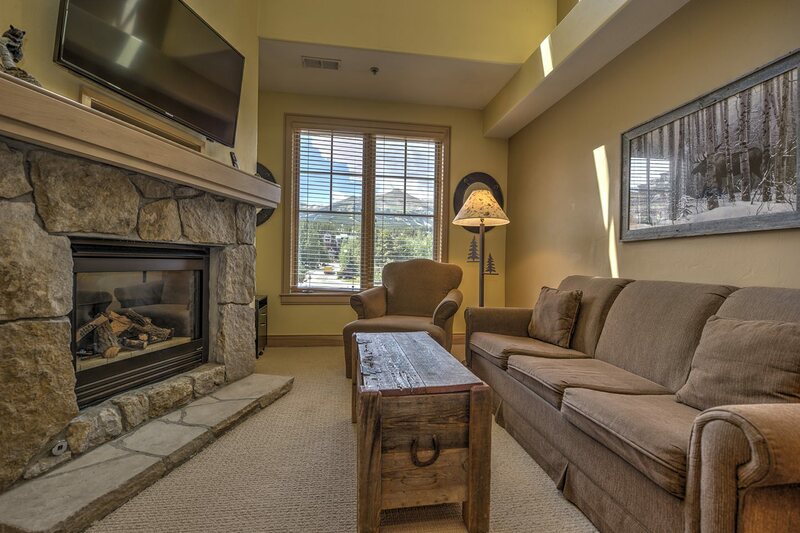 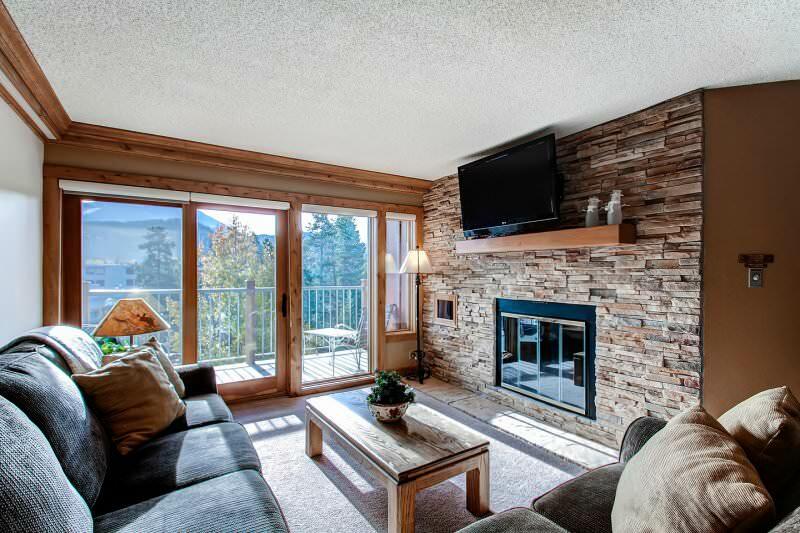 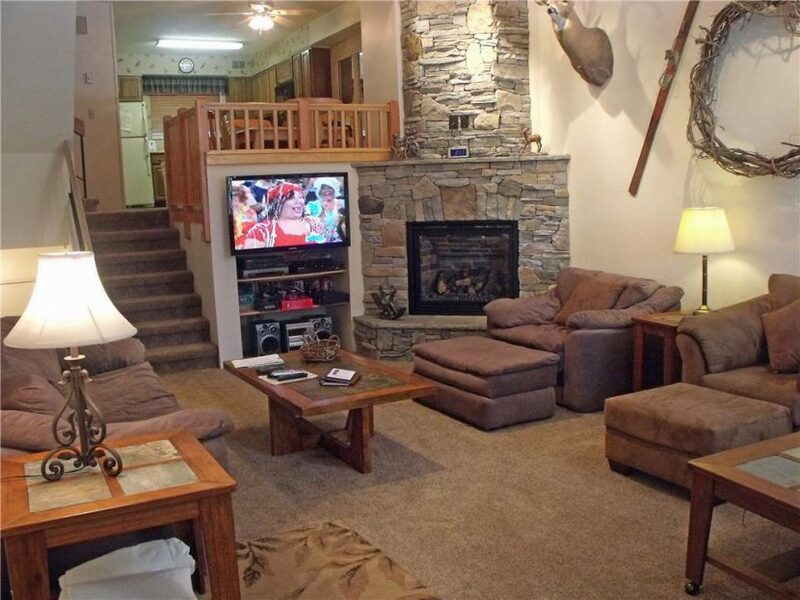 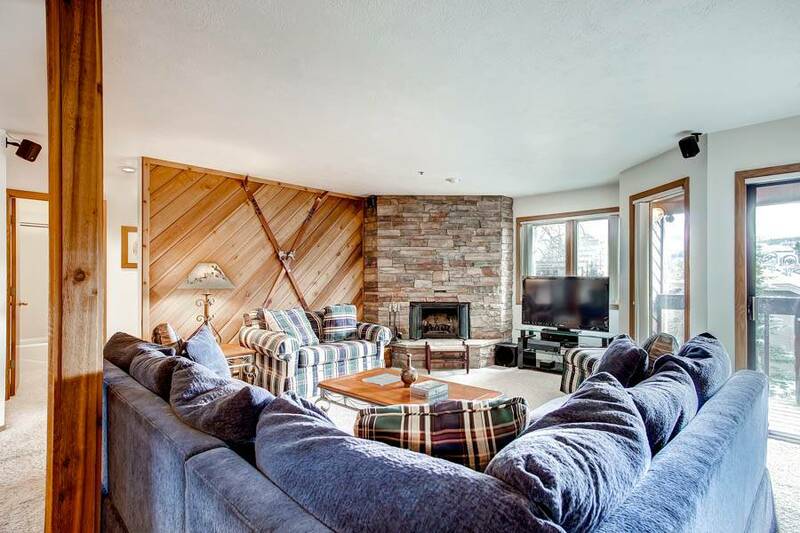 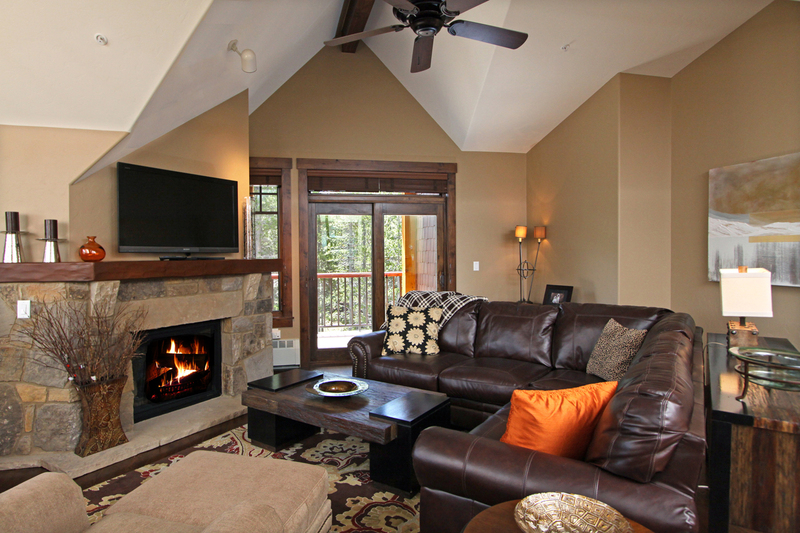 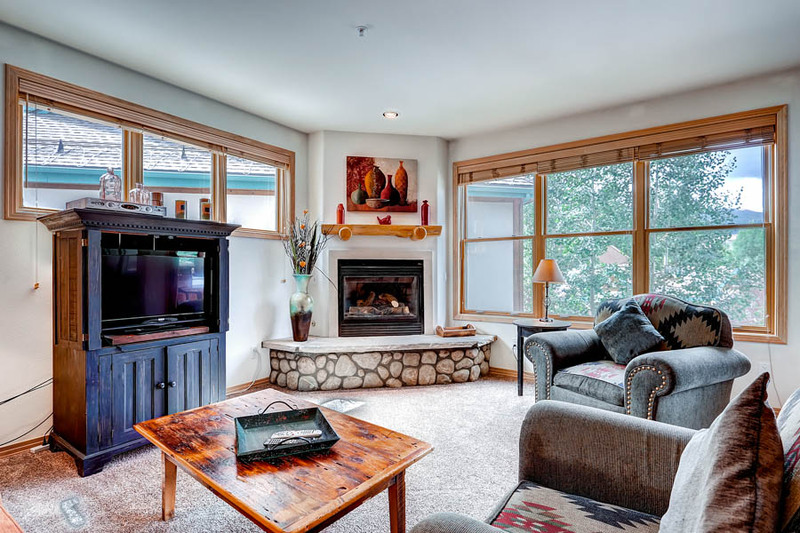 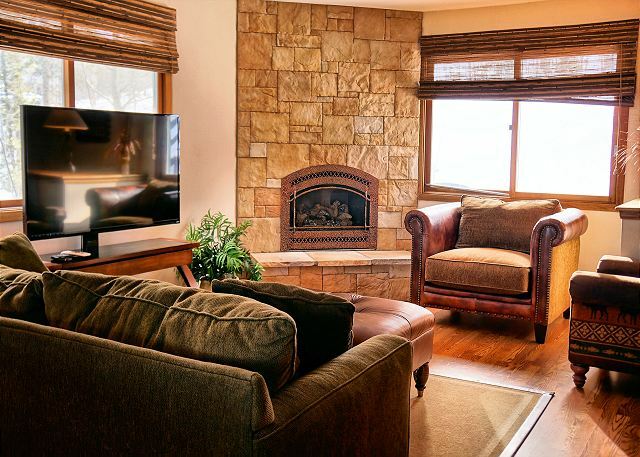 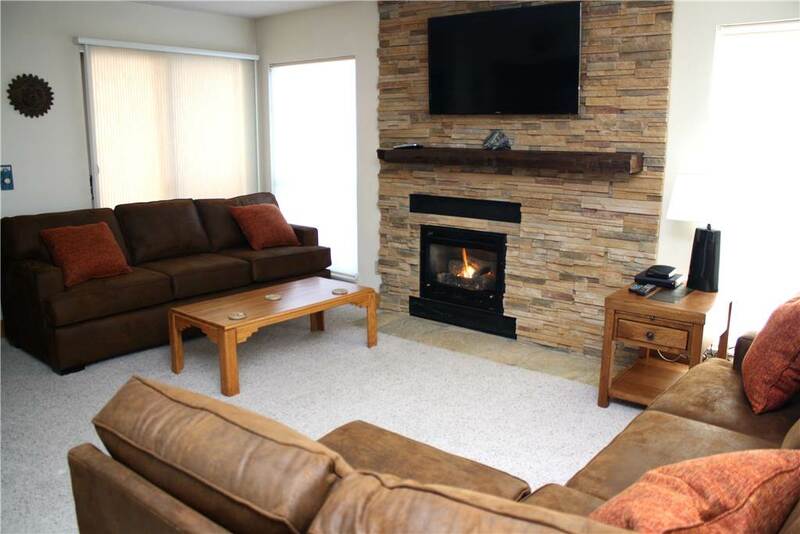 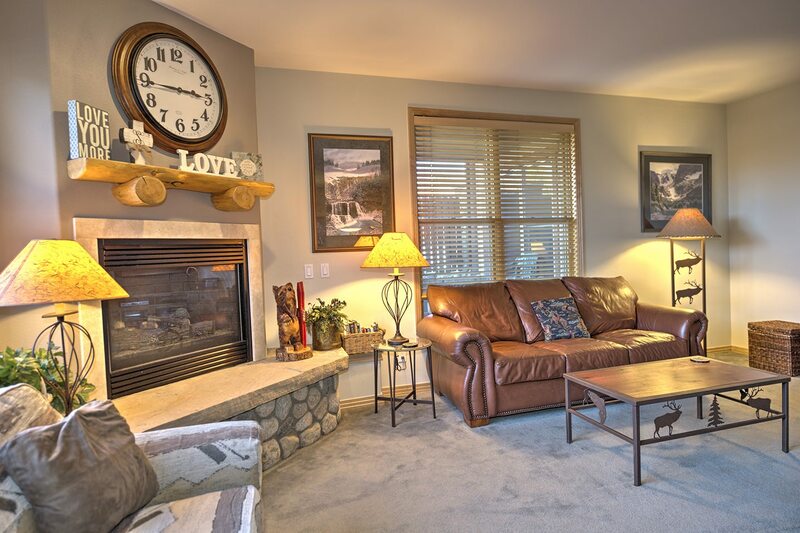 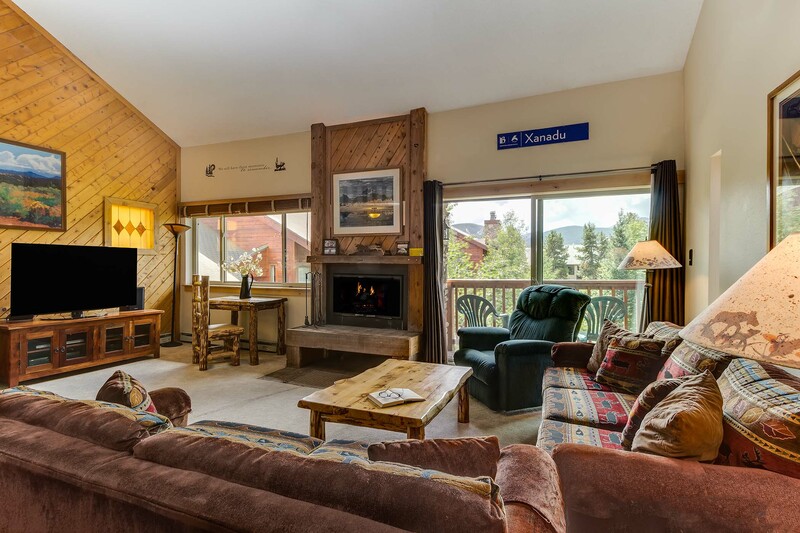 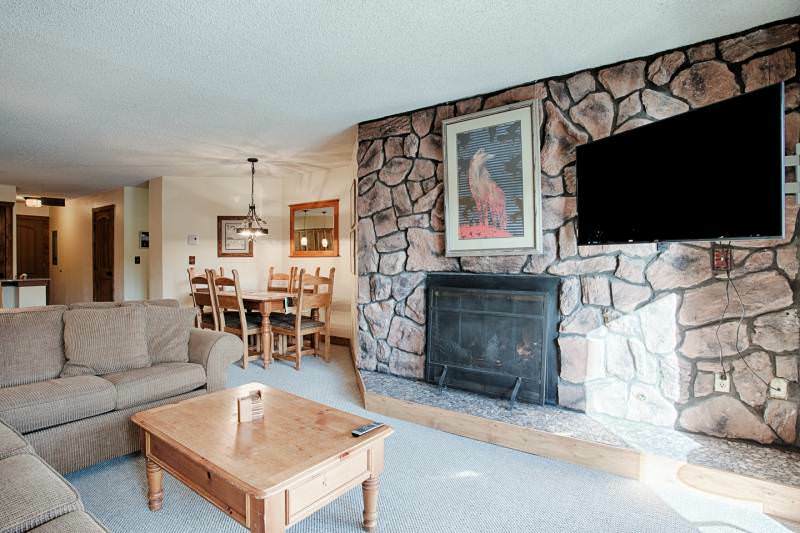 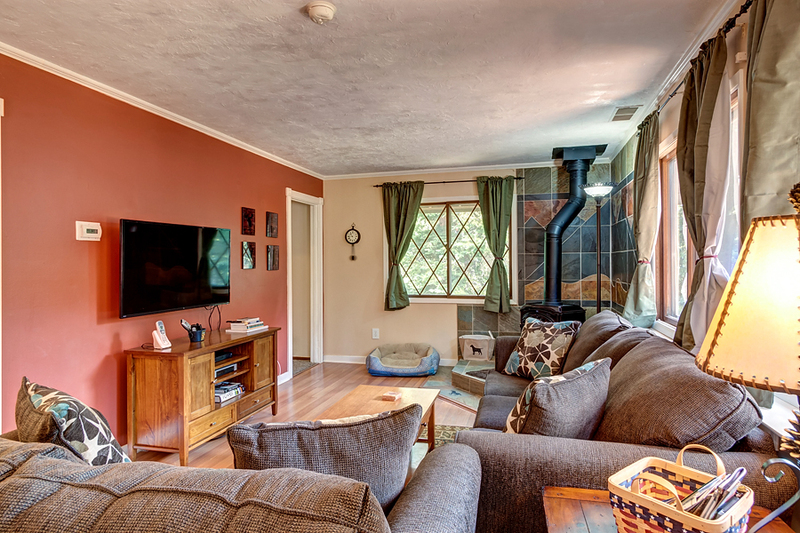 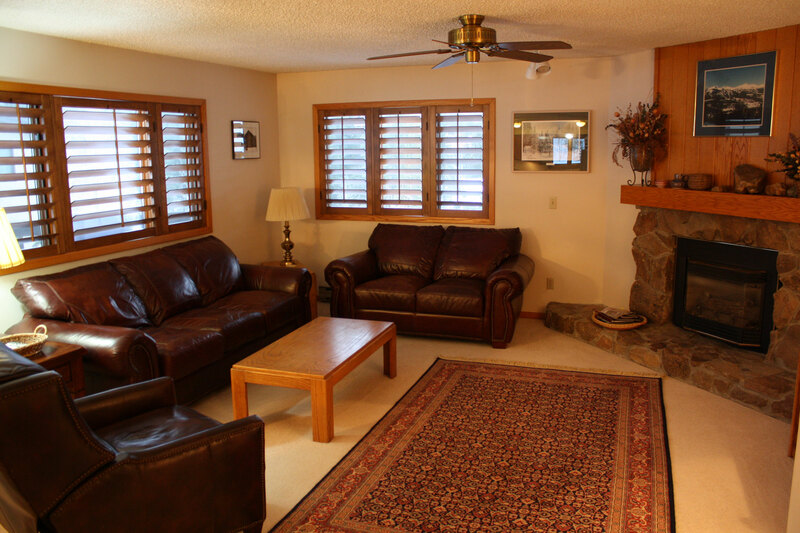 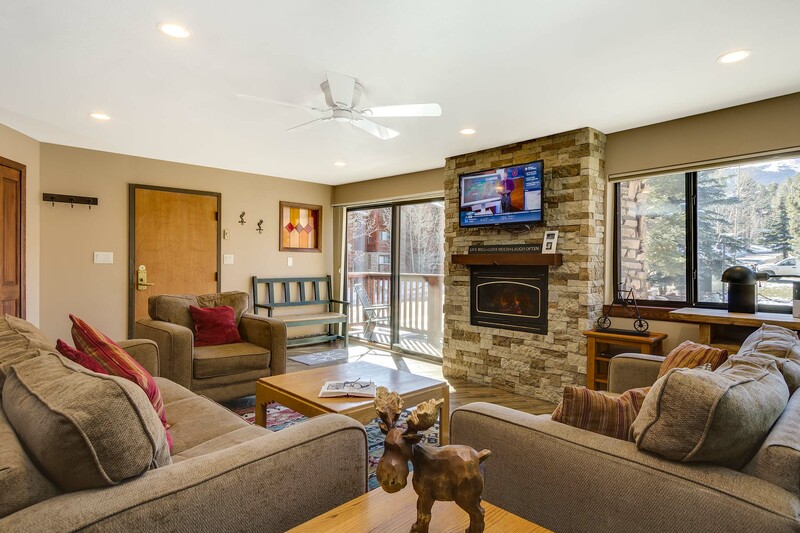 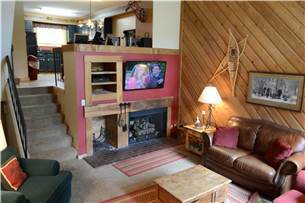 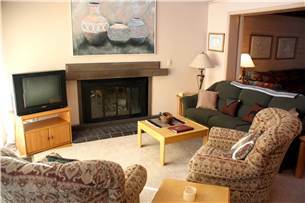 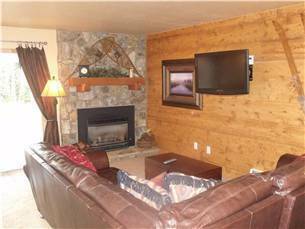 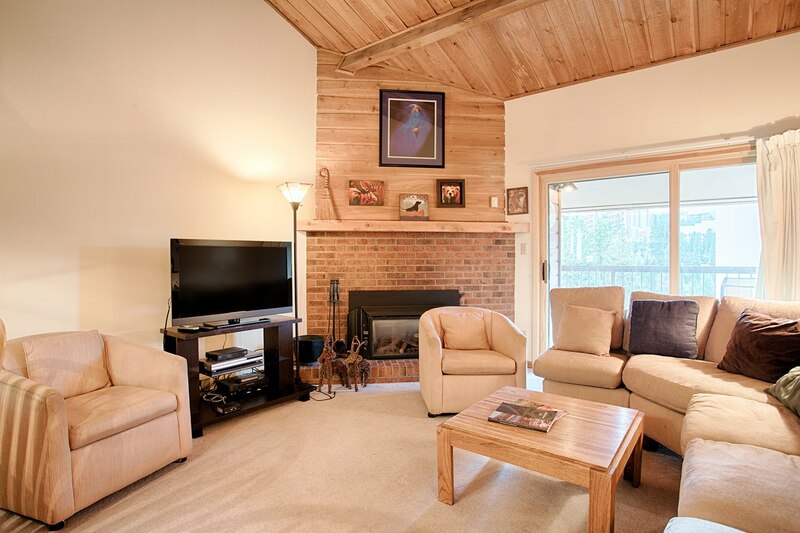 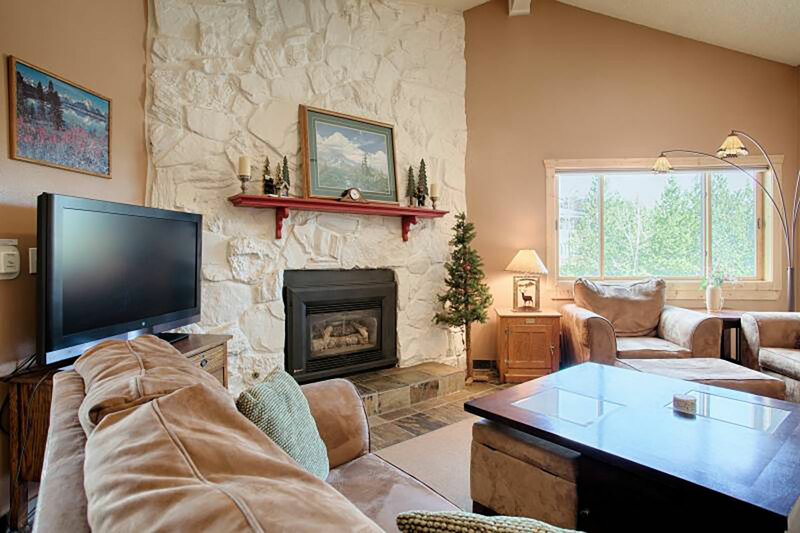 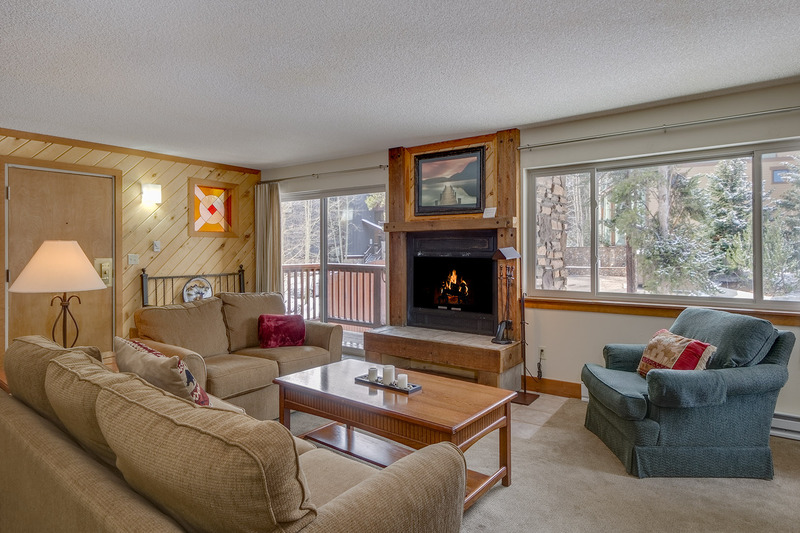 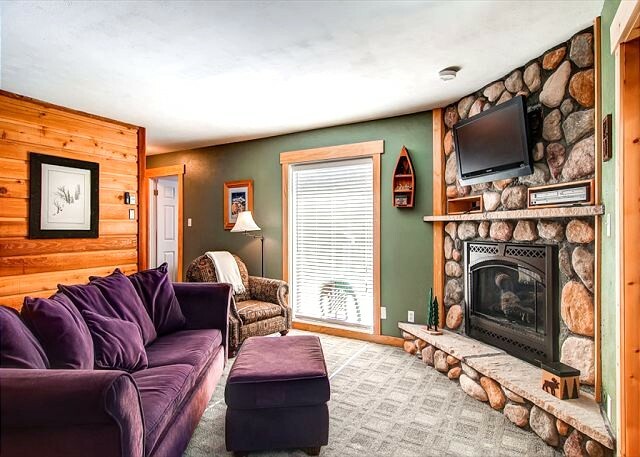 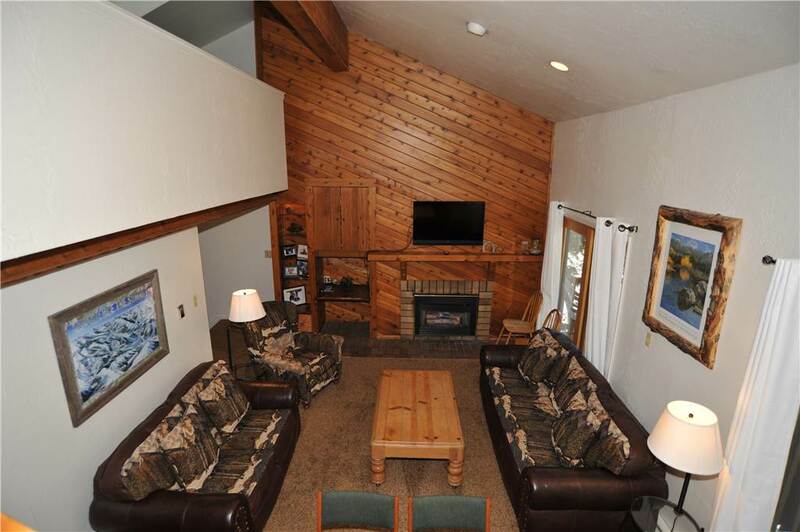 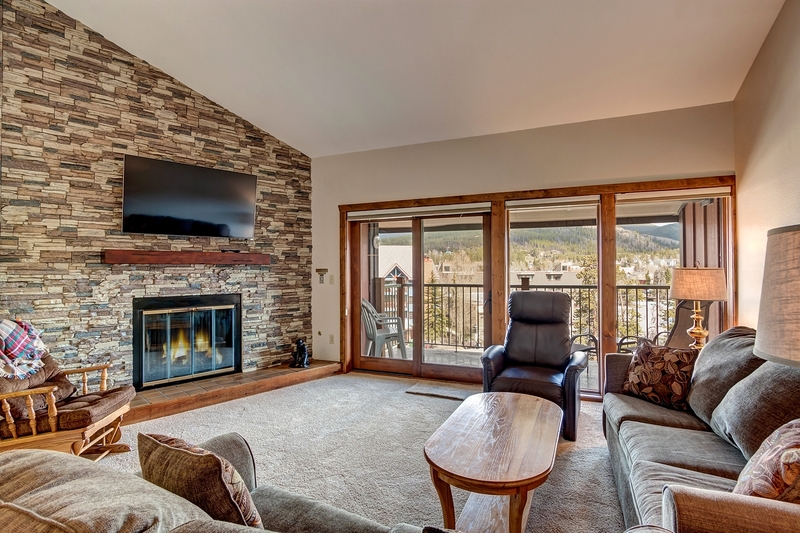 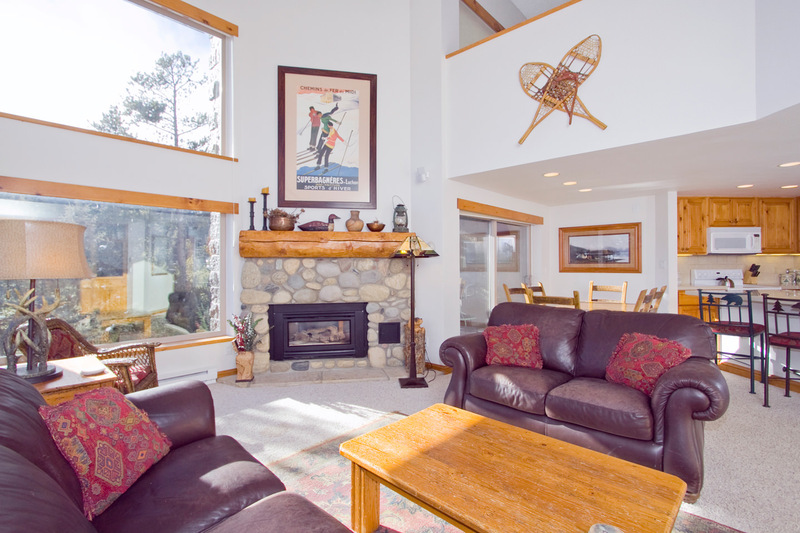 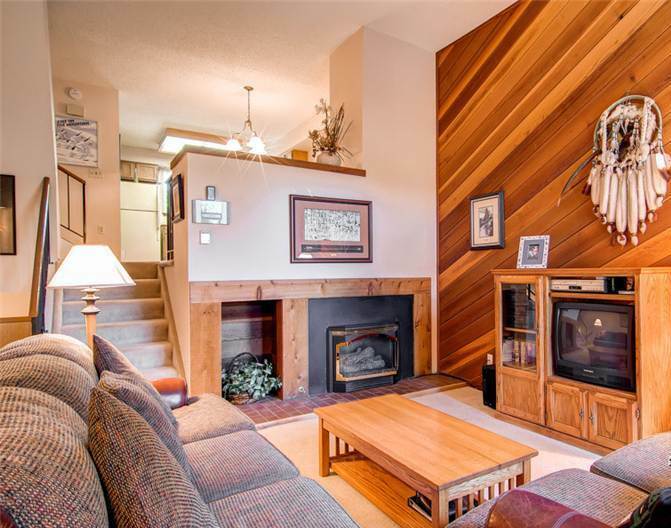 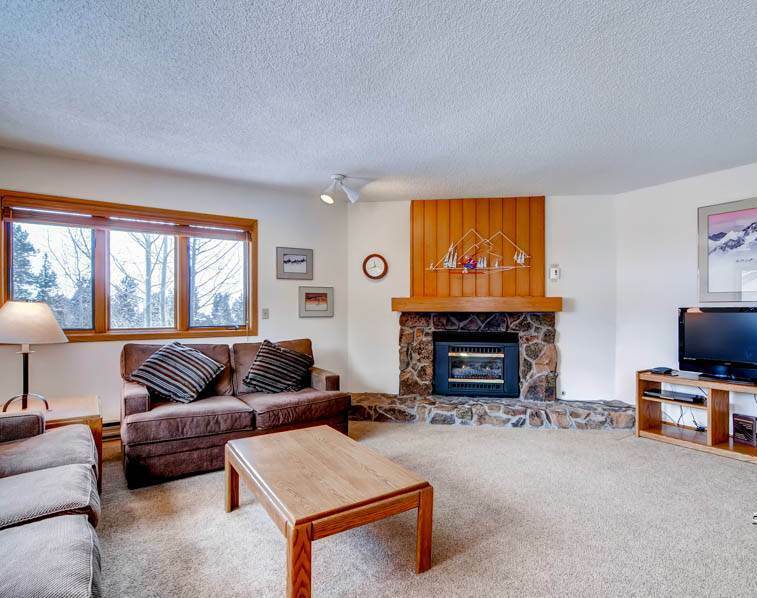 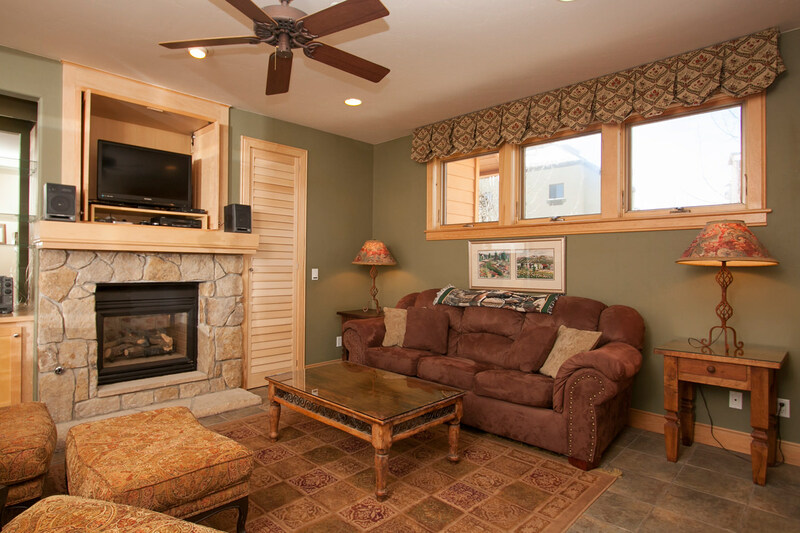 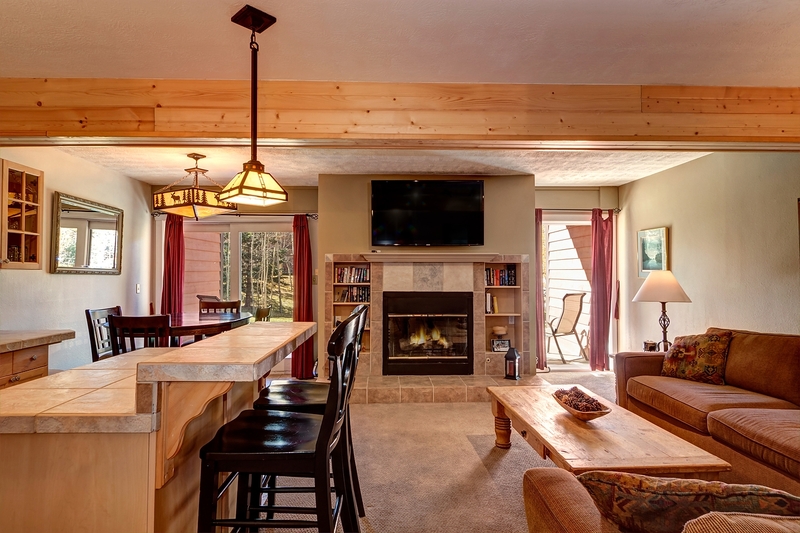 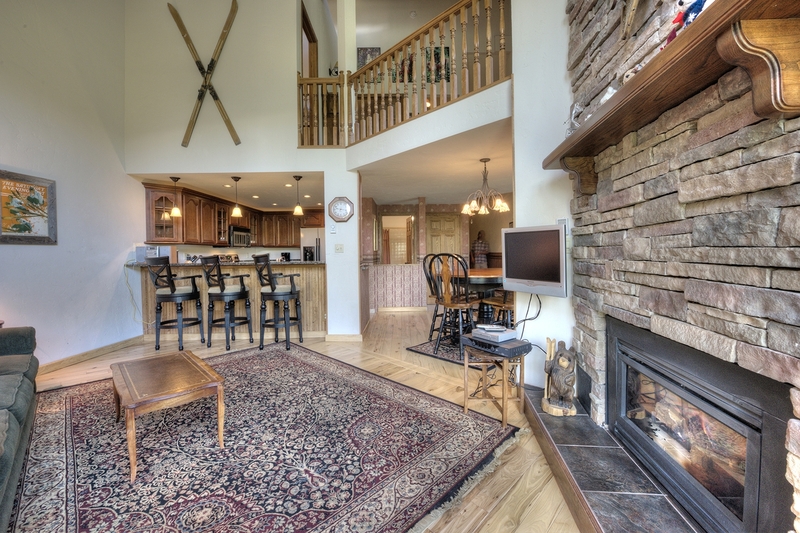 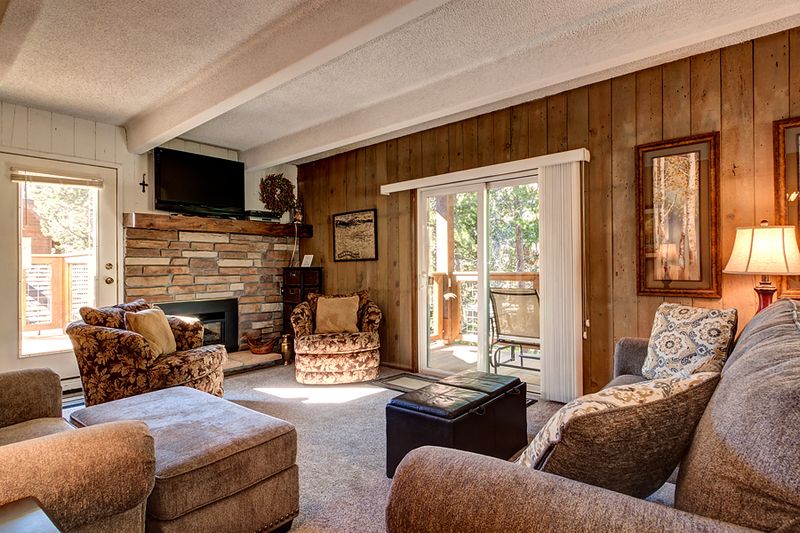 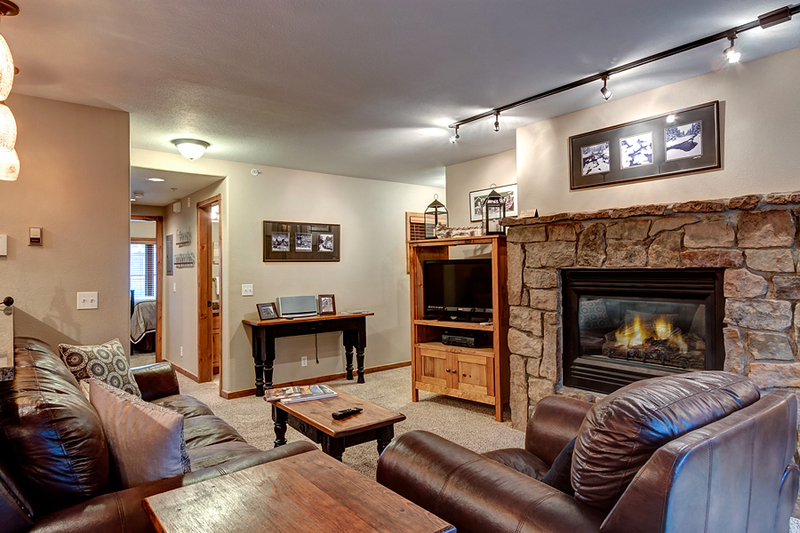 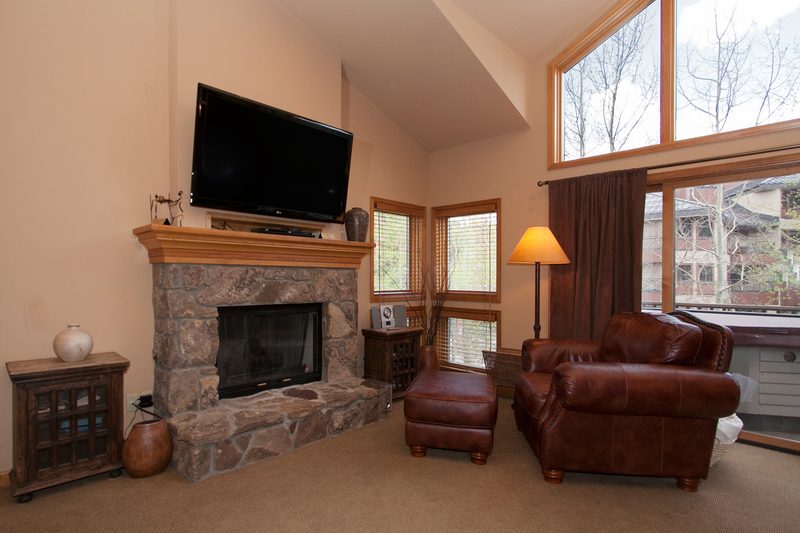 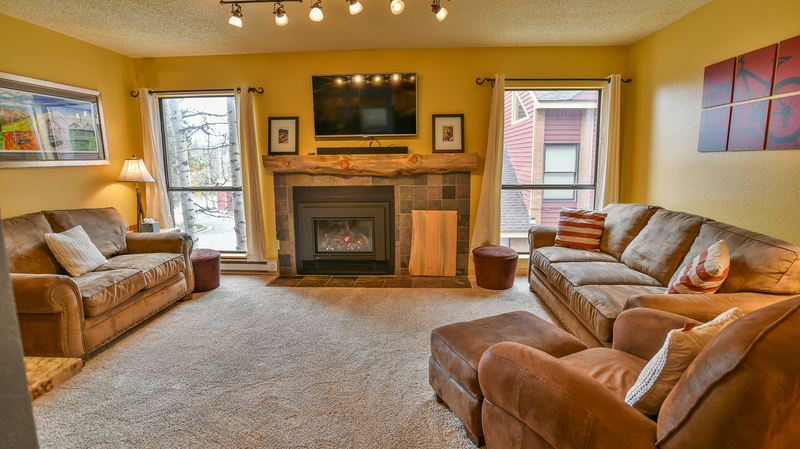 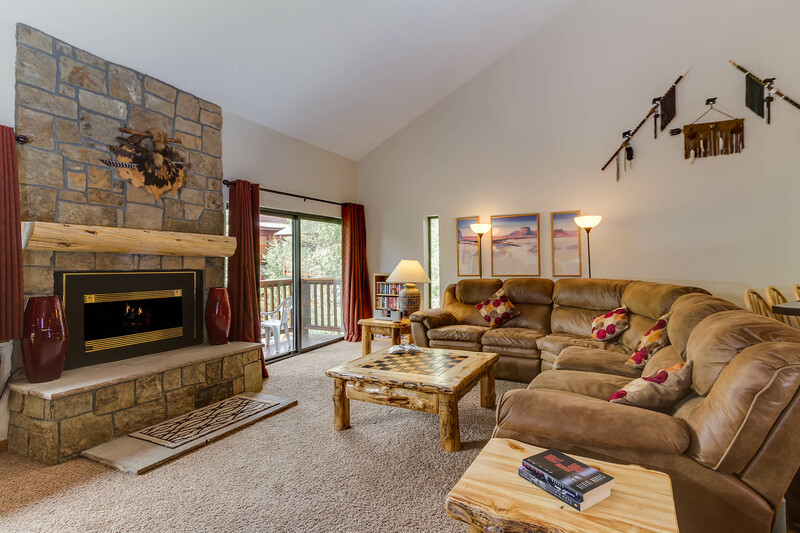 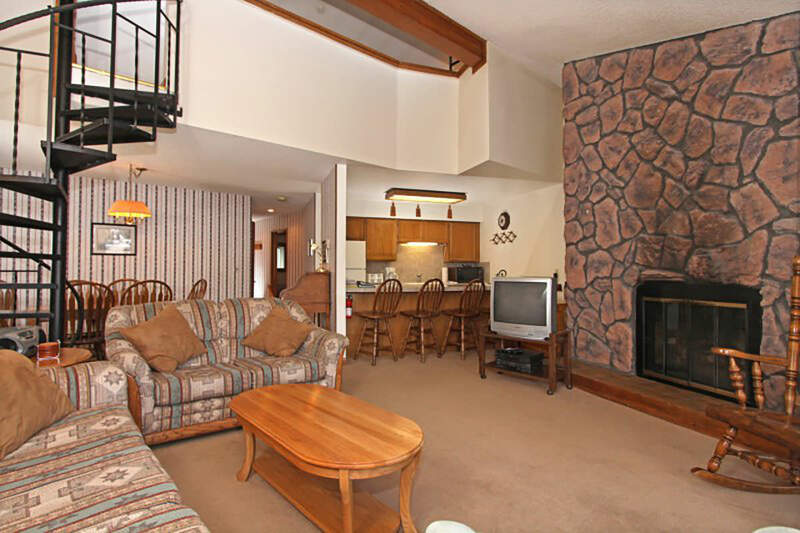 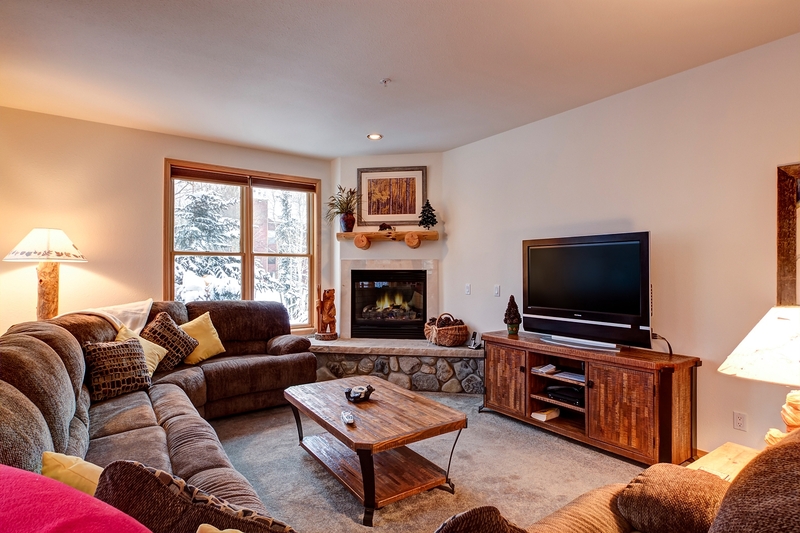 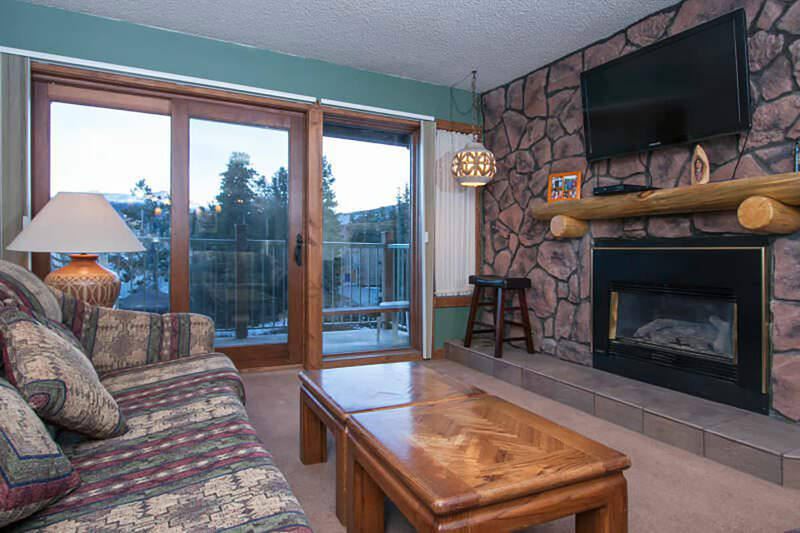 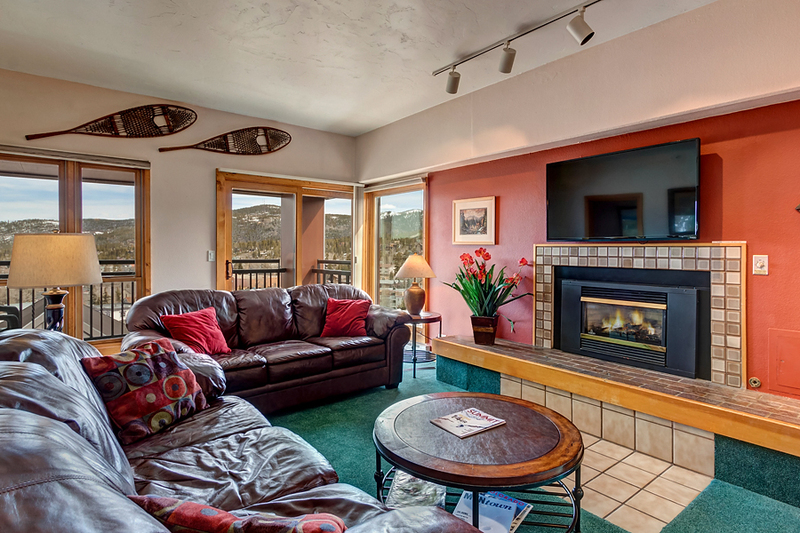 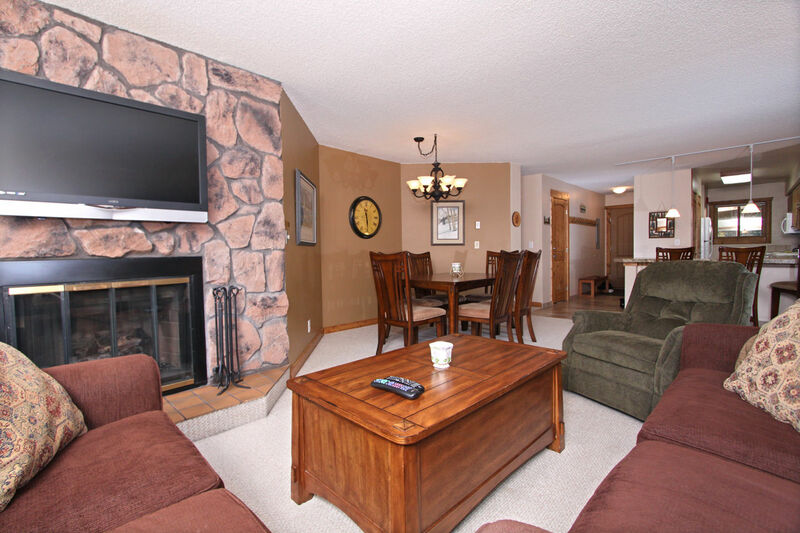 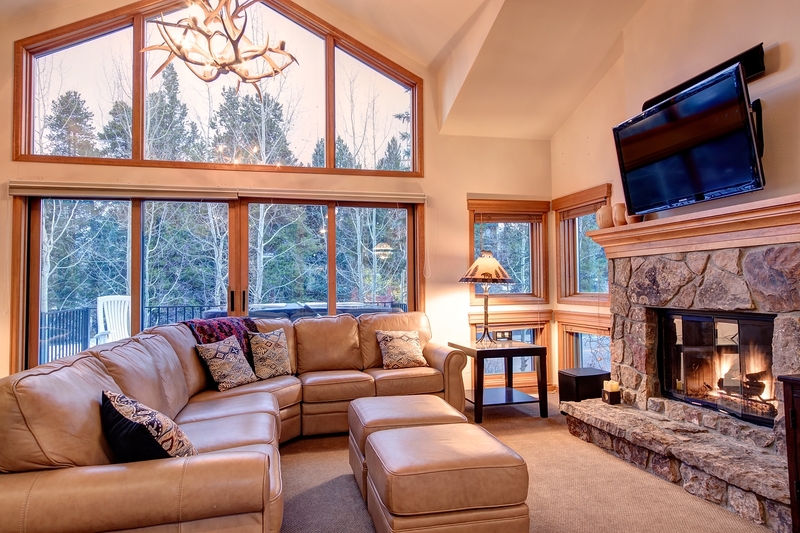 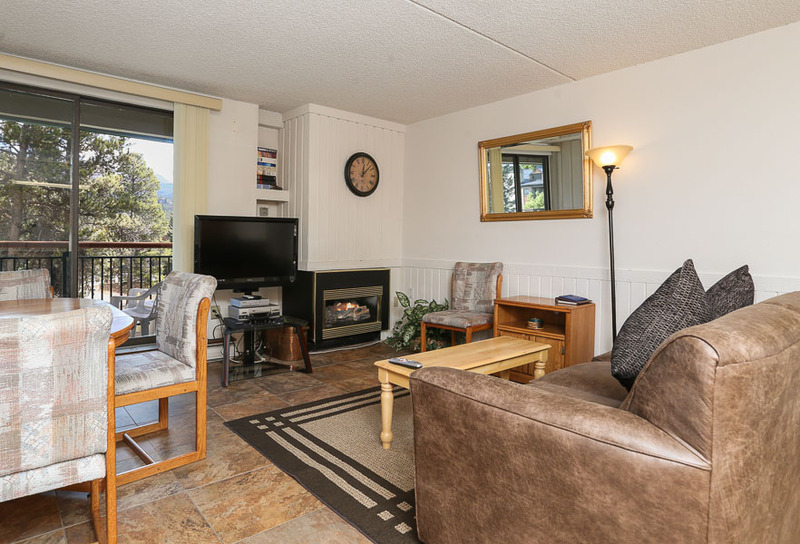 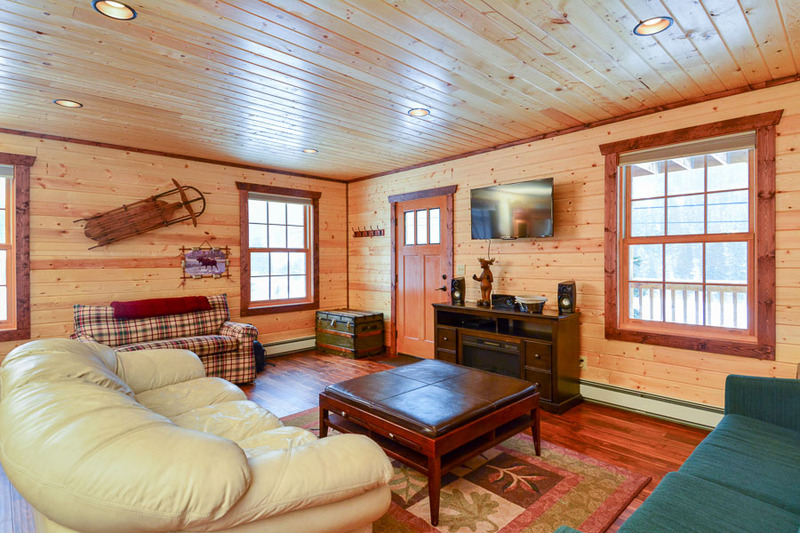 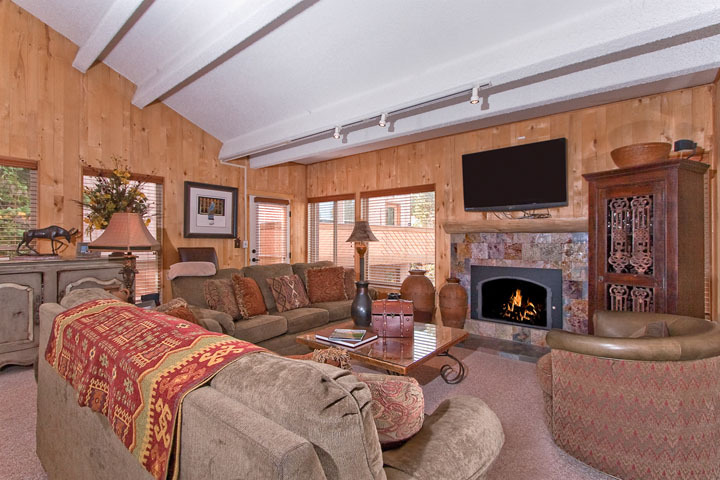 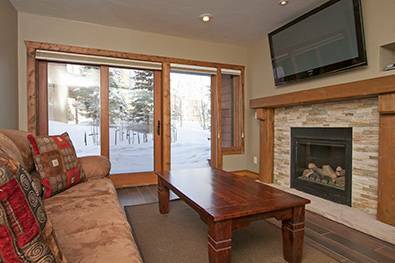 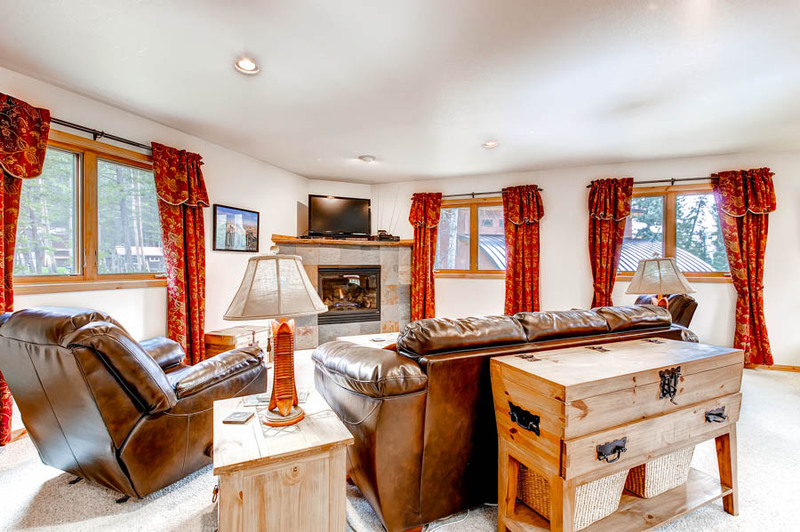 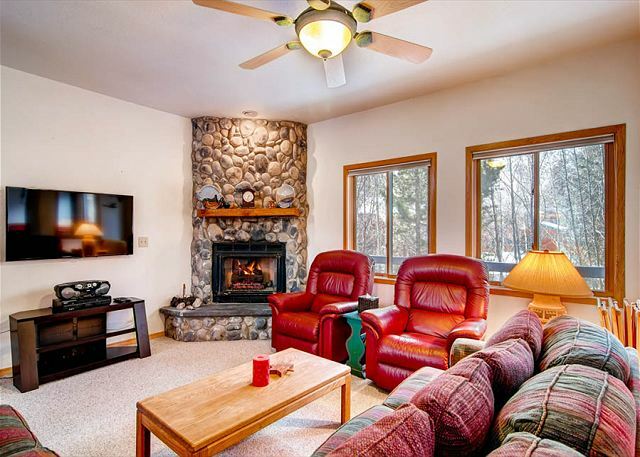 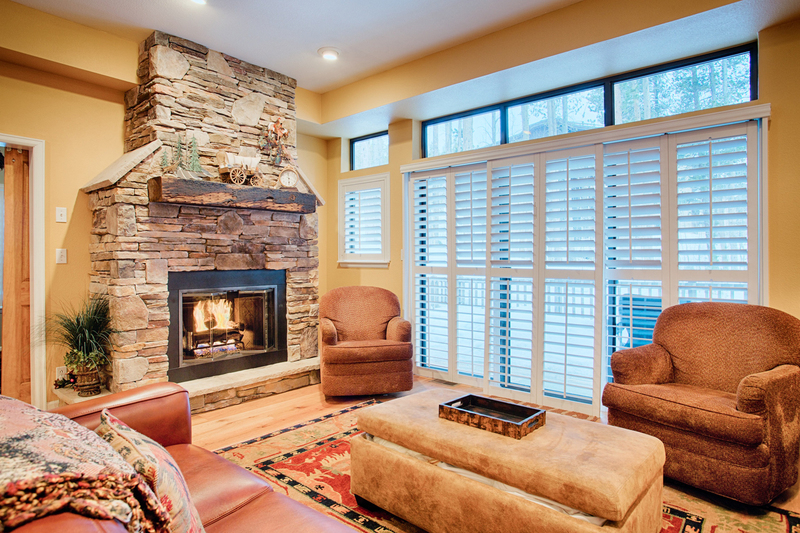 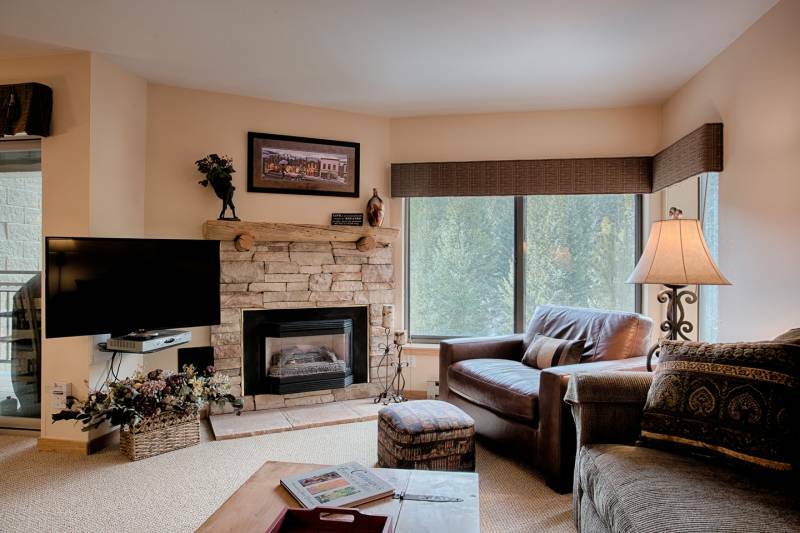 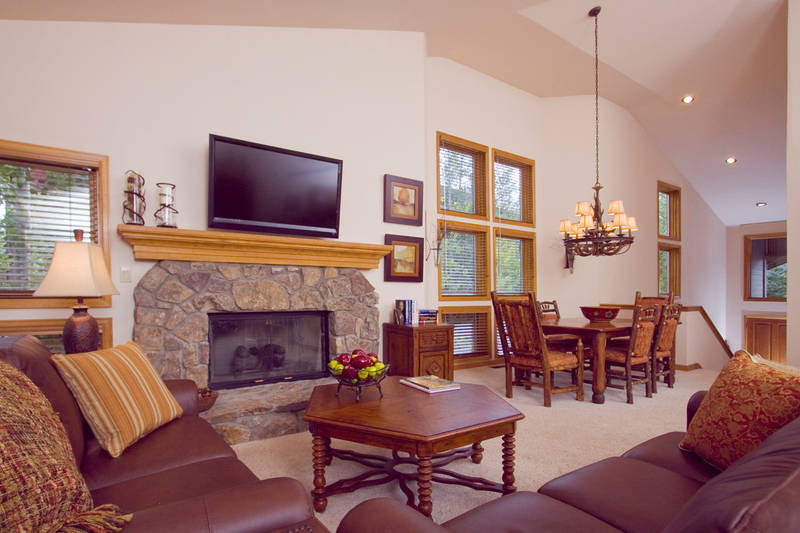 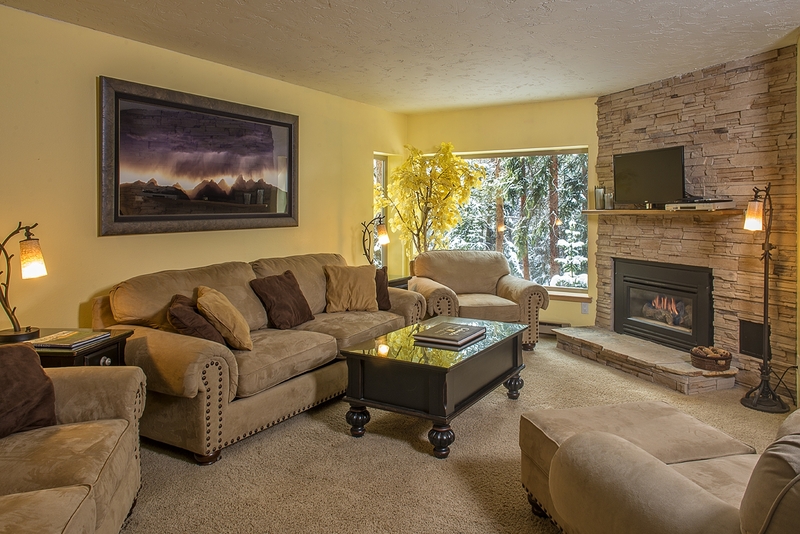 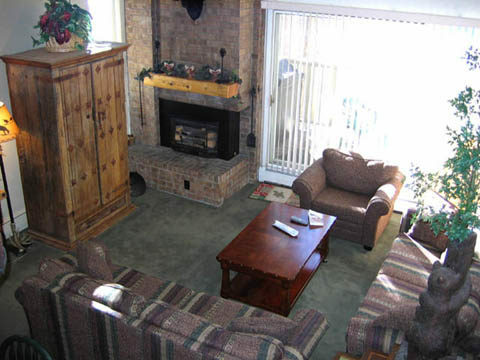 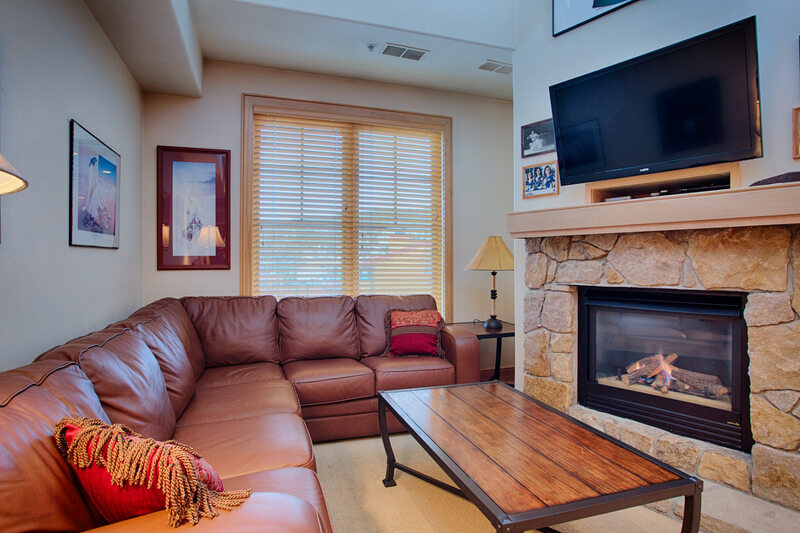 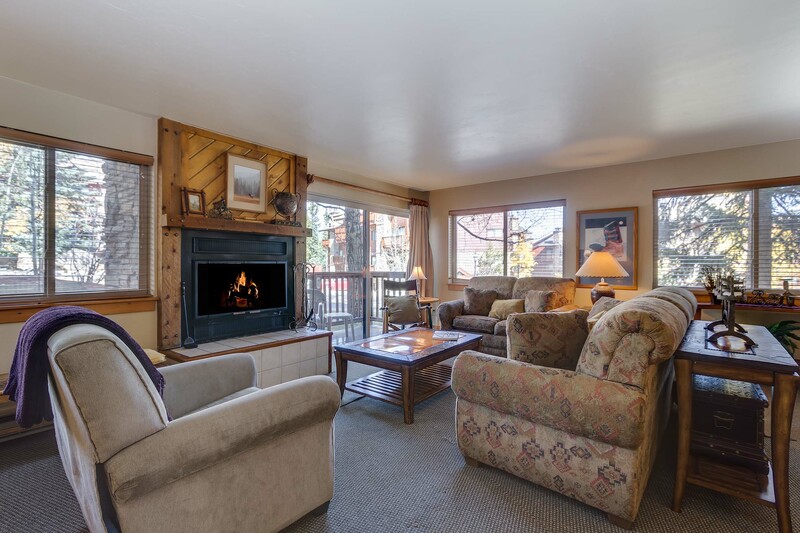 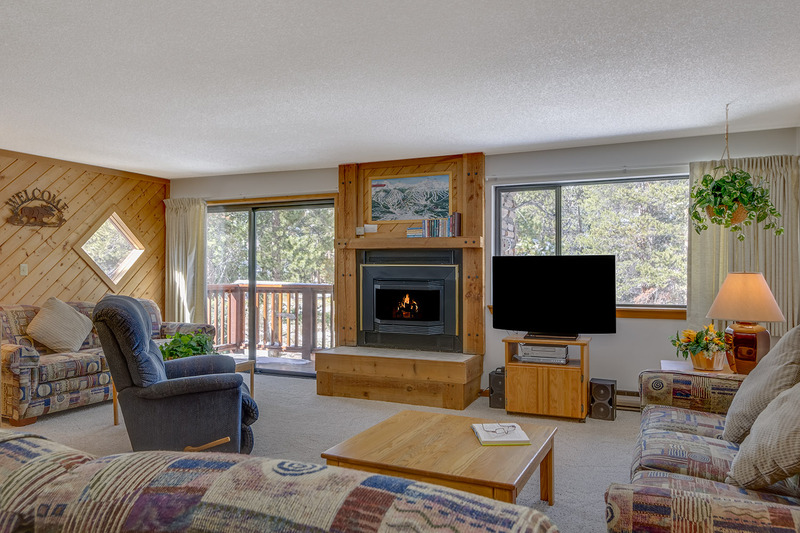 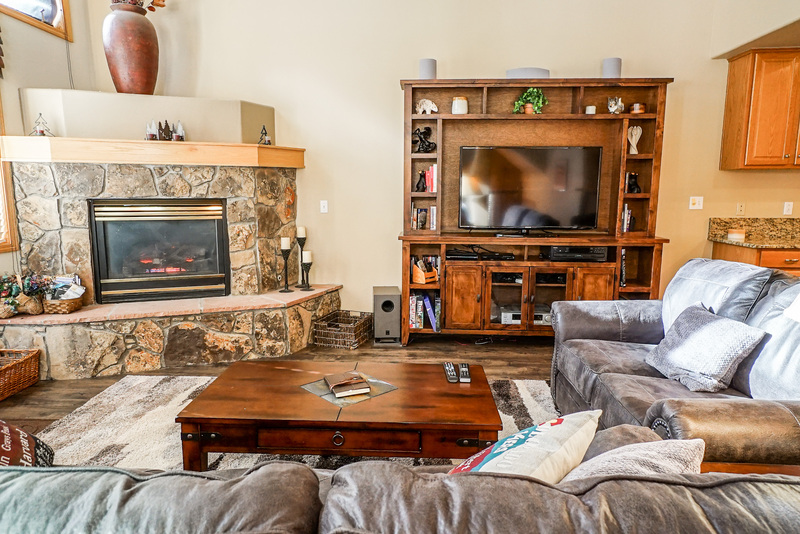 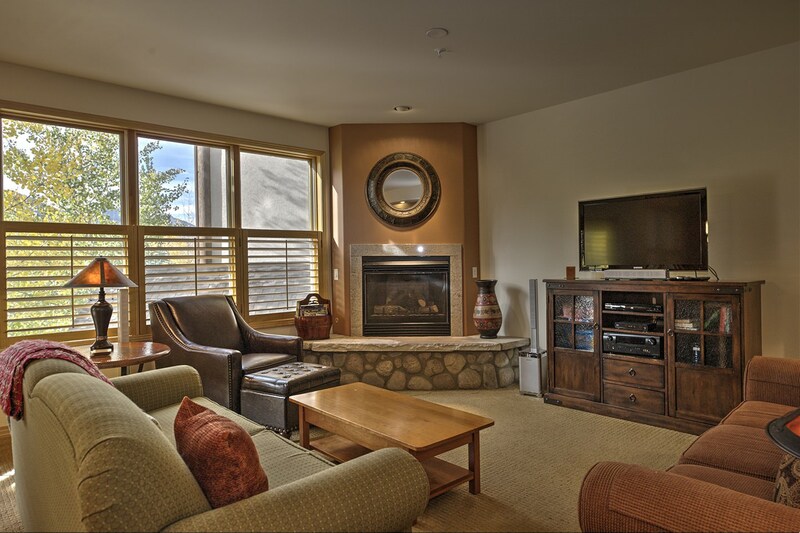 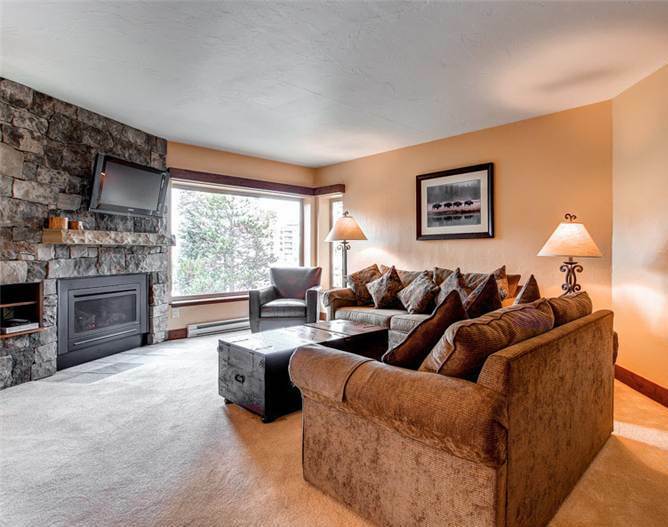 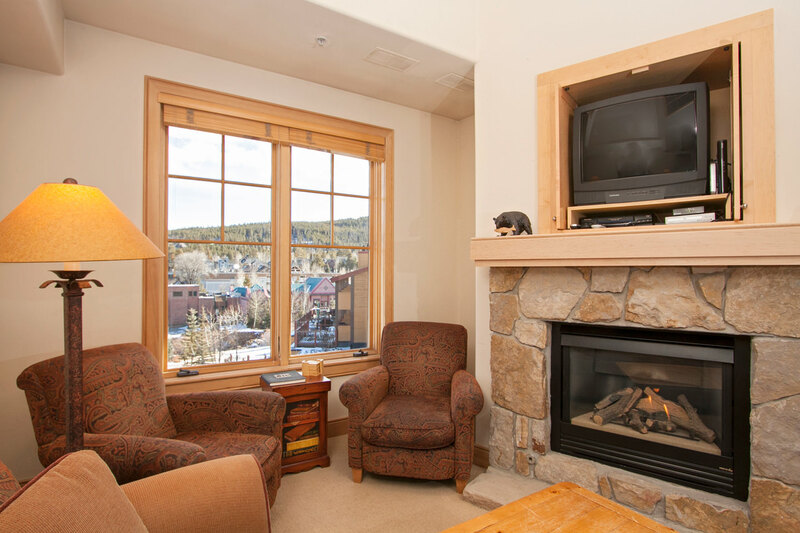 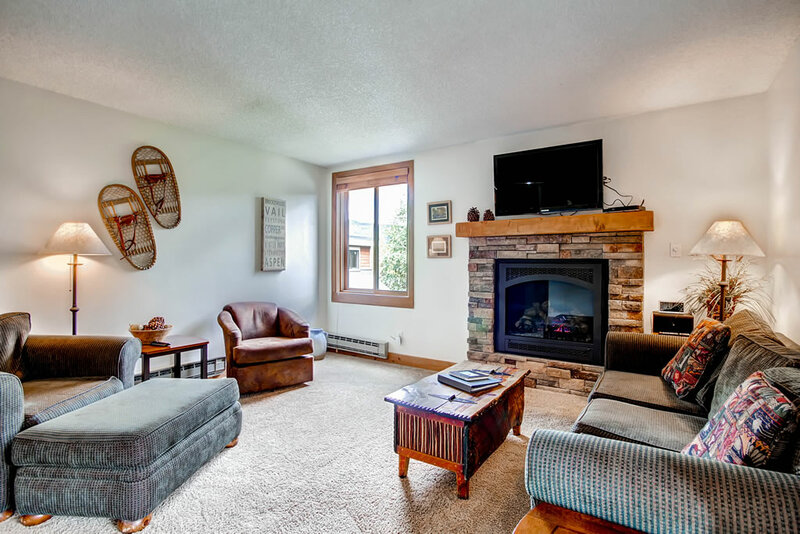 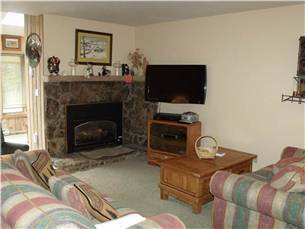 Start your day off right with a cup of coffee while you enjoy a fire in the wood burning fireplace and watch your favorite show on the 37″ flat screen TV. 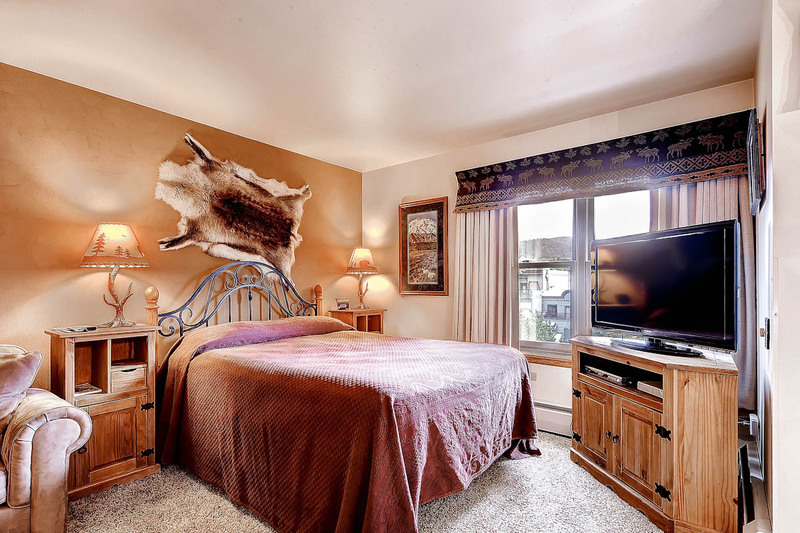 This bedroom also has a private bathroom featuring an immense Jacuzzi tub perfect for lounging in after a long day on the slopes. 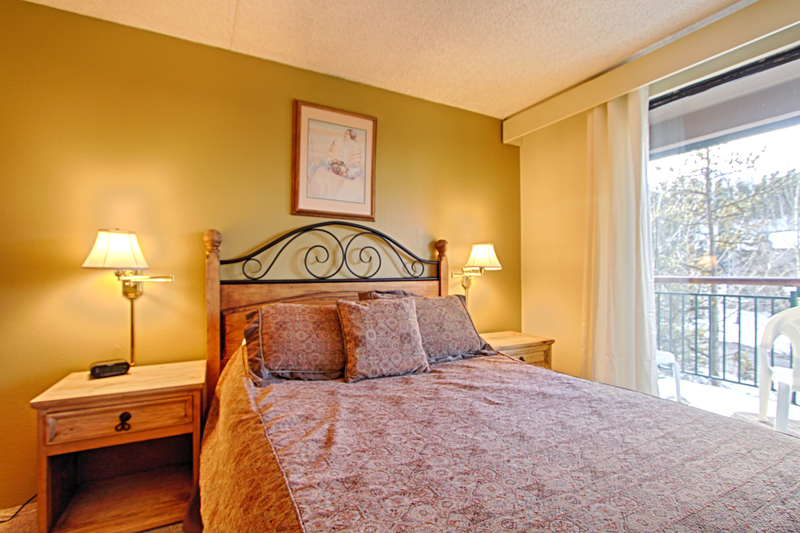 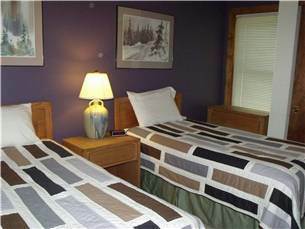 The second bedroom has a Queen bed and a private bathroom. 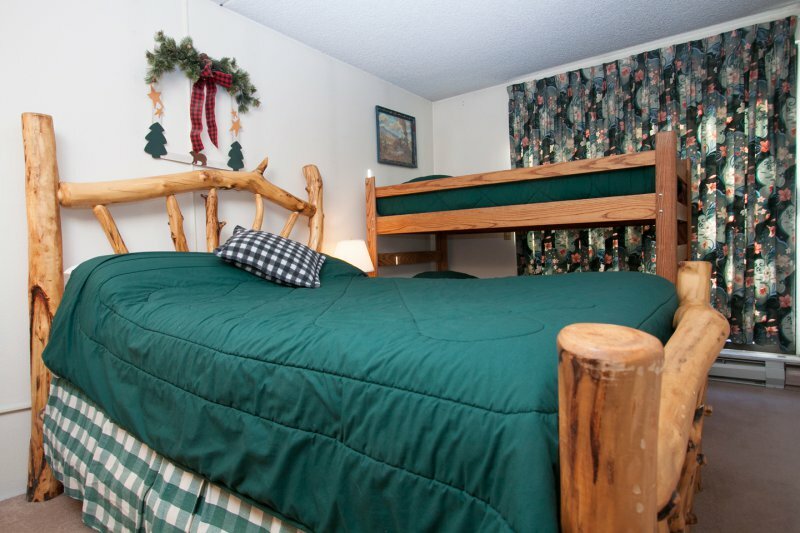 The bunk room has a twin bunk bed plus an additional twin bed. 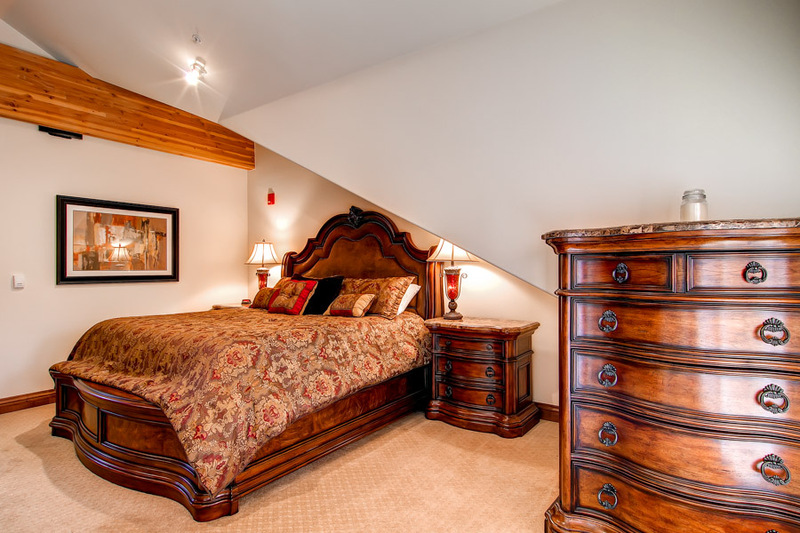 The third bedroom has a Queen bed encased in traditional quilted bedding. 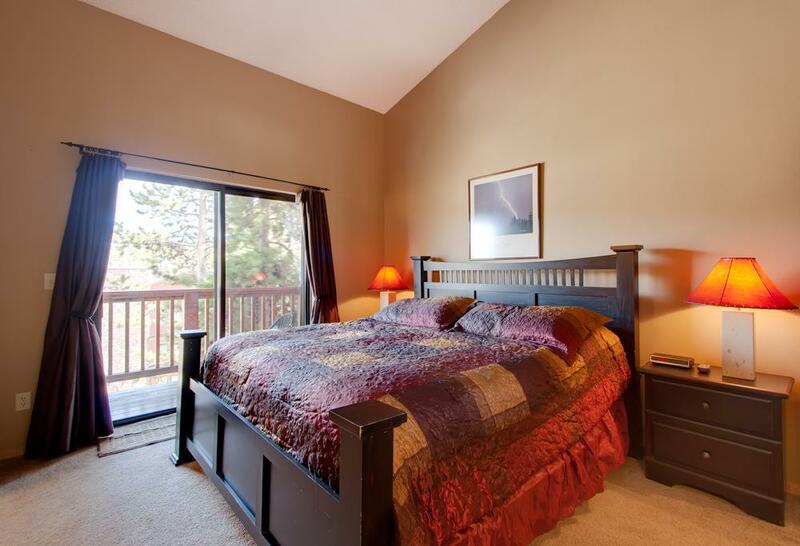 The fourth bedroom also offers a Queen bed. 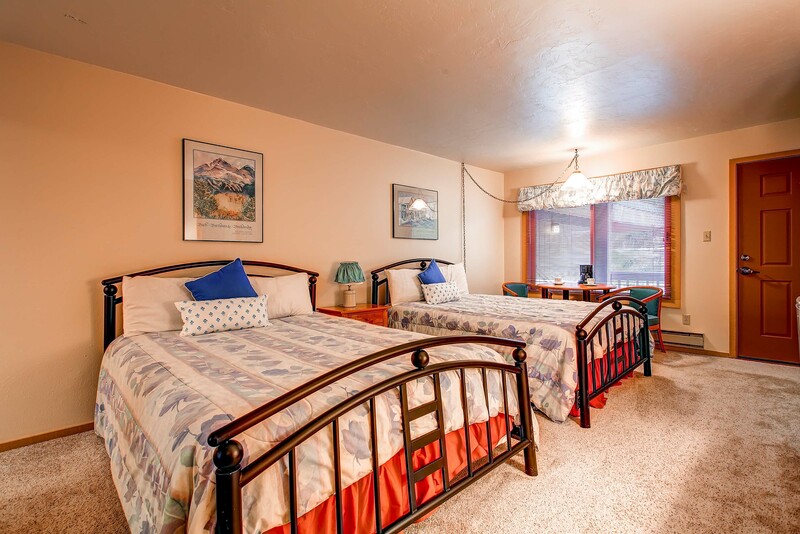 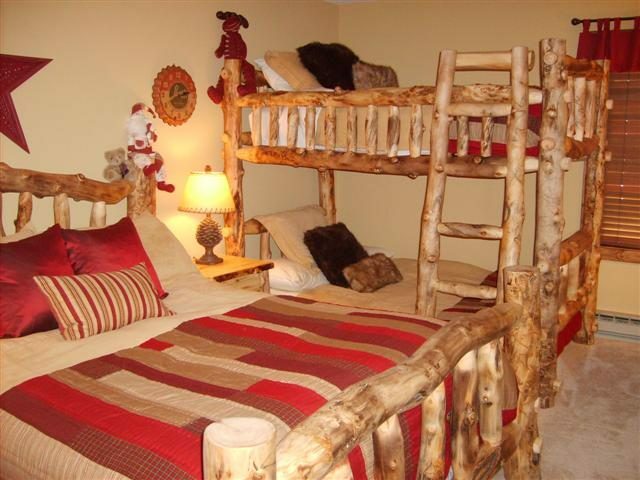 On the same level, there is also a loft that has a twin bunk bed and two additional twin beds that are all encased in adorable, mountain themed bedding. 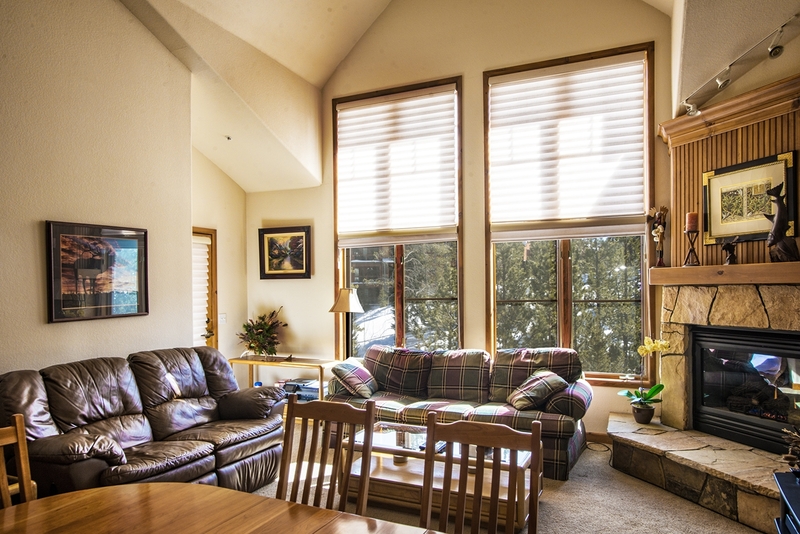 Between the four bedrooms, plus loft and bunk room, the unit can comfortably accommodate up to fifteen people. 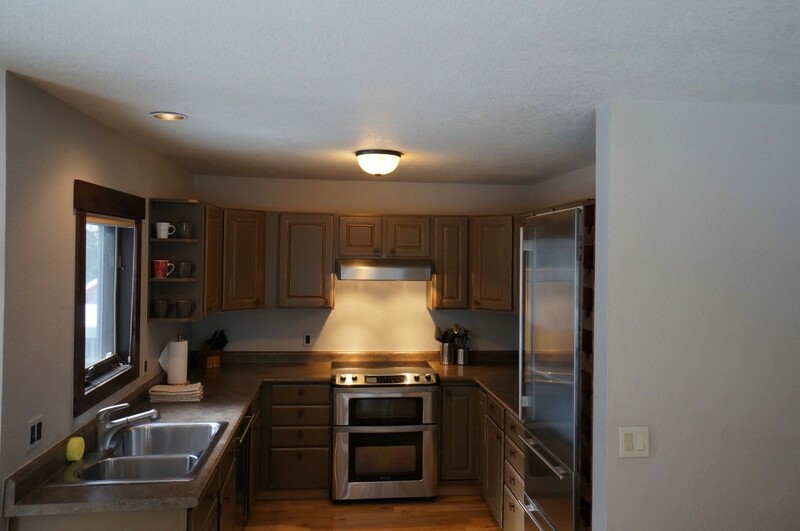 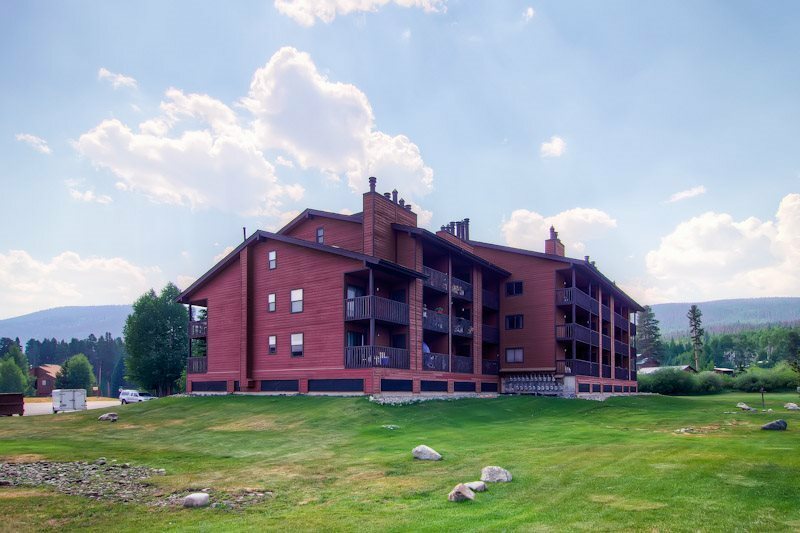 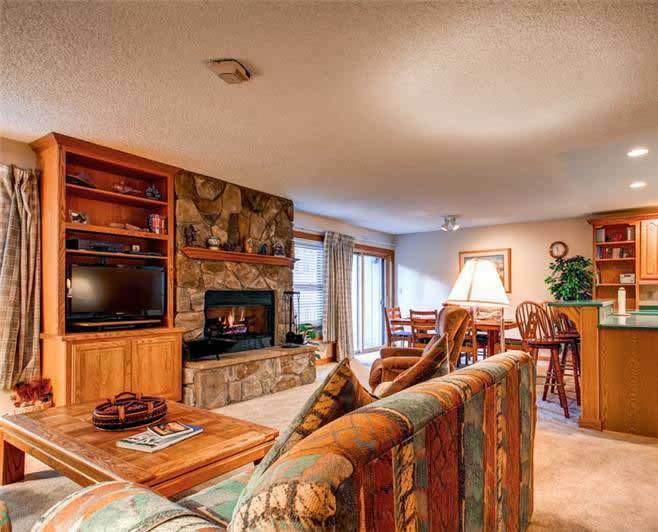 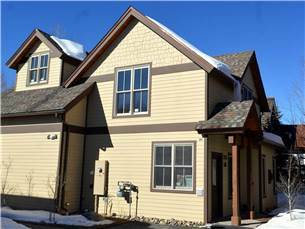 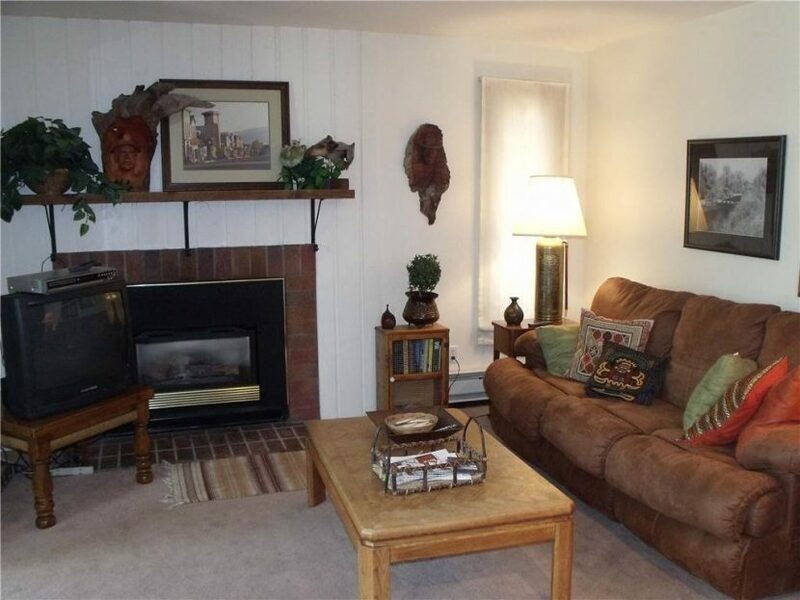 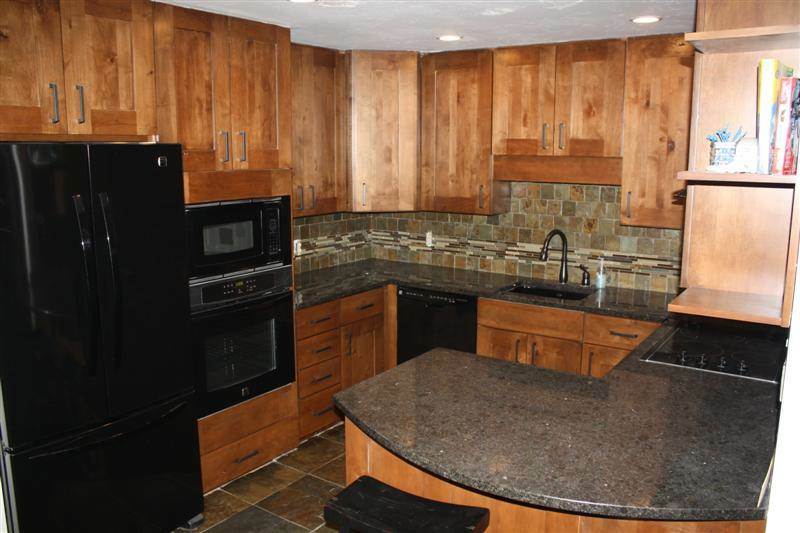 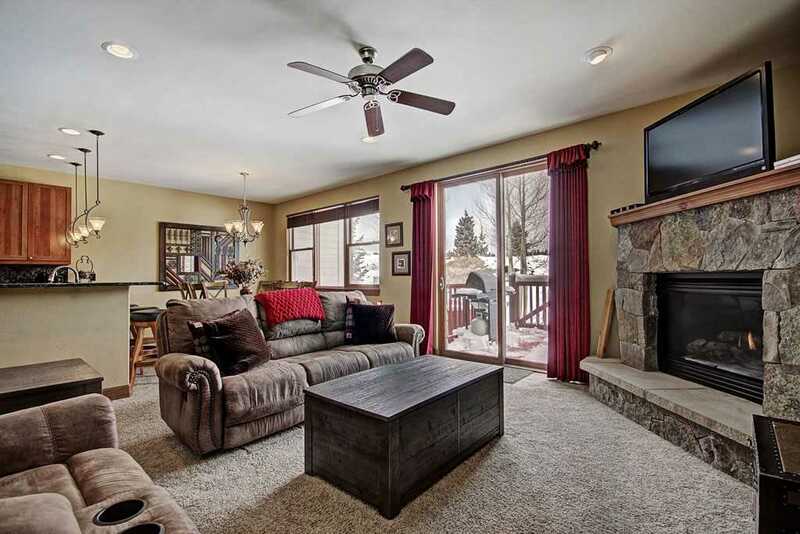 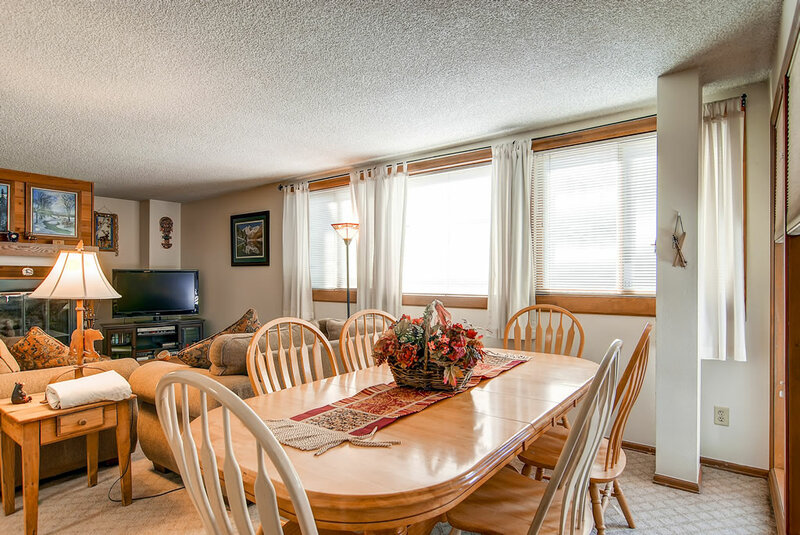 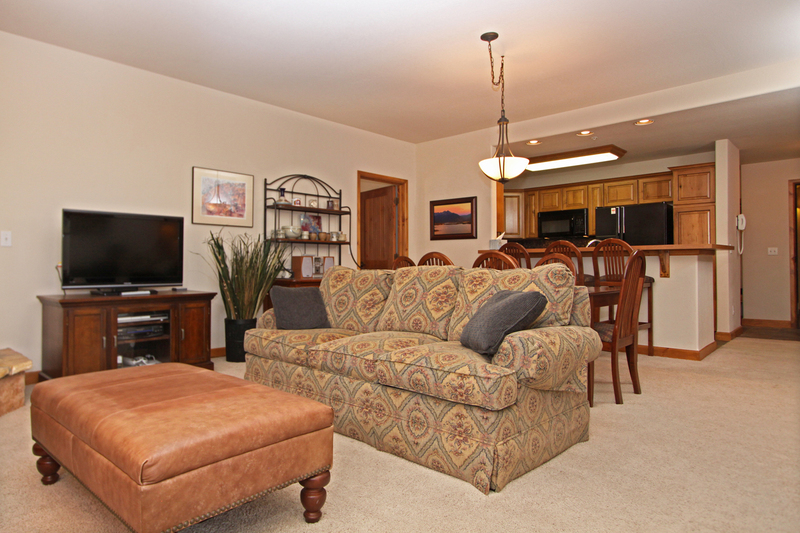 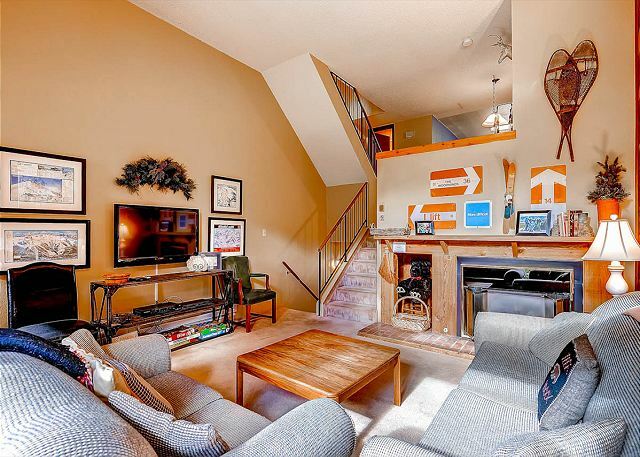 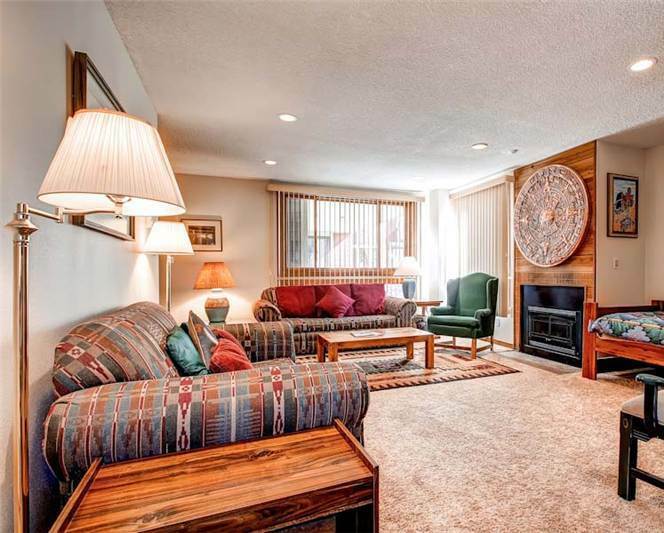 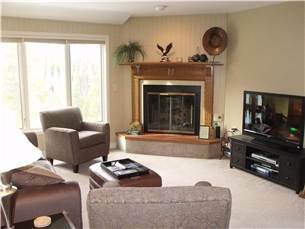 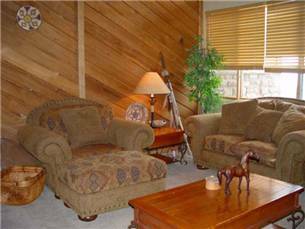 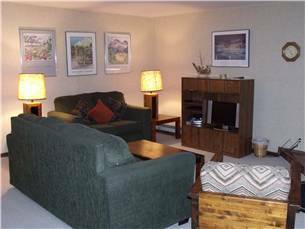 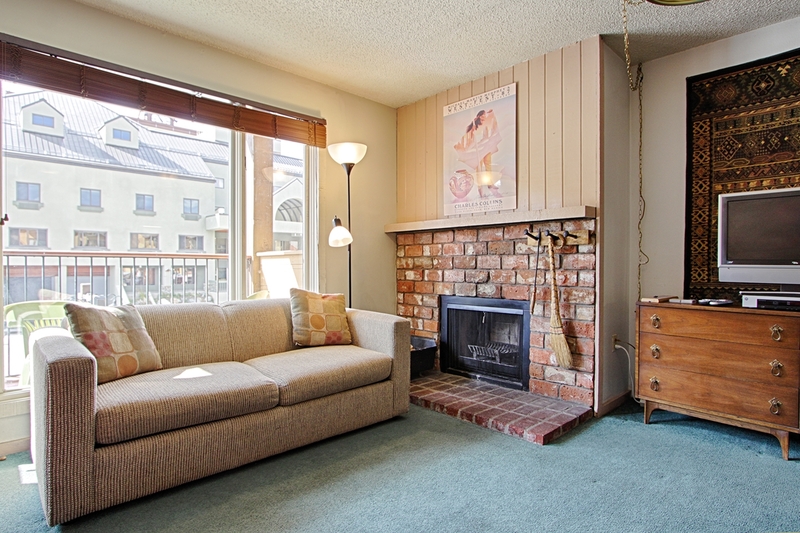 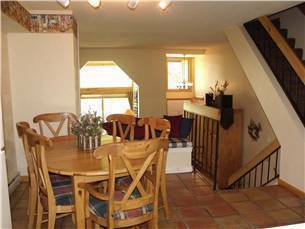 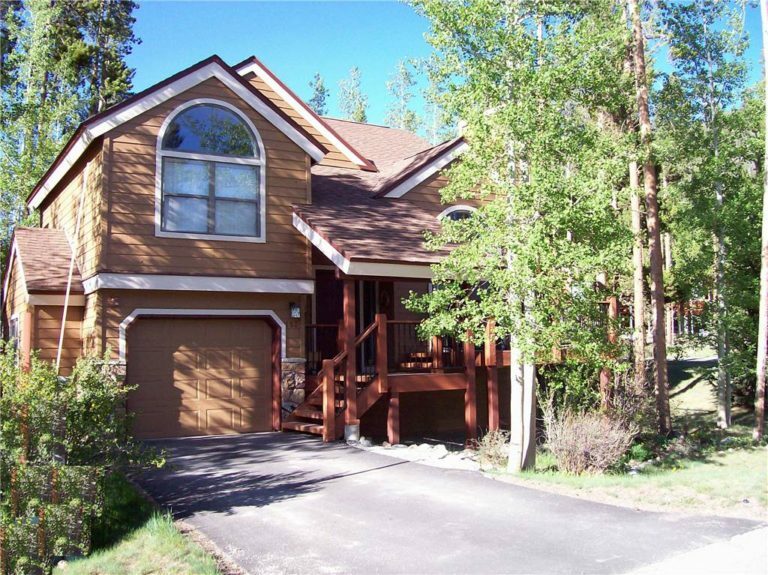 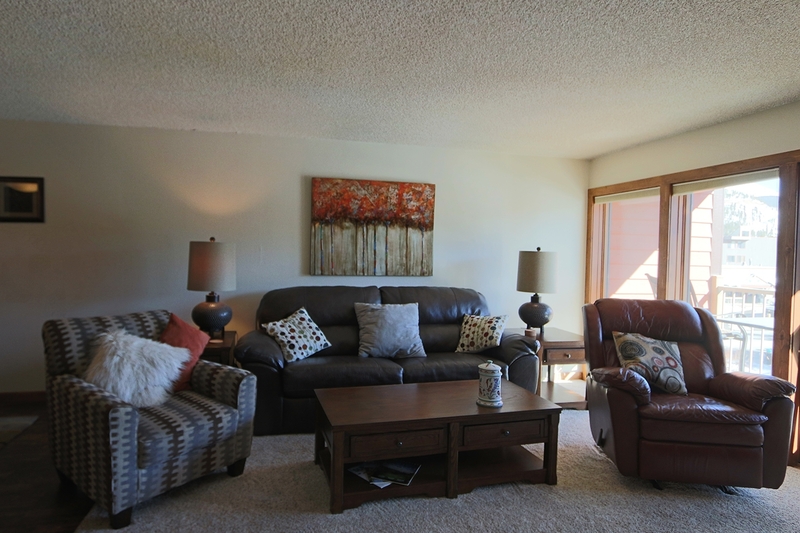 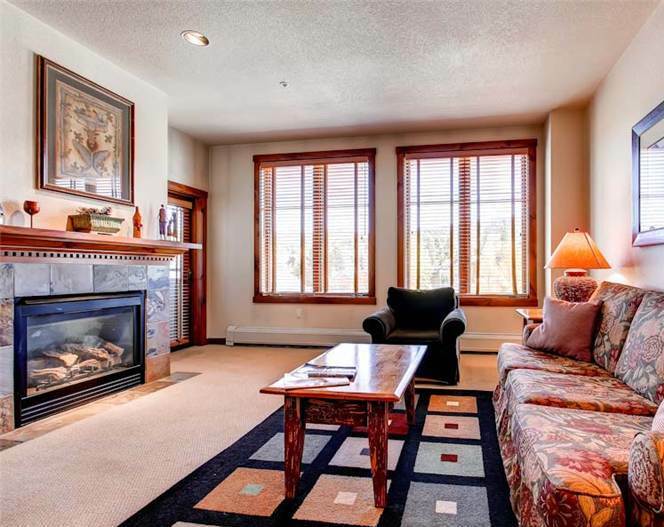 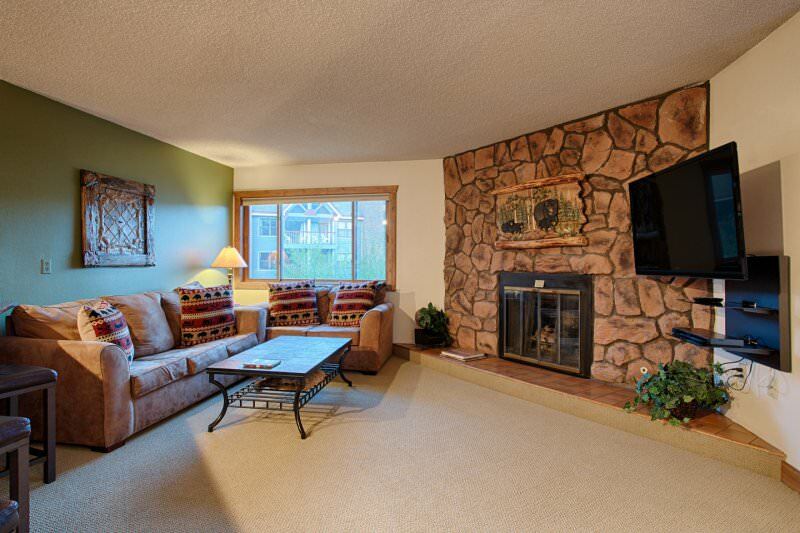 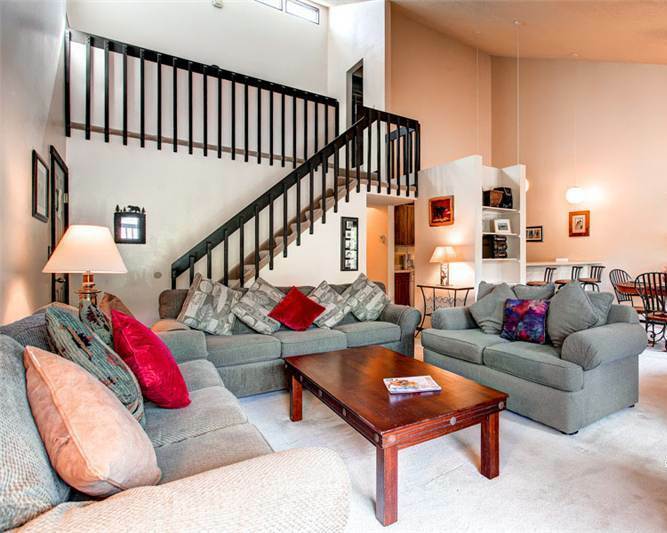 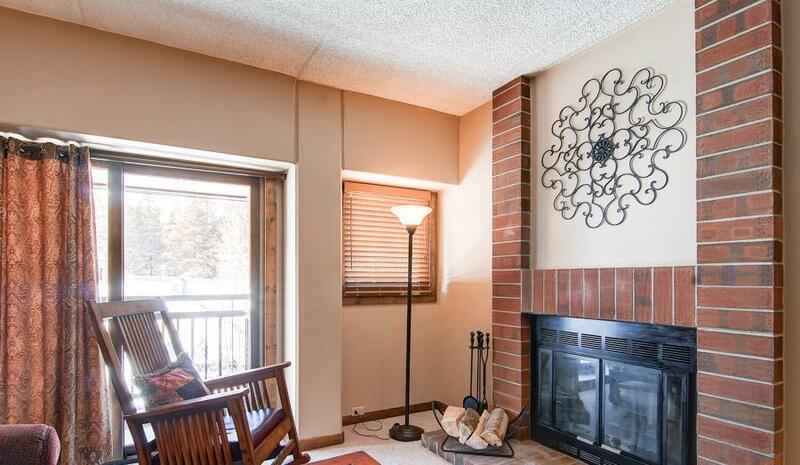 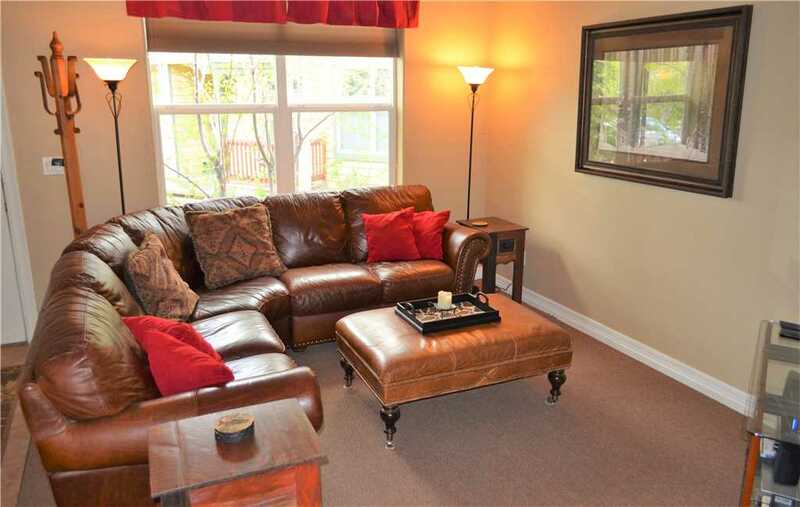 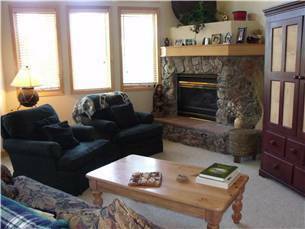 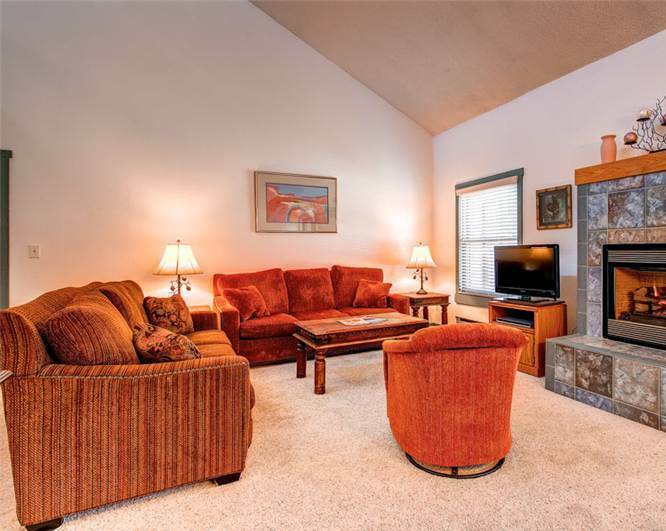 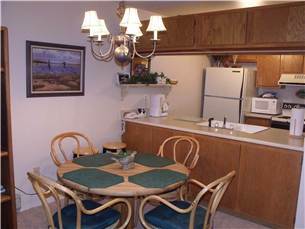 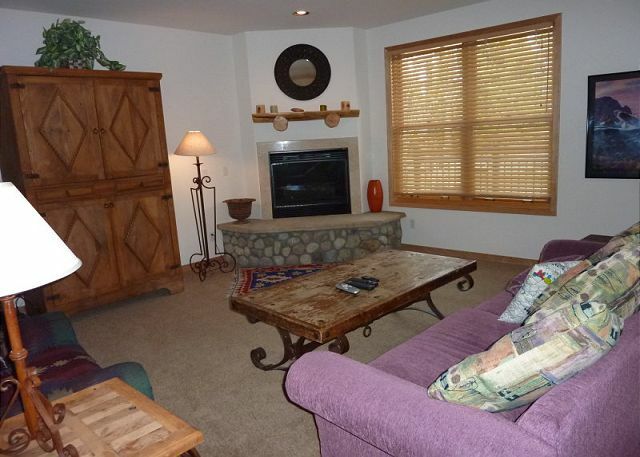 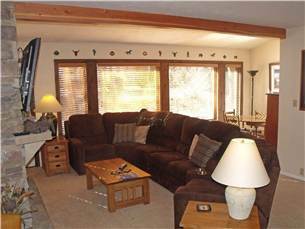 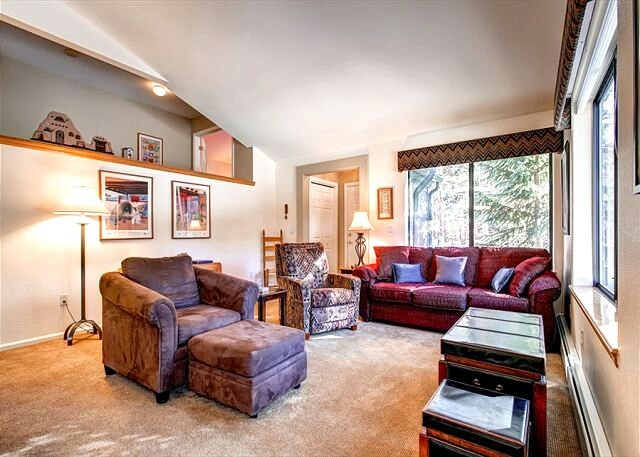 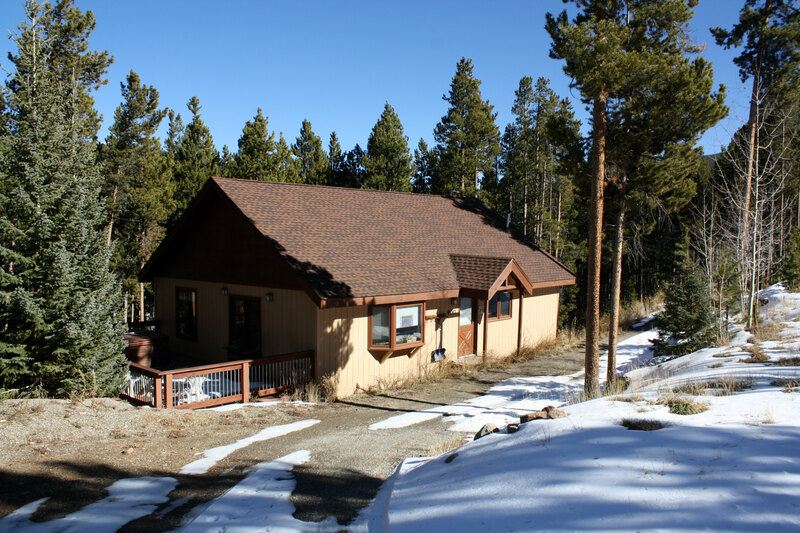 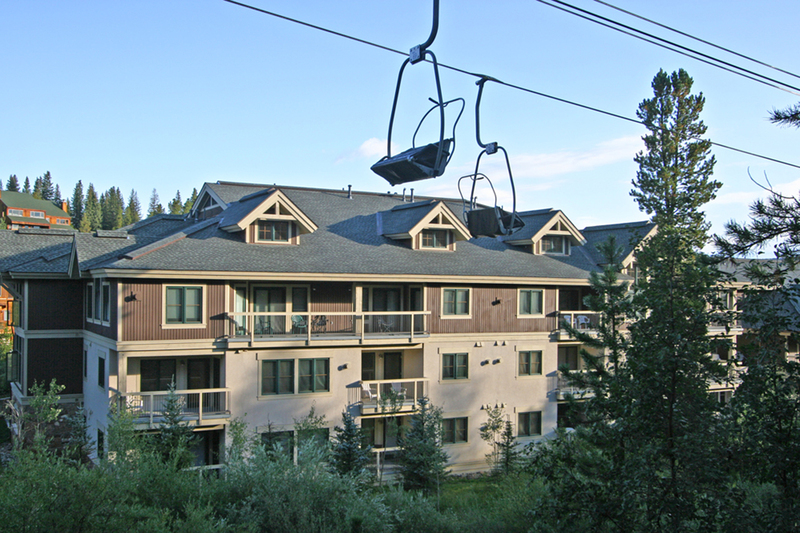 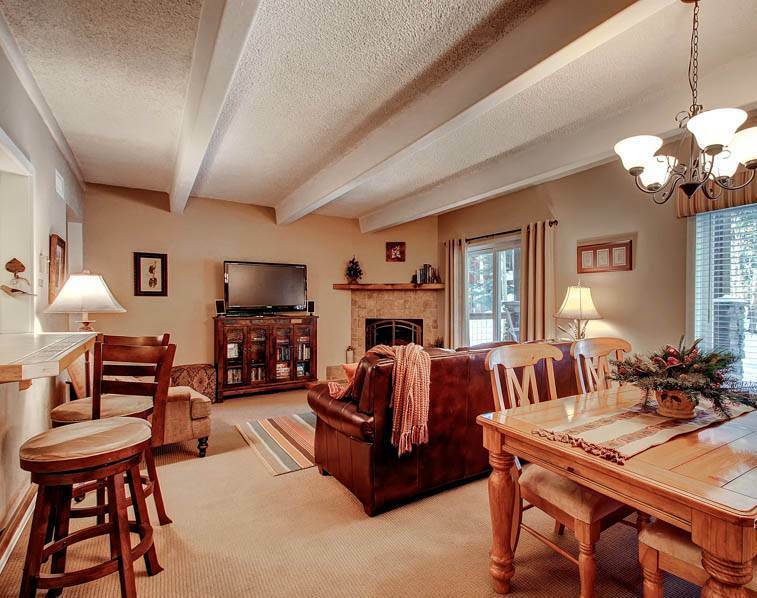 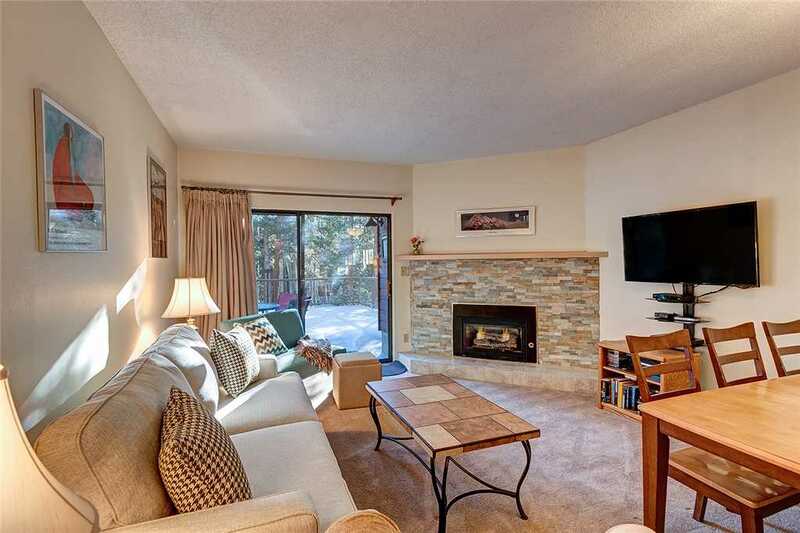 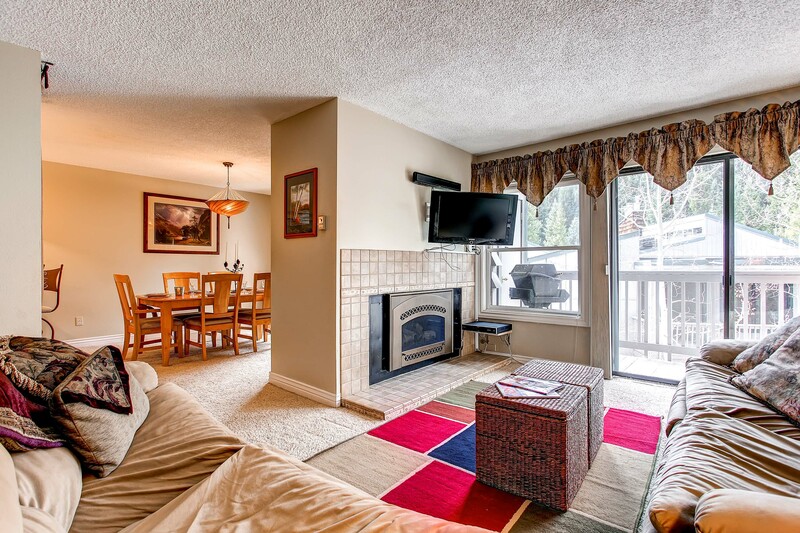 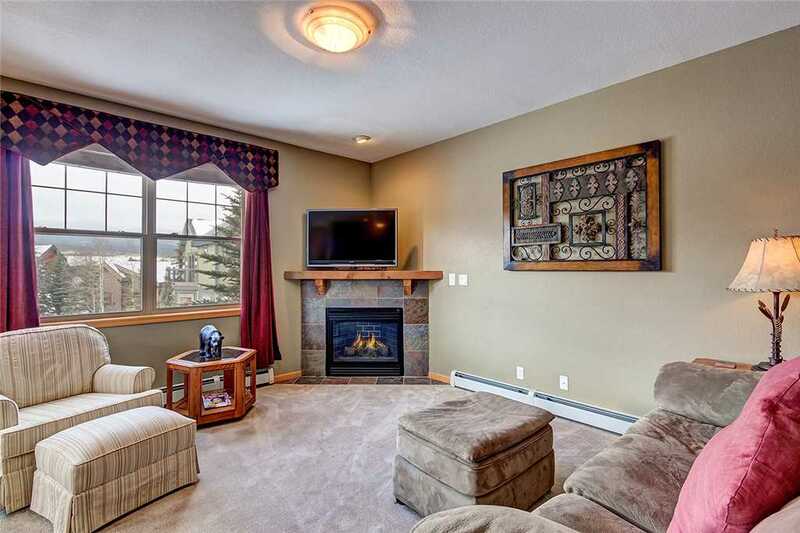 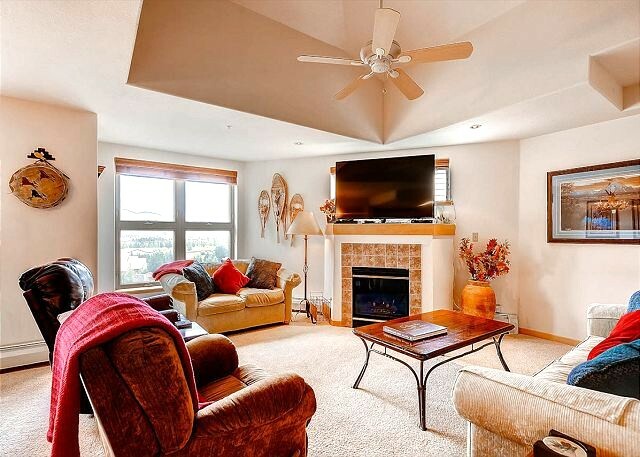 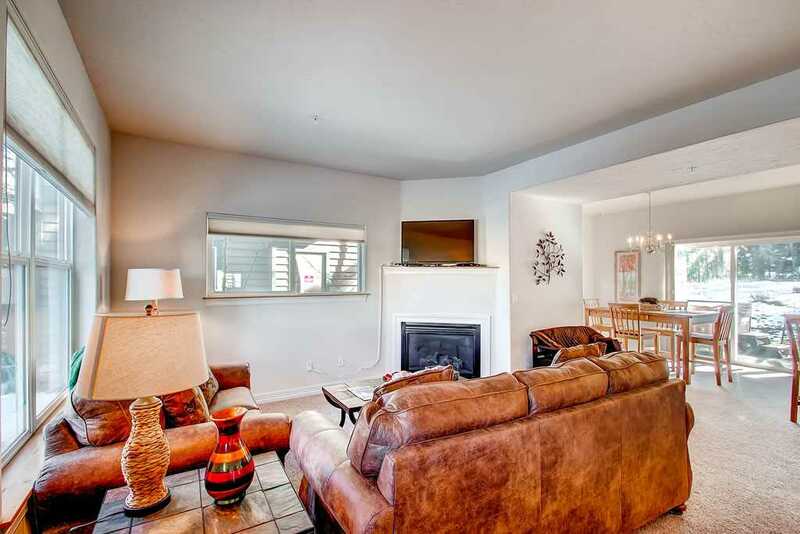 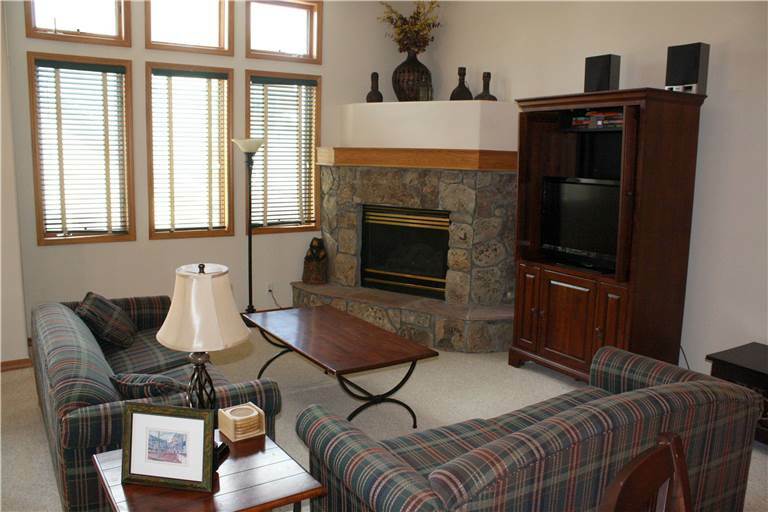 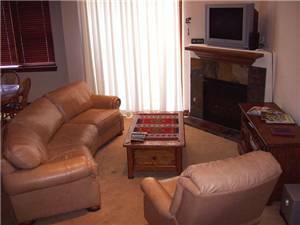 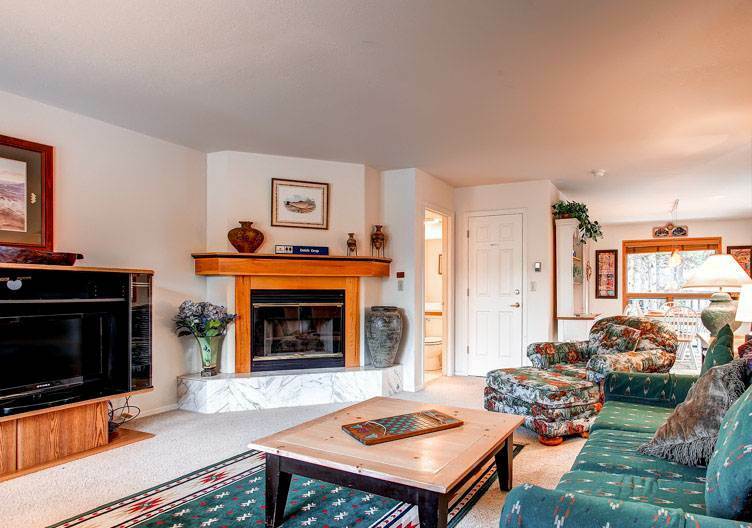 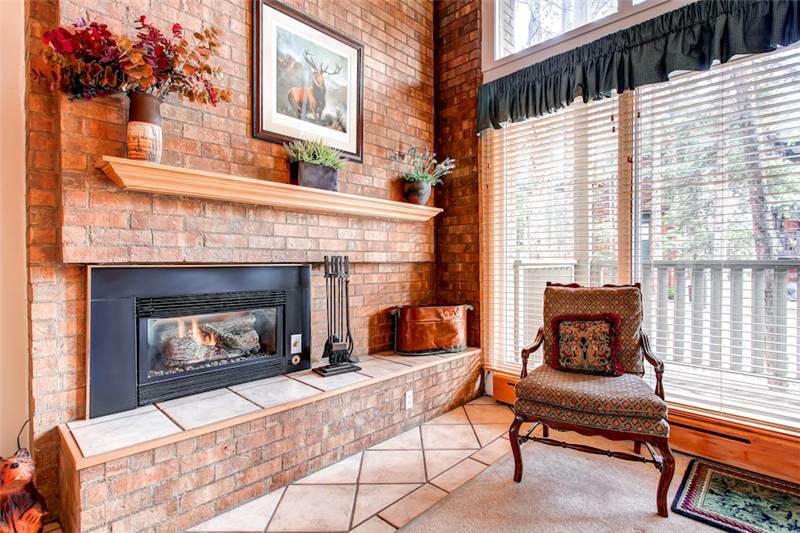 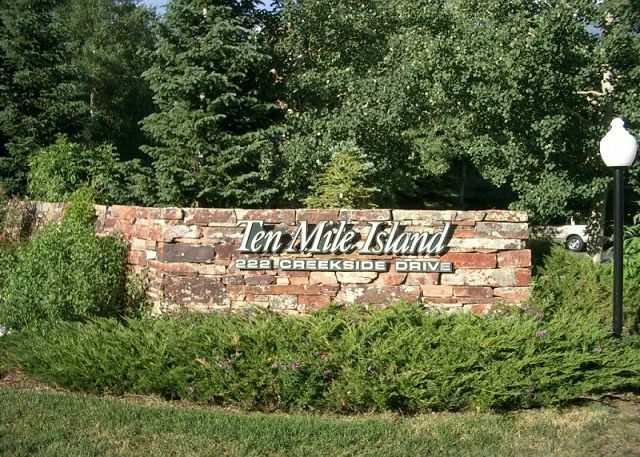 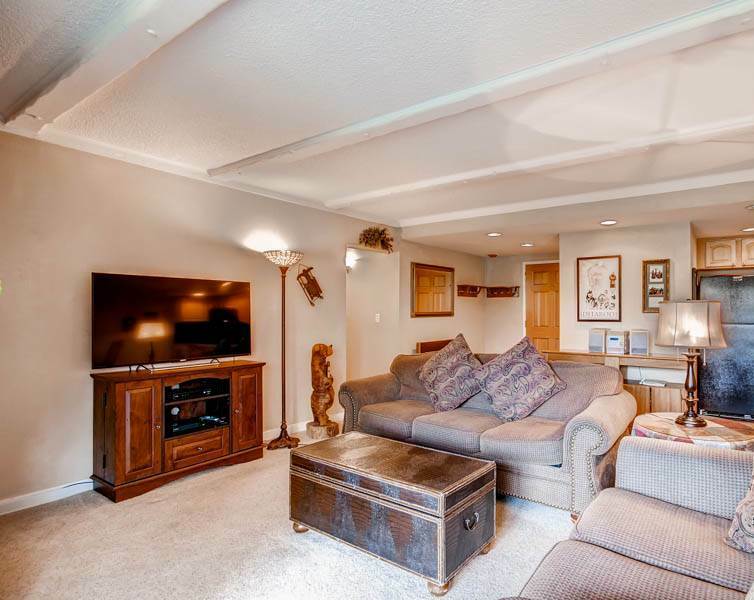 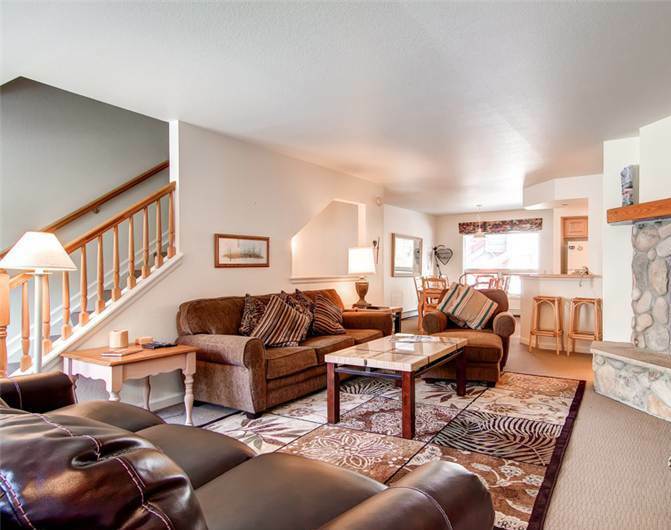 This townhome is located in a quiet subdivision at the South end of Breckenridge. 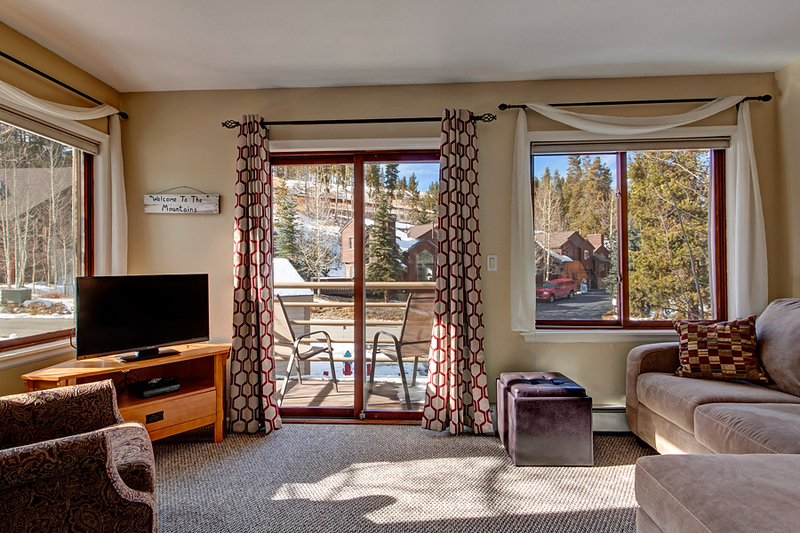 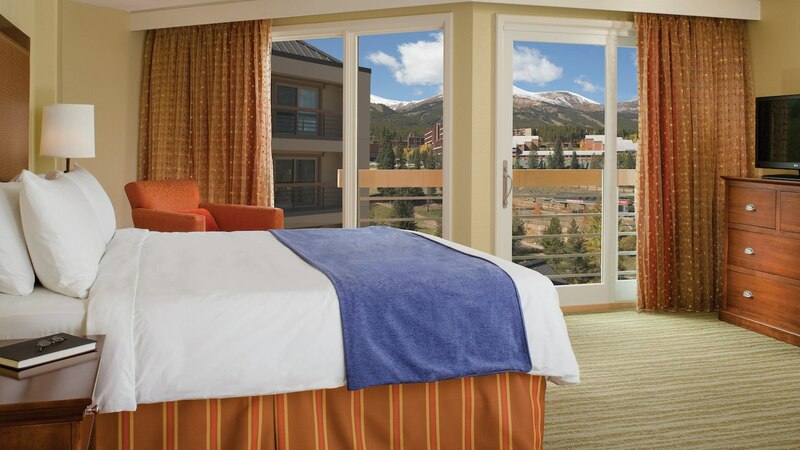 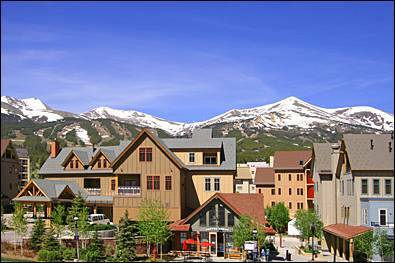 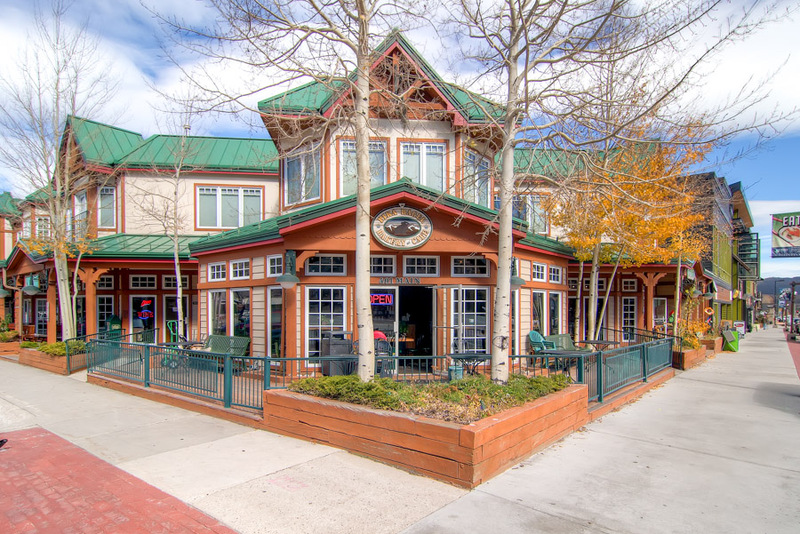 We encourage guests of Ski Country Resorts to take advantage of our complimentary guest shuttle service while visiting Breckenridge!